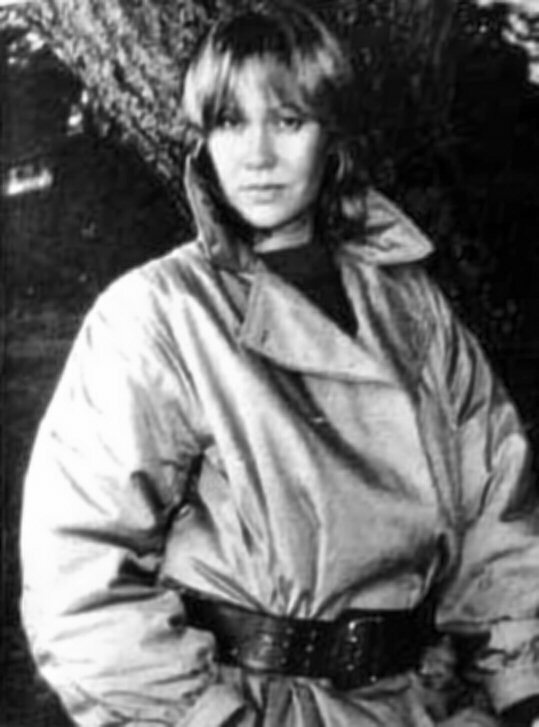 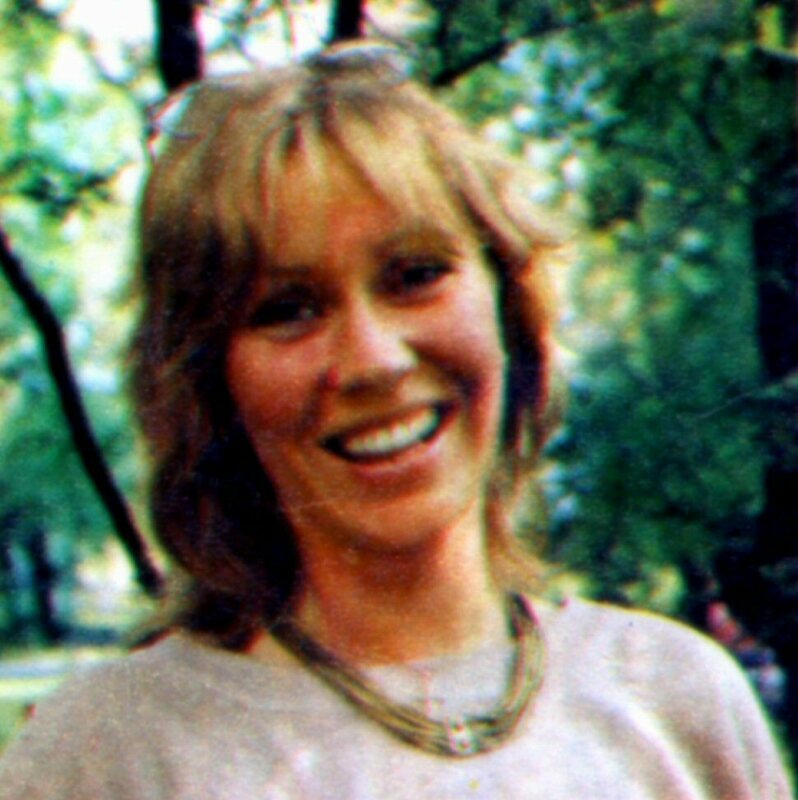 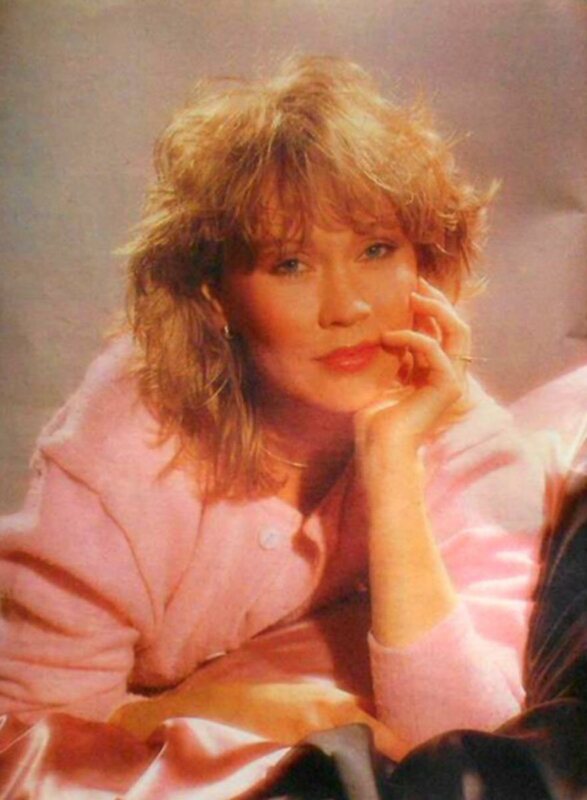 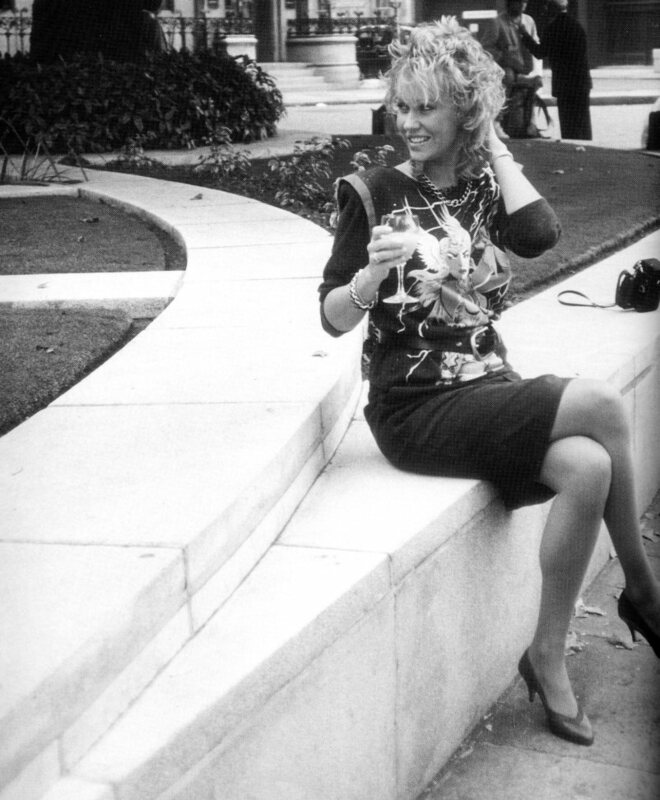 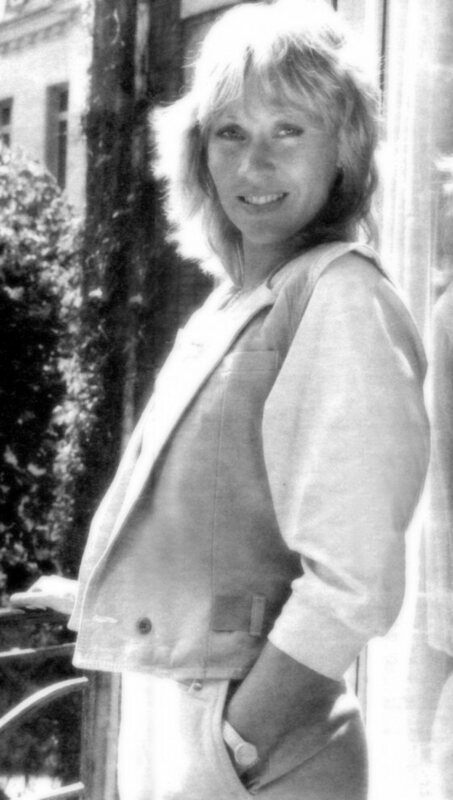 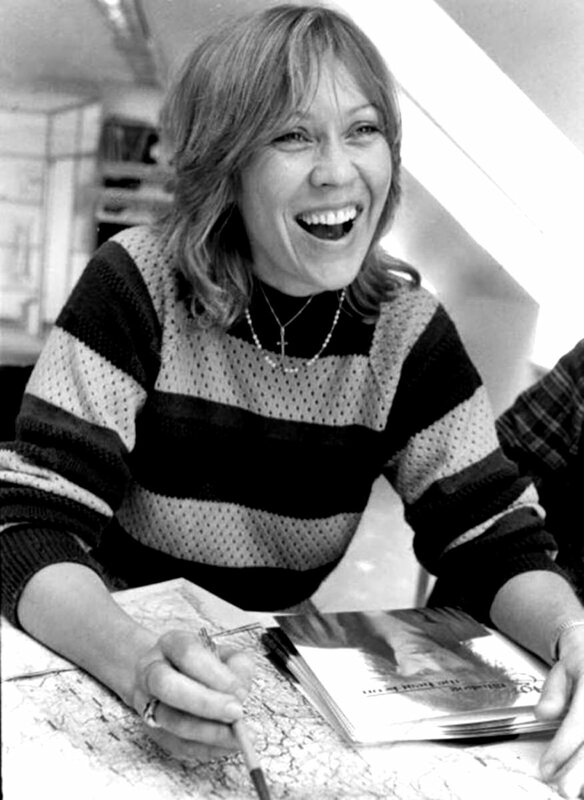 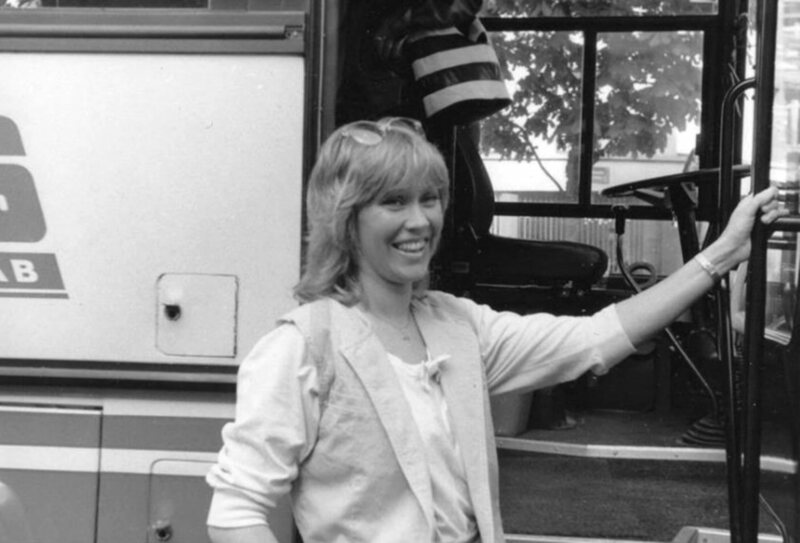 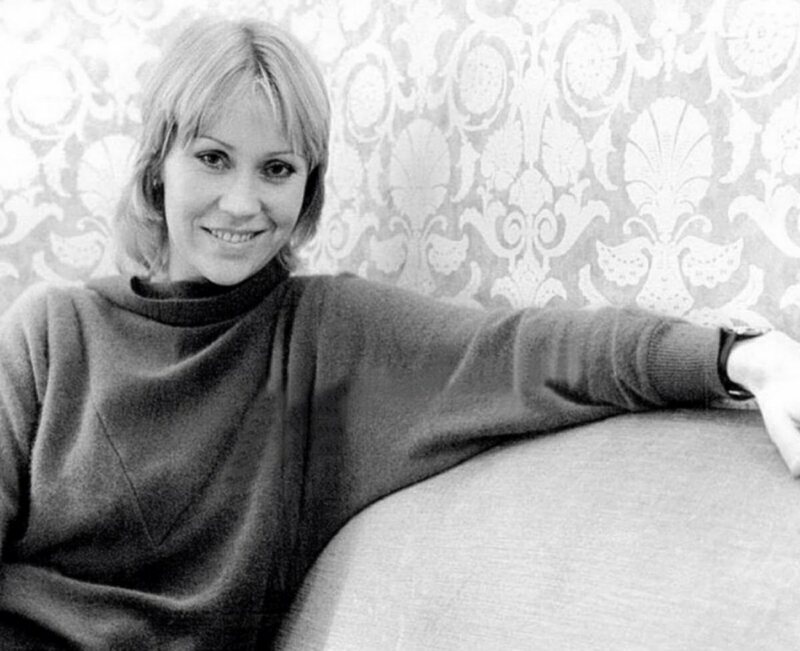 In spring 1982 Agnetha posed for pictures taken by Swedish youth weekly "Veckojournal". 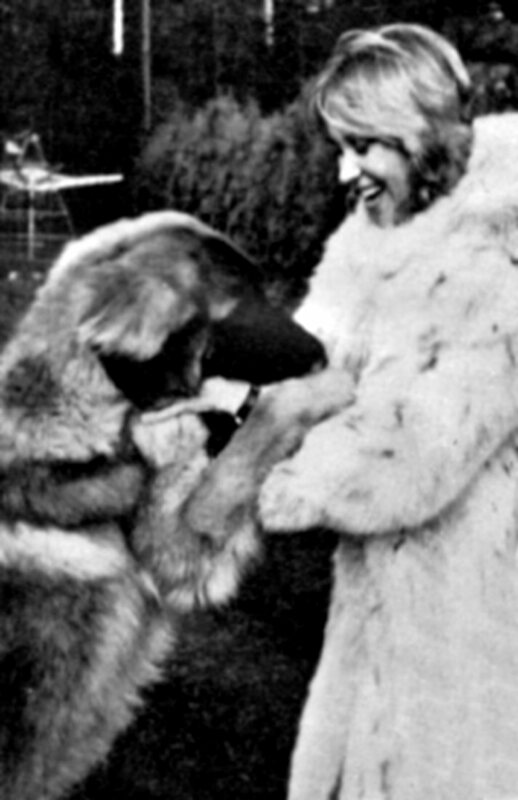 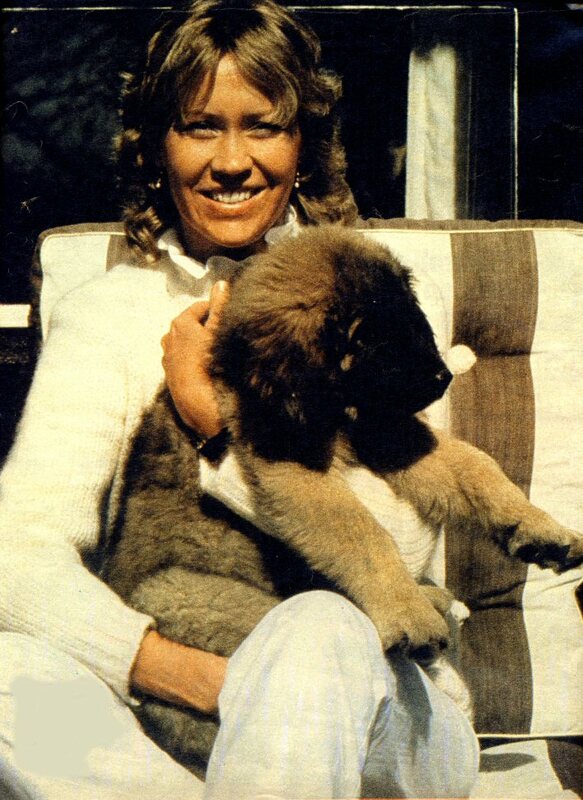 She presented her new dog which three years later would appear in the TV special "A for Agnetha" - the show promoting her second English language album "Eyes of a Woman". 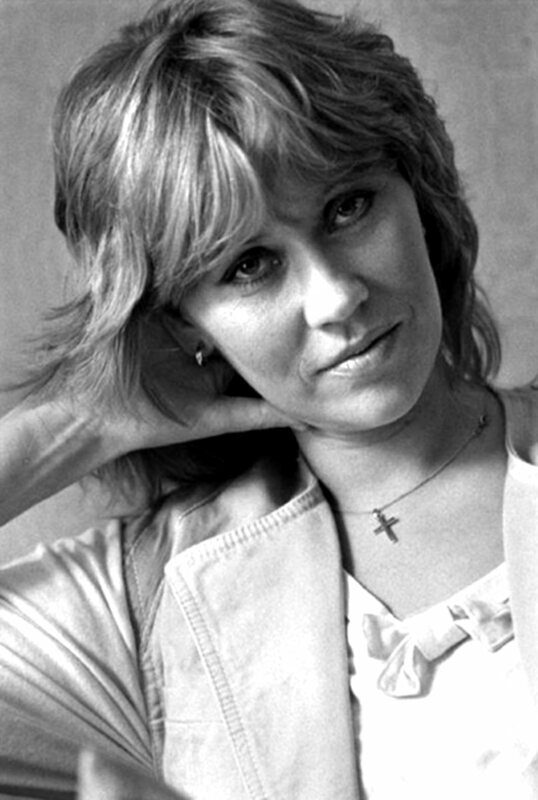 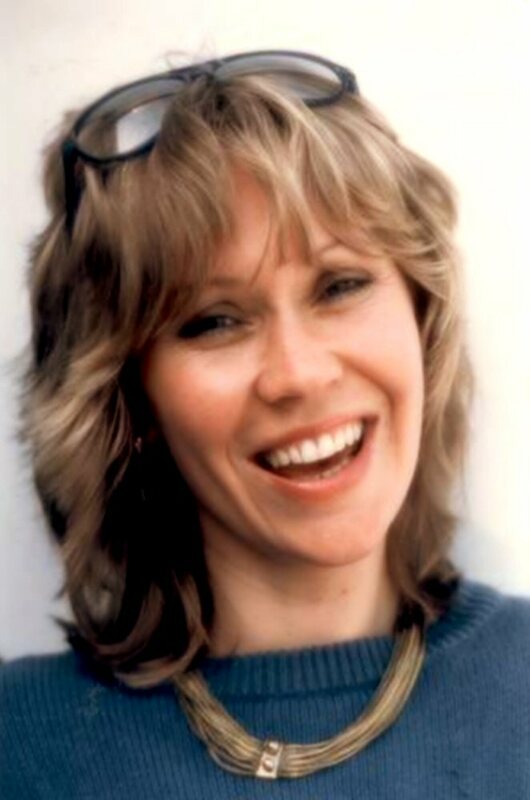 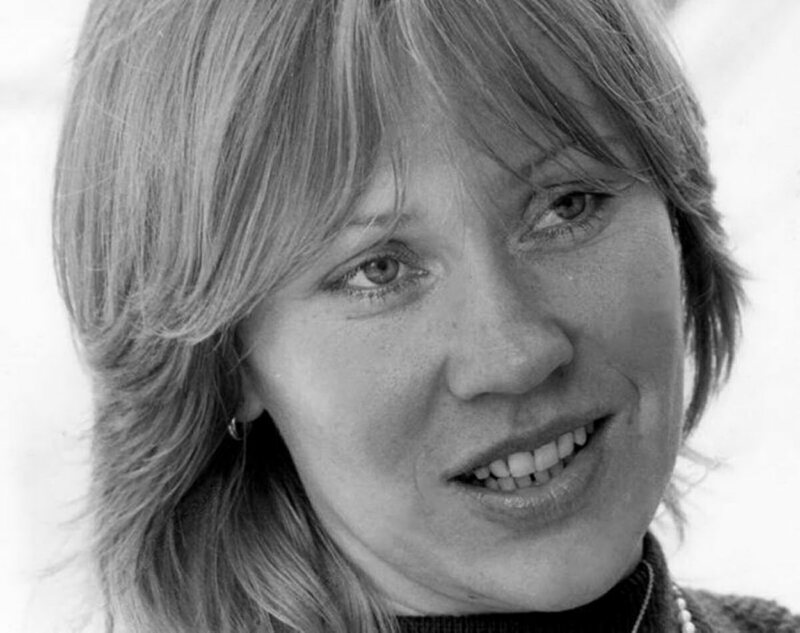 In the summer of 1982 Agnetha took the first step towards work outside the group. 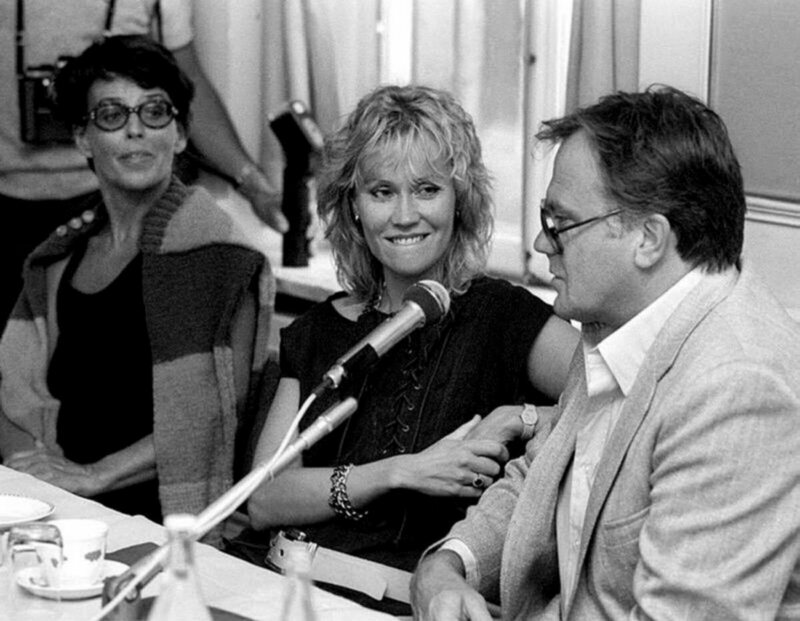 She accepted her first film role in a Swedish movie "Raskenstam" directed by Gunnar Hellström. 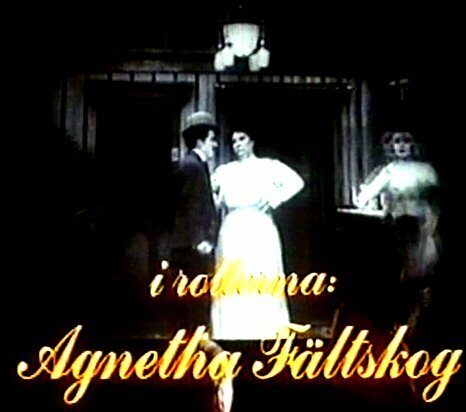 The film was about a Swedish Casanova who lived in Stockholm in the 1940s and was engaged with a lot of women at the same time. 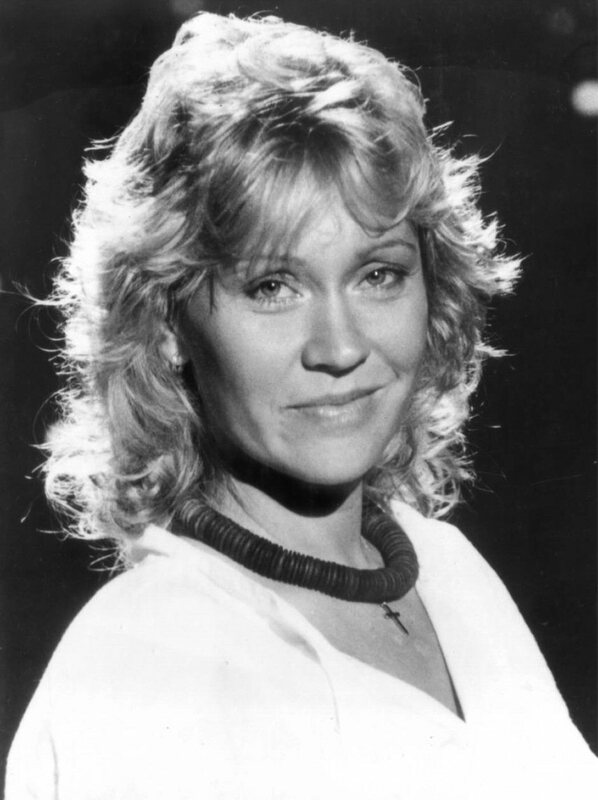 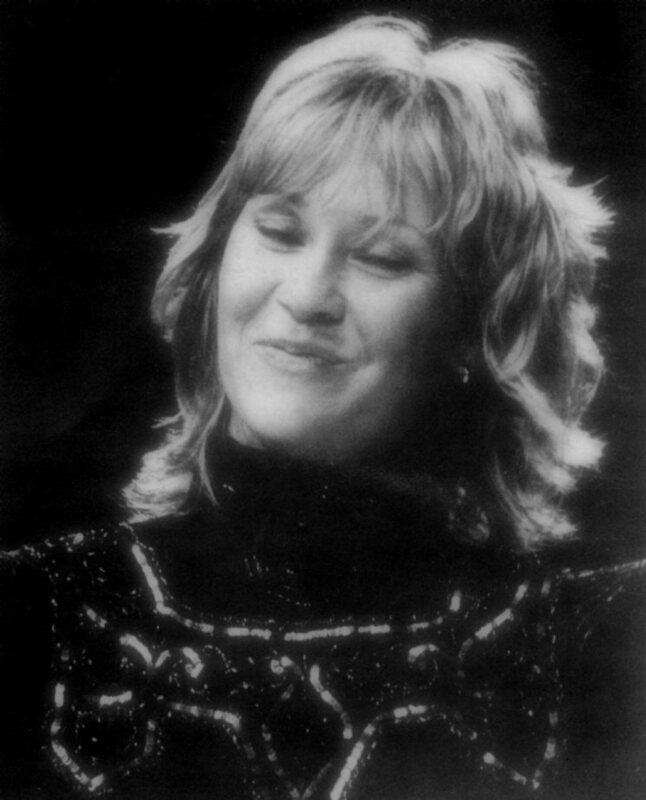 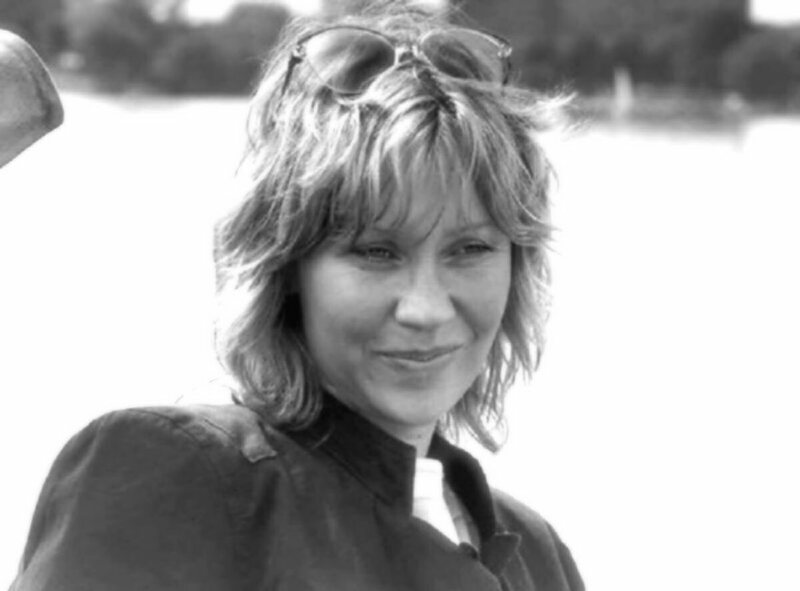 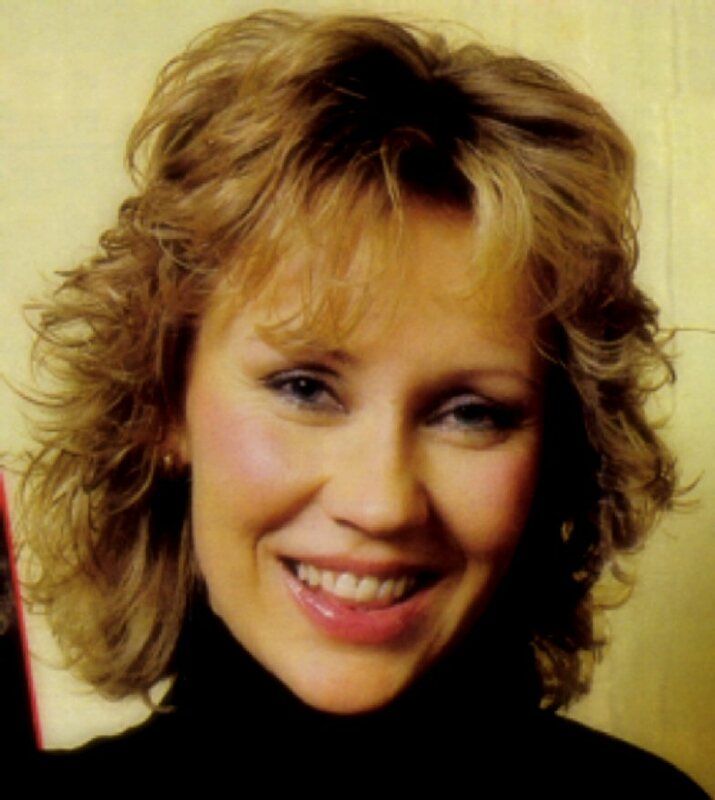 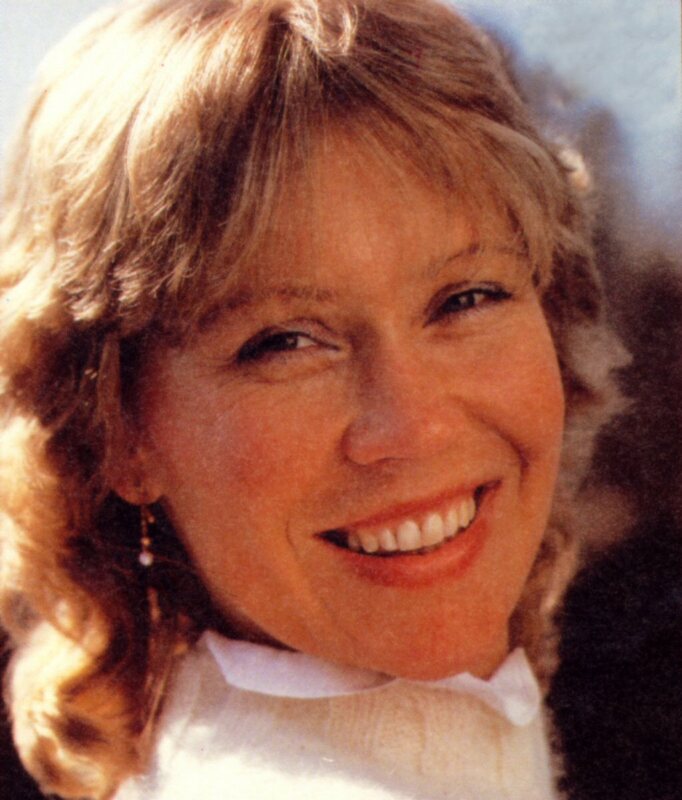 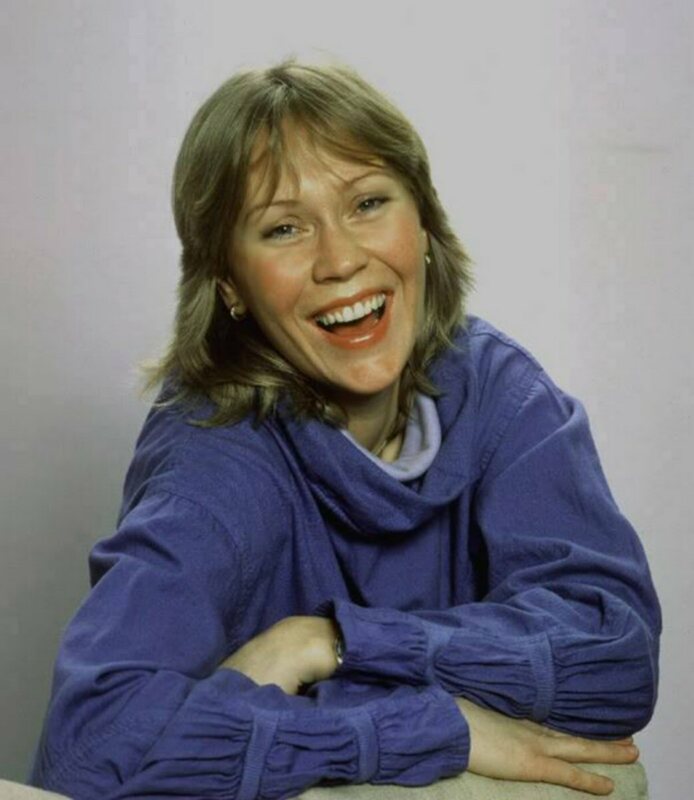 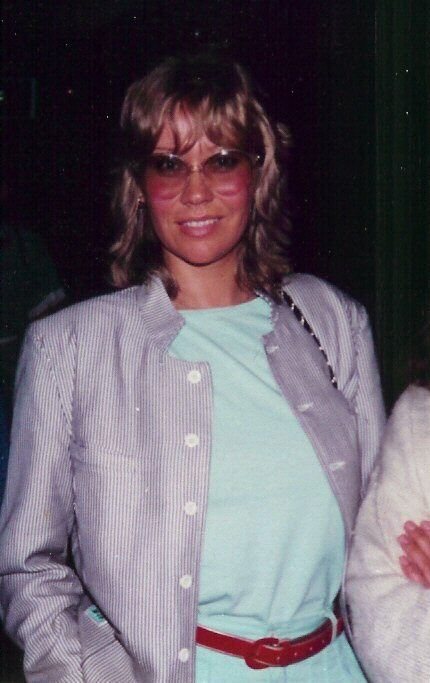 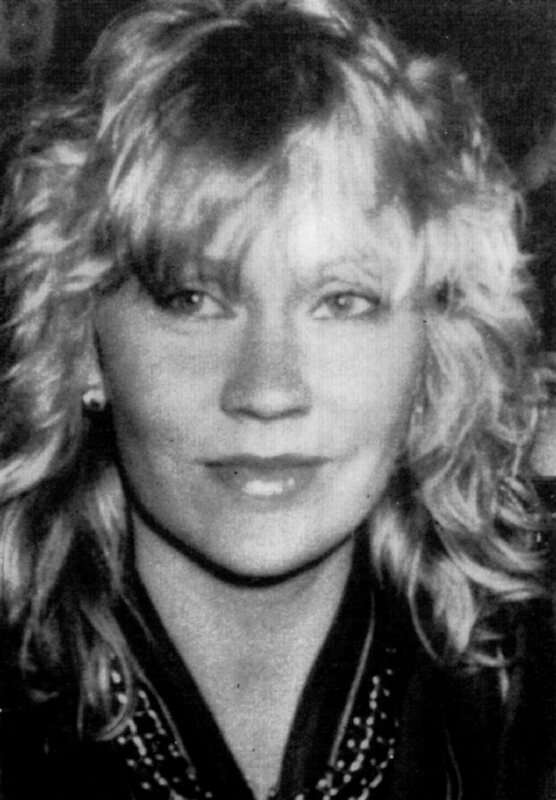 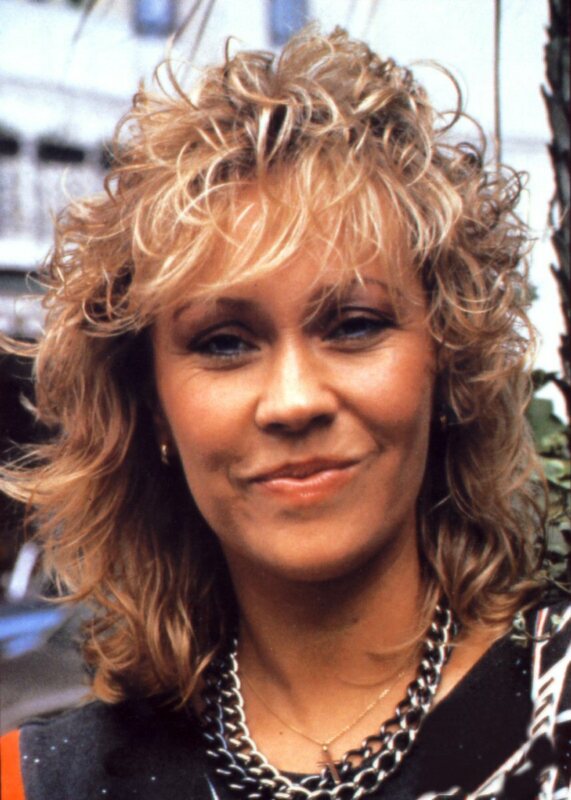 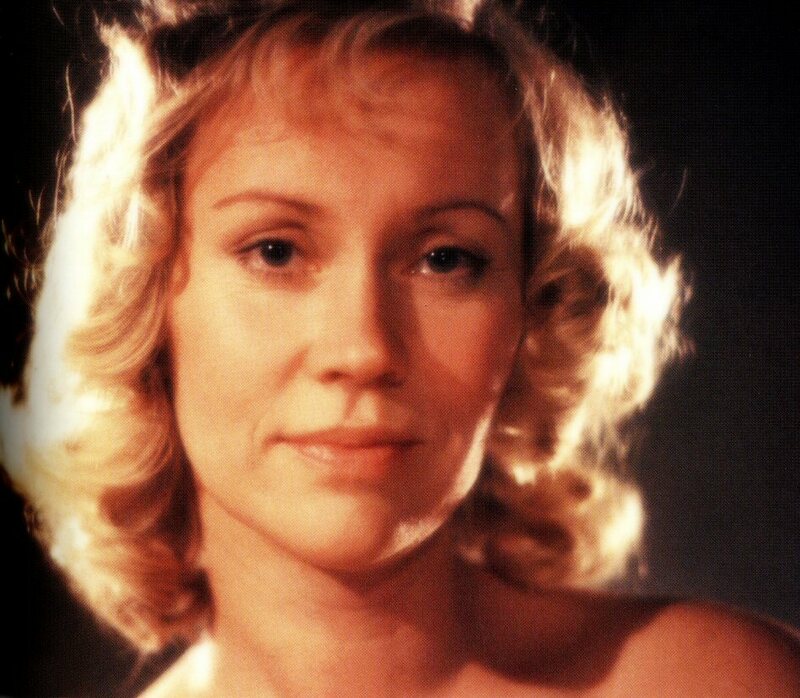 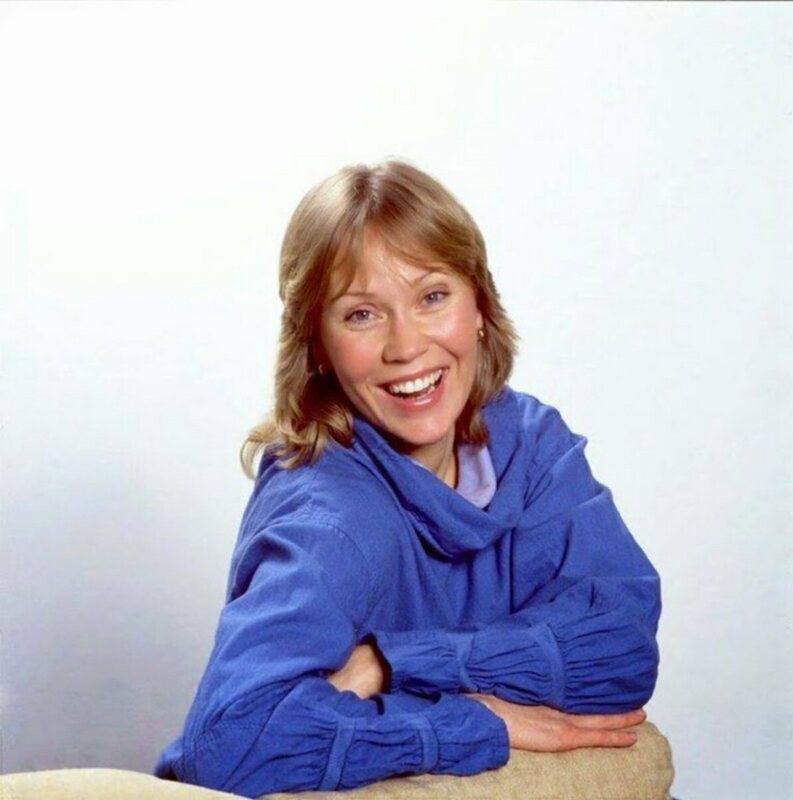 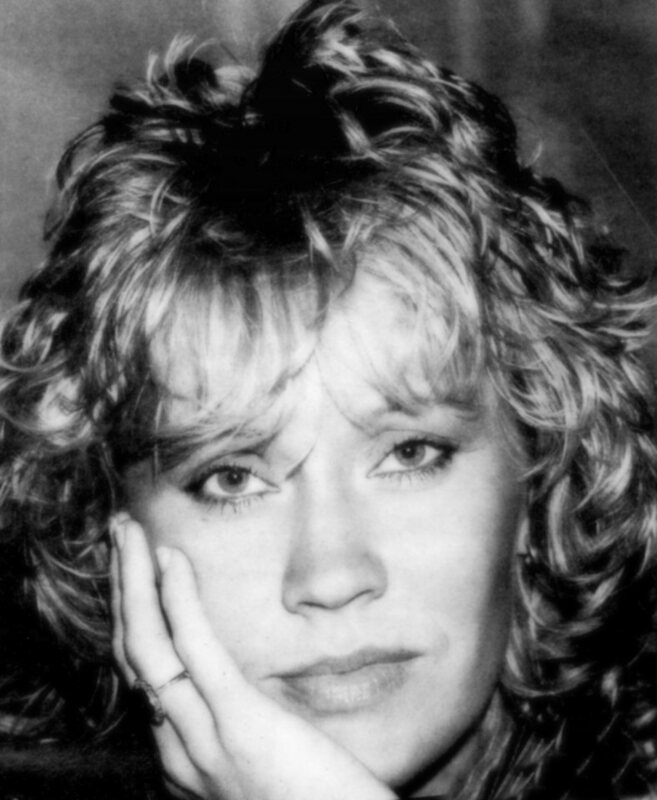 Agnetha played Lisa who was Raskenstam's only real love. 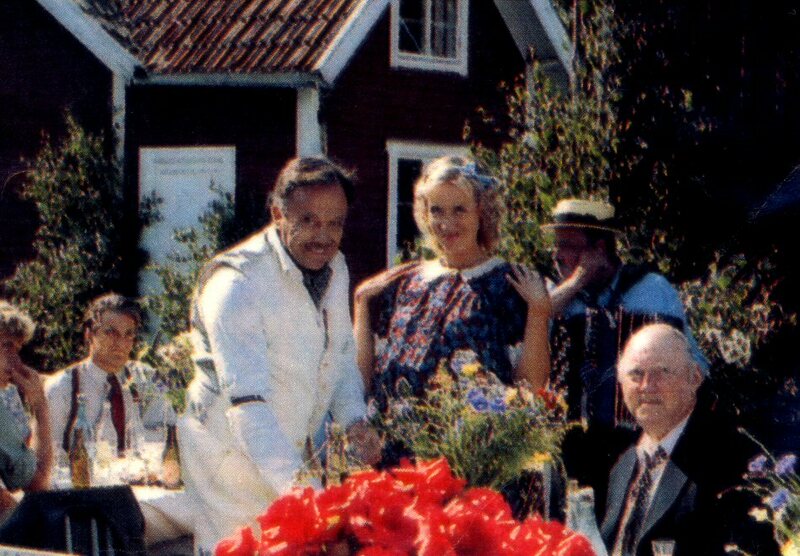 The country site scenes featuring the first meeting between Lisa and Gustav and the wedding were filmed on the island Östra Lagnö in the Stockholm archipelago. 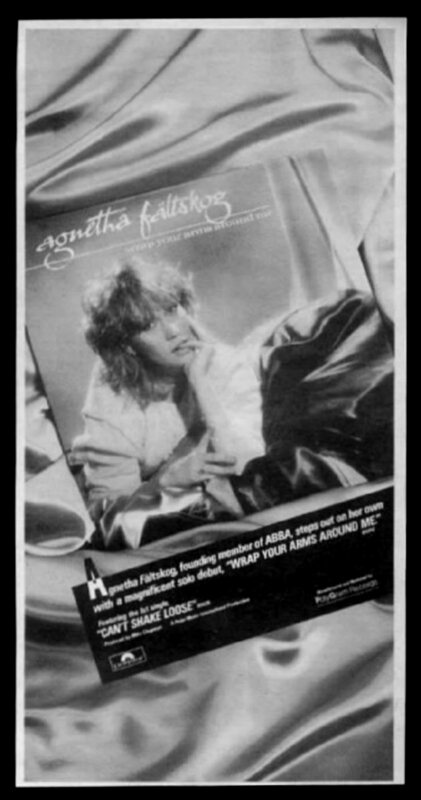 In fact the wedding was filmed on Agnetha's very first day. 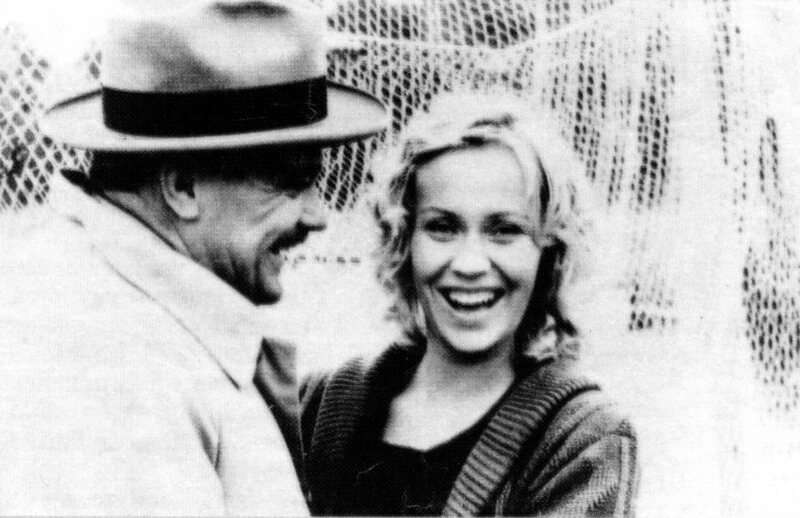 Other scenes were filmed in both Stockholm and film studios. 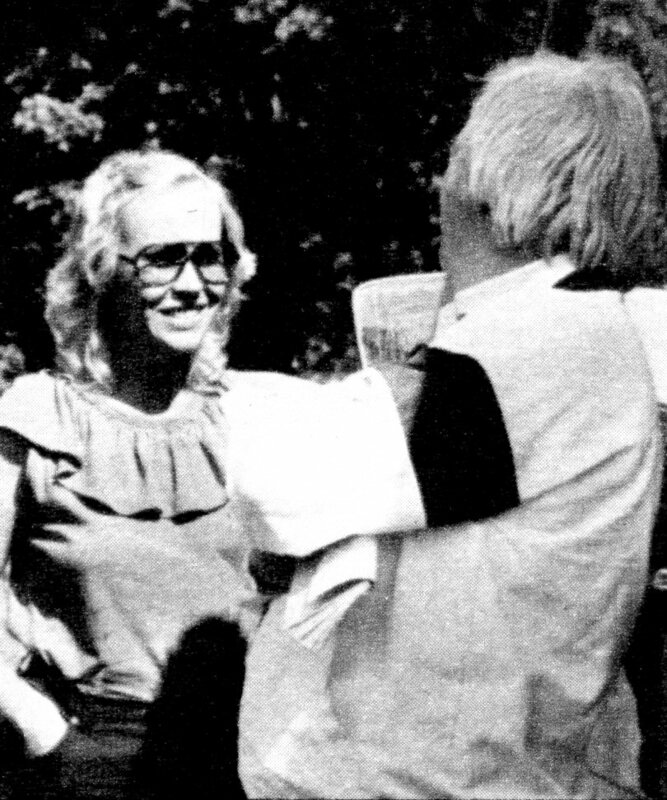 In July 1982 the Swedish weekly "Hänt" paid a visit on one of the filming spots and got both interview with Agnetha and a lot of photos which were published in its 32nd issue on 11 August 1982. 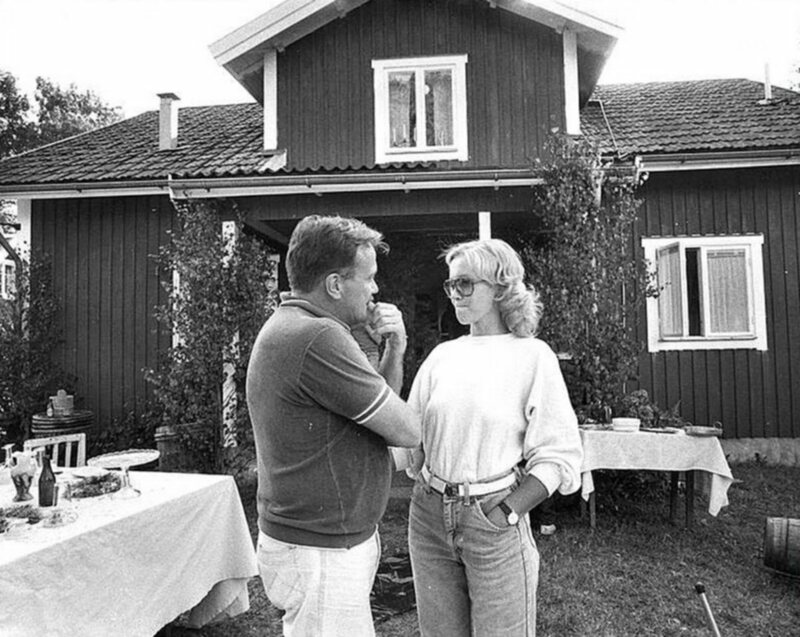 More photos from the filming of "Raskenstam"
Tomas Ledin was a good friend to the ABBA-family during all years. 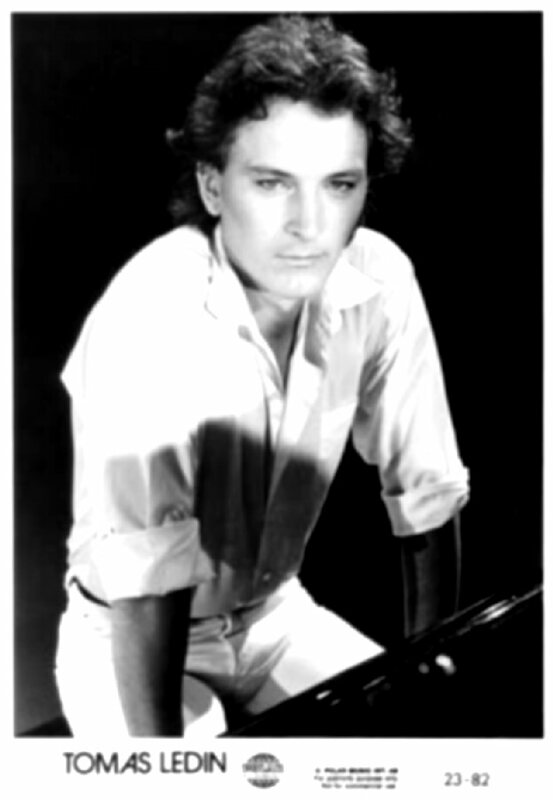 The group promoted him in many ways and tried to help him with an international breakthrough. 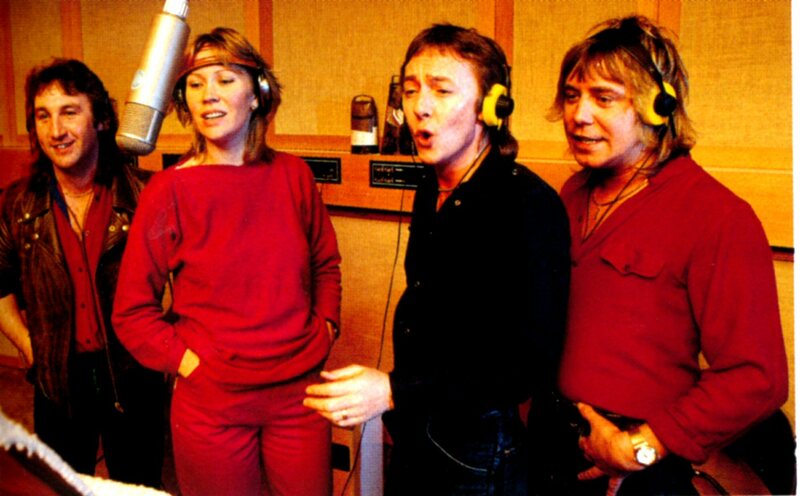 Tomas was background singer on ABBA's world tour in 1979 and he performed his own song "Not Bad At All" on ABBA concerts. 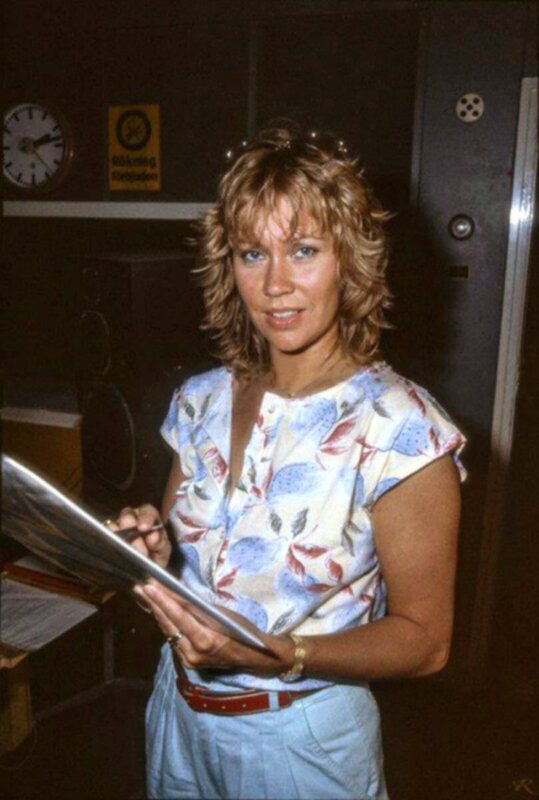 ABBA fans all over the world own probably most of his albums as he is ABBA-related having Agnetha and Frida as background singers on many of his songs but more promotion was needed to reach the world. 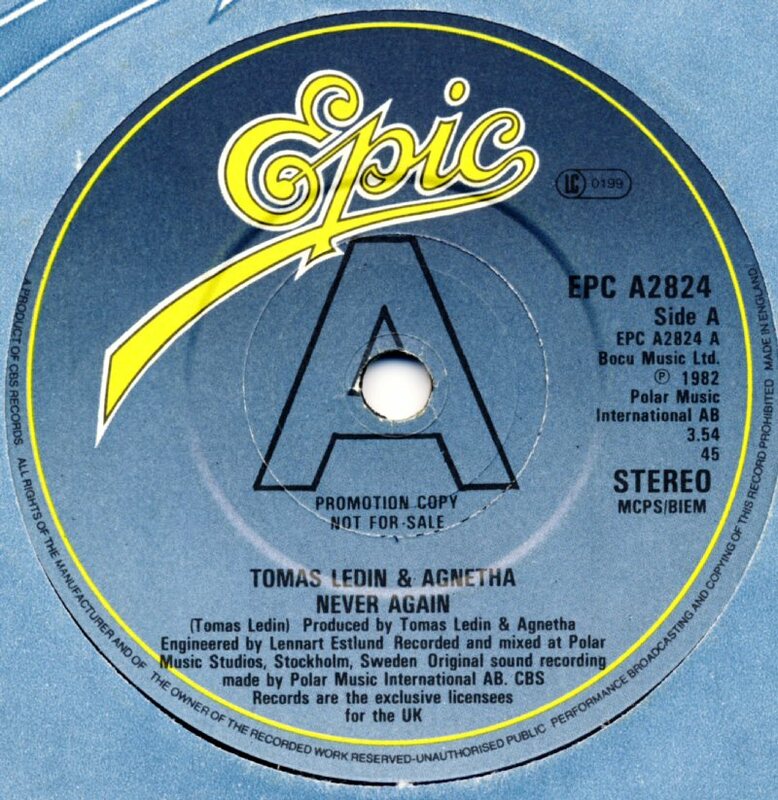 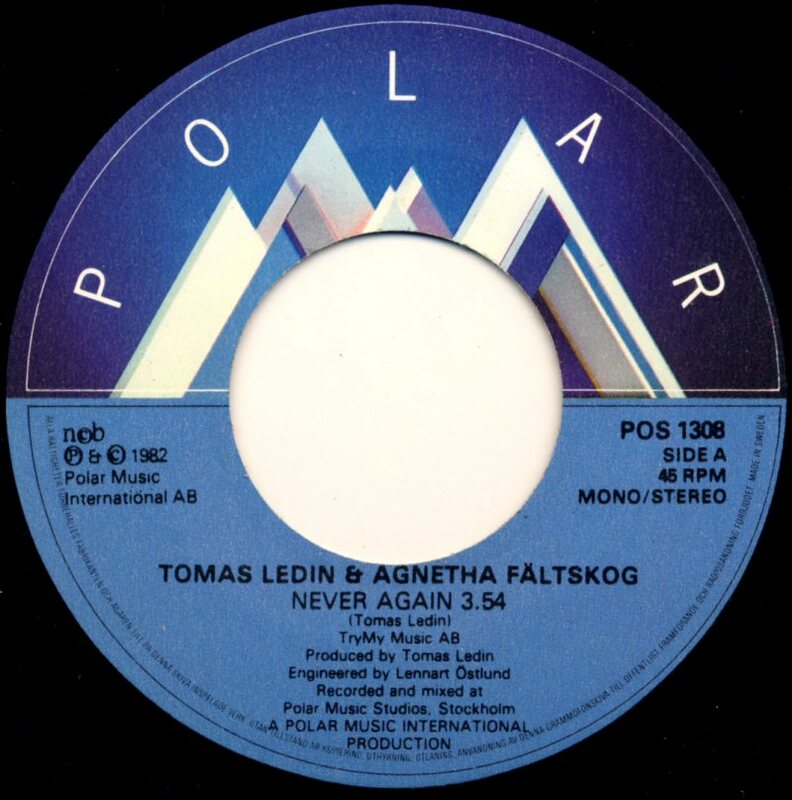 The single "Never Again" performed together by Agnetha and Tomas was promoted internationally. 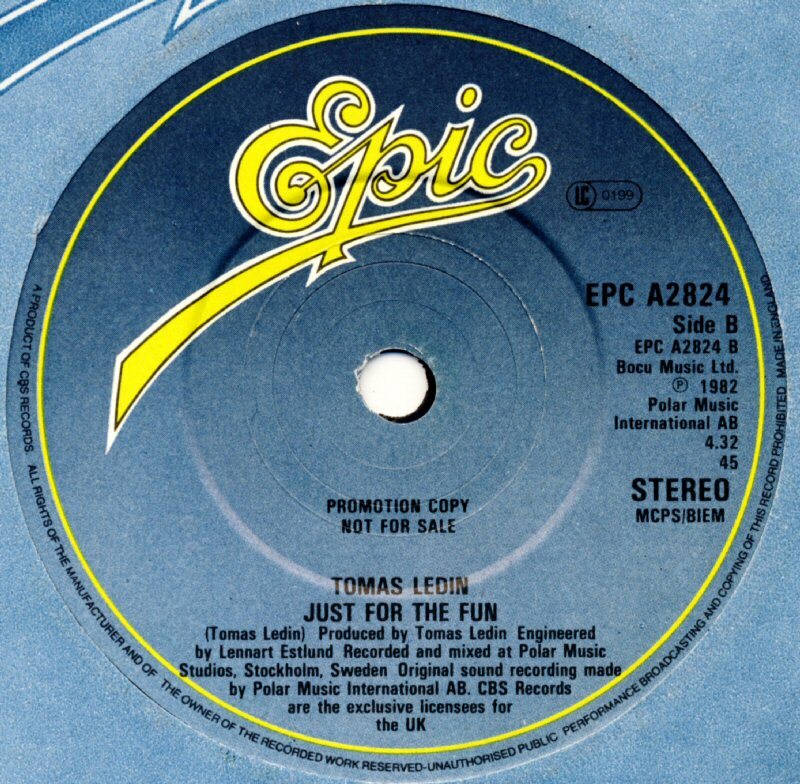 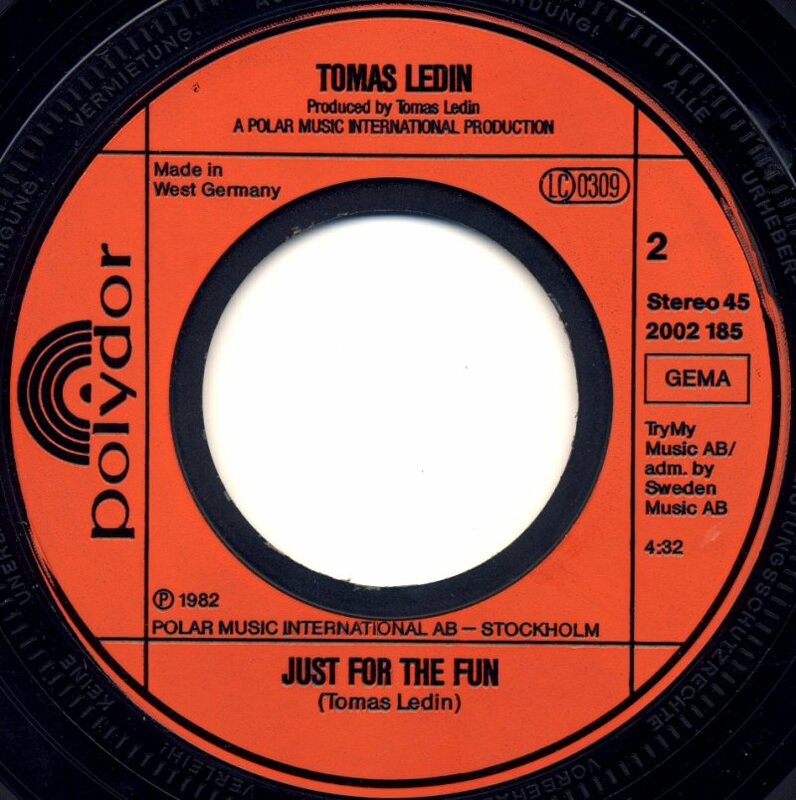 The B-side of the single contained "Just for the Fun" performed by Tomas Ledin. 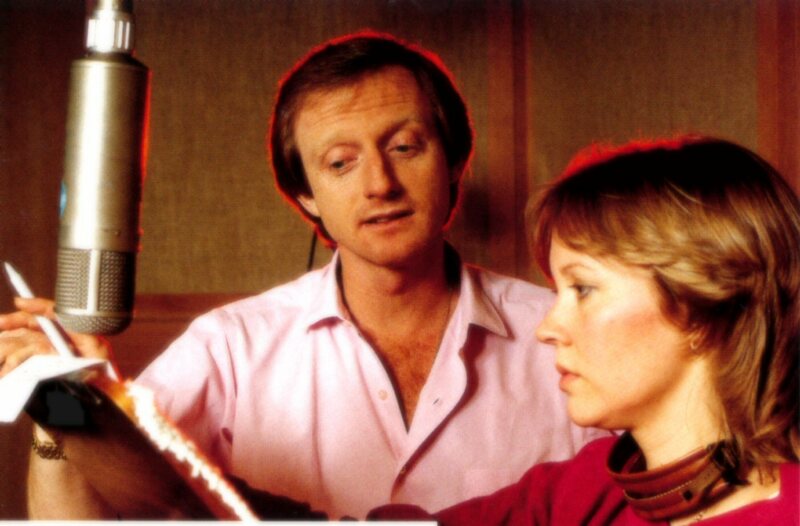 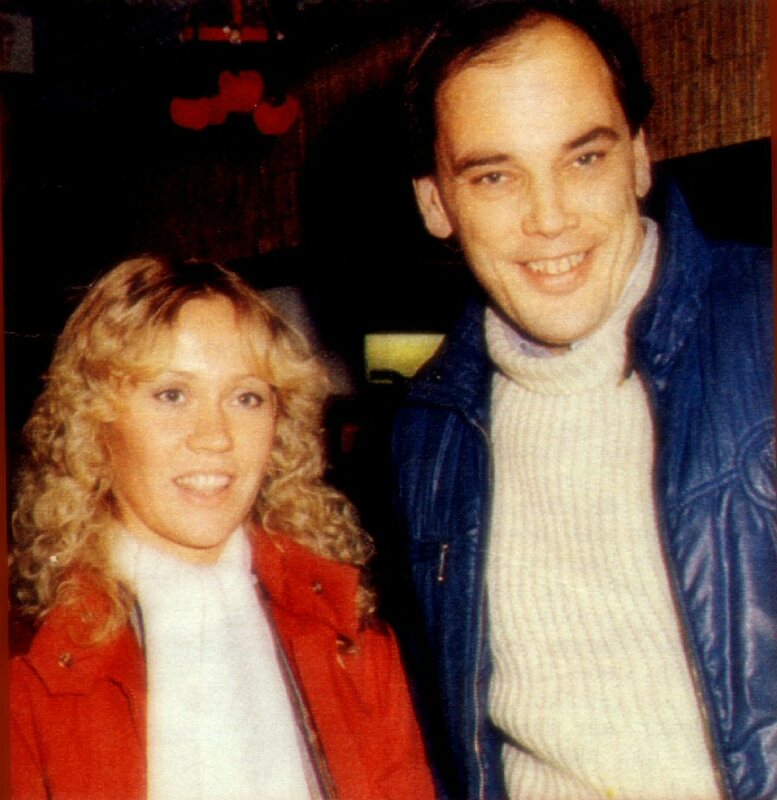 Agnetha and Tomas did not meet each other in the studio. 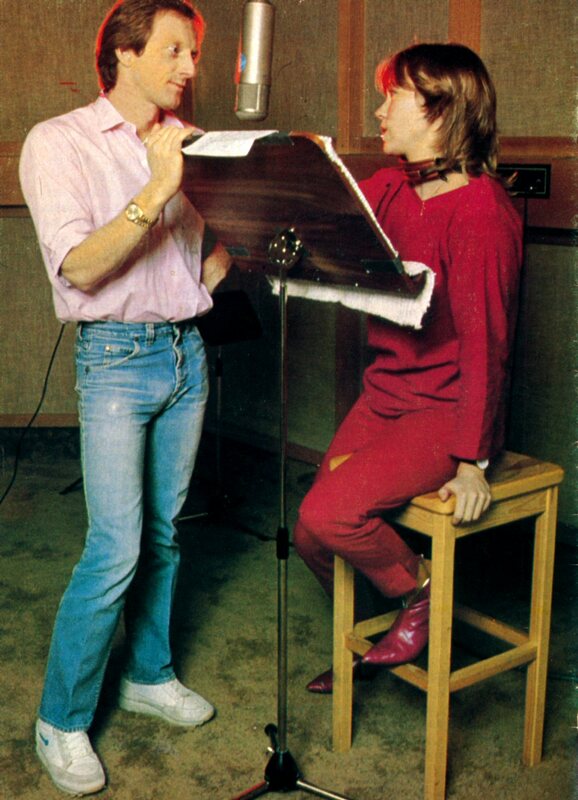 They recorded their vocals separately even if it sounds as a very near studio collaboration. 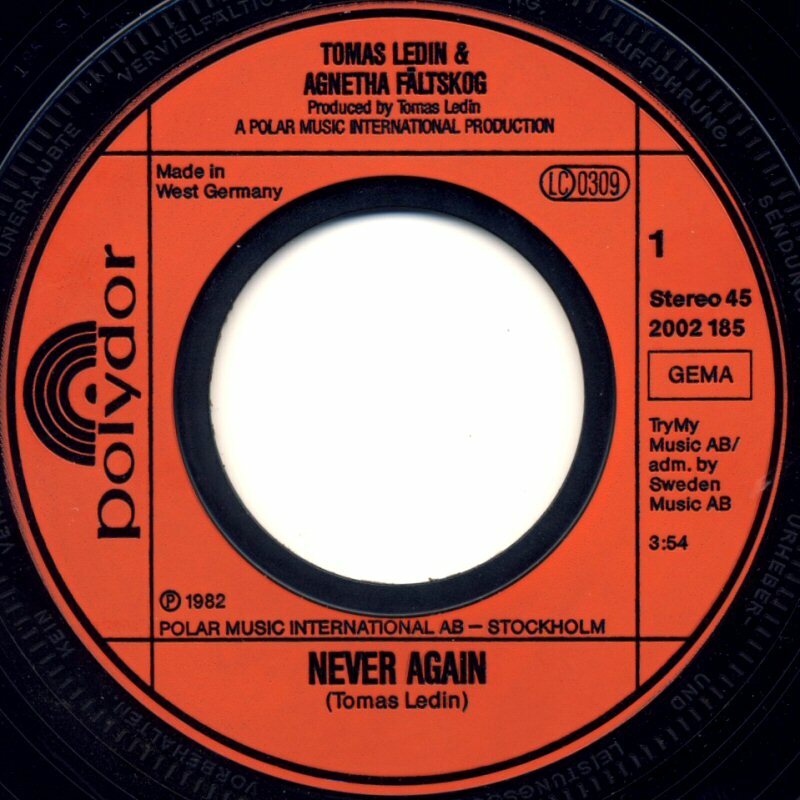 In Sweden "Never Again" entered the chart on October 26, 1982 and it stayed there for 16 weeks peaking at #2. 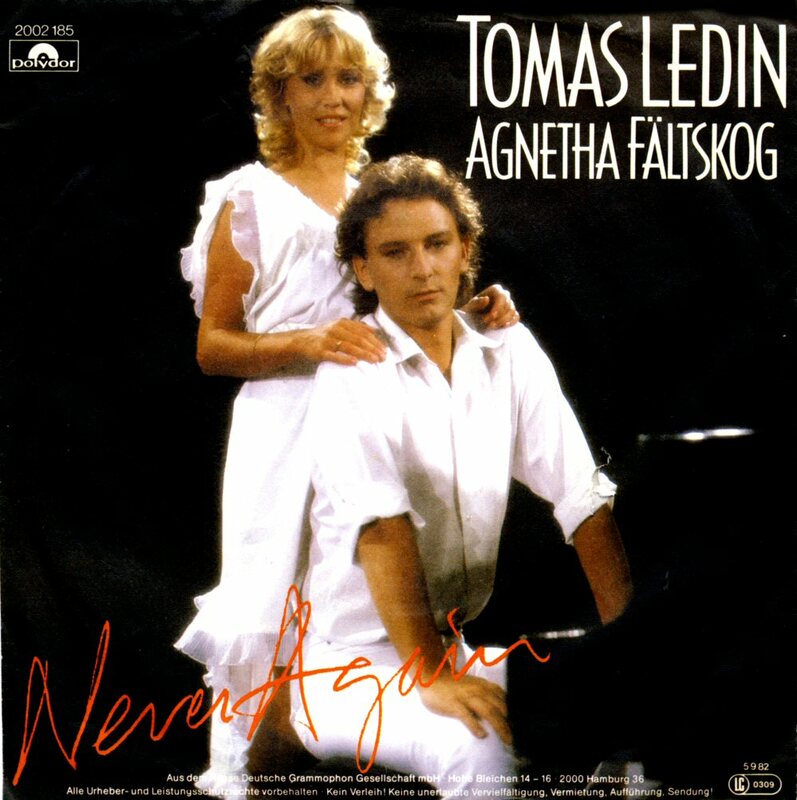 Even in Norway "Never Again" became quite successful reaching #5 but in Finland only #17. 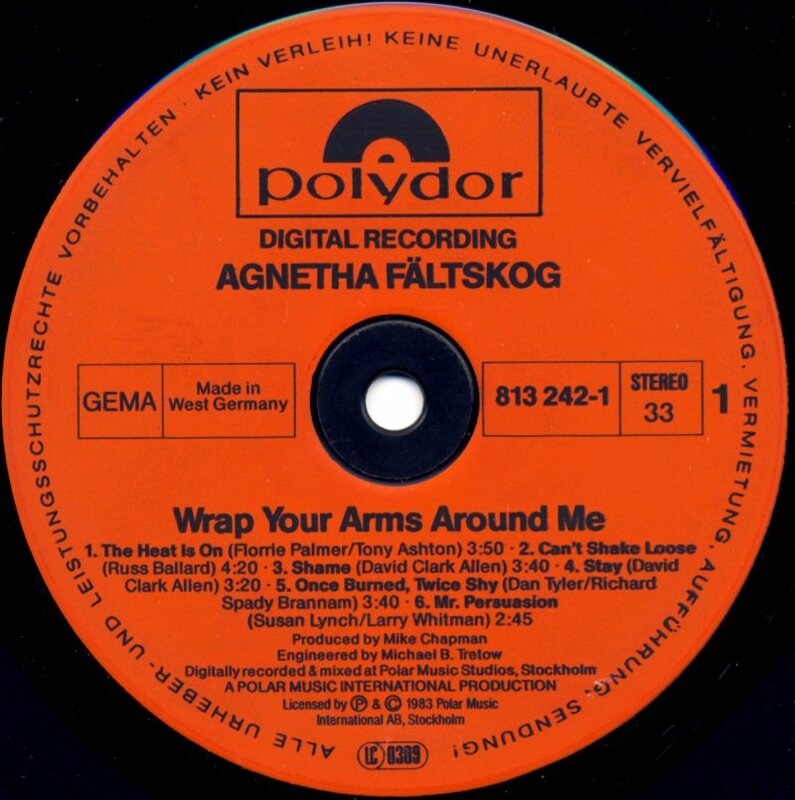 The single entered the German chart in December 1982 where it stayed for 6 weeks reaching #37. 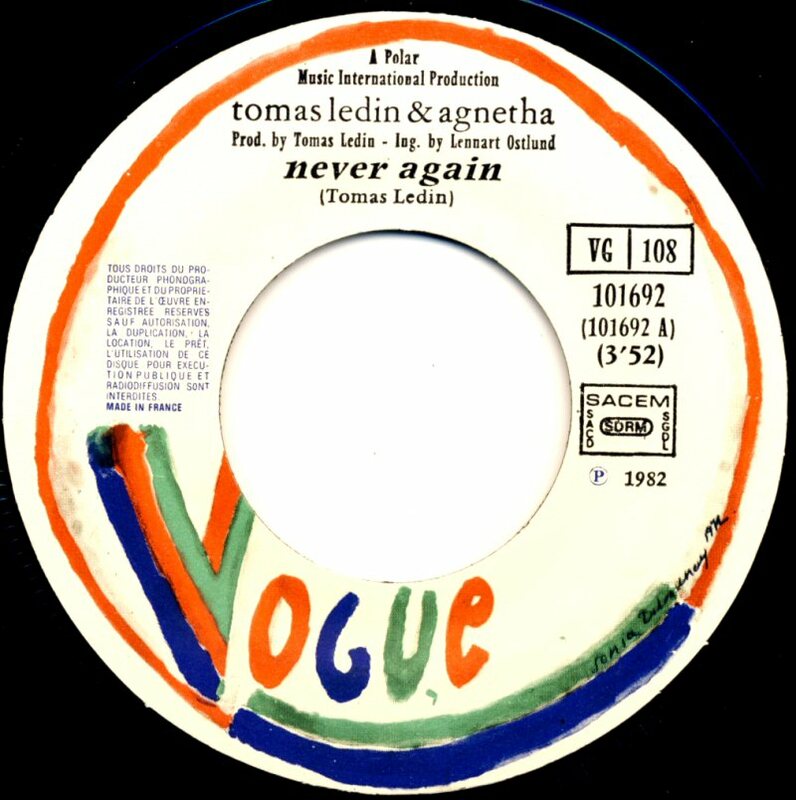 "Never Again" did not enter the UK chart. 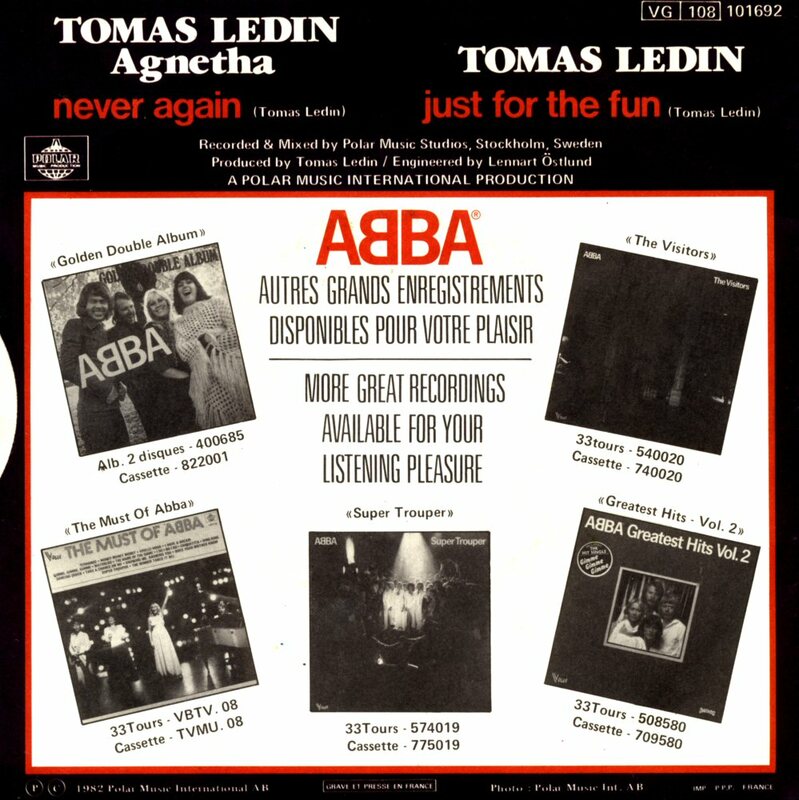 The French chart entry took place in December 82 and the single was #44. 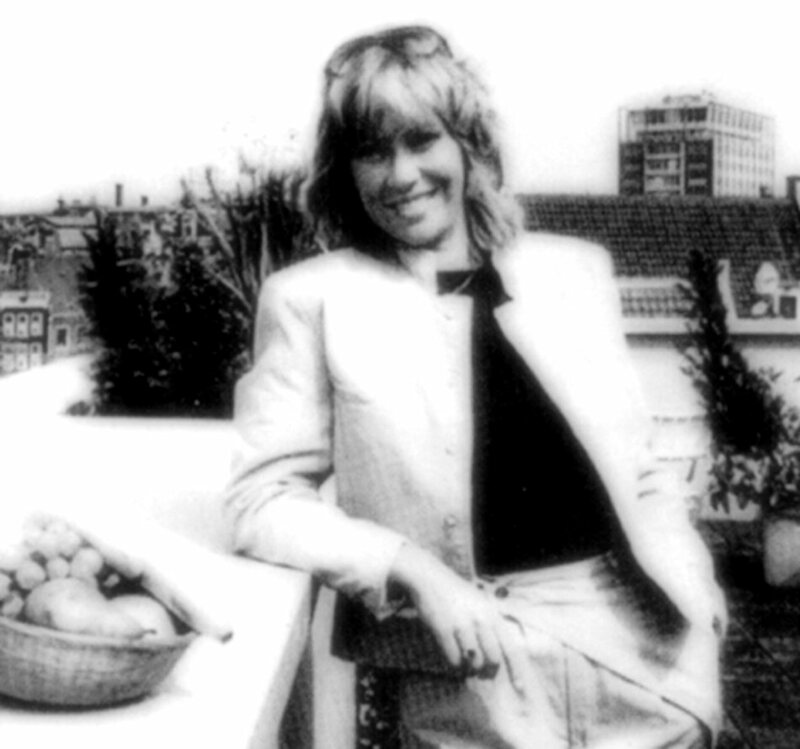 The single reached no 5 in Belgium and #24 in Holland. 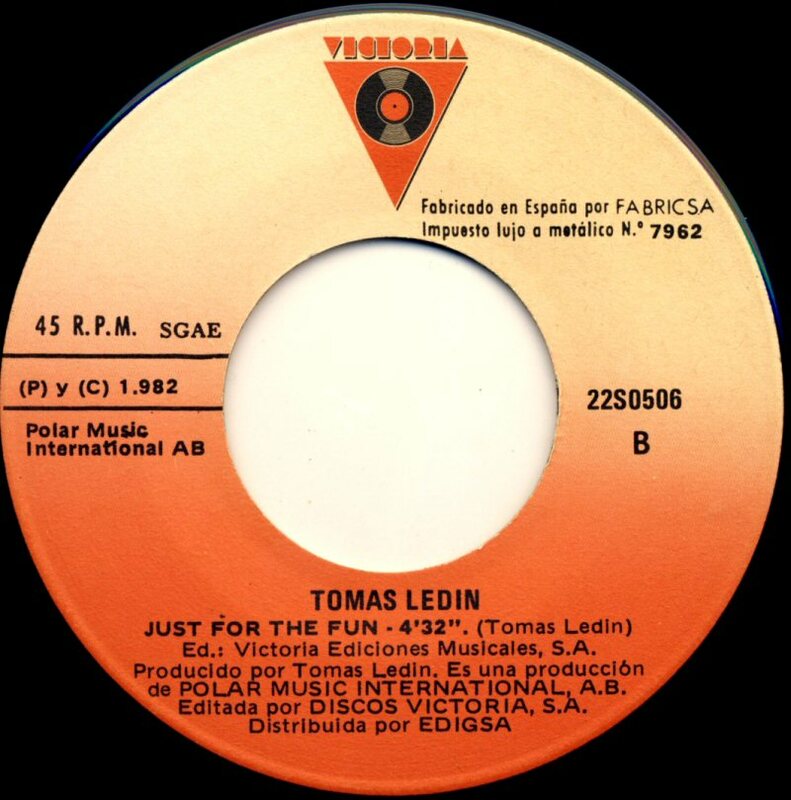 It did not enter charts in Spain, Austria and Switzerland. 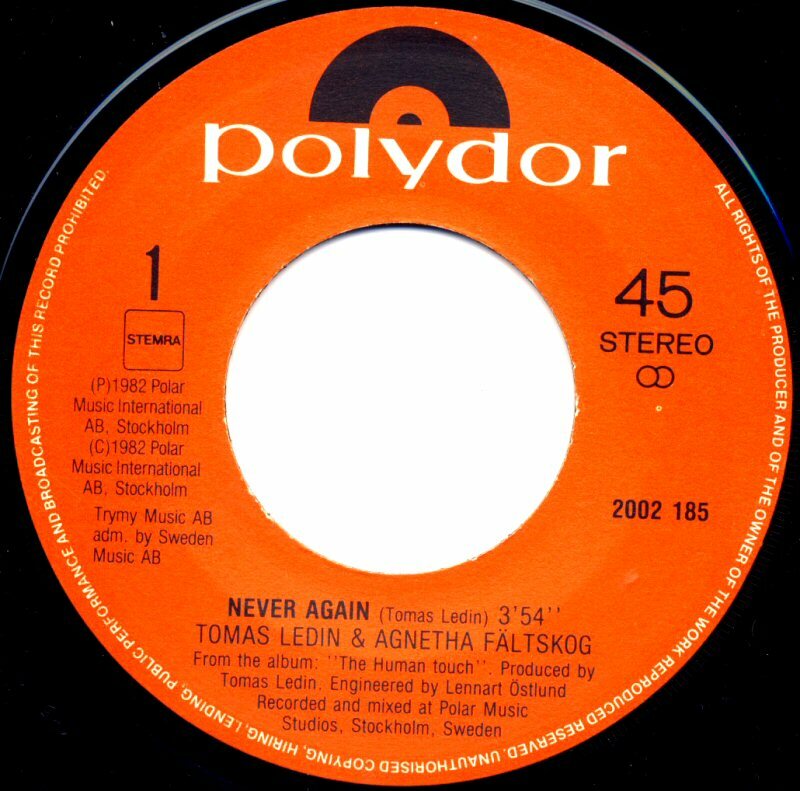 The faithful African fans in Zimbabwe made "Never Again" to a major success at #12 in September 1983. 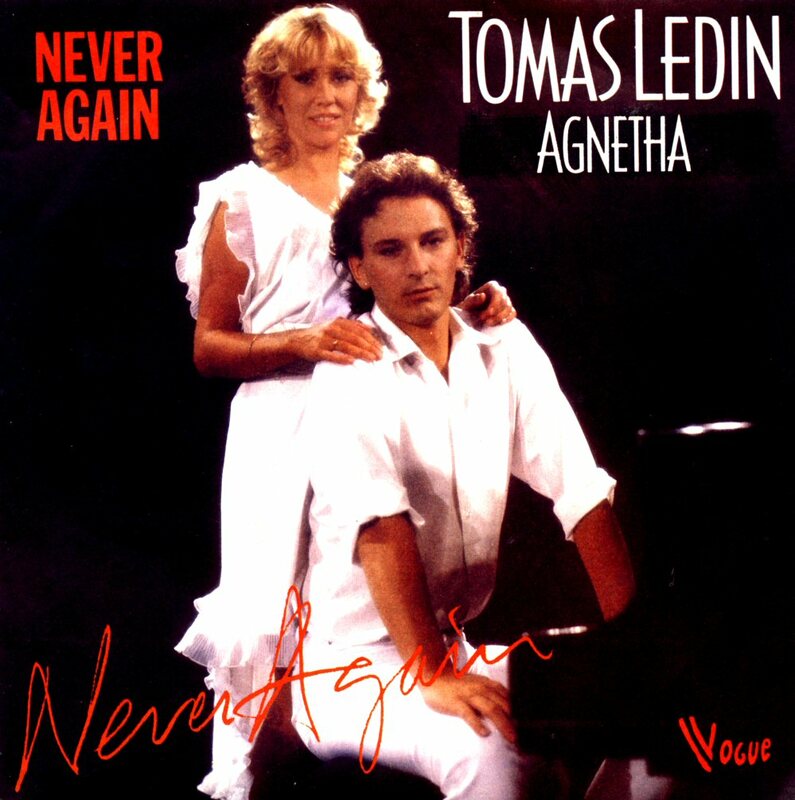 In Poland "Never Again" entered the chart on October 23, 1982 where it stayed for 4 weeks reaching #23. 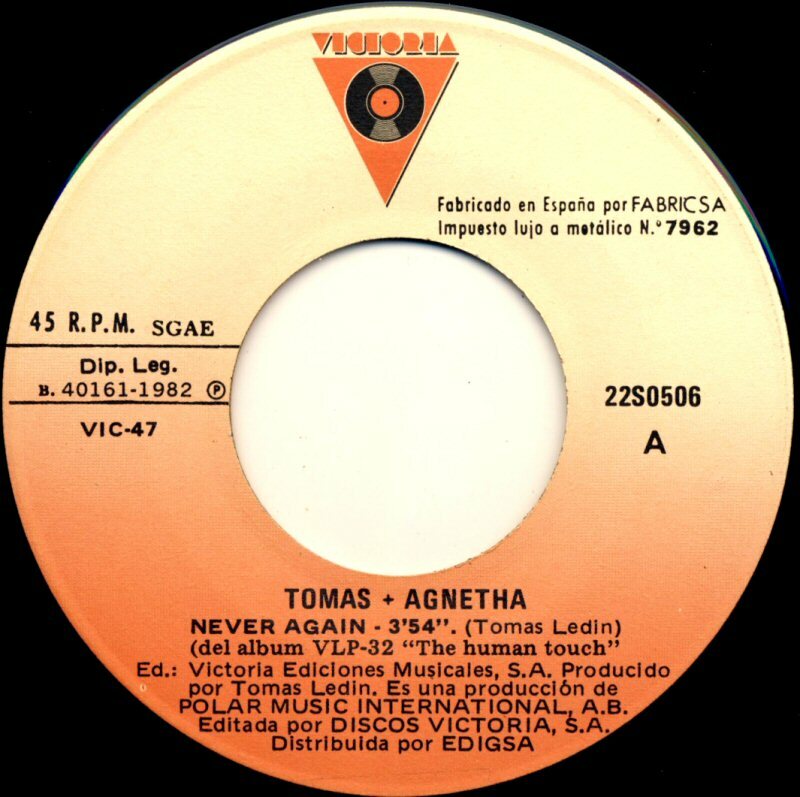 In Spain the single was released in two versions - the first single featured an English language version of "Never Again" and the second single featured a Spanish version which was entitled "Ya nunca más". 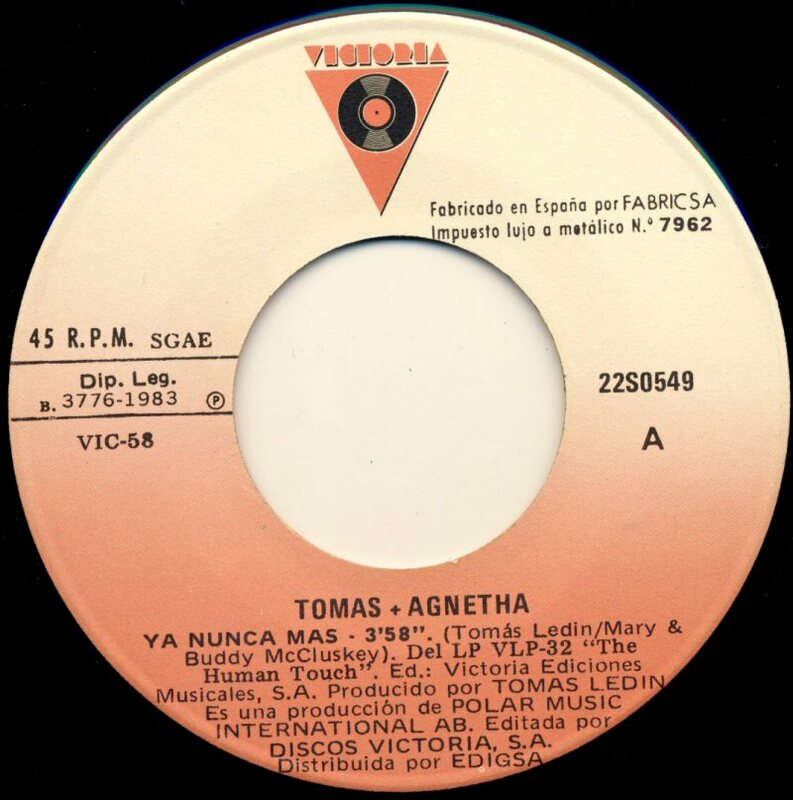 The Spanish version was even released South America. 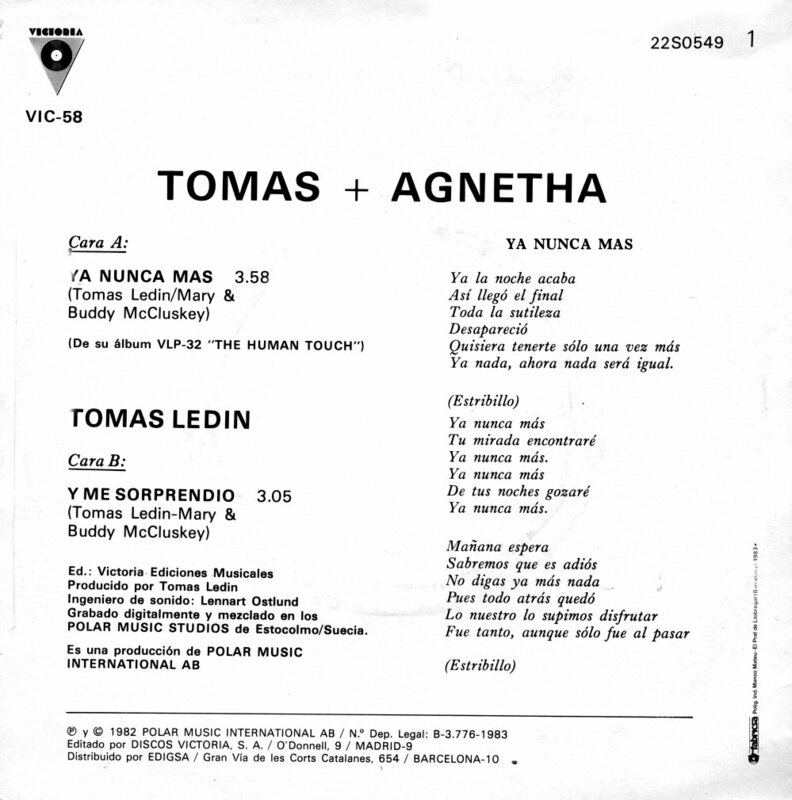 The single "Ya nunca más" featured även Spanish version of Tomas' big Swedish hit "Sommaren är kort" (English version "Taken by Surprise") which had been translated by Mary & Buddy McCluskey and received title "Y me sorprendio". 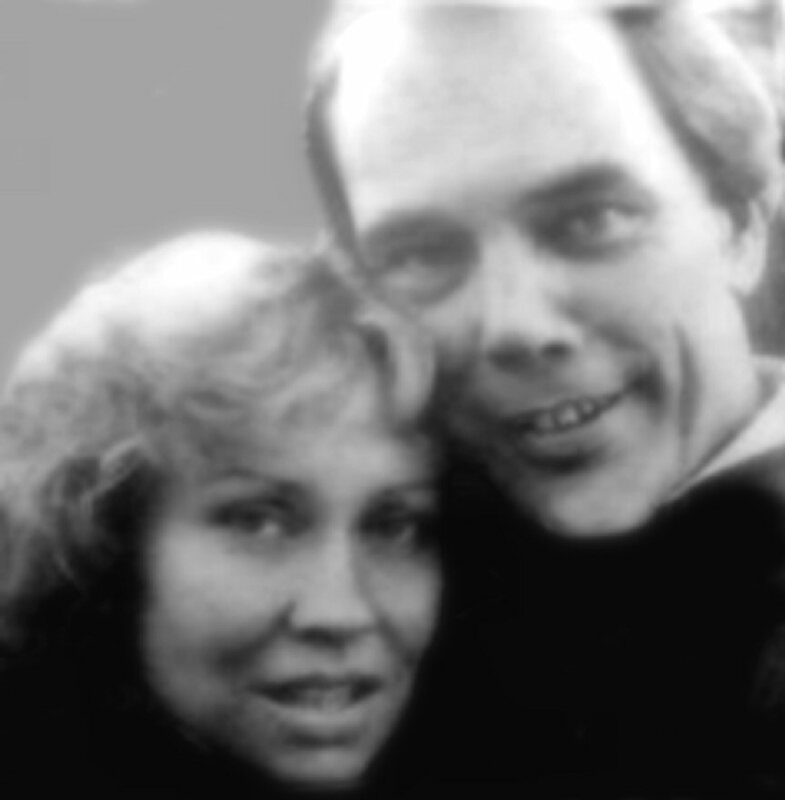 Agnetha and Tomas did some TV promotion for the single. 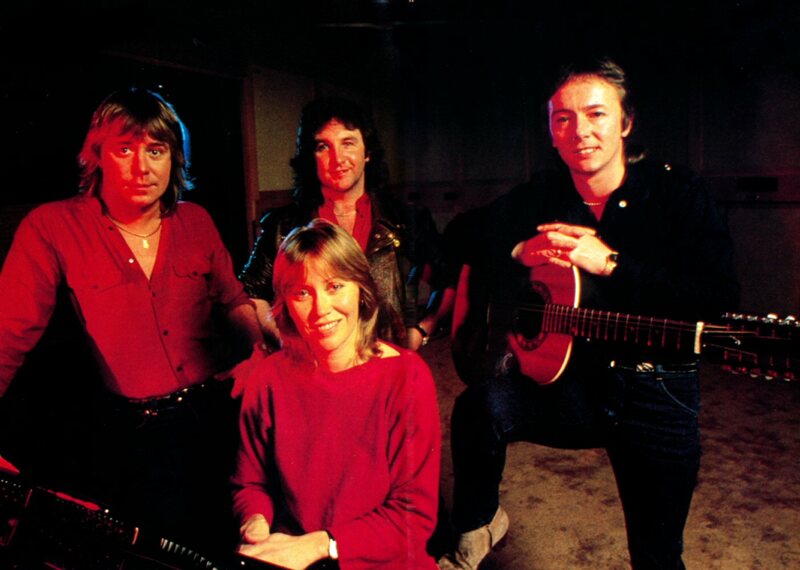 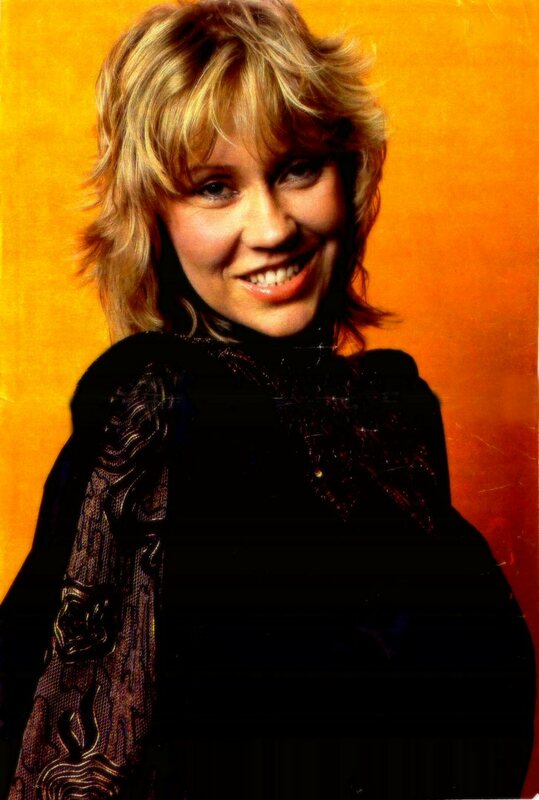 They recorded a video and they were guests in "Nöjesmaskinen" on Swedish TV where they performed "Never Again" and Agnetha alone gave an extended interview for the host Sven Mellander. 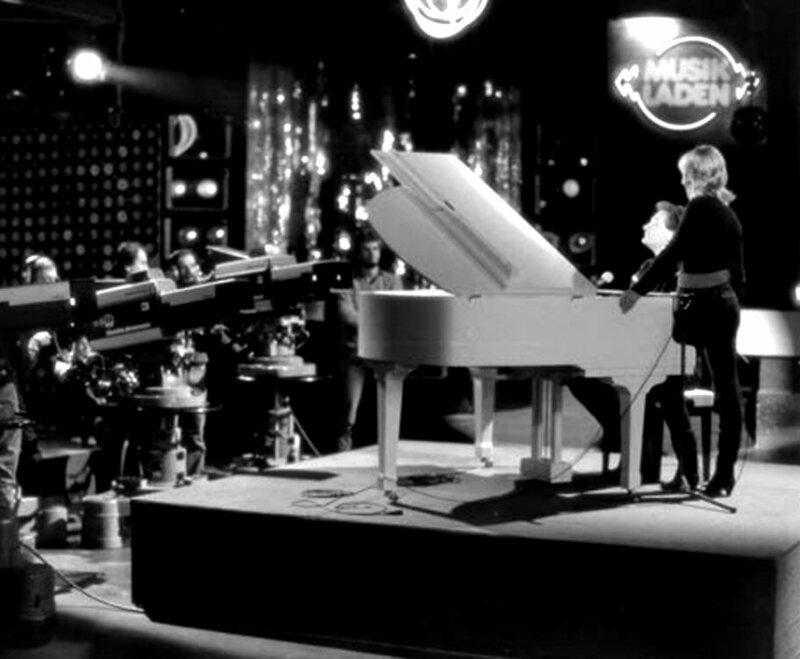 In West Germany they appeared in "Musikladen". 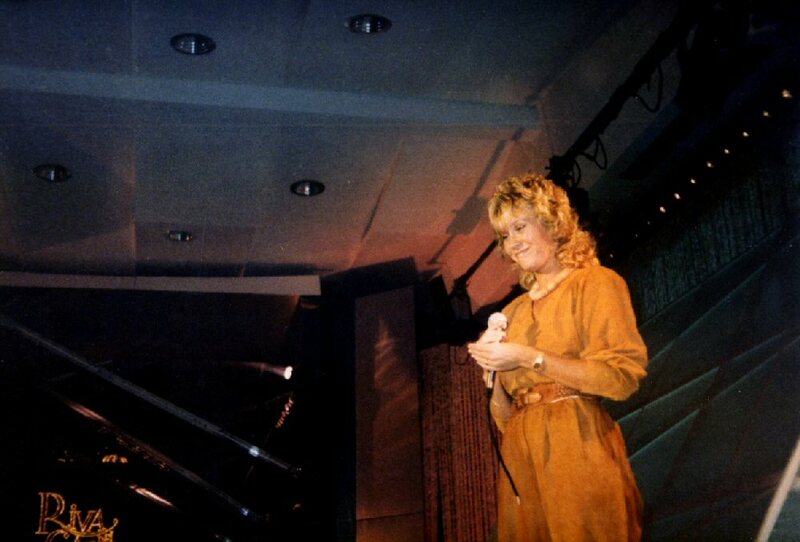 Agnetha gave an exclusive interview for Sven Mellander and performed "Never Again" together with Tomas Ledin. 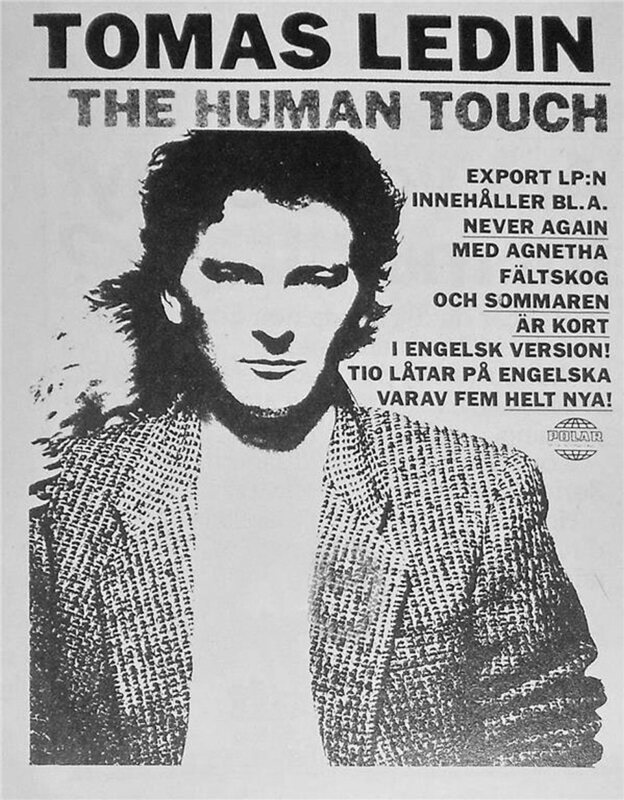 "Never Again" was included on Tomas Ledin's solo album "The Human Touch" which was released in Sweden in autumn 1982. 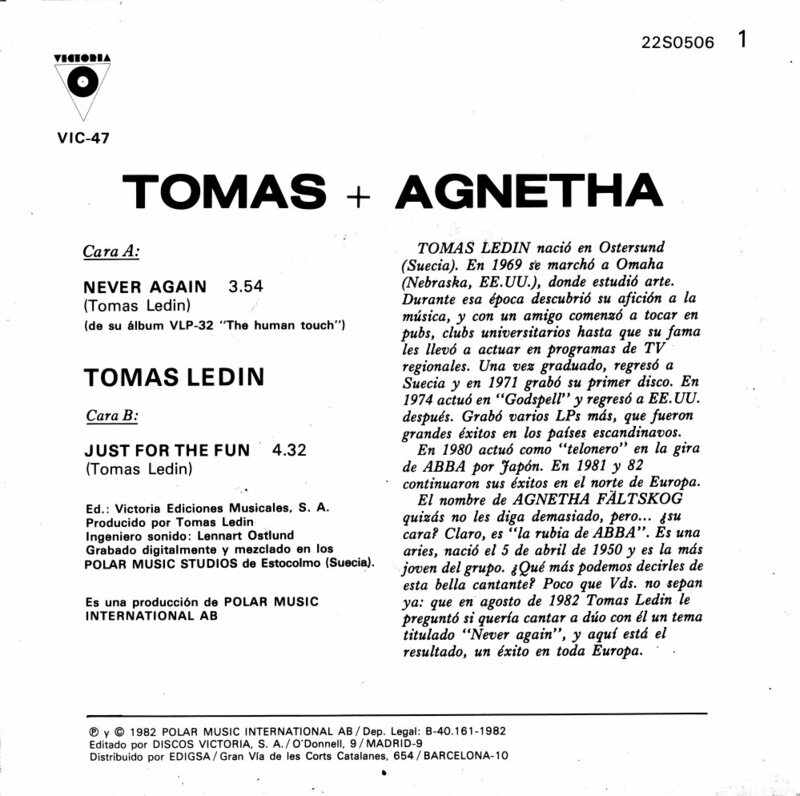 Even Tomas' composition "I've Got Something" originally written for Frida's solo LP "Something's Going On" was included on the album. 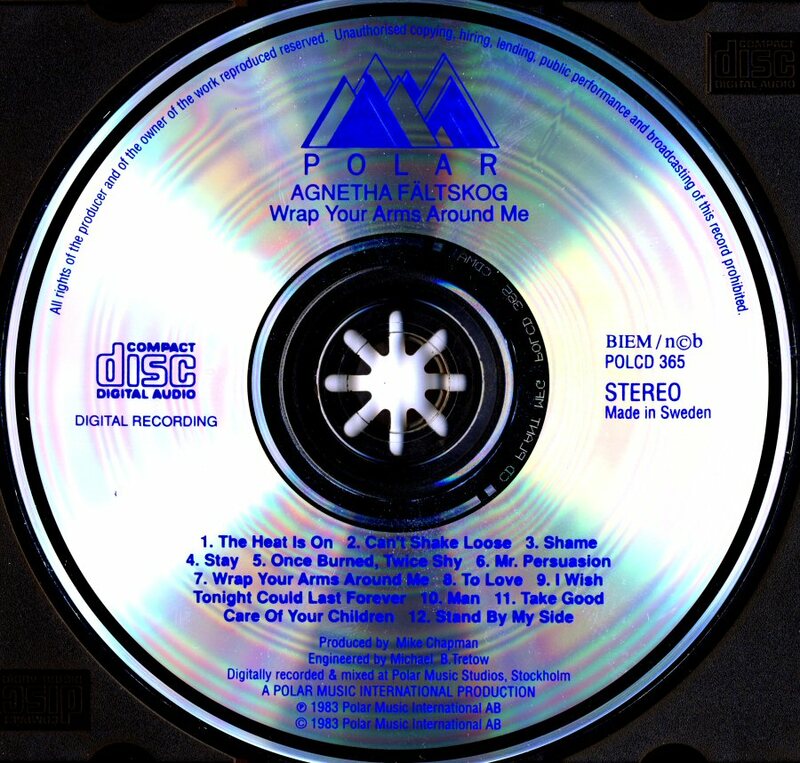 Polar released two editions: the export version and the export version with poster. 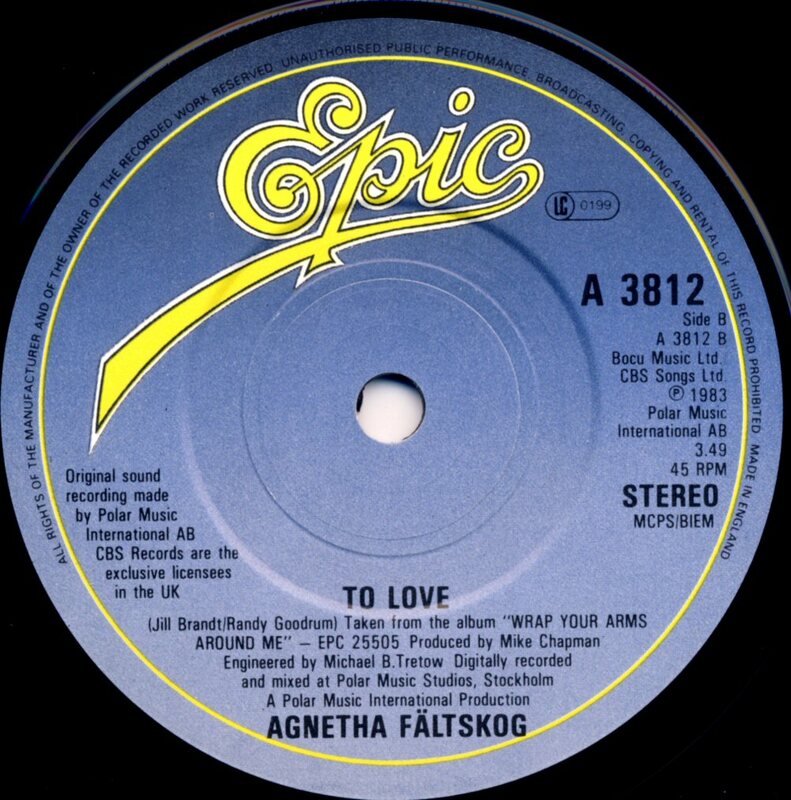 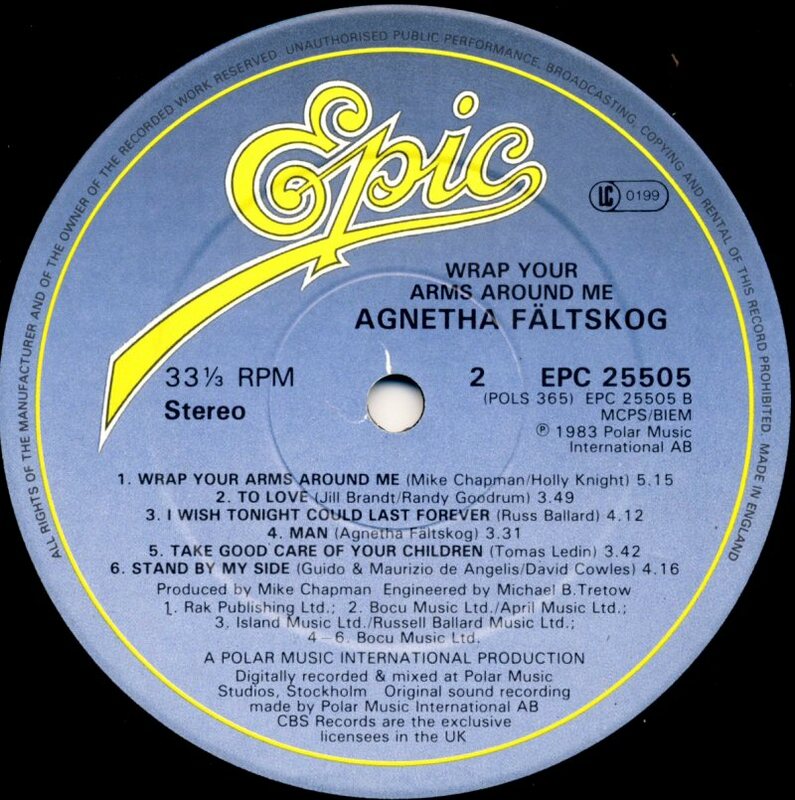 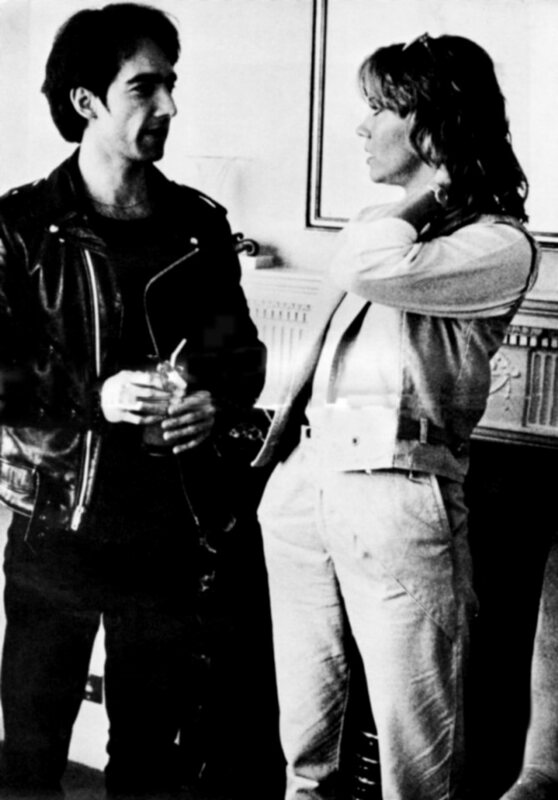 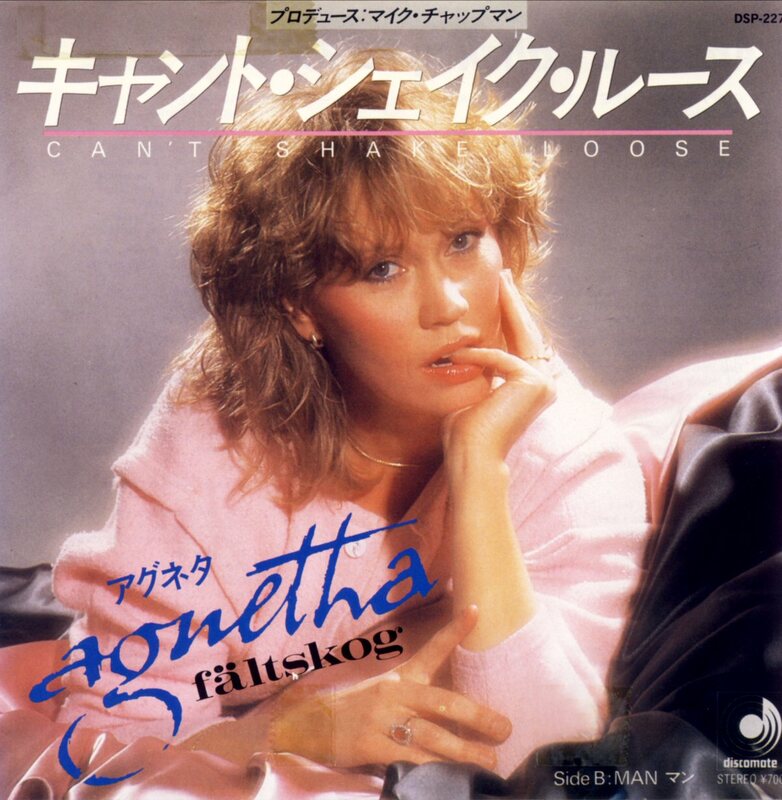 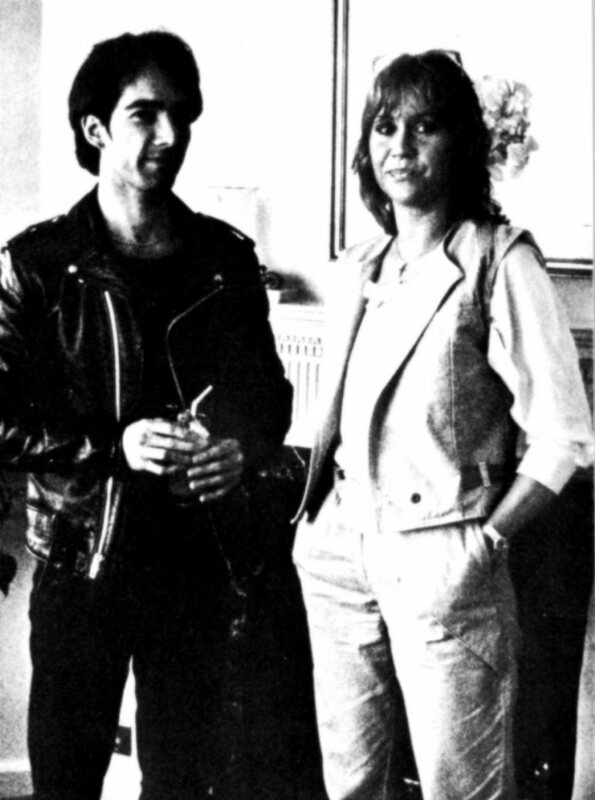 The album was released all-over the world in January 1983 with hope that Agnetha's contribution on the album would help Tomas to achieve an international break-through. 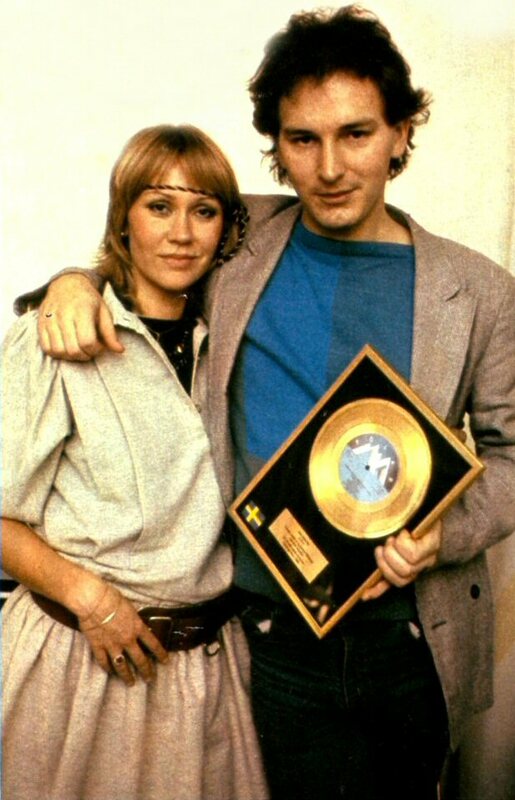 Even if Tomas and Agnetha did some TV promotion of the album in West Germany it did not become an international hit. 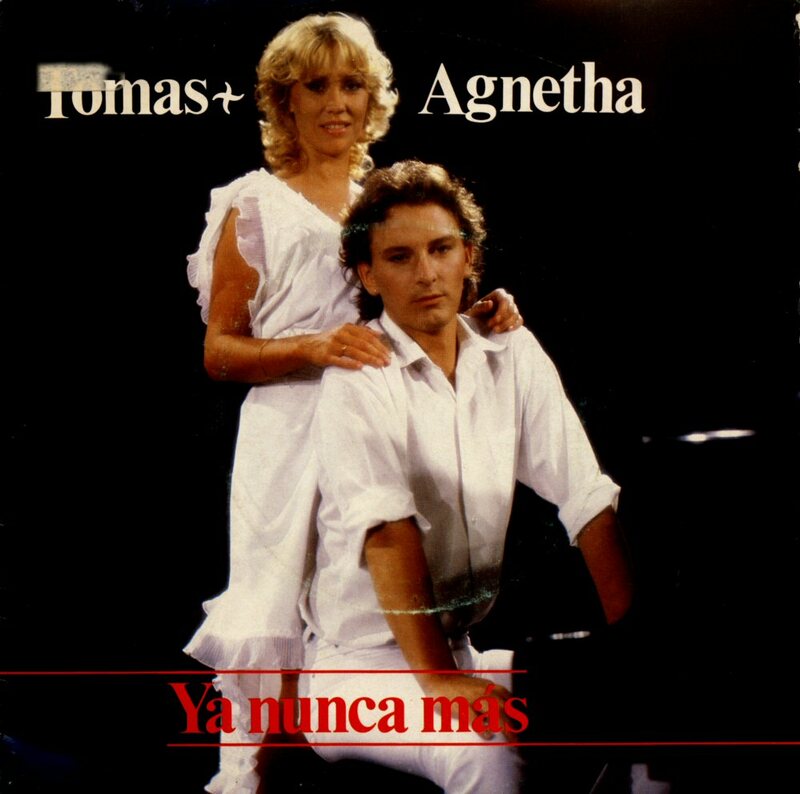 In Spanish language territories the album was released with two bonus tracks performed in Spanish: "Ya nunca mas" (Spanish version of "Never Again") and "Eres solo una mas". 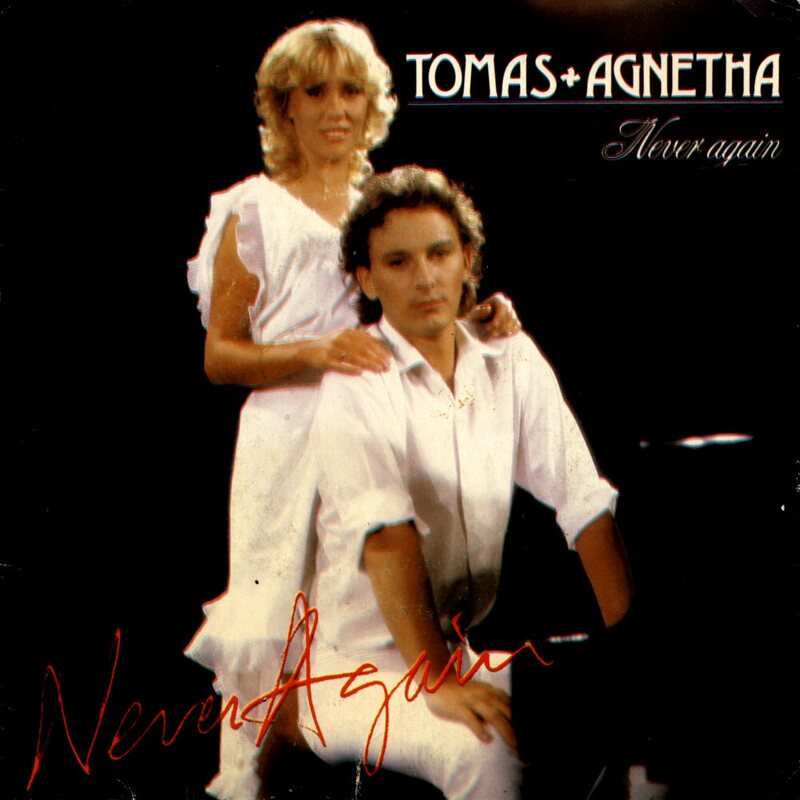 In November 1982 Agnetha and Tomas were awarded with gold records for the sales of their single "Never Again". 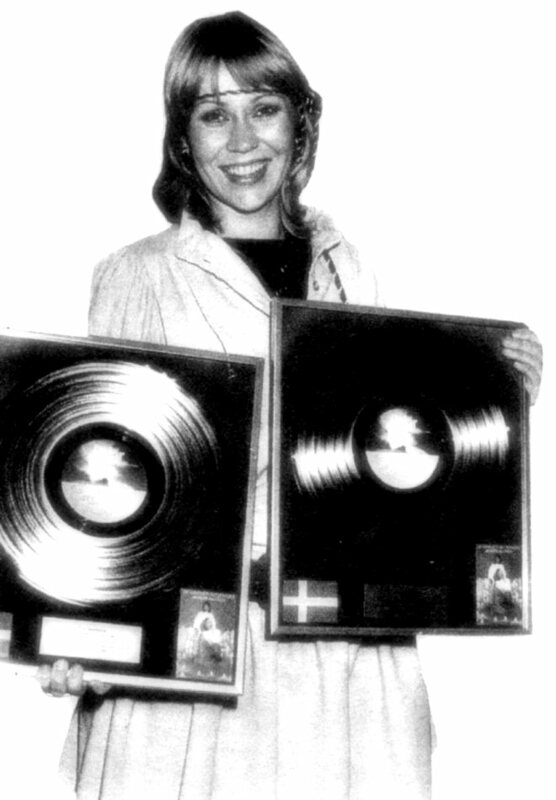 Agnetha alone received gold record for her Christmas album "Nu tändas tusen juleljus" recorded with her daughter Linda. 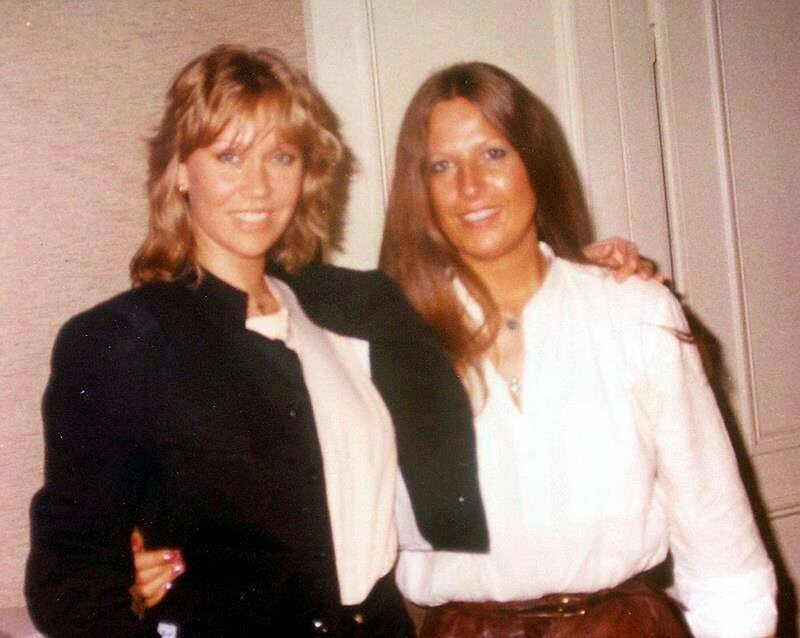 By the time around the Polar Music Awards ceremony there was taken a photo session with Agnetha. 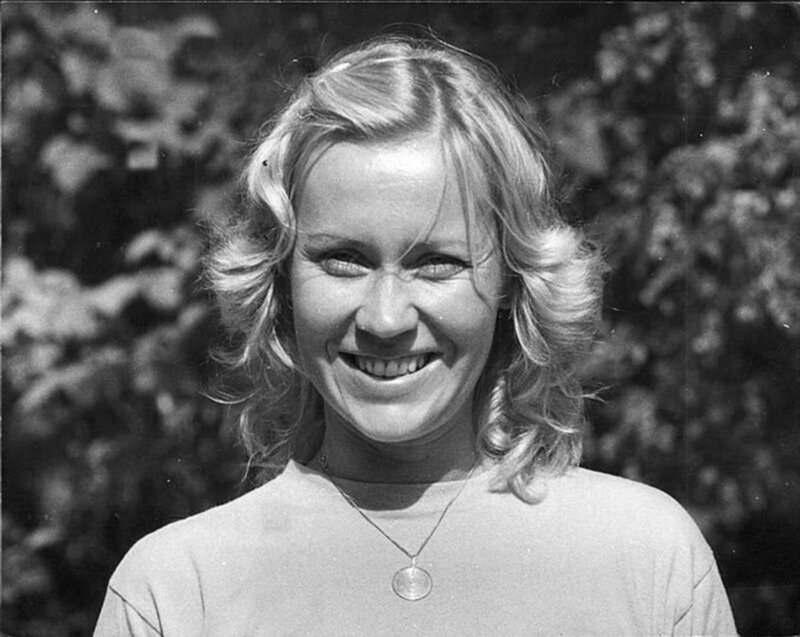 The photo session was arranged at the Polar office and several pictures were taken. 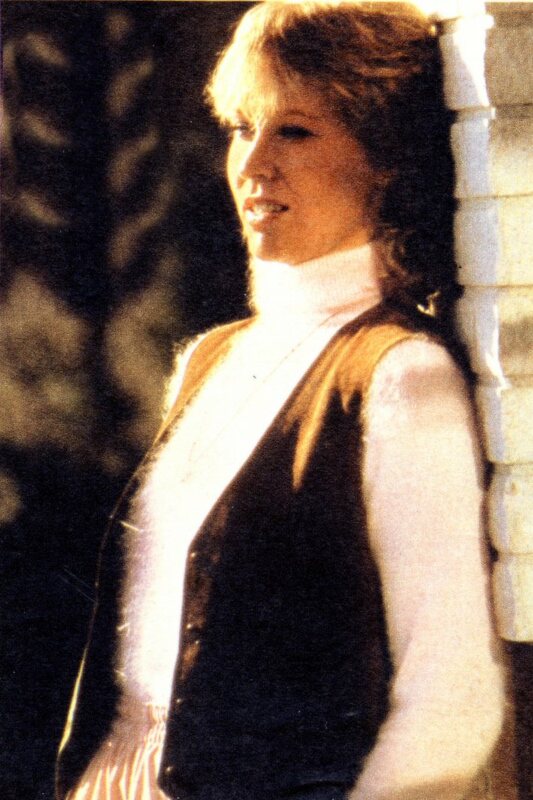 None of them was though used for promotional purposes and they remained unknown for fans. 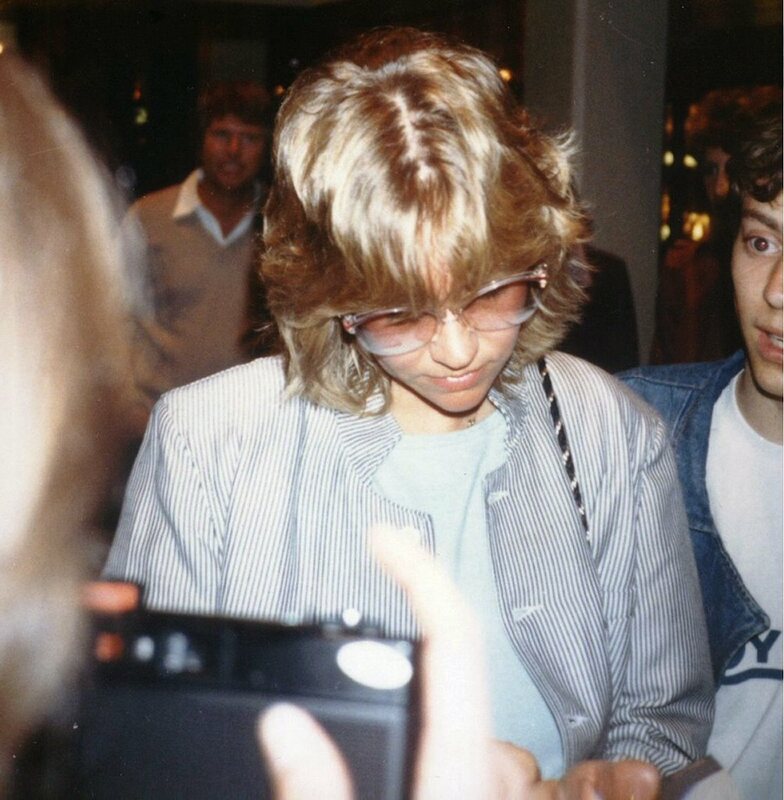 More pictures from the same period of time. 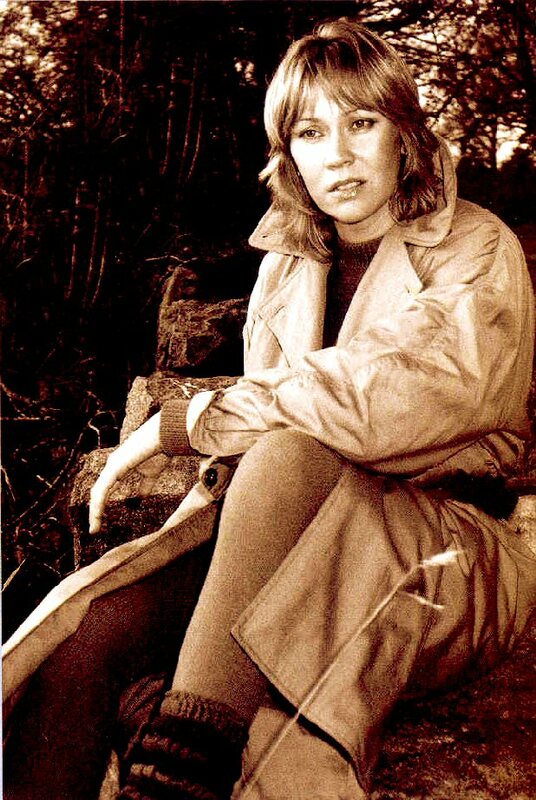 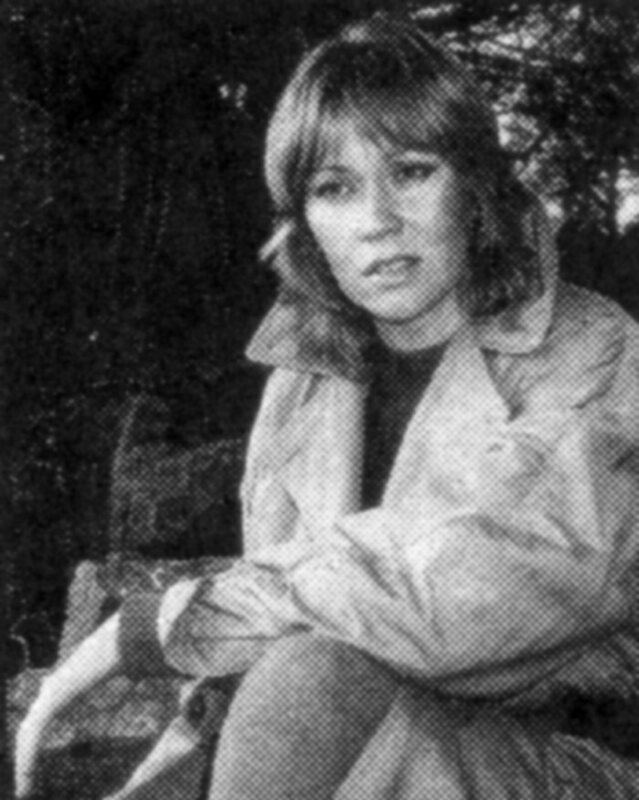 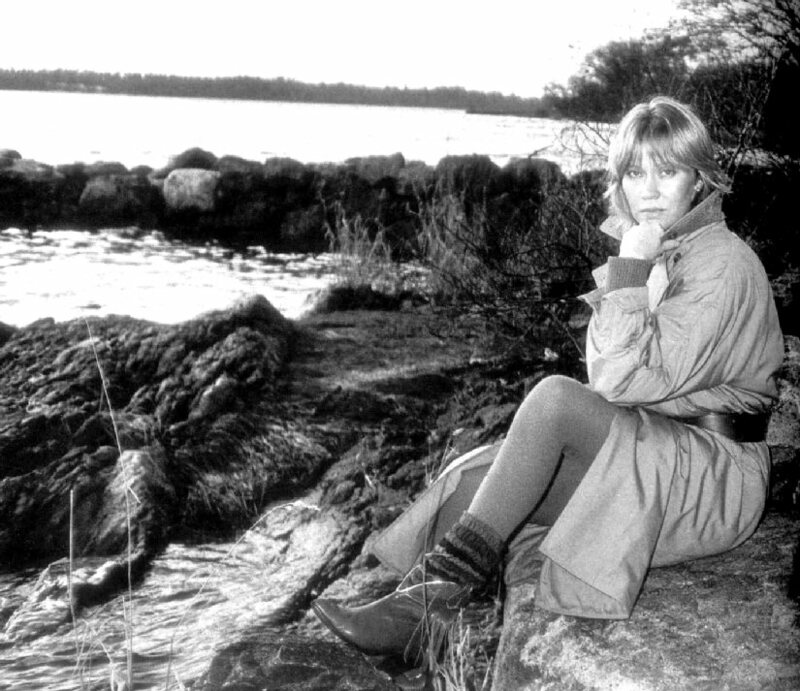 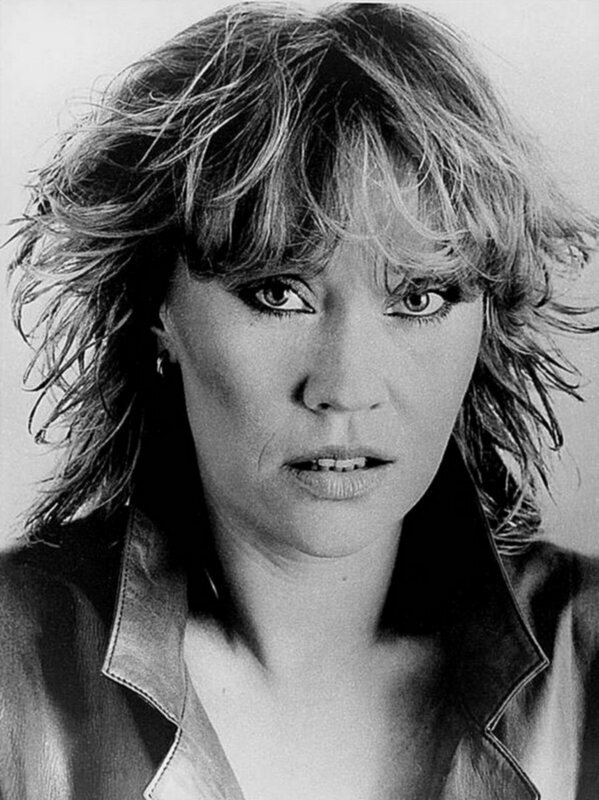 In the autumn 1982 Agnetha posed for the journalist Britta Åhman in Lidingö outside Stockholm where she lived by that time. 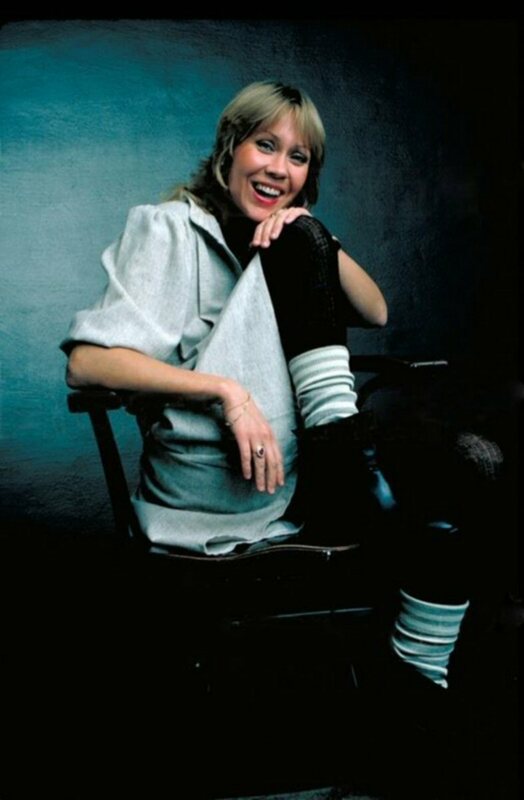 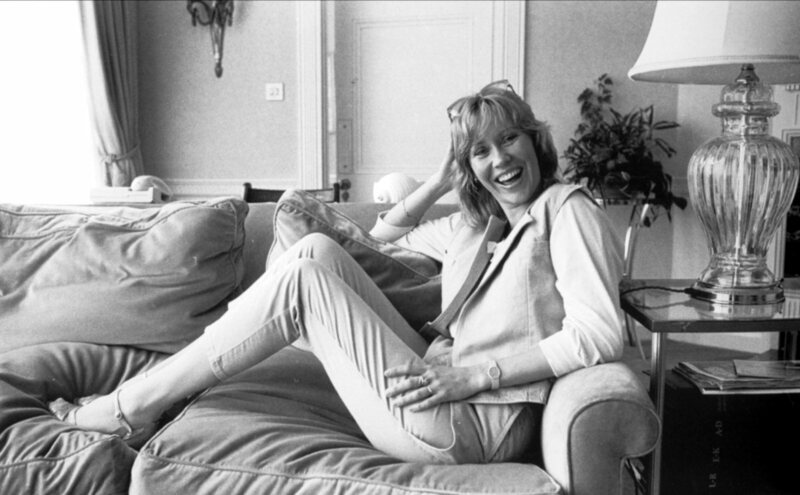 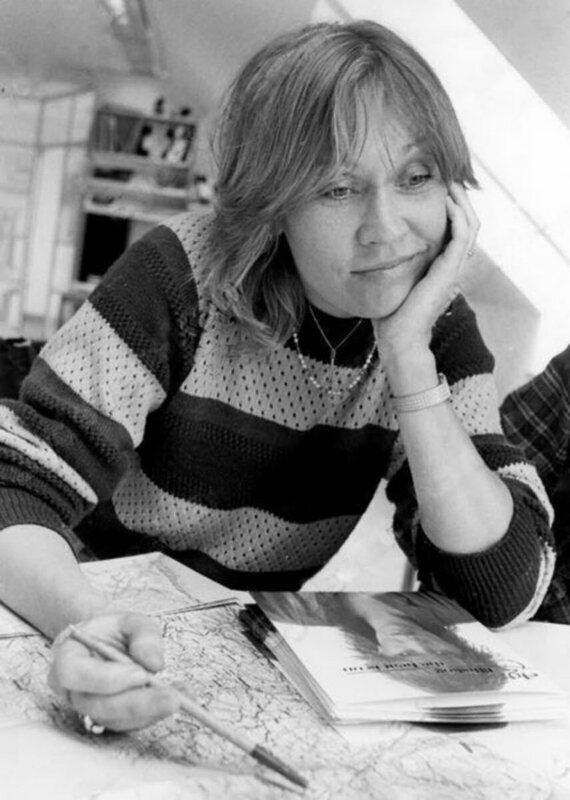 The photos were planned for publishing in a new book about Agnetha which was scheduled for issue in 1983. 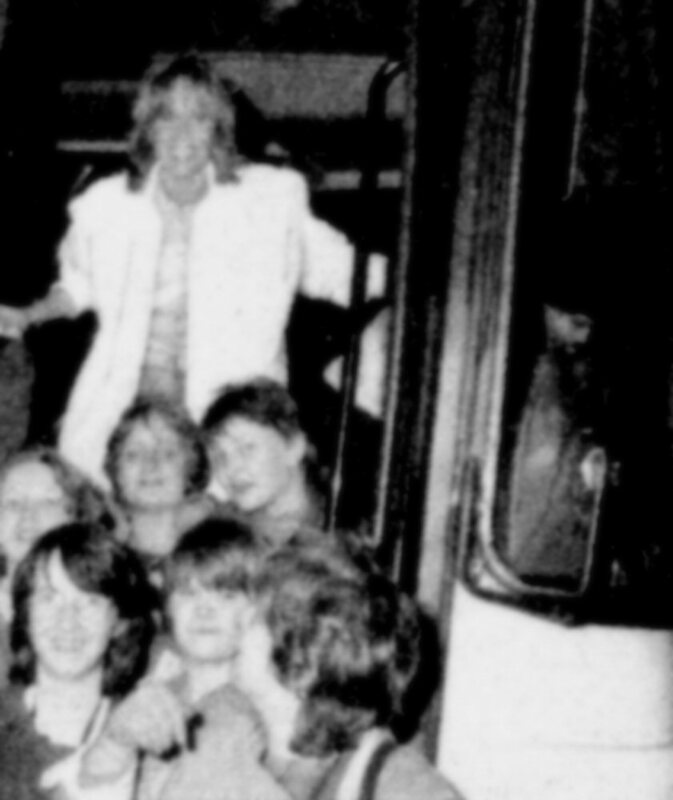 Those plans were though canceled because of the bus accident in October 1983. 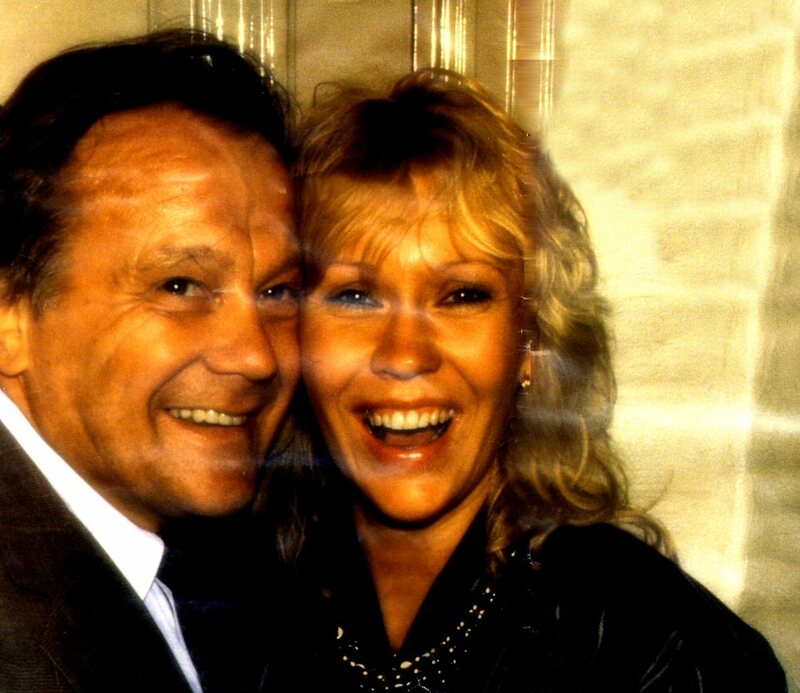 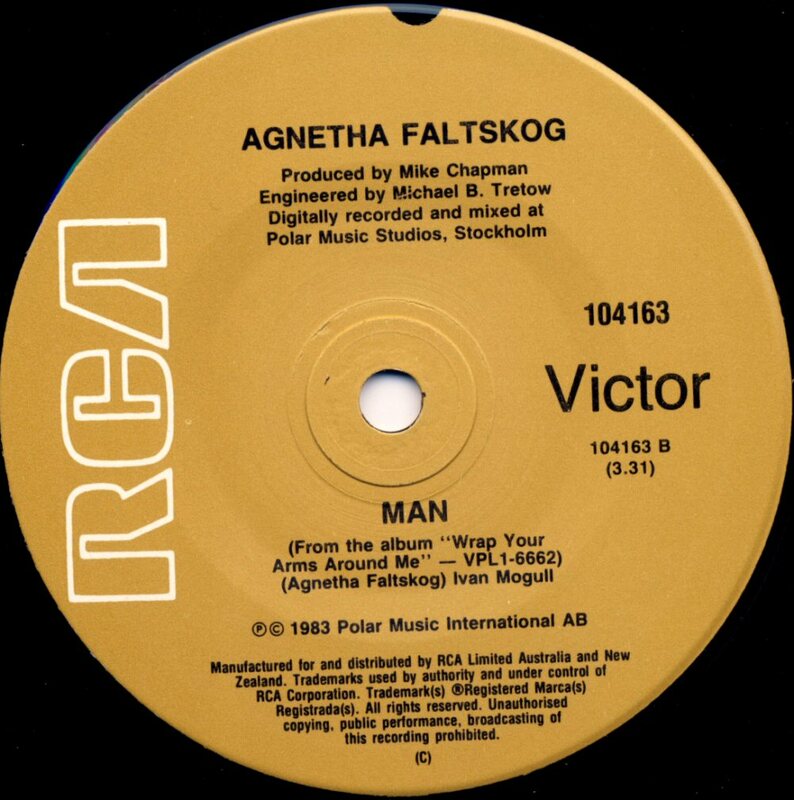 Åhman's book about Agnetha entitled "As I Am" was finally issued in 1996. 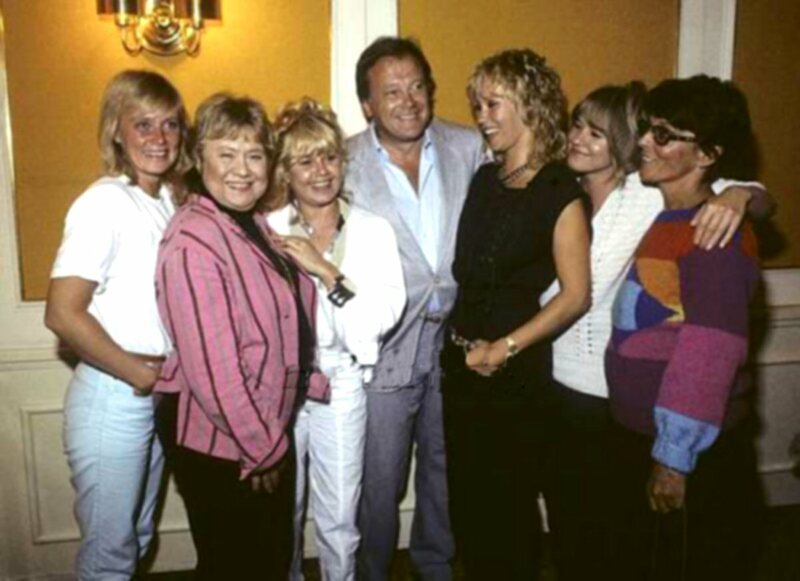 After the release of "The Singles - The First Ten Years" in the autumn 1982 it was almost sure that the ABBA era was over. 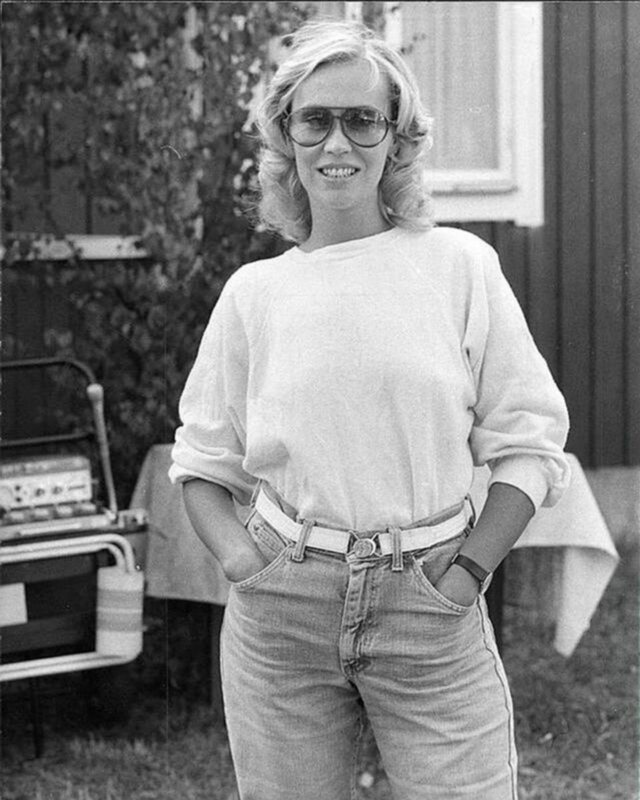 Frida enjoyed a great success with her first post ABBA solo project and even Agnetha decided to re-start her solo career. 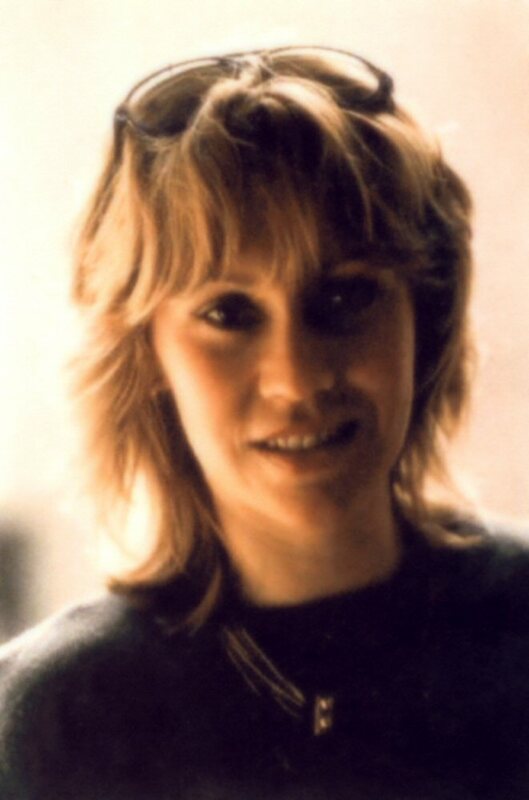 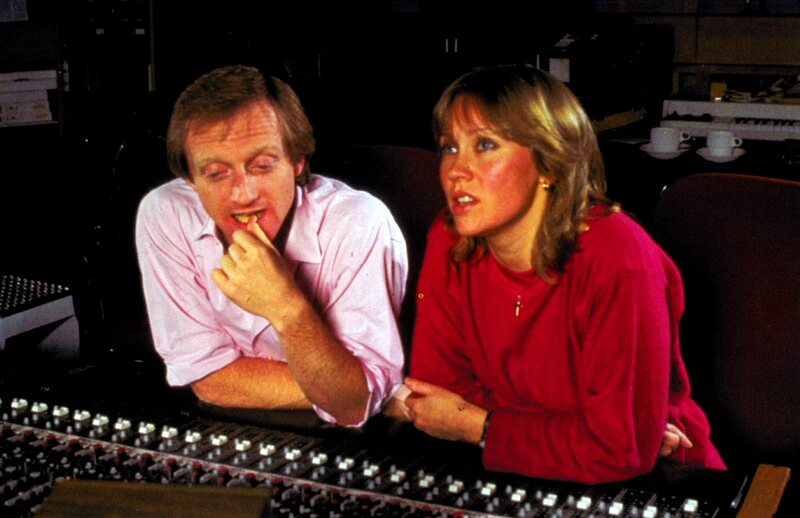 In the autumn of 1982 Agnetha, Mike Chapman (producer) and Stikkan Anderson began to look for right songs for a solo album. 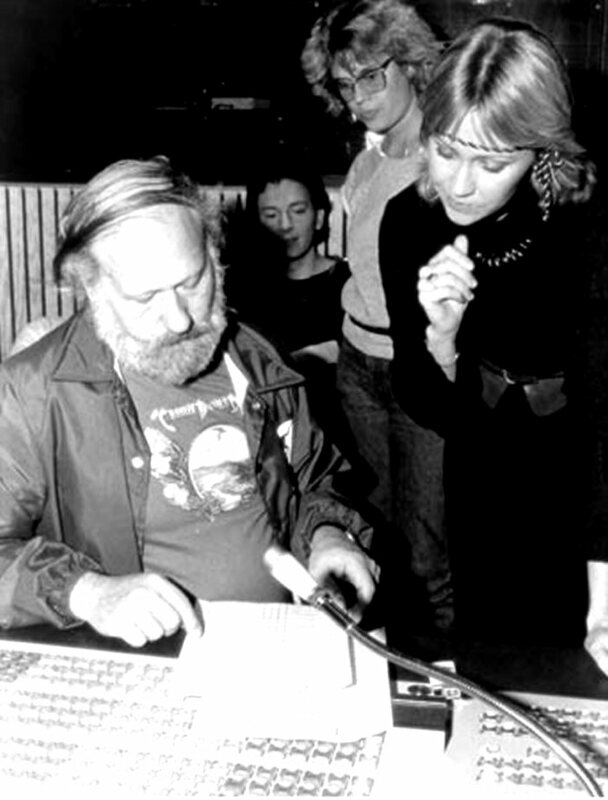 Material came from composers from all over the world. 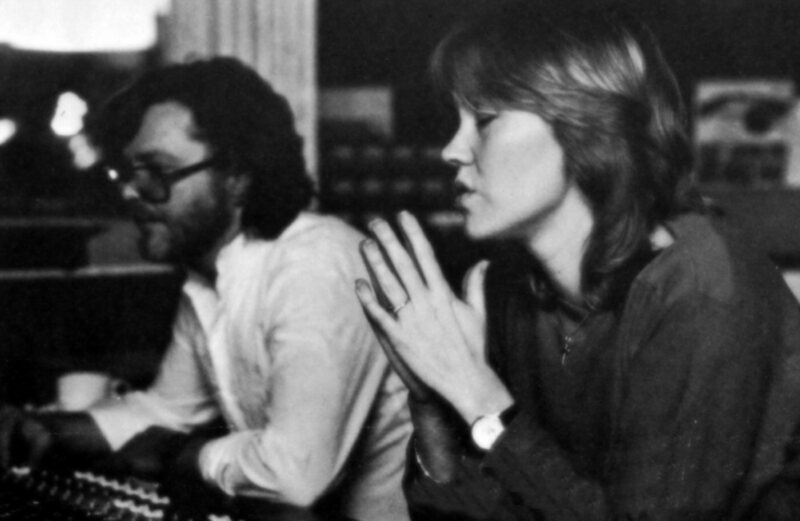 They picked up 20 songs, recorded 15 backgrounds and chose finally 12 songs for the album release. 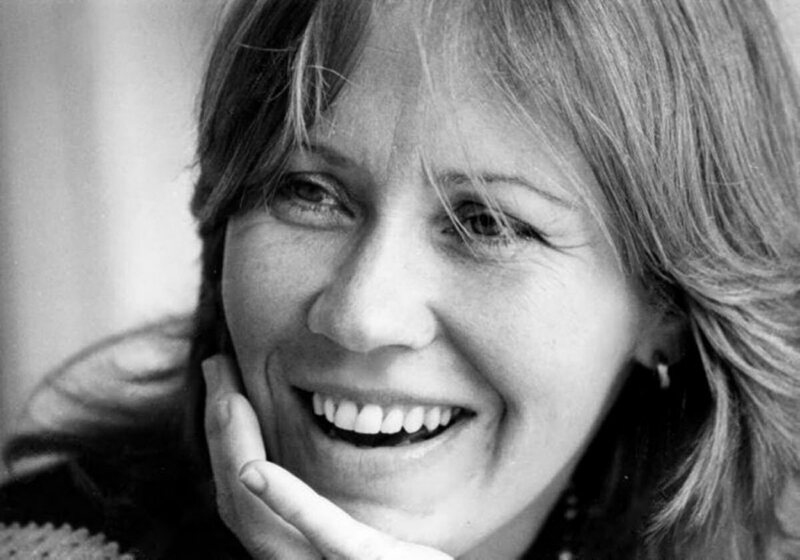 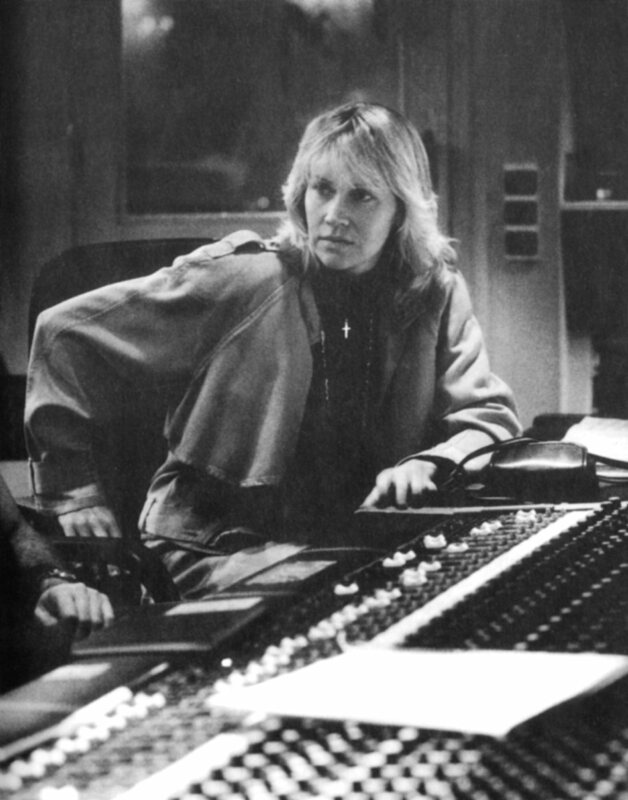 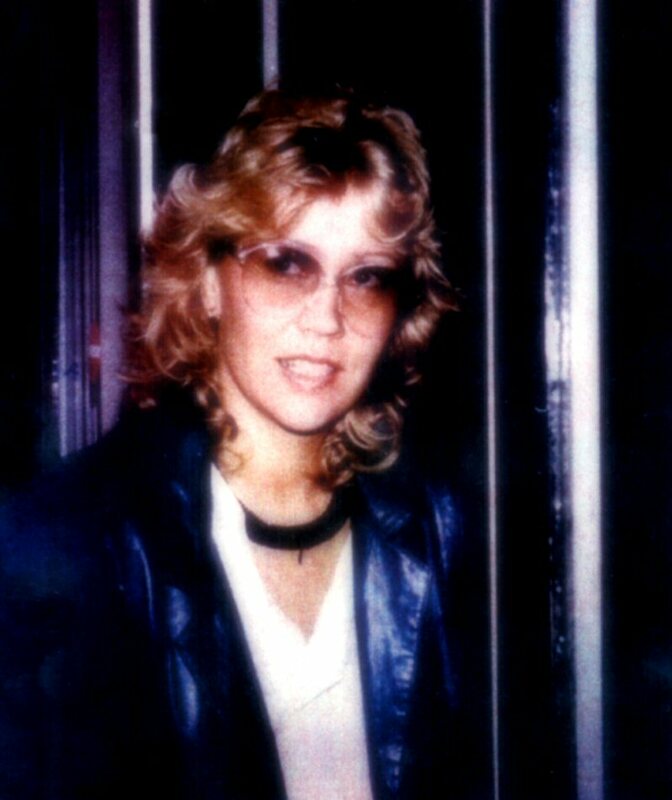 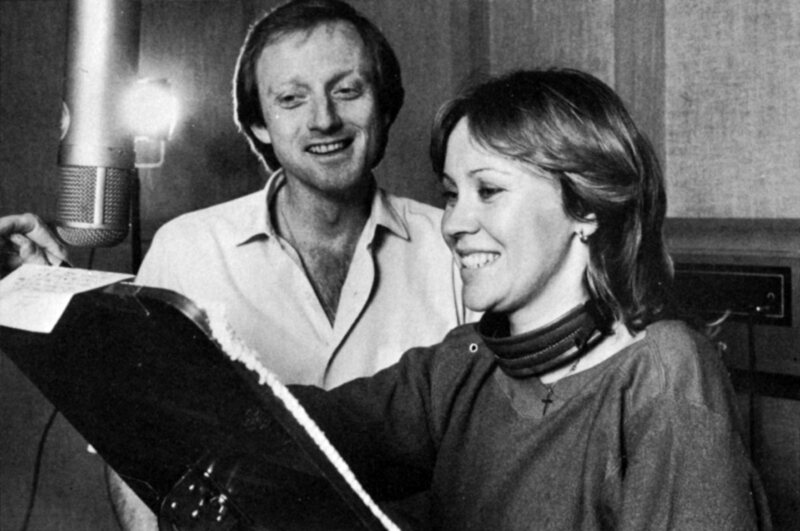 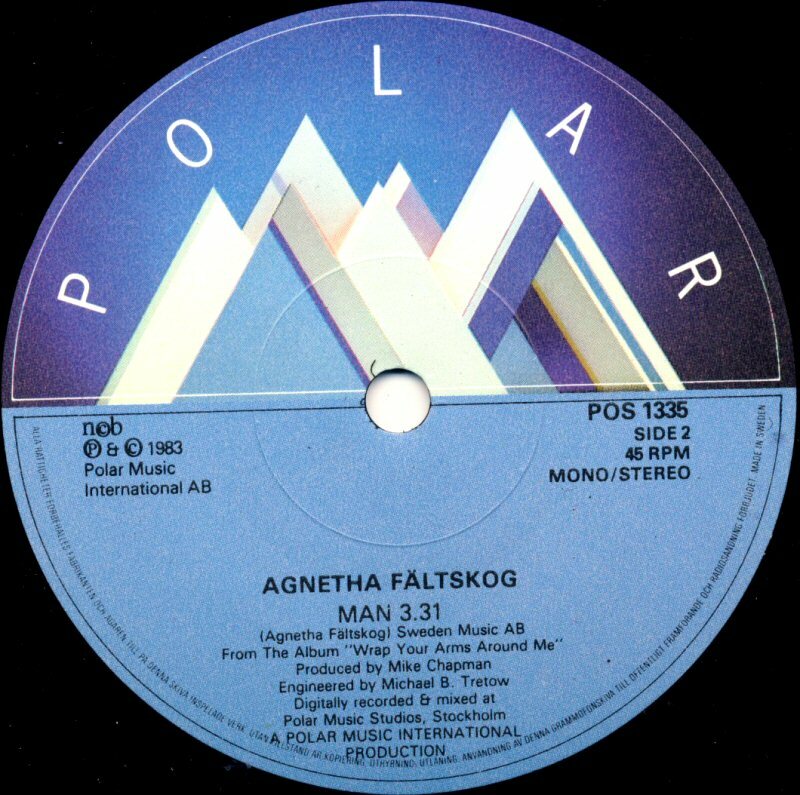 The recording sessions for Agnetha's first international album started on 20 January 1983 in Polar Studios in Stockholm. 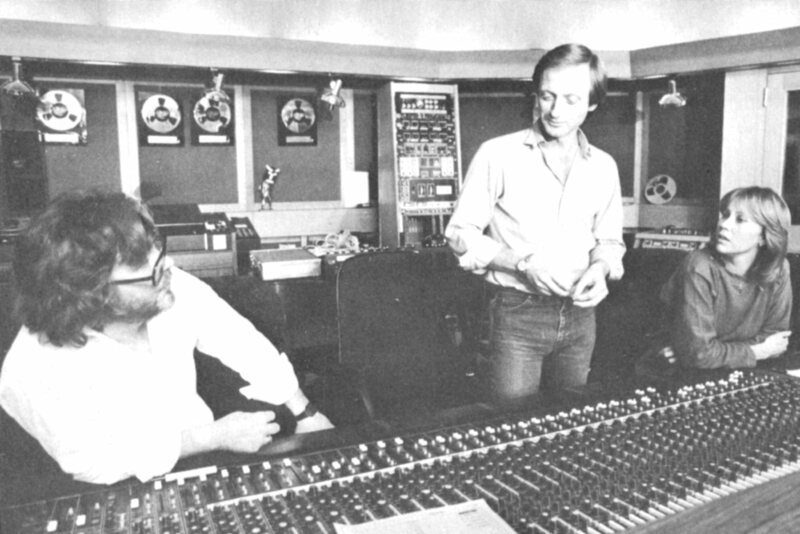 The producer was Mike Chapman and the background singers the pop group "Smokie". 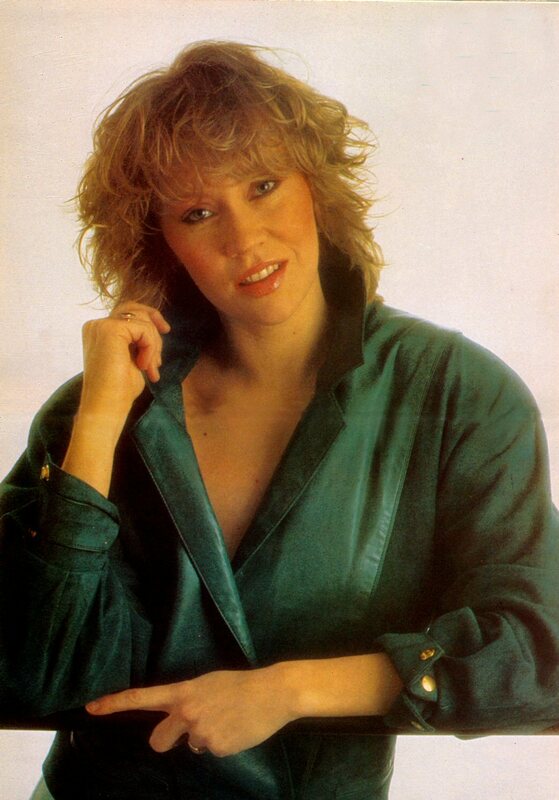 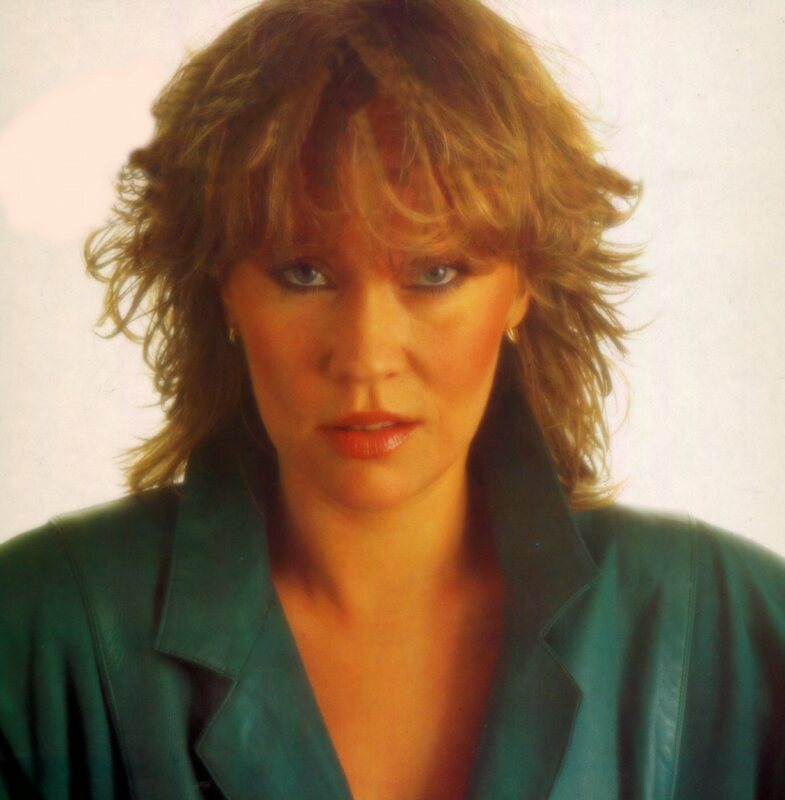 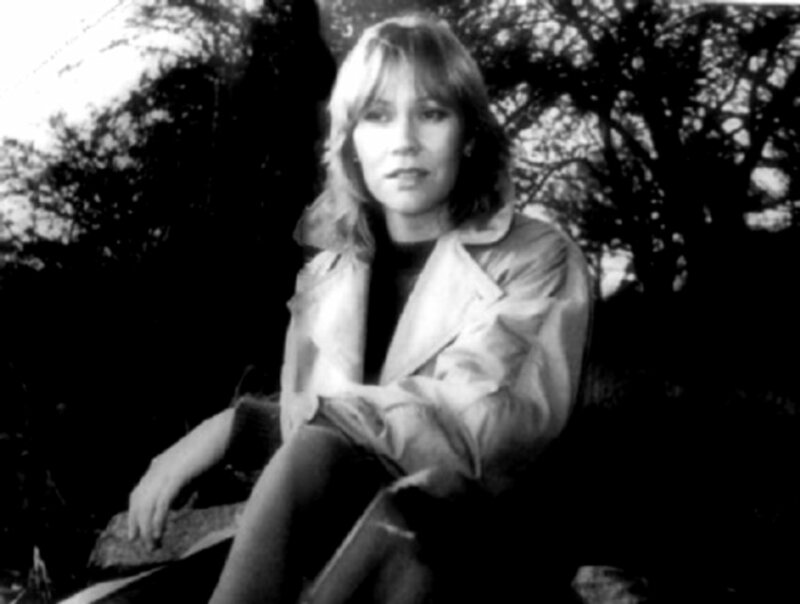 The photo session for the single "The Heat Is On" which was the first release from her solo album "Wrap Your Arms Around Me" featured Agnetha wearing a green skin jacket. 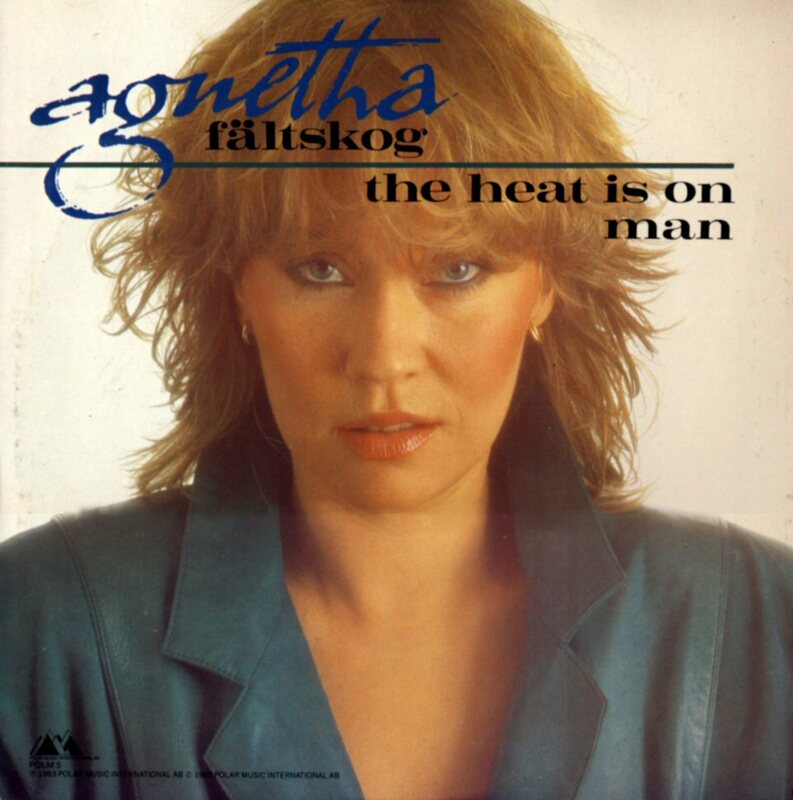 The first single from the forthcoming solo album featured "The Heat is On" with "Man" on flipside and it entered the Swedish chart on May 17, 1983. 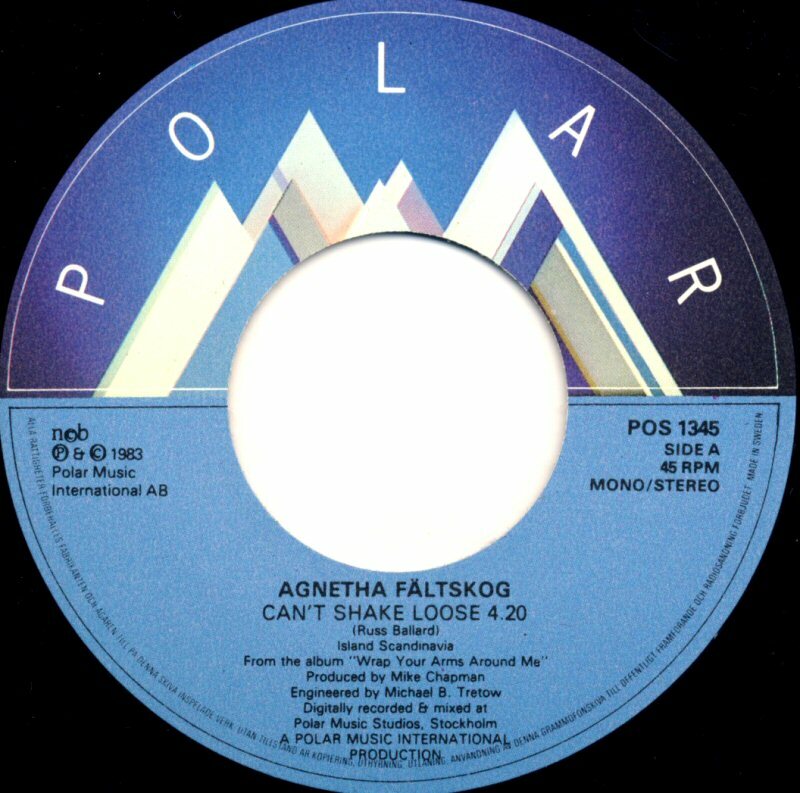 The single became a huge success in Scandinavia. 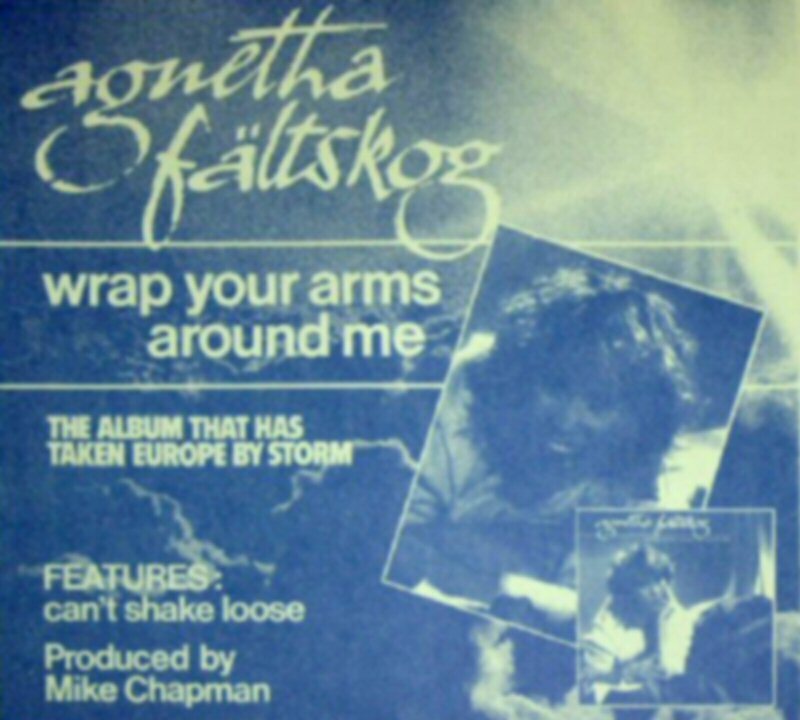 In Sweden it stayed on the chart for 16 weeks reaching #1 (for 4 weeks). 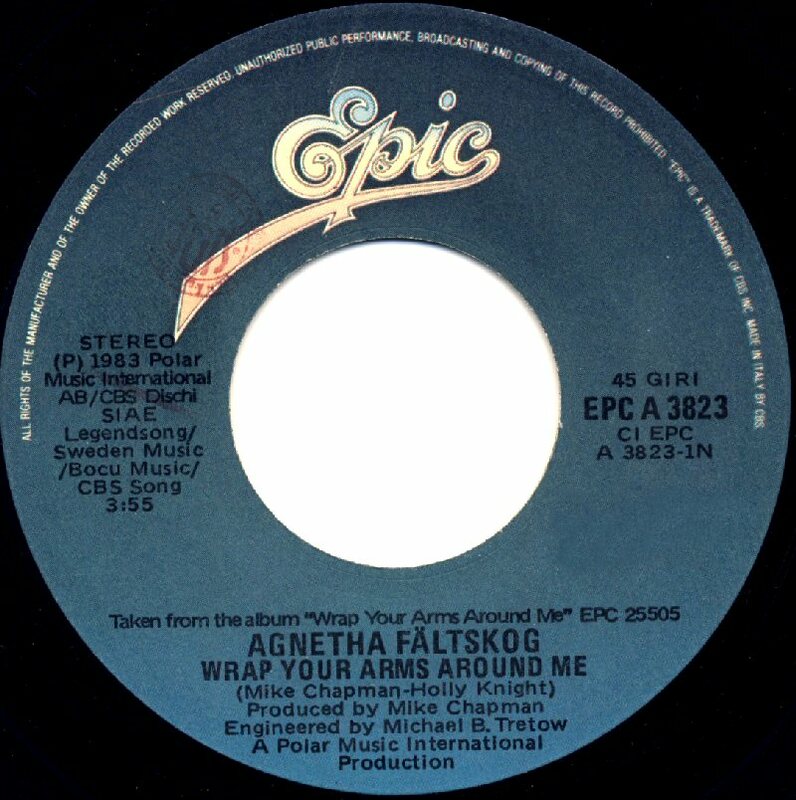 In the UK the single entered the chart on May 28, 1983 and stayed there for 6 weeks reaching #36. 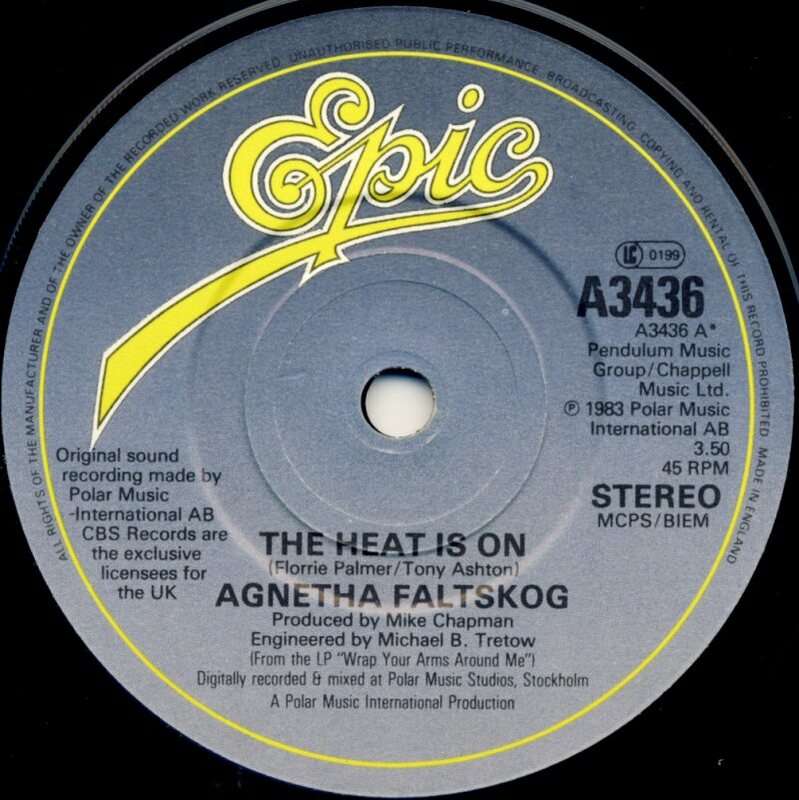 "The Heat Is On" became a summer hit in Europe. 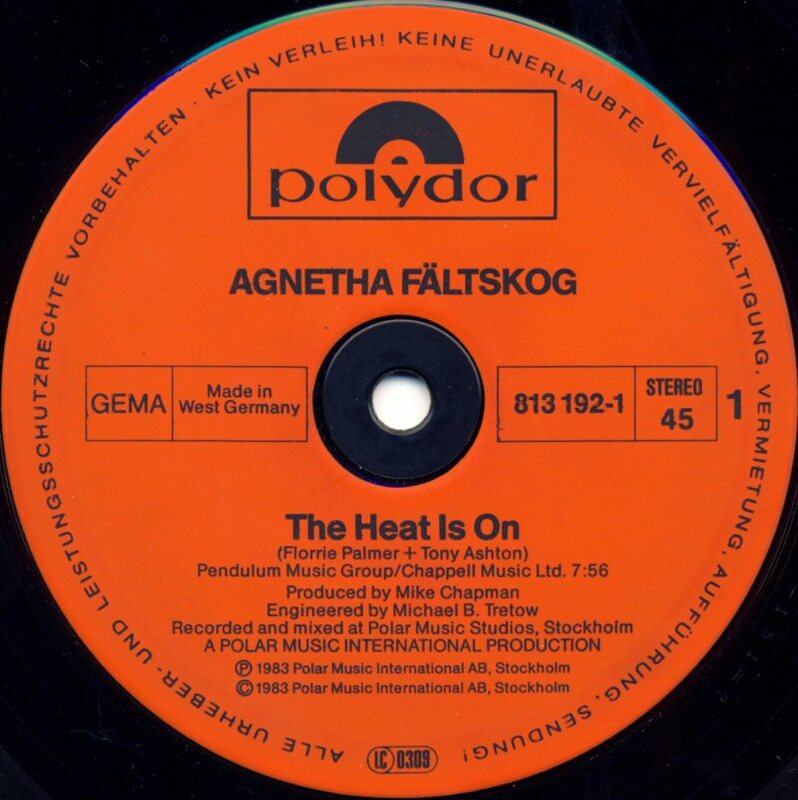 In West Germany "The Heat is On" peaked at #20, in both Belgium and Holland "The Heat is On" #2. 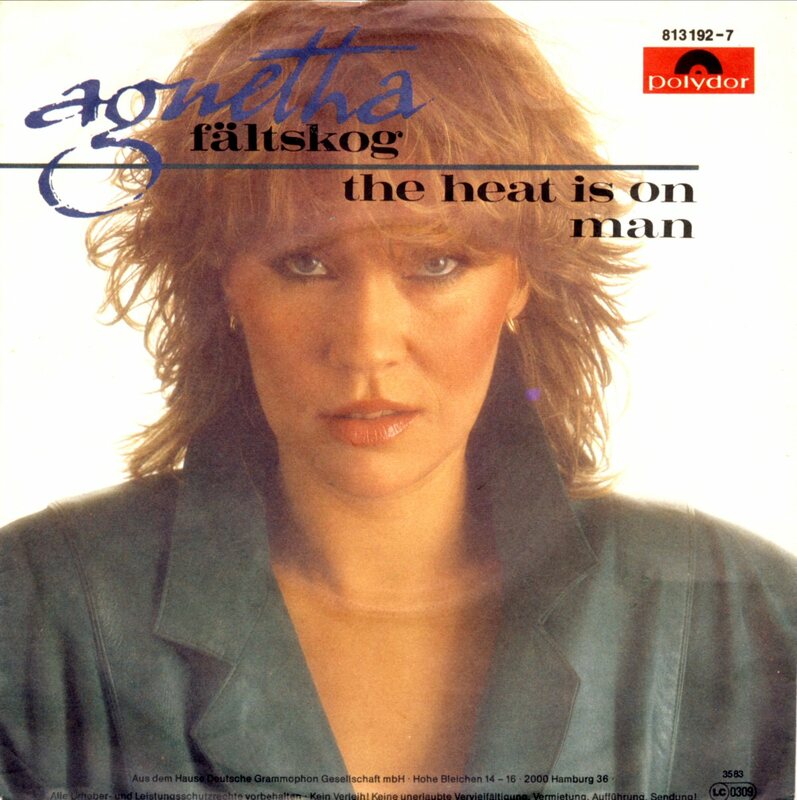 But "The Heat is On" was not a favorite in Poland where "Man" was chosen for the radio promotion. 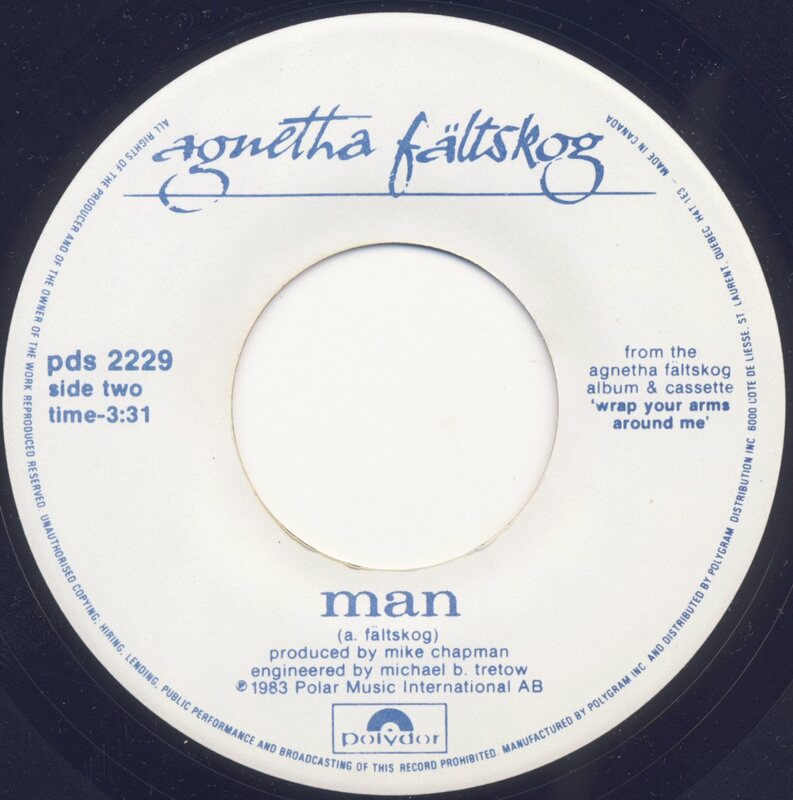 "Man" entered the Polish chart on 11 June 1983 where it stayed for 5 weeks reaching no 15. In France the single featured an 8 seconds longer version of "The Heat Is On". 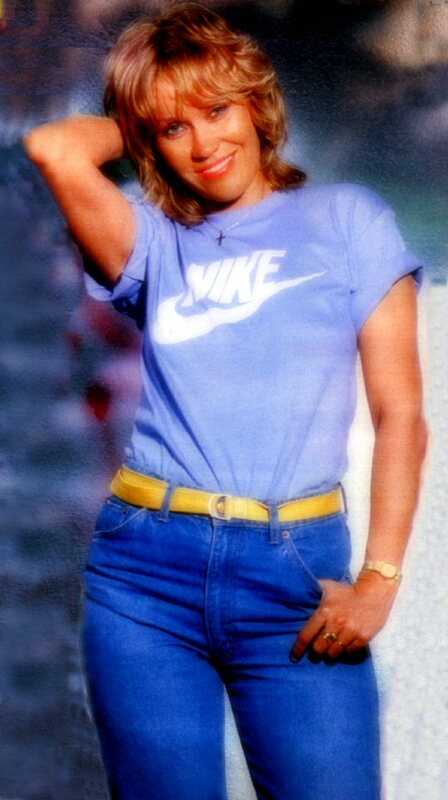 The single peaked at #10. The alternative version of "The Heat Is On" extended with 6 seconds was released even on the Polystar compilation album "I love ABBA" in West Germany. 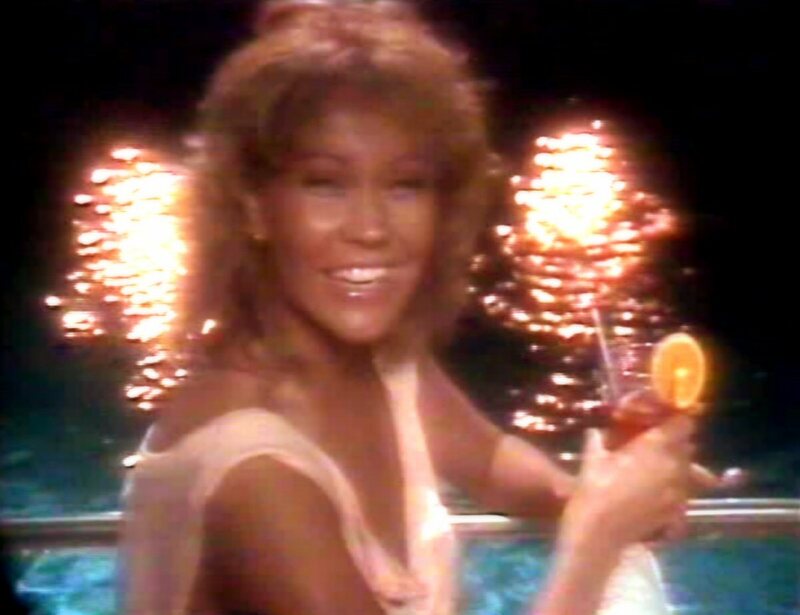 This edit contains extra background voices laughing at the beginning of the song. The same version of the song was featured on the French single released by Vogue. 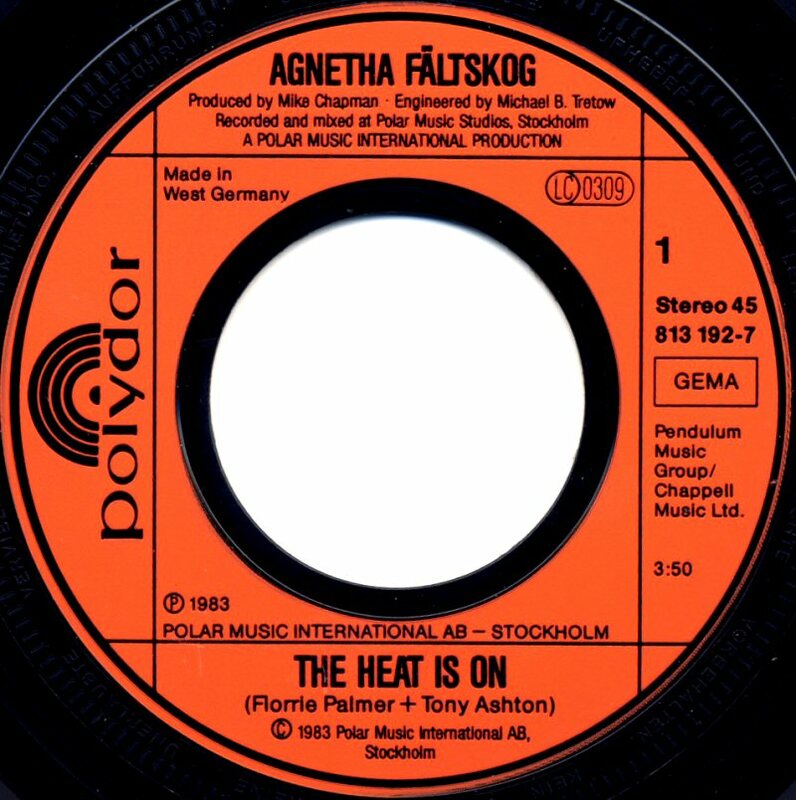 The maxi version of "The Heat is On" extended to 7 minutes and 56 seconds was released in Sweden, West Germany, France and Holland. 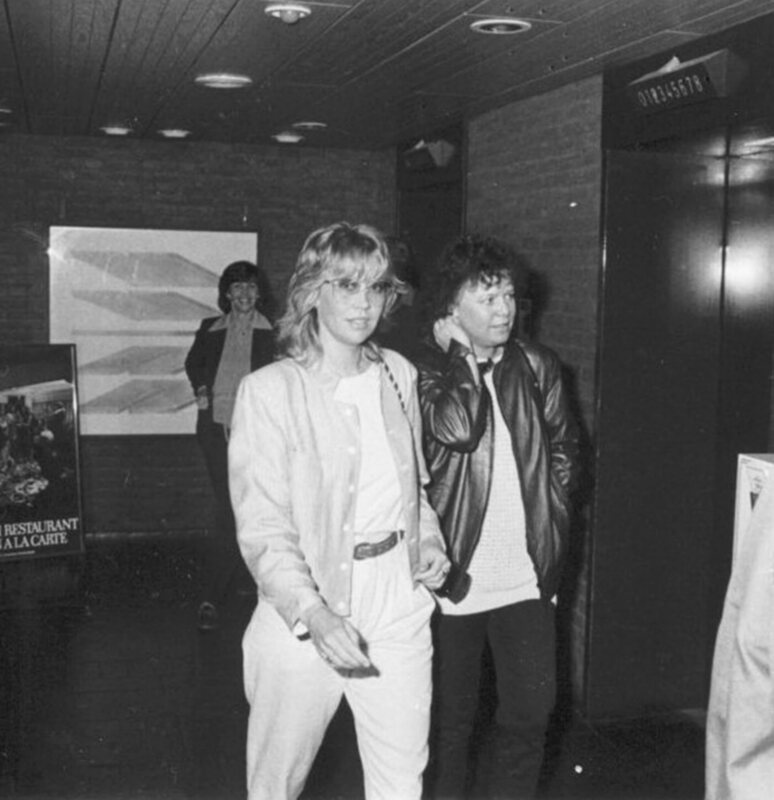 Exclusive photo sessions for the album cover and promotion were arranged in Stockholm in spring 1983. 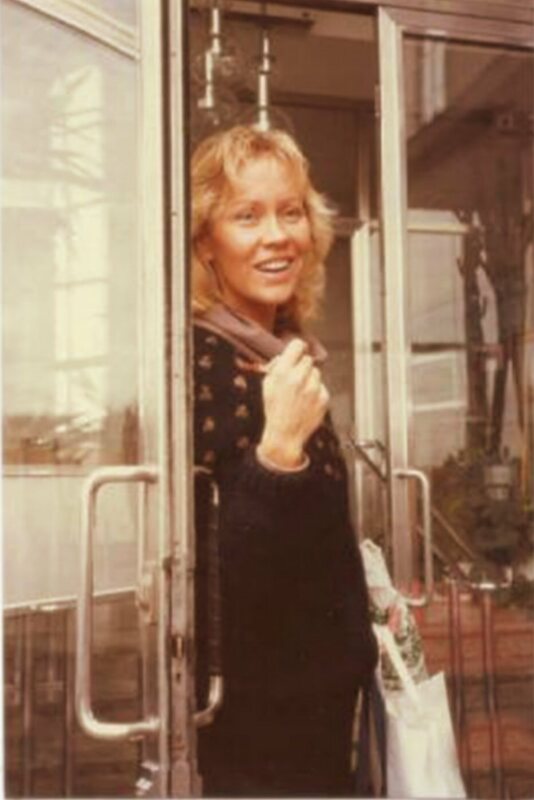 By April the recording sessions for the new album were completed and Agnetha started promotion by talking to the press and traveling around Europe. 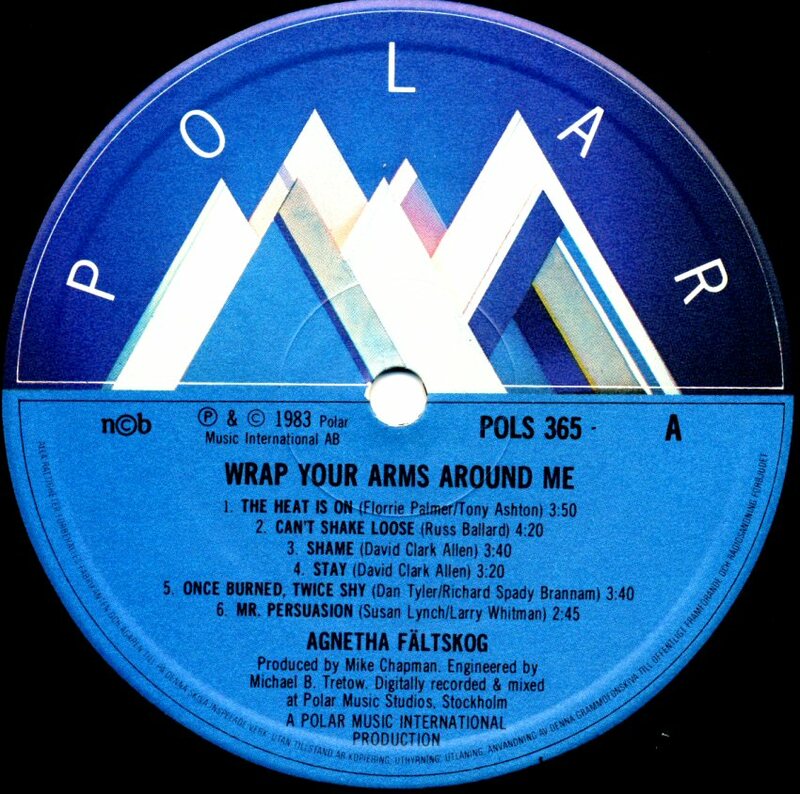 The album "Wrap Your Arms Around Me" was released in May 1983 and contained 12 new songs written by both well-known and totally unknown composers. 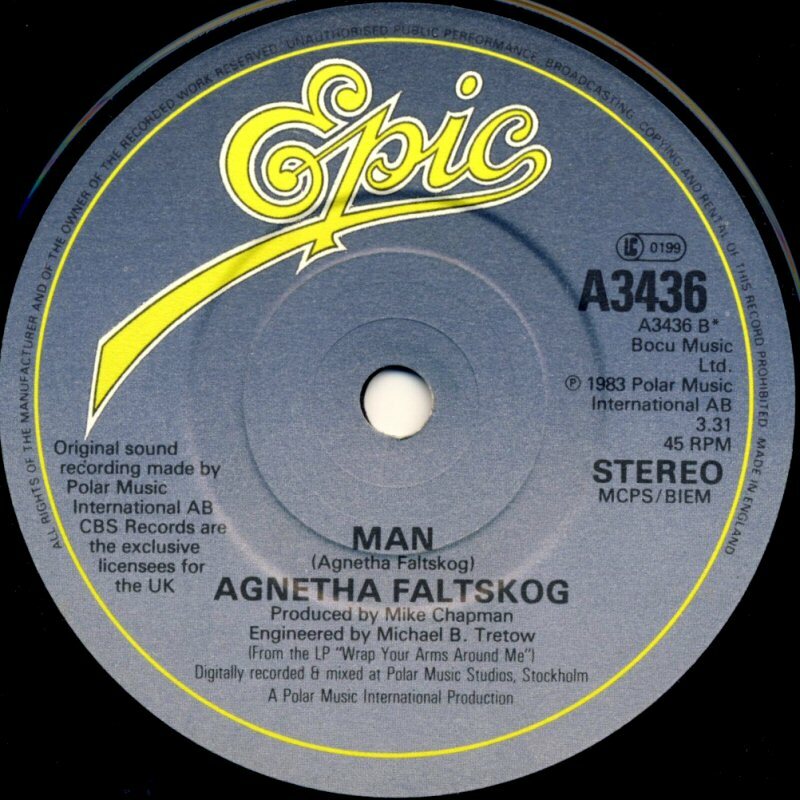 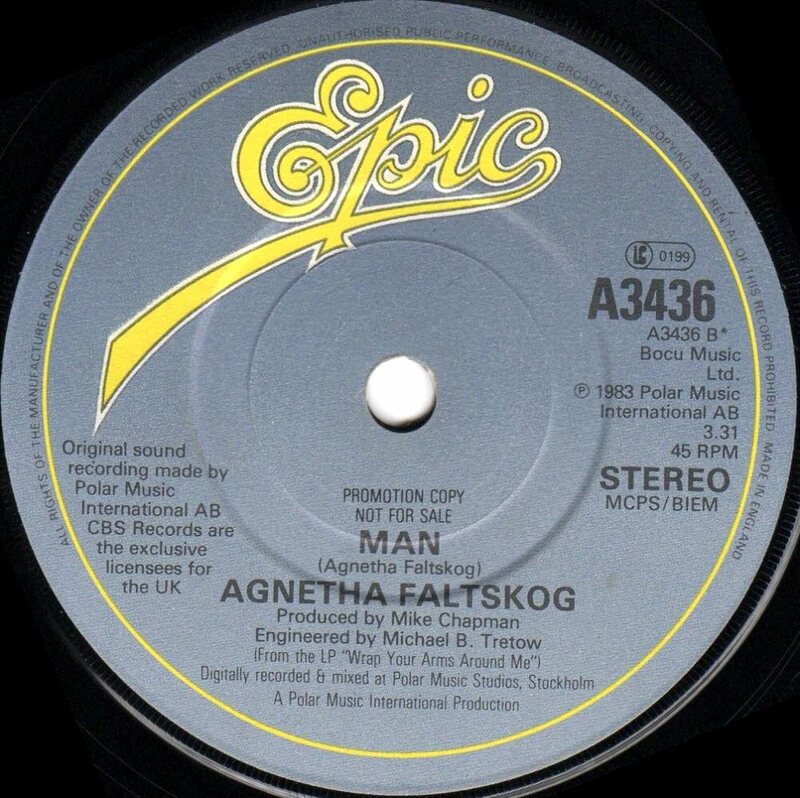 Even Agnetha herself contributed with one track - one of the best on the album entitled "Man". 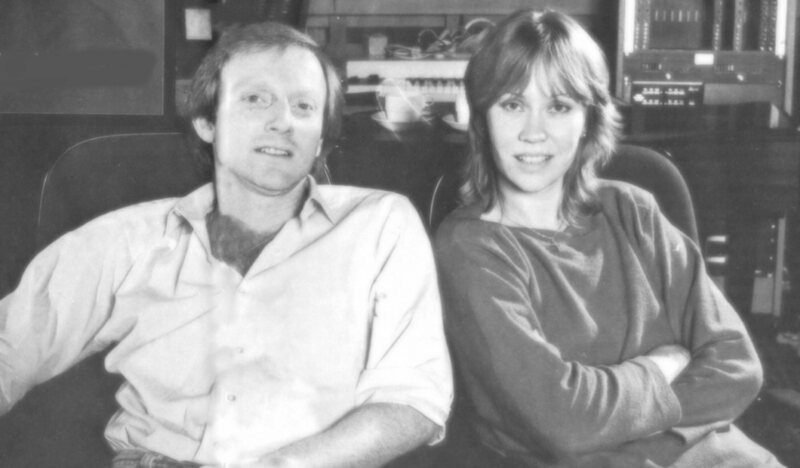 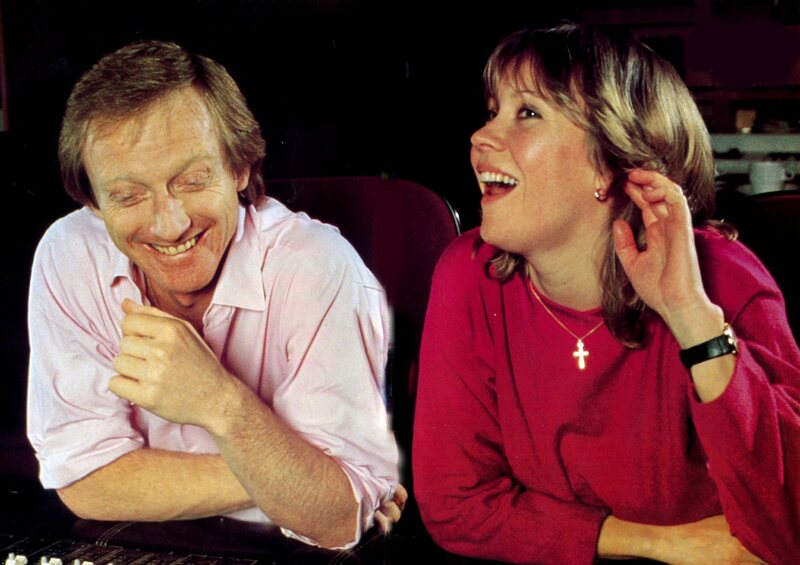 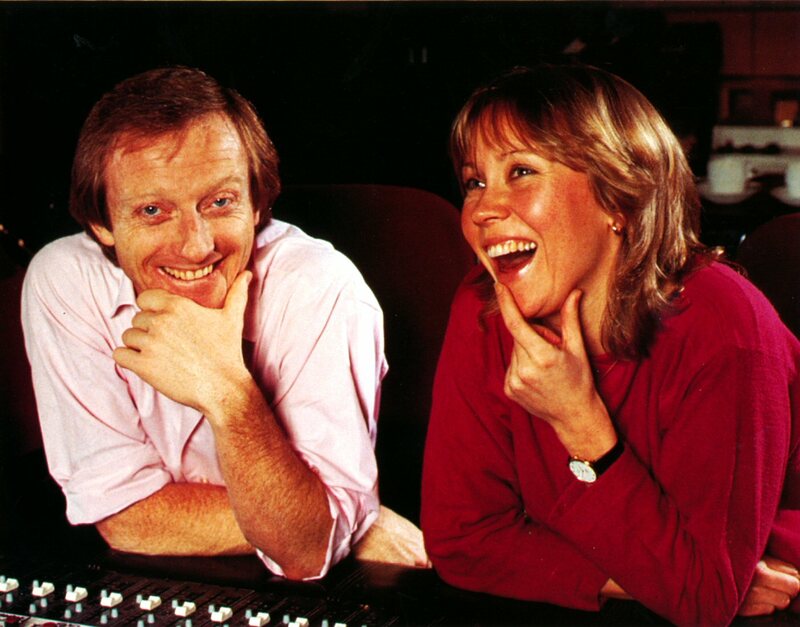 The beautiful title track was written by the producer Mike Chapman together with Holly Knight. 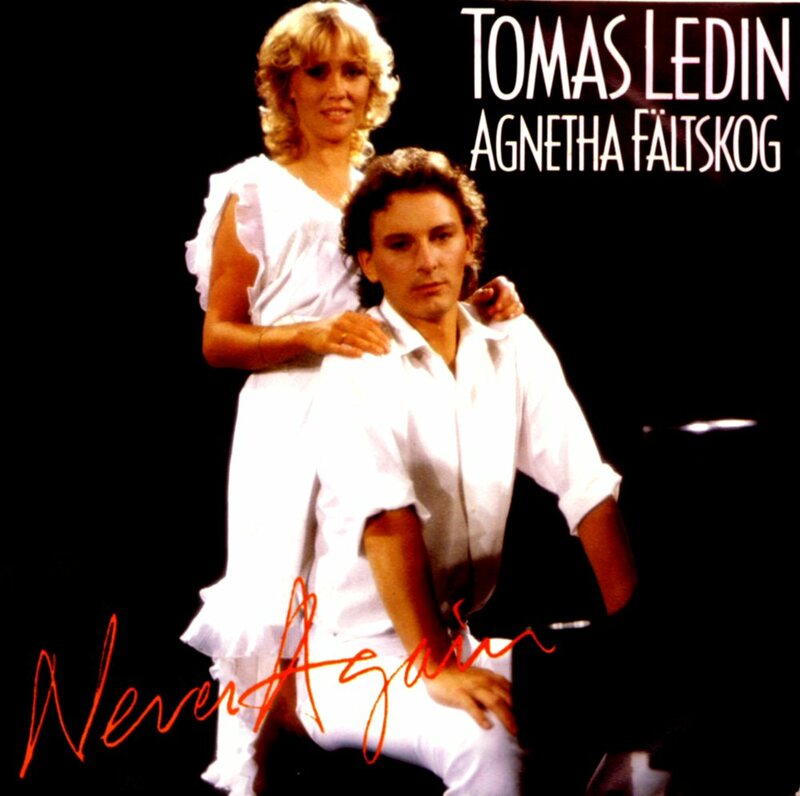 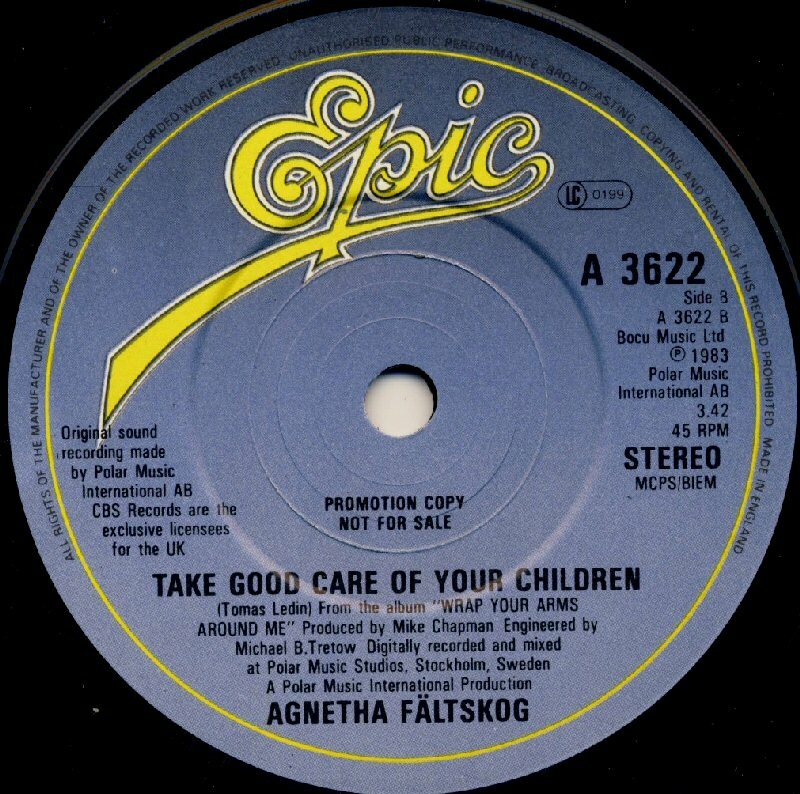 Tomas Ledin had written one song for Agnetha "Take Good Care of Your Children". 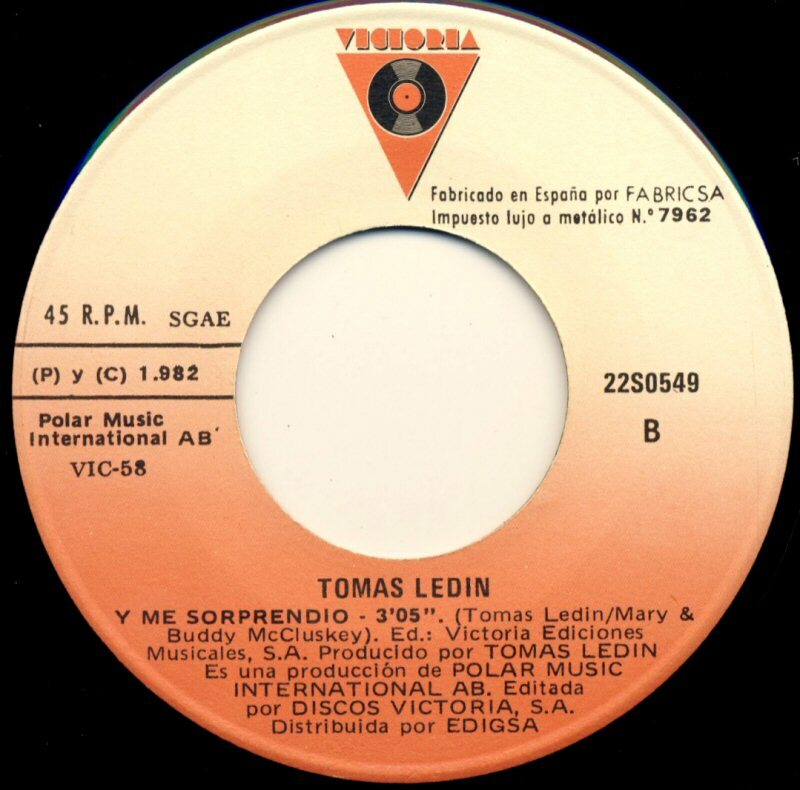 The album was even released in several Spanish language countries. 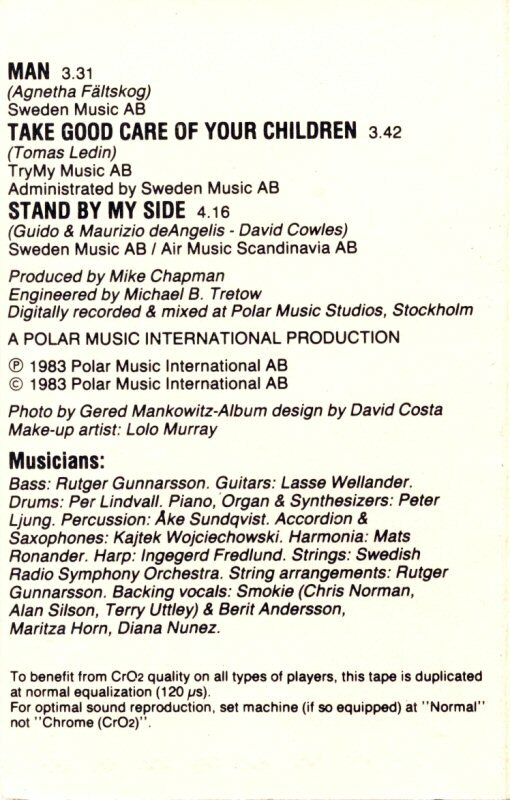 The back cover was partly redone as the Spanish translations of all the track titles were added. 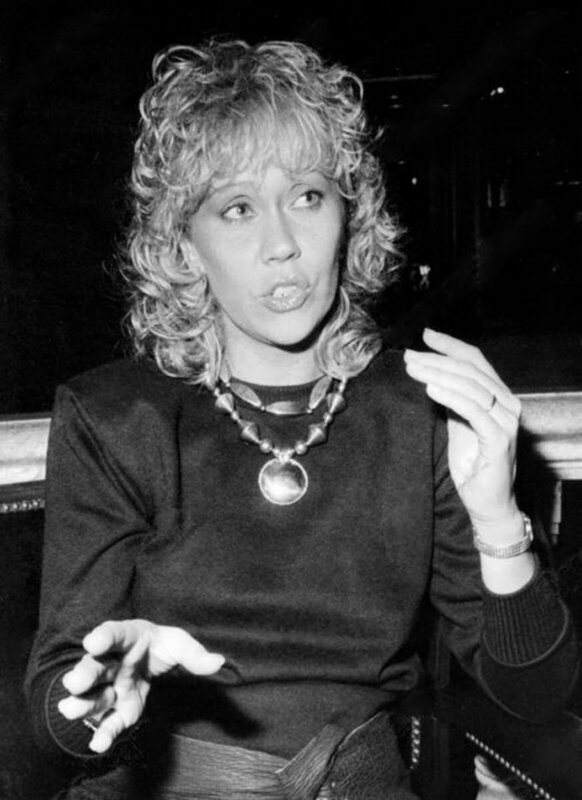 Agnetha did not re-record any track in Spanish though. 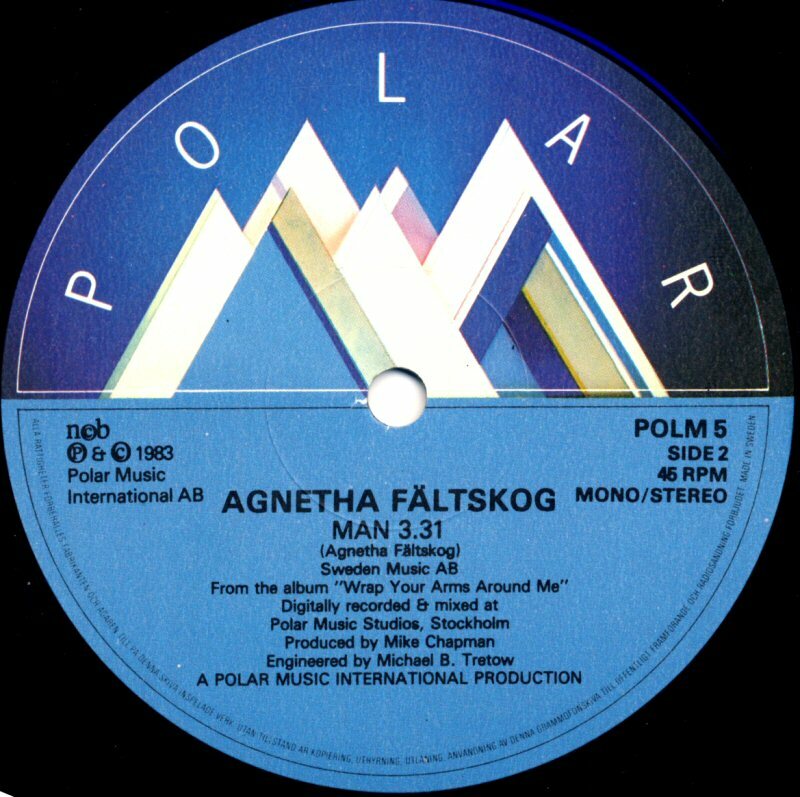 The album entered the Swedish LP chart in the second week of June 1983 directly on #1. 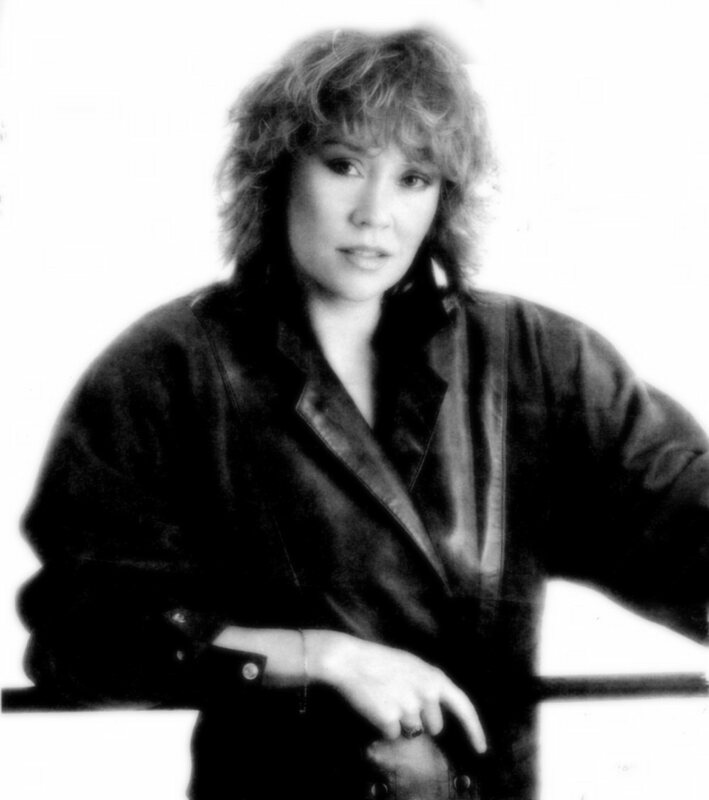 It was released as LP, MC and later as CD. The album "Wrap Your Arms Around Me" became a huge success in Norway where it entered the LP chart on June 9th, 1983 and stayed there for 18 weeks reaching #1 (for 5 weeks). 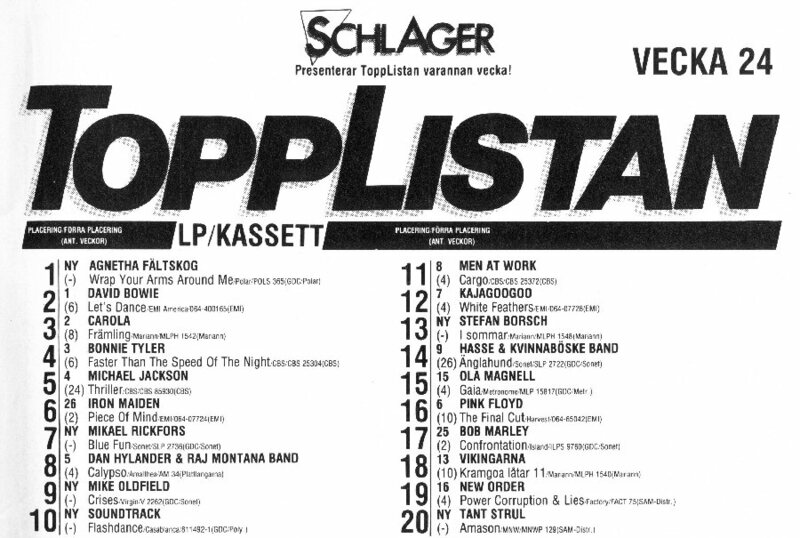 In Finland the album stayed on the chart for 3 weeks peaking at #4. 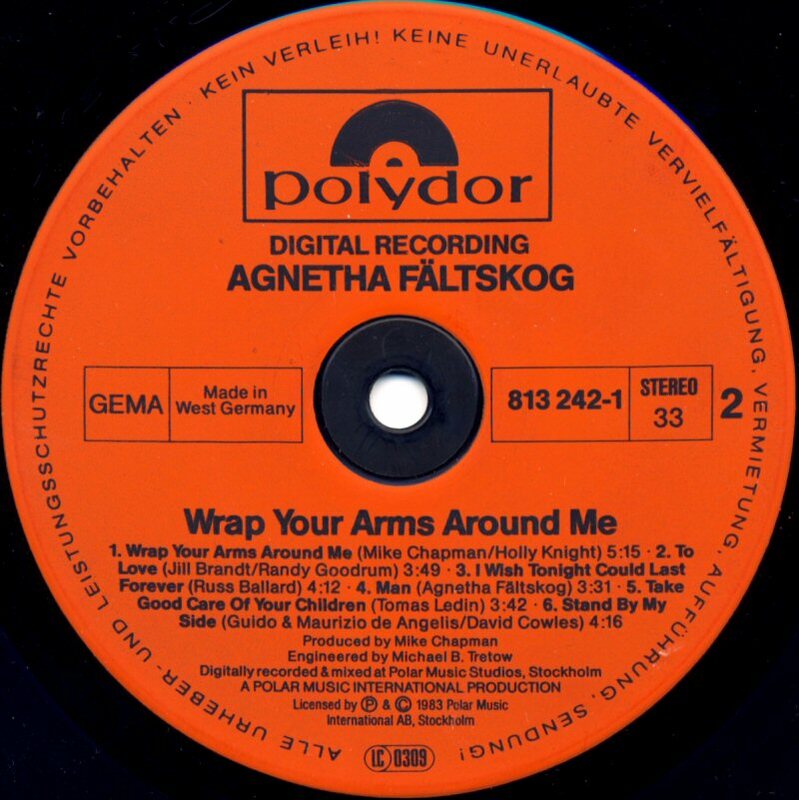 In West Germany the album "Wrap Your Arms Around Me" stayed on the LP chart for 26 weeks reaching #13. 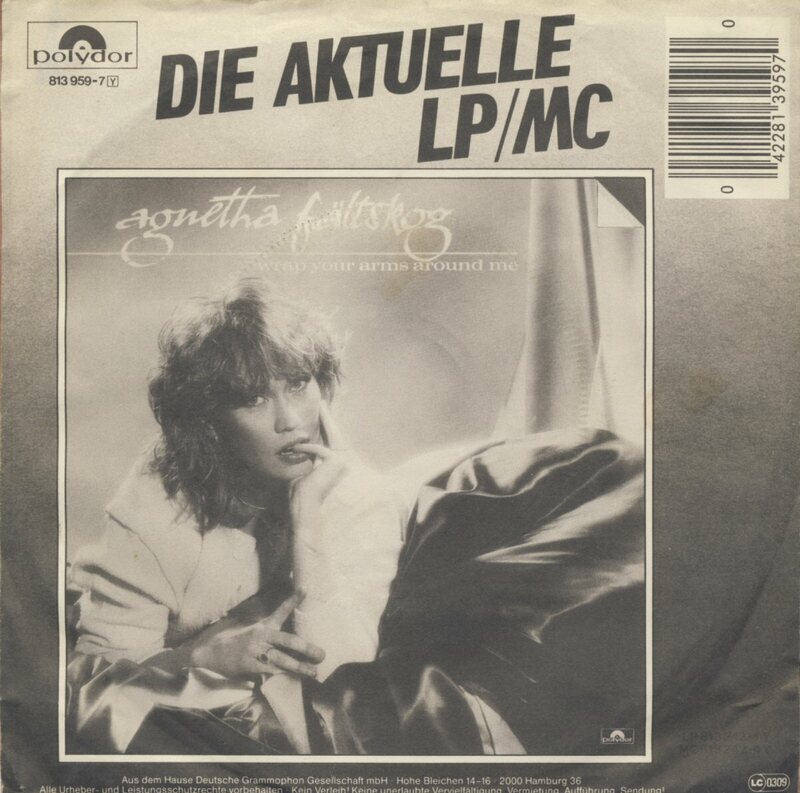 The Club-edition of the album in West Germany. 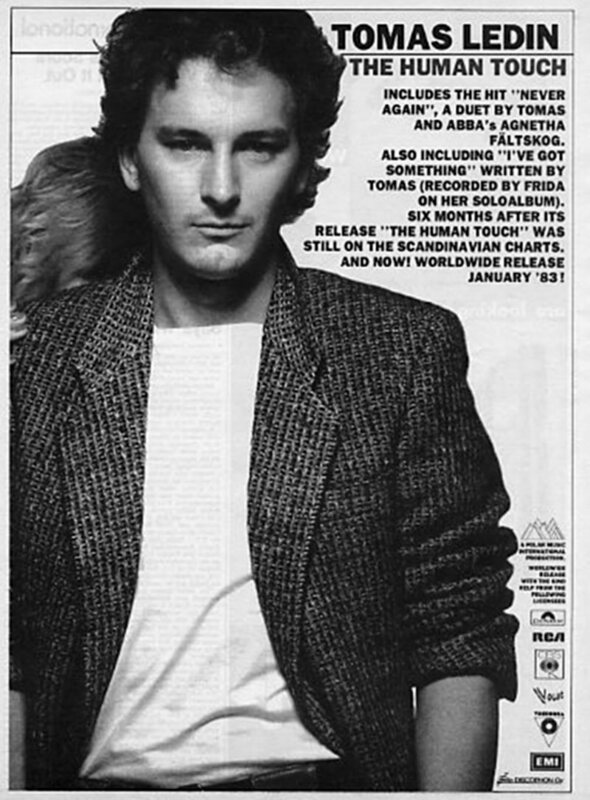 In the UK the album entered the chart on June 11th, 1983 and stayed there for 13 weeks peaking at #18. 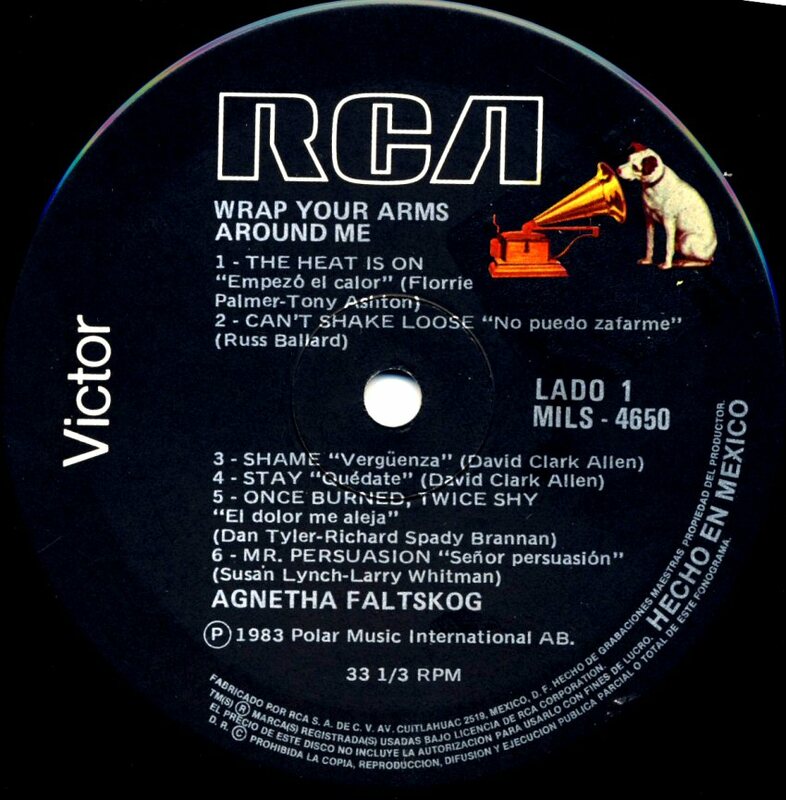 "Wrap Your Arms Around Me" saw its release even in USA (in September 1983), Mexico and South America. 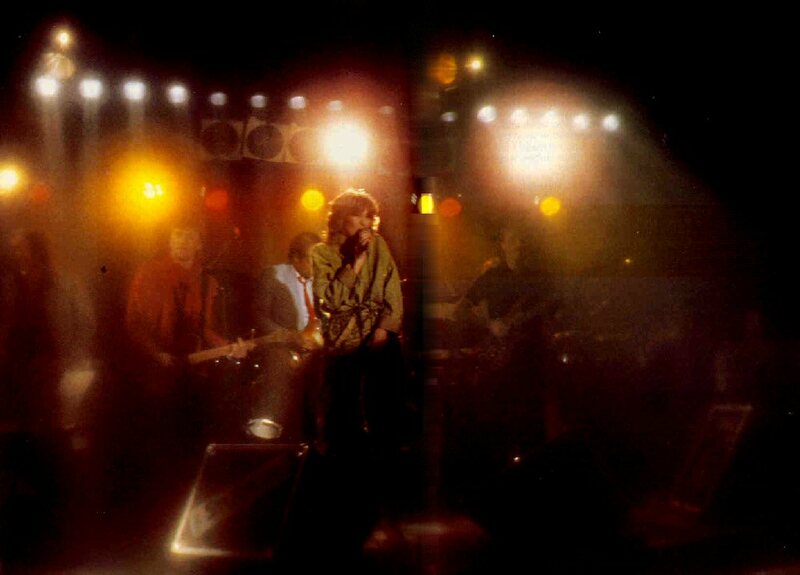 In France the album entered the LP chart in December 1983 peaking at #47. 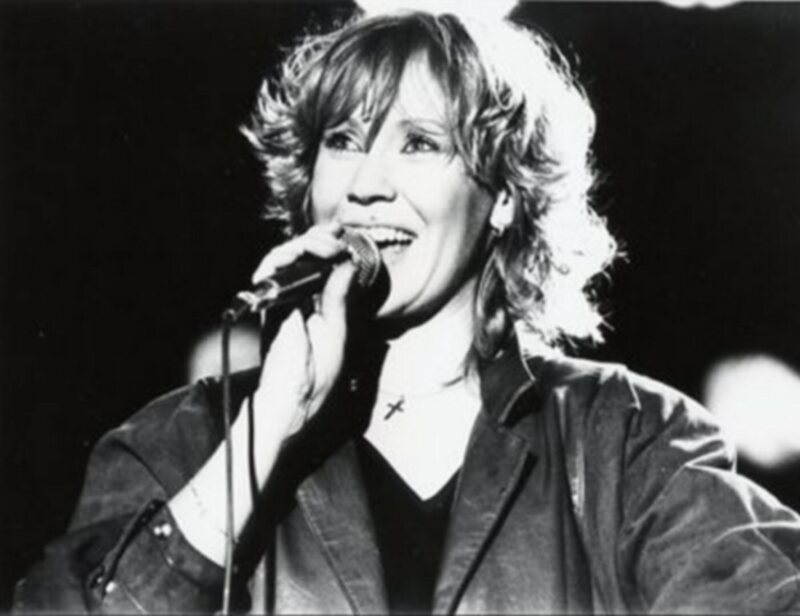 Polish record company Tonpress released the album in 1988. 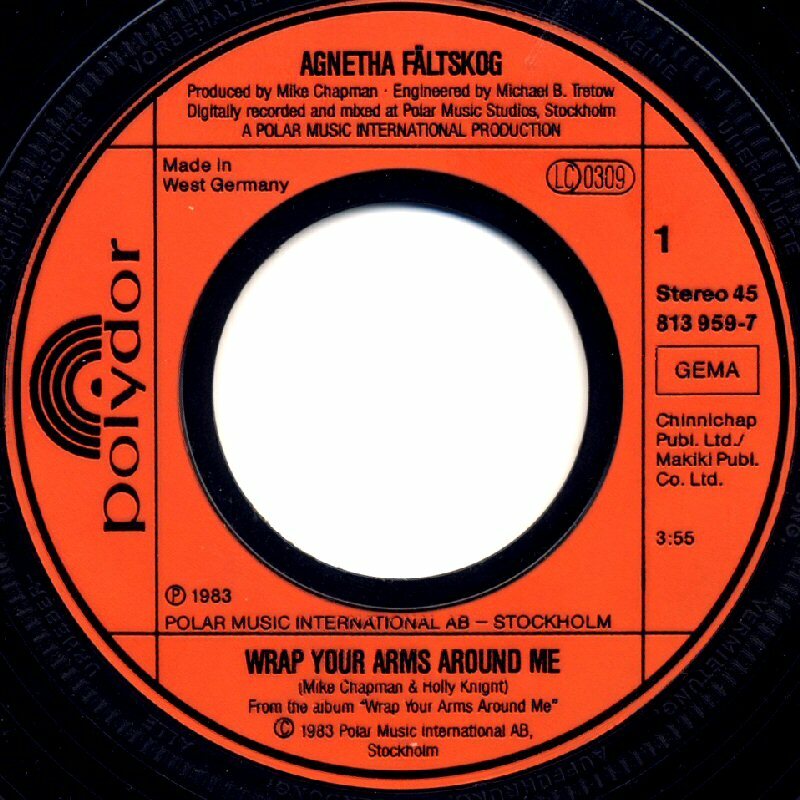 The article/interview for the Swedish weekly "Allers" was done at the beginning of May - 2 days after the release of the album "Wrap Your Arms Around Me" in Sweden. 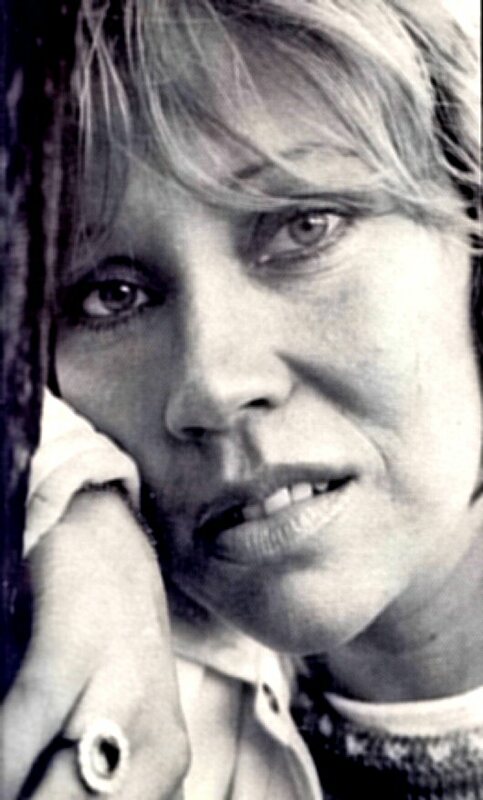 The article summed up Agnetha's career up-to-date. 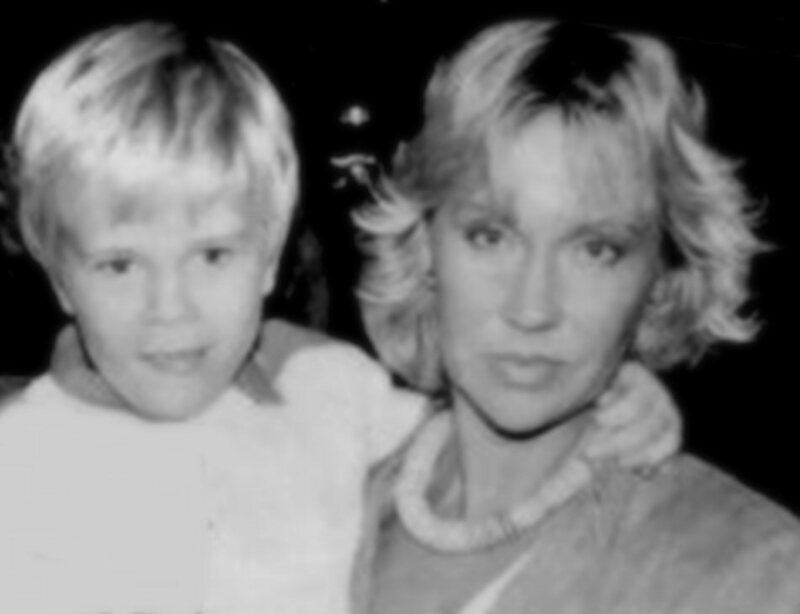 Most of it was about Agnetha as a child and her musical talents. 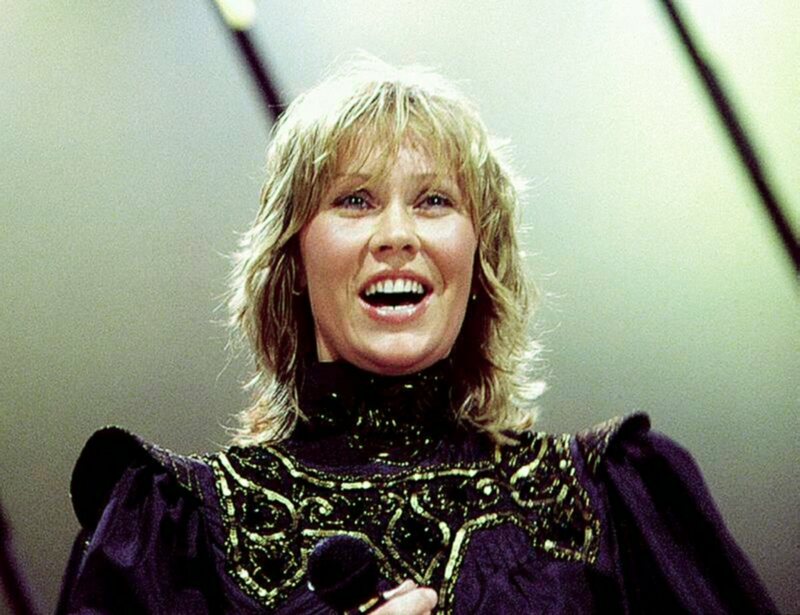 The interview was about the new album but even about life, ABBA and emigration. 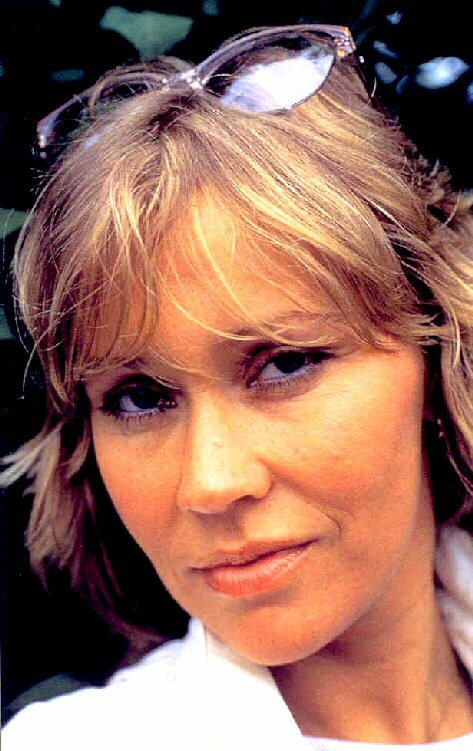 Agnetha answered all questions without any problems as usual. 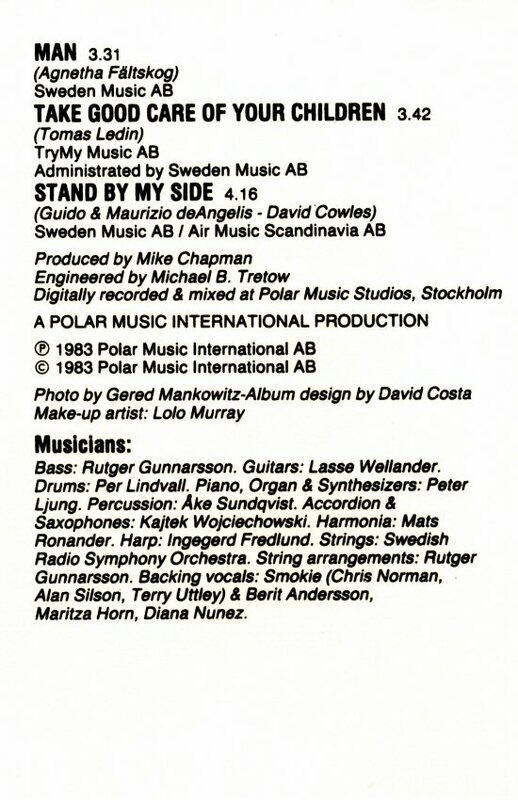 The interview was done at the Björn and Benny's musical room at Polar Music head quarter at Hamngatan 11 in Stockholm. 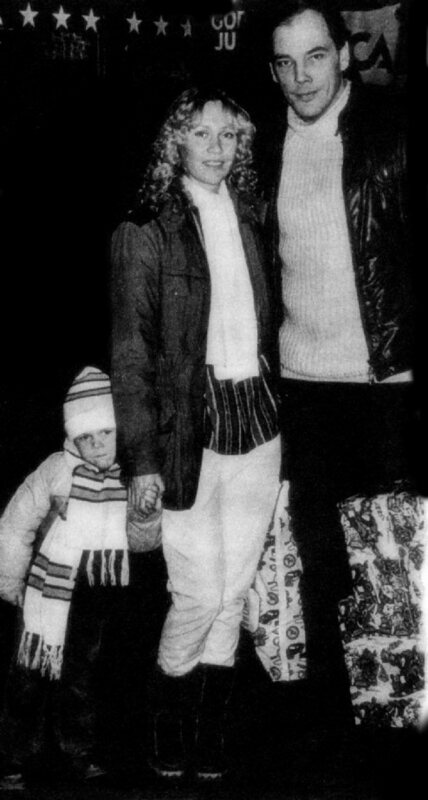 Several nice pictures were taken outside Polar in Berzelii Park. 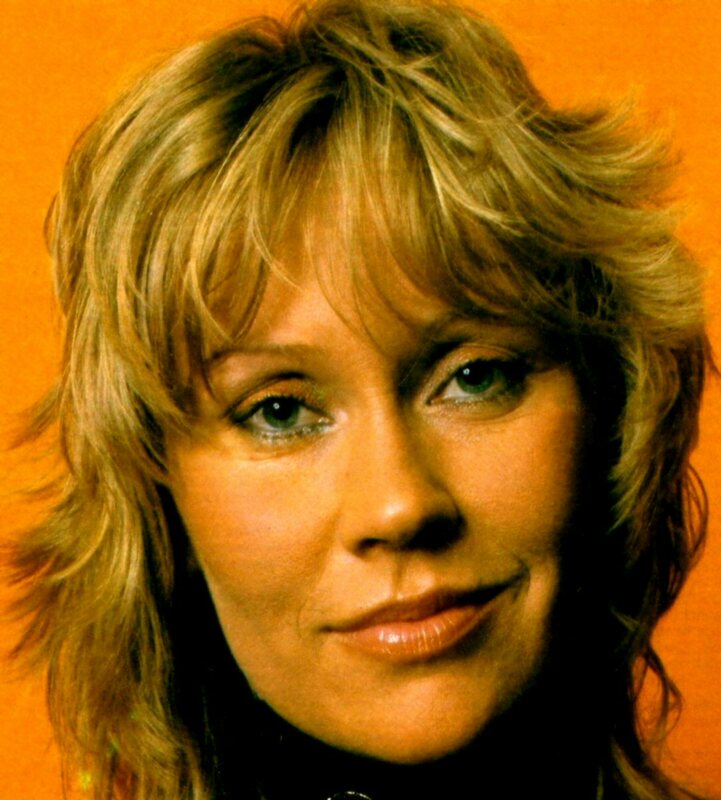 At that time Agnetha thought that she would do more film in the future but it would never become real after "Raskenstam". 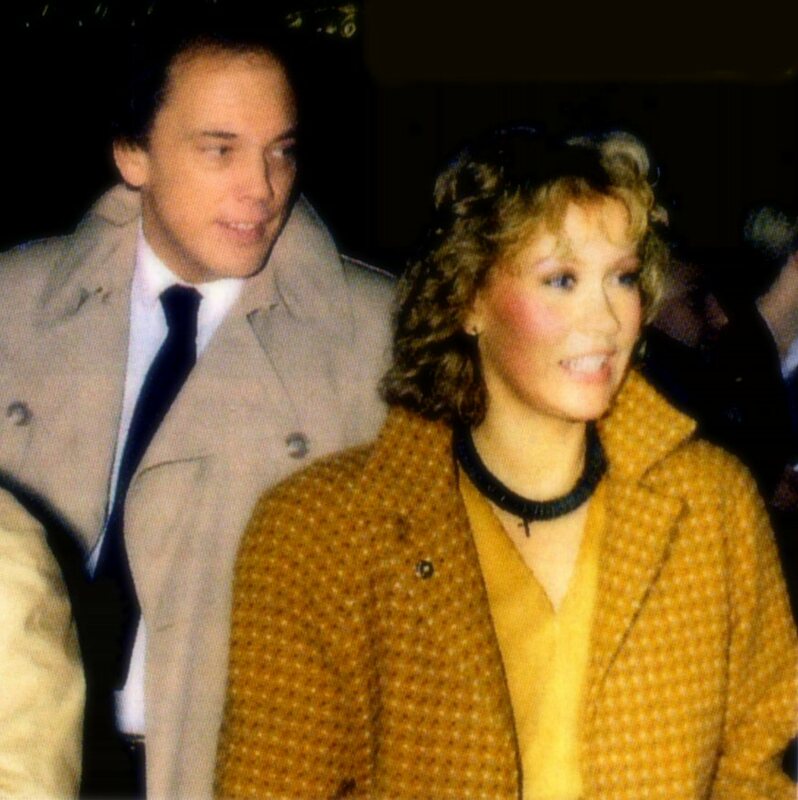 During this period there were several rumours about her possible participation in the US series "Dallas". 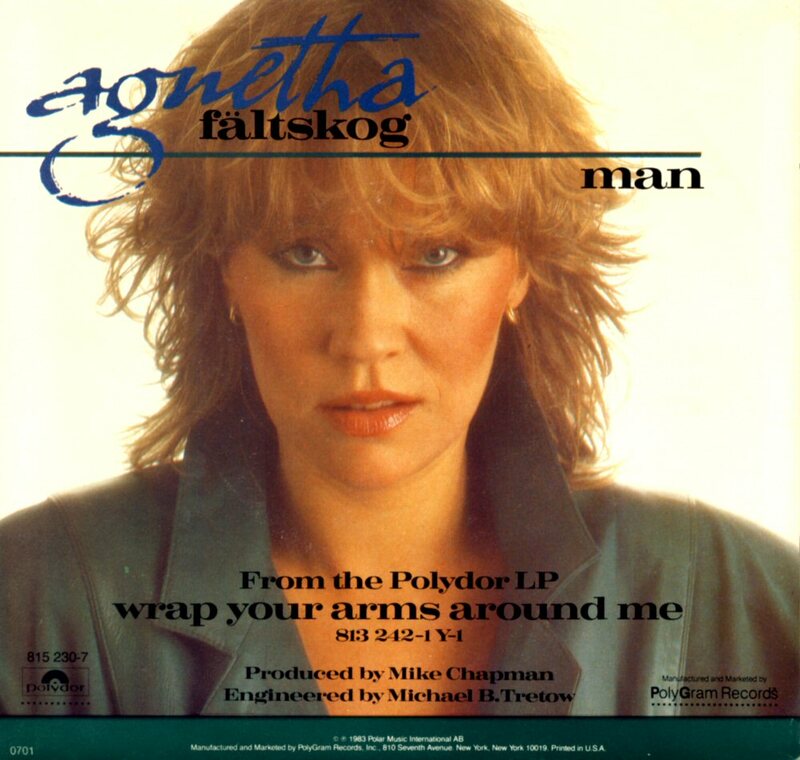 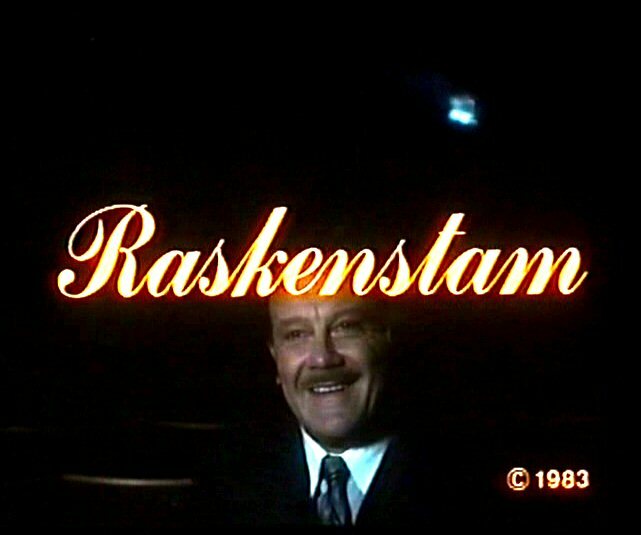 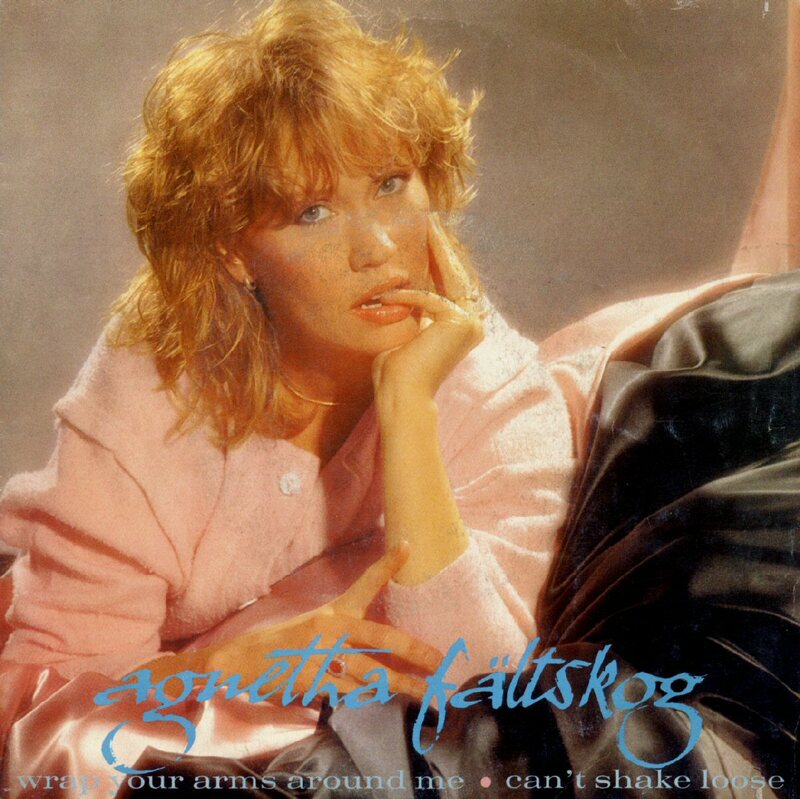 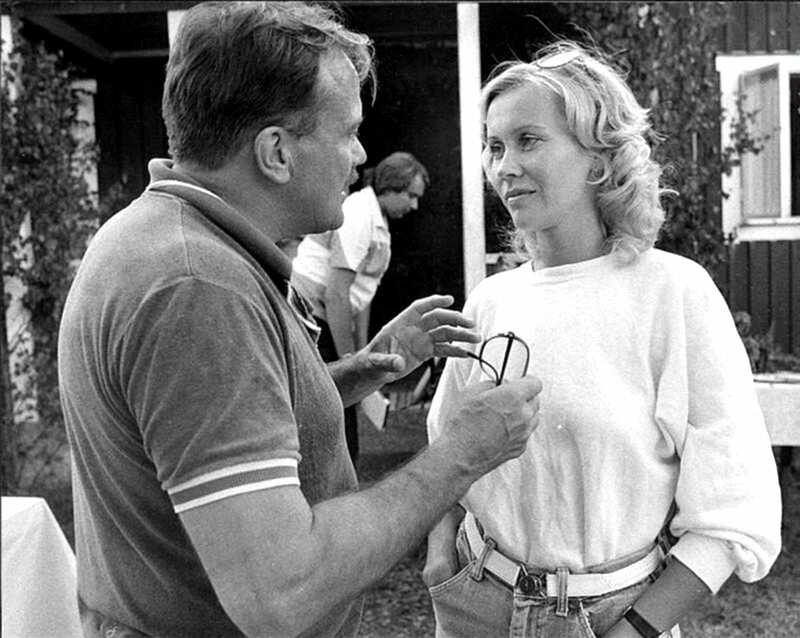 Some parts of "Dallas" were directed by Gunnar Hellström who even directed "Raskenstam" and who was a big fan of Agnetha Fältskog as an actress. 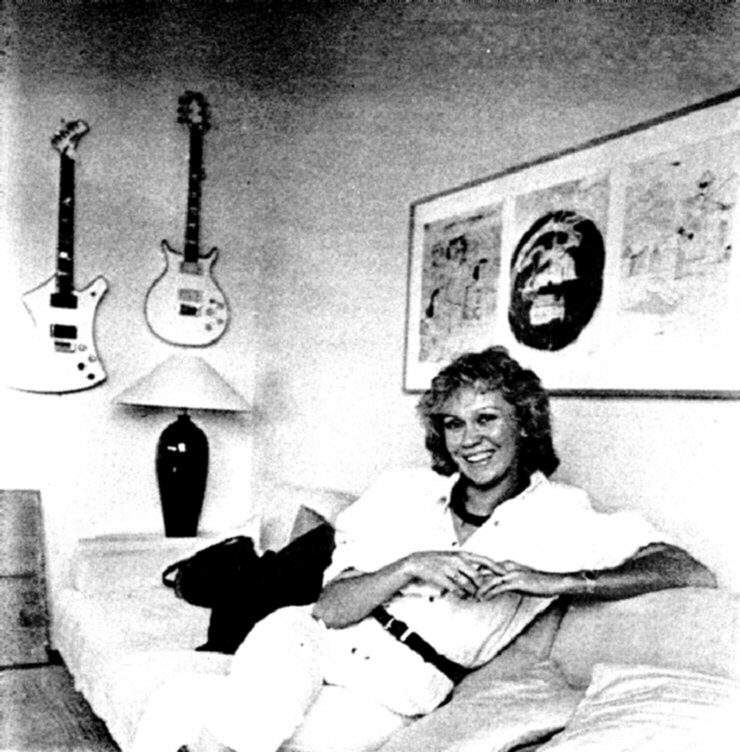 The interview was published in "Allers" number 28 on July 11, 1983. 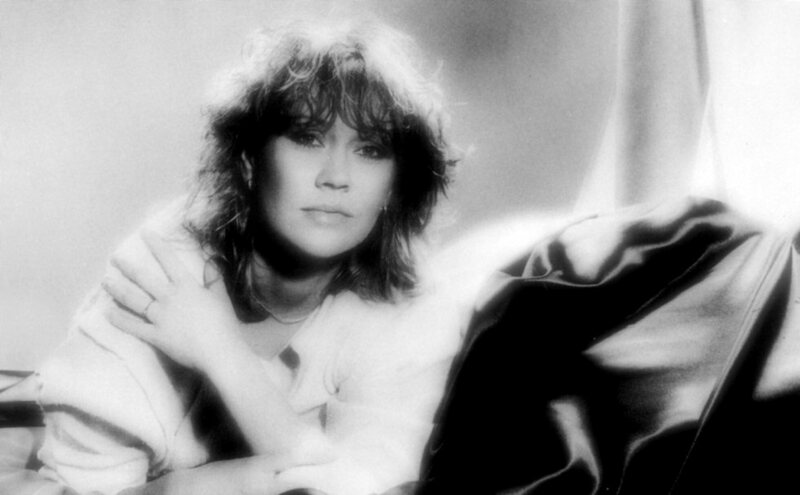 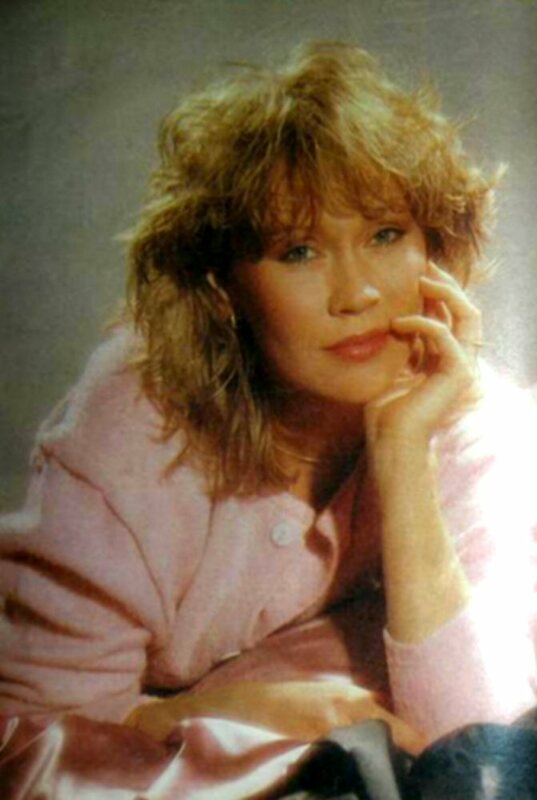 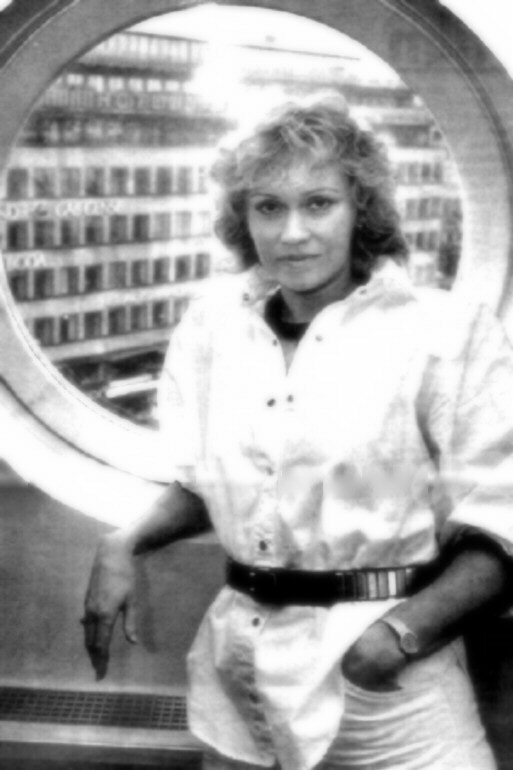 In May 1983 the Swedish music newspaper "Schlager" published a long interview with the singer. 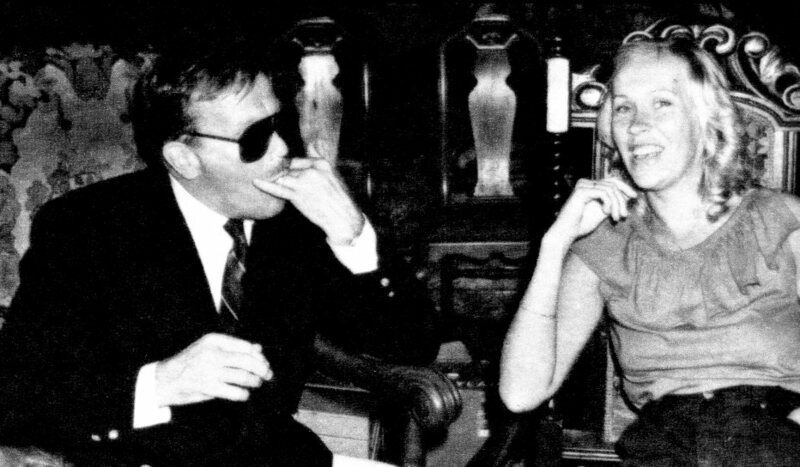 Here are the most interesting excerpts. 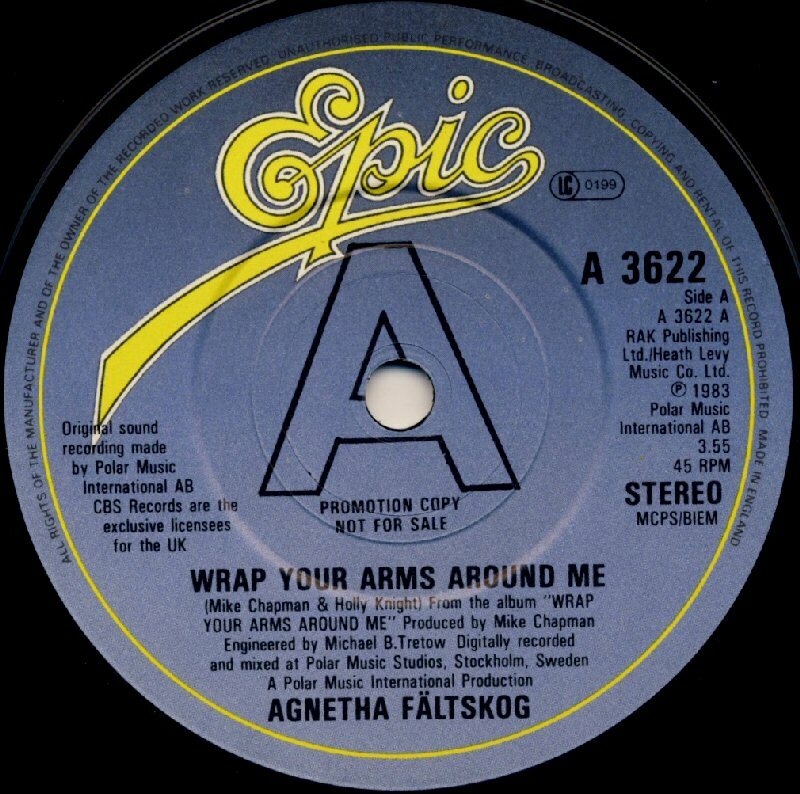 Does "Wrap Your Arms Around Me" shows a new side of you that we could not see when you were in ABBA? 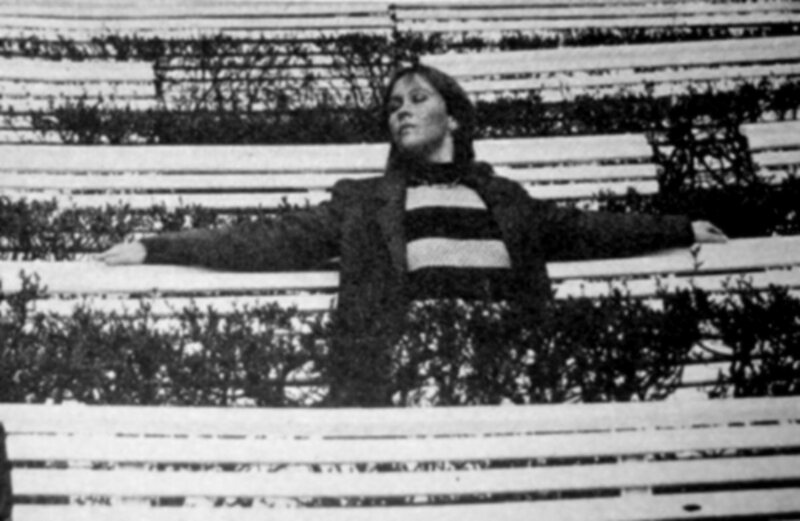 AF: The only thing I can say is that to work solo gives you more freedom. 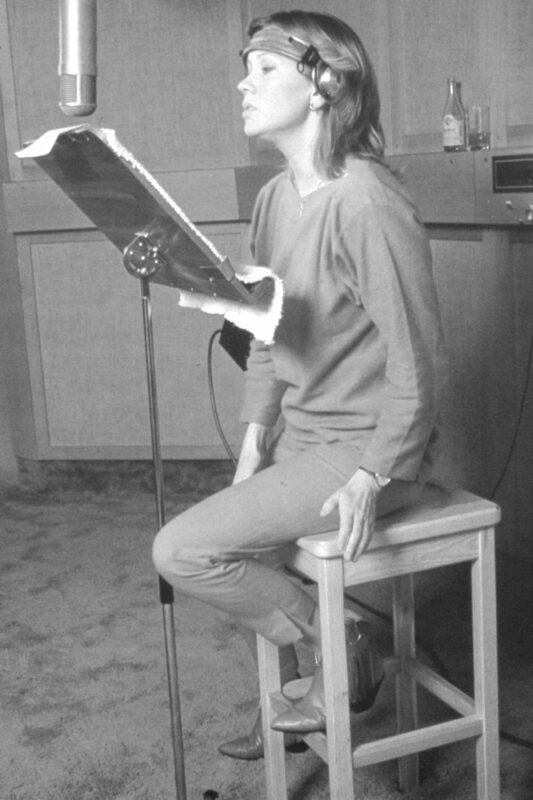 And... you can sing in many ways. 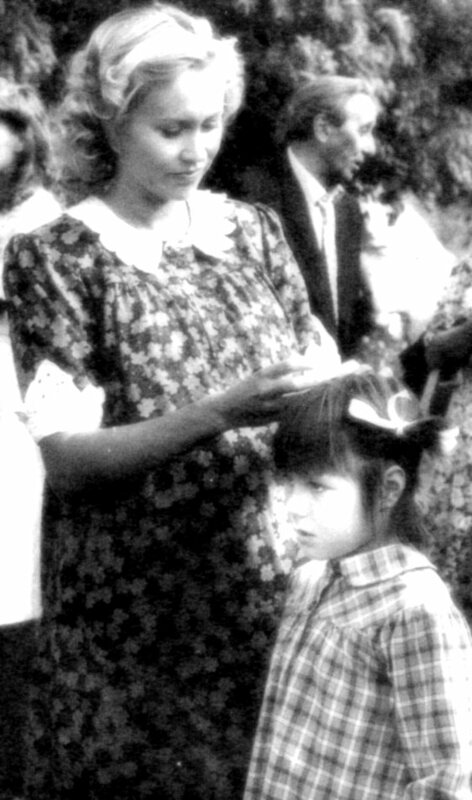 When we worked in a group I had to compromise a lot as both Frida and I must get our parts. 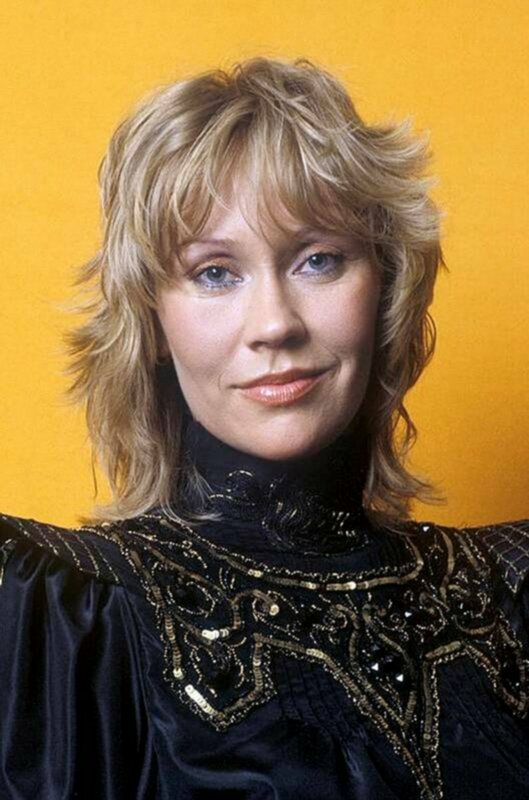 And we had to think about the ABBA sound all the time. 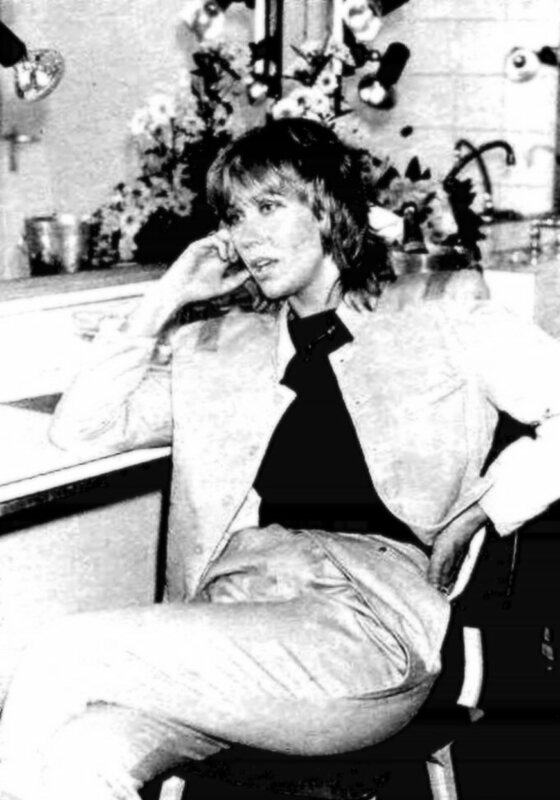 How did you choose the songs for the album? 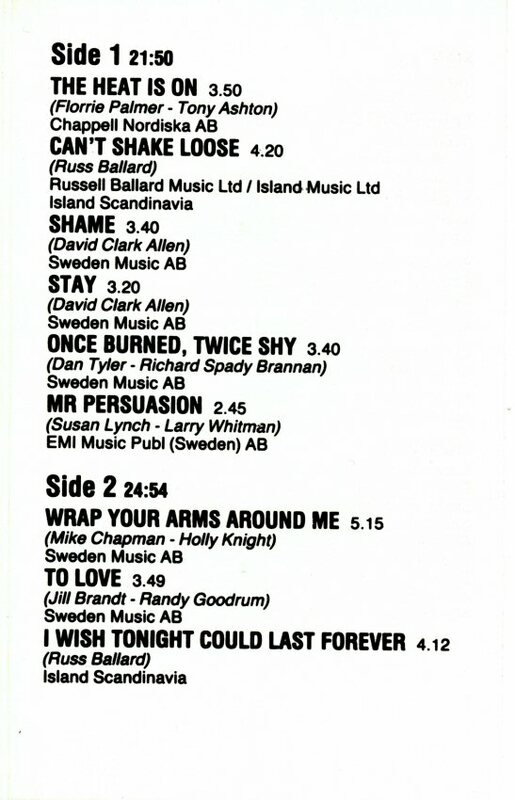 AF: It was me, Mike Chapman and Stikkan Anderson a little bit who have chosen the songs. 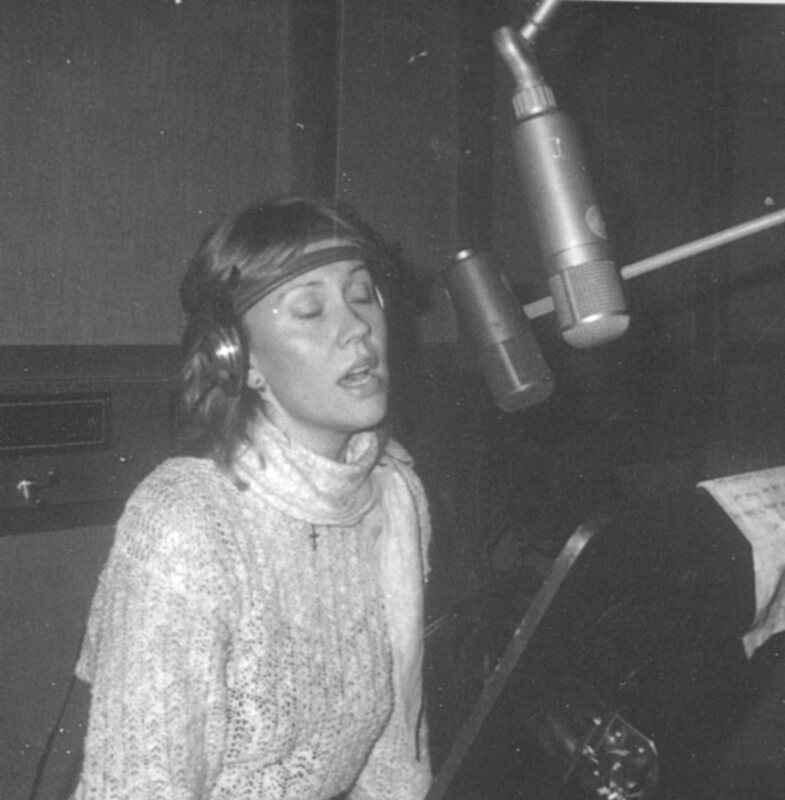 We started listen to demos very early in the autumn last year. 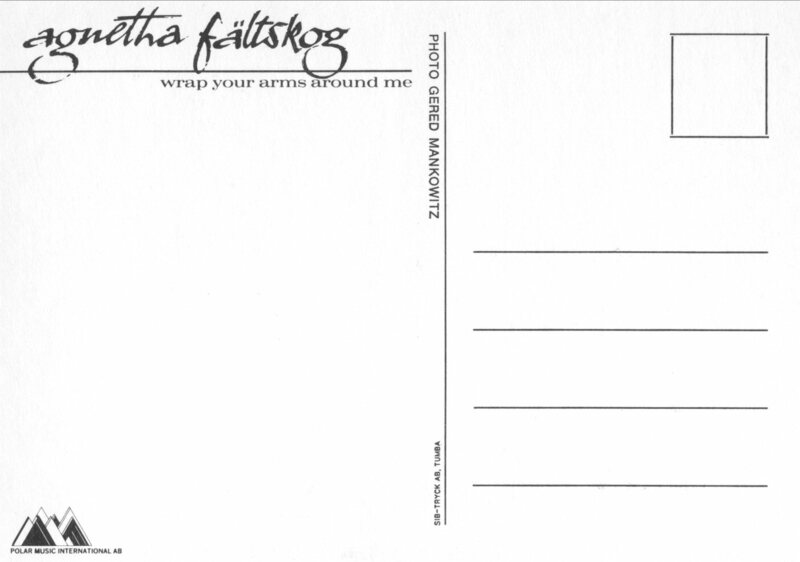 We have received cassettes from all over the world. 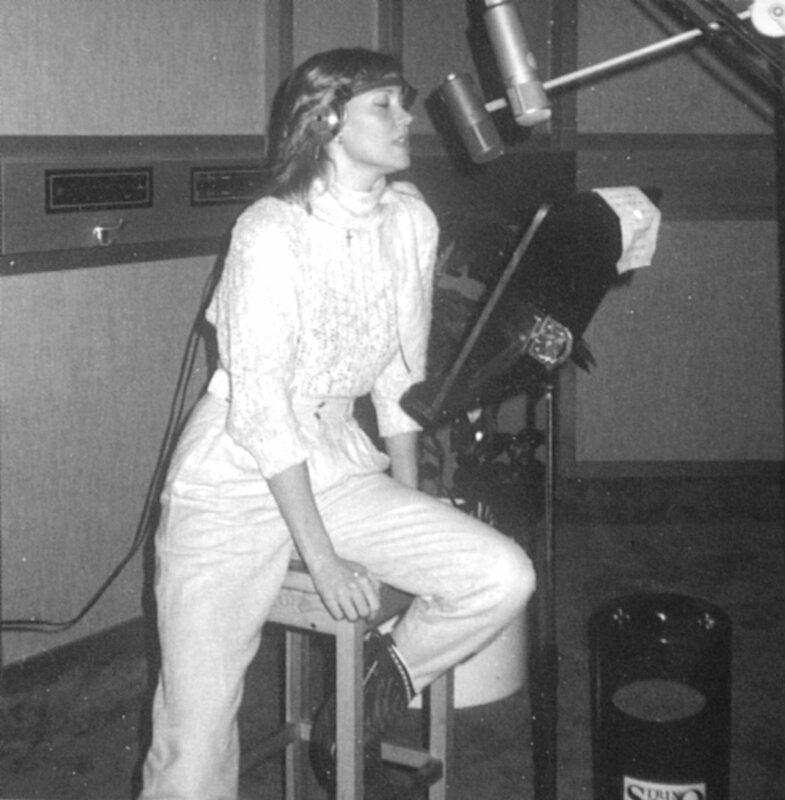 We chose 20 songs, then we recorded 15 backgrounds and finally we had 12 songs for release. 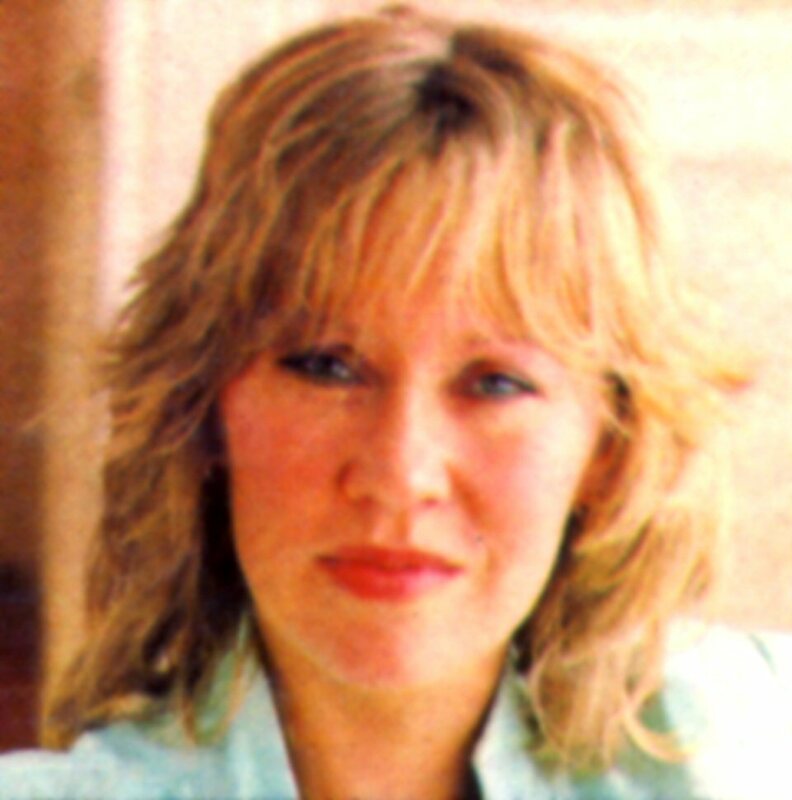 How much are you interested in the promotional work? 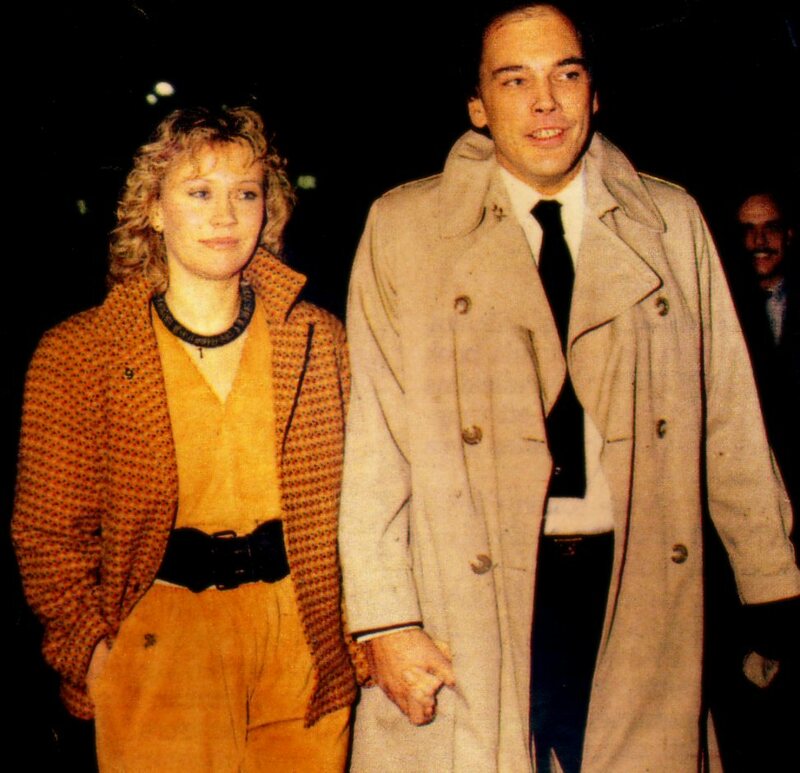 AF: I participated in all PR work. At the beginning I thought that it would be enough with the name "Agnetha" only on the cover. 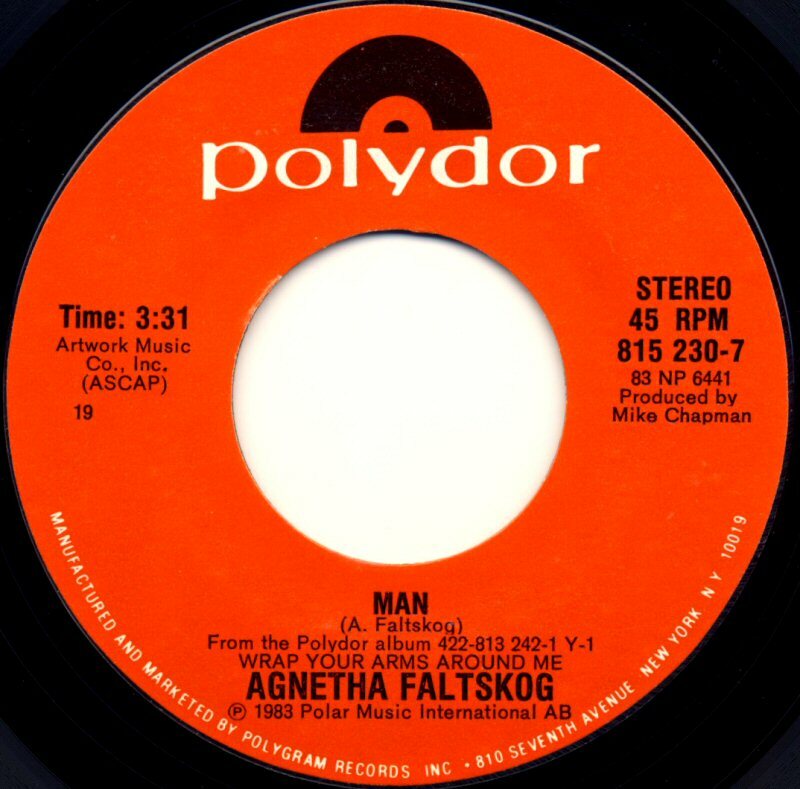 But when I saw the demo of the cover with only my first name I wanted to have even my surname. 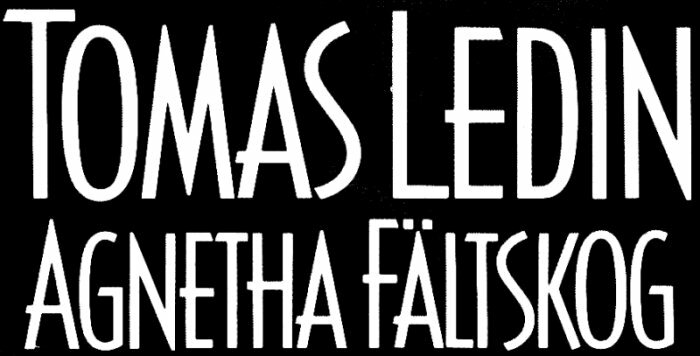 People from Germany called and said that my surname is so difficult to pronounce. 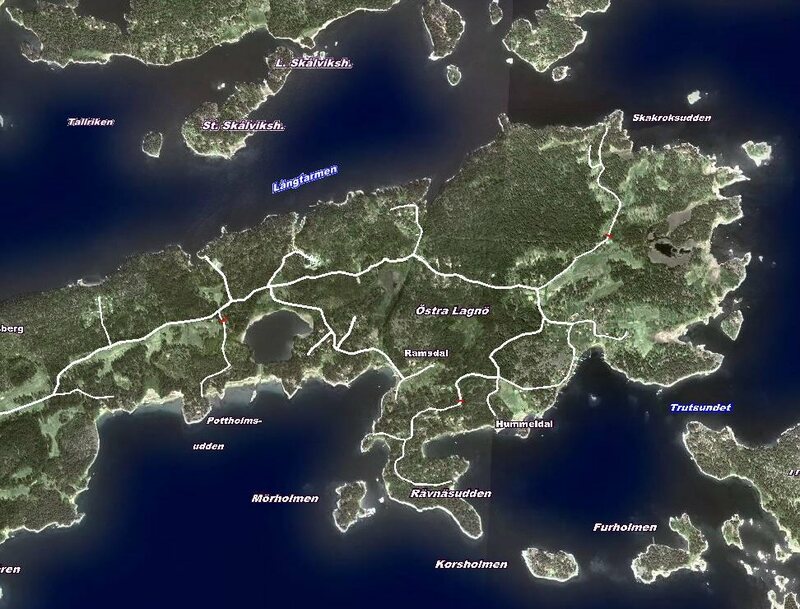 There have been many discussions about it. 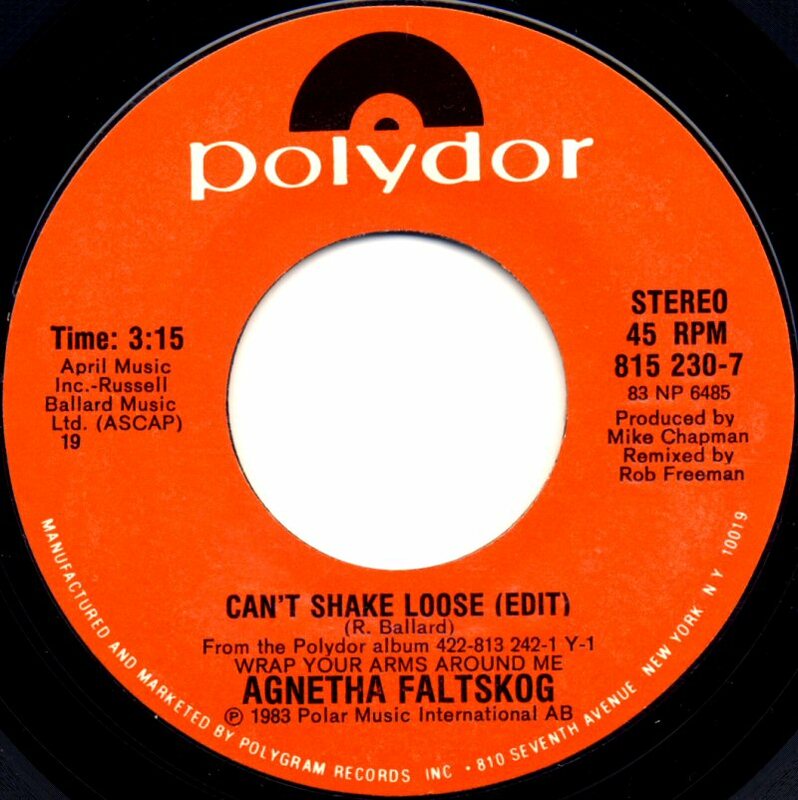 They said that DJs won't play the single because of the name. 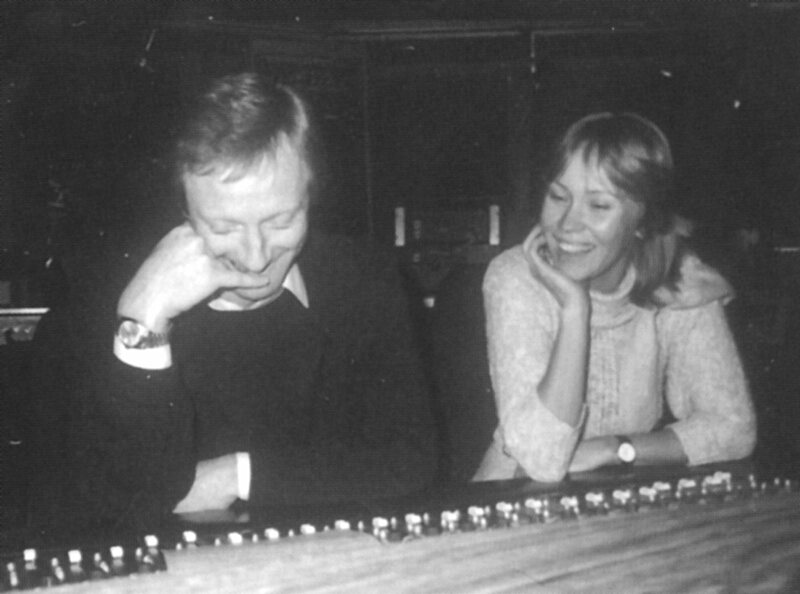 Have you ever written a song for ABBA? 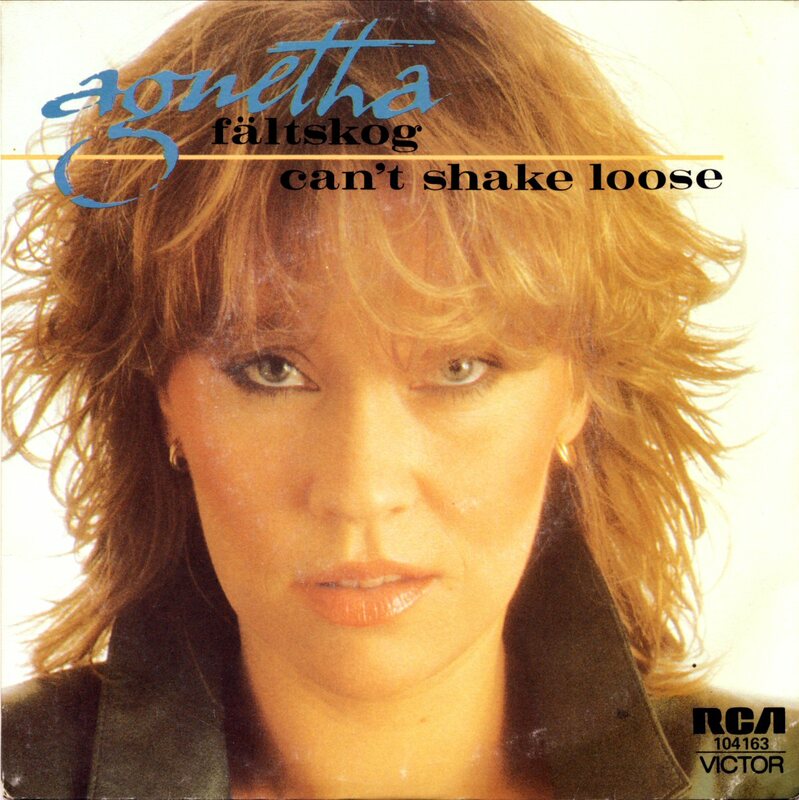 AF: The boys asked me many times about it but... 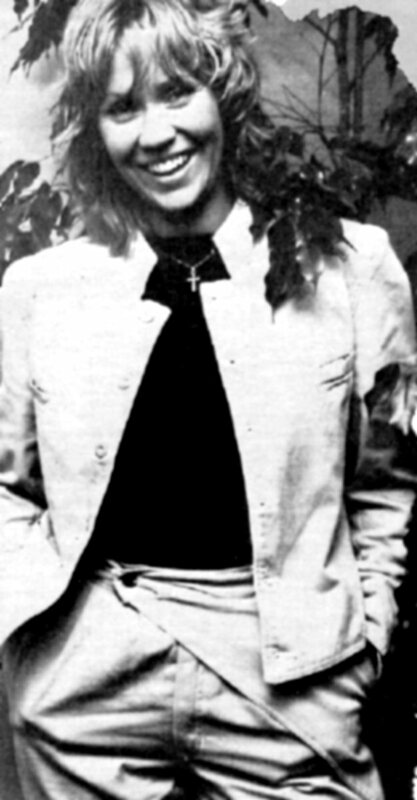 I don't know. 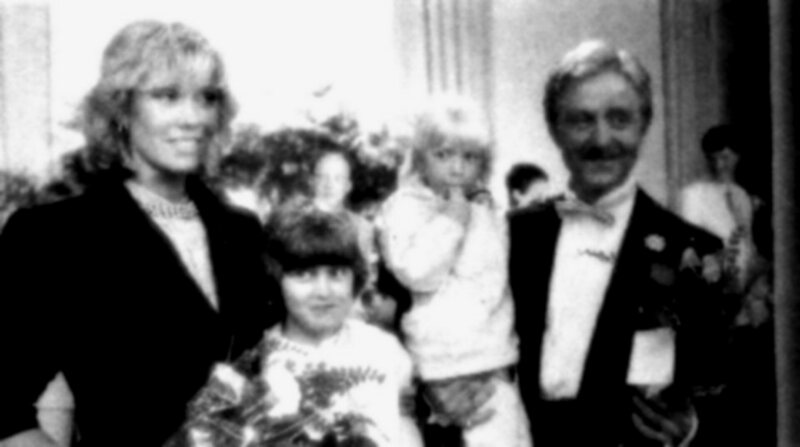 It did not happen. 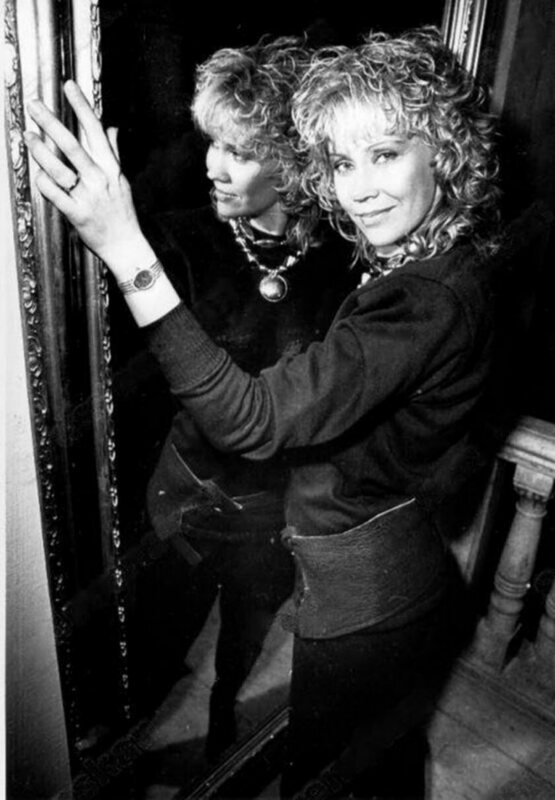 The only one from me was a song on the first LP "Ring Ring". 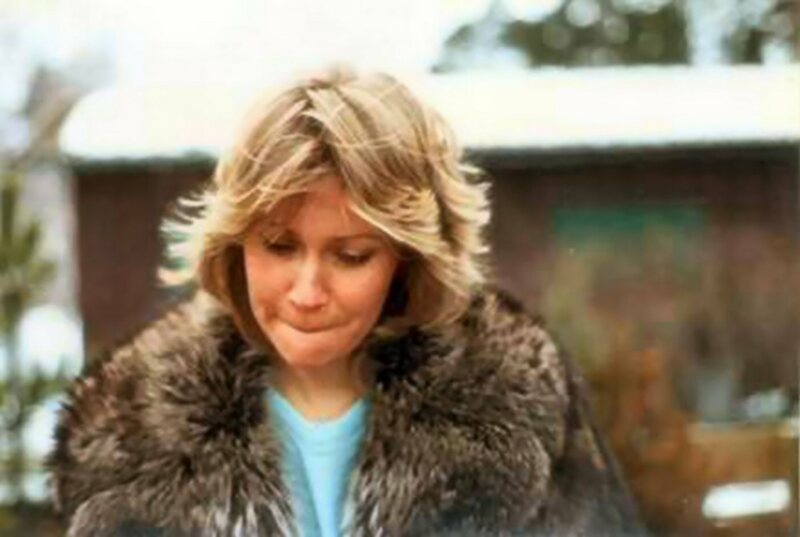 Which image is your right one? 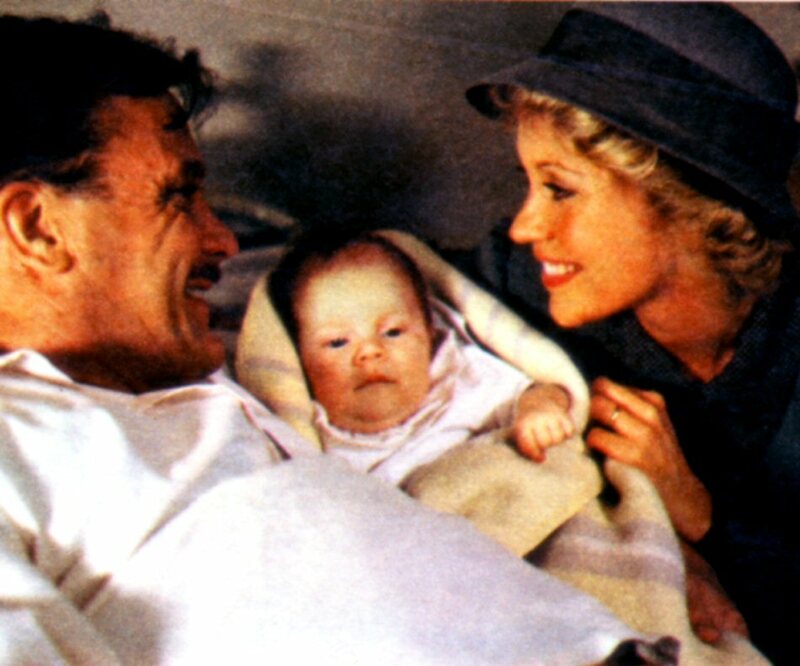 AF: What shall I say? 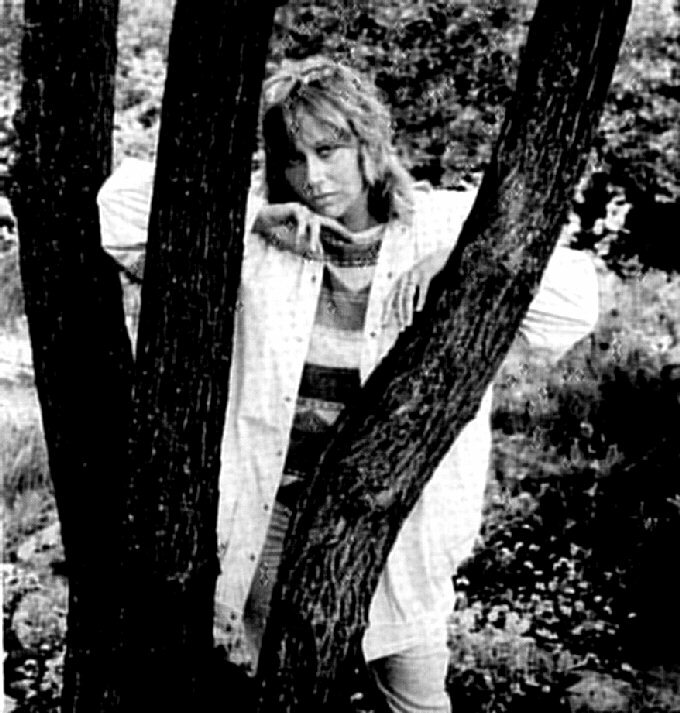 I don't know if the people have a wrong picture of me but I think so. 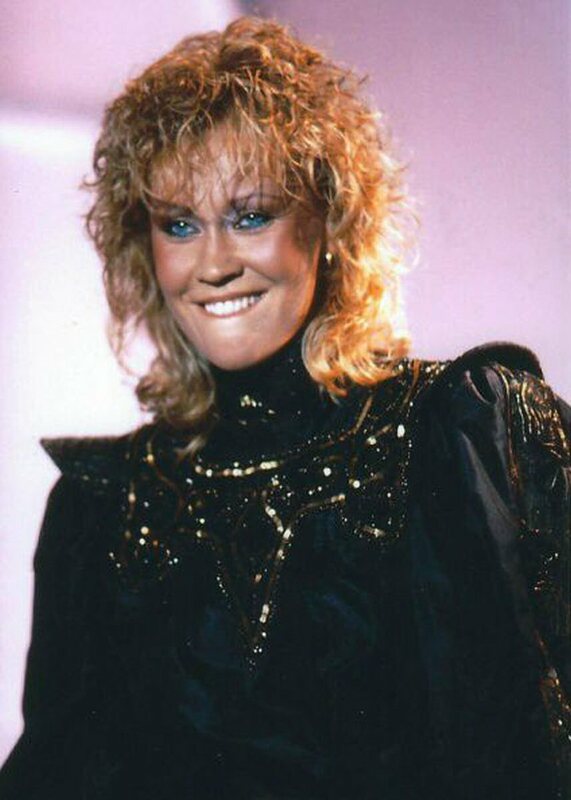 I see how people react when they meet me: "Oh my God, are you so tall?" 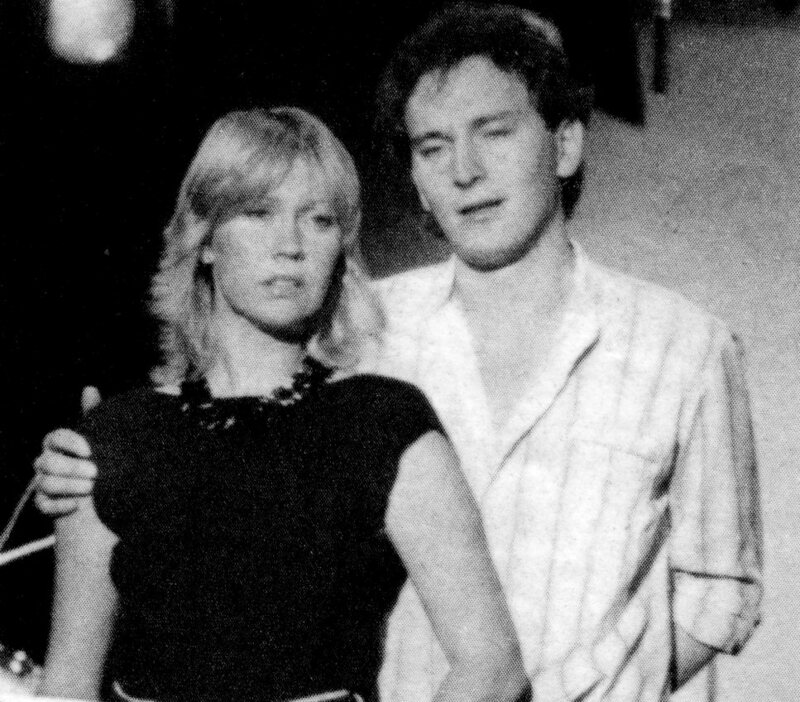 they say. 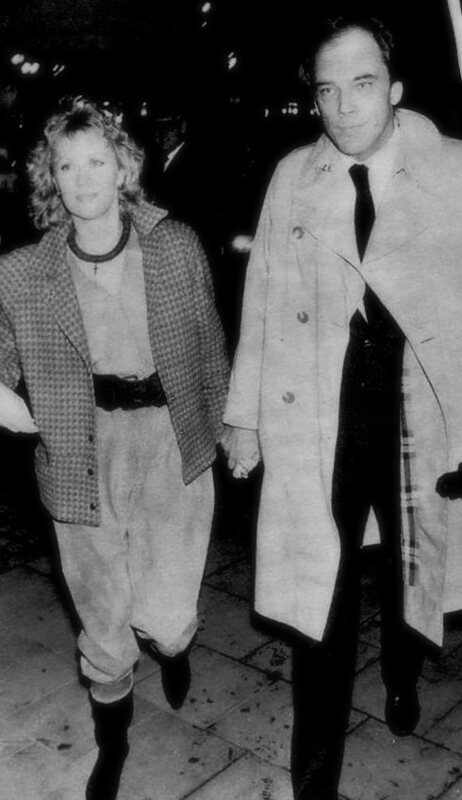 But everything wrong comes from the bloody newspapers. 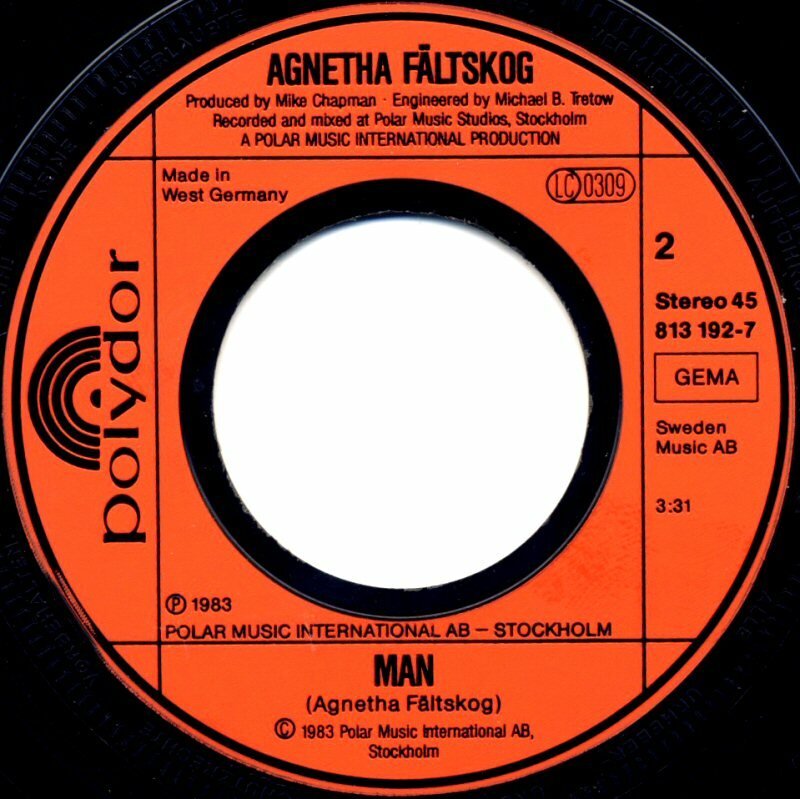 AF: I listen to lots of music when I drive. 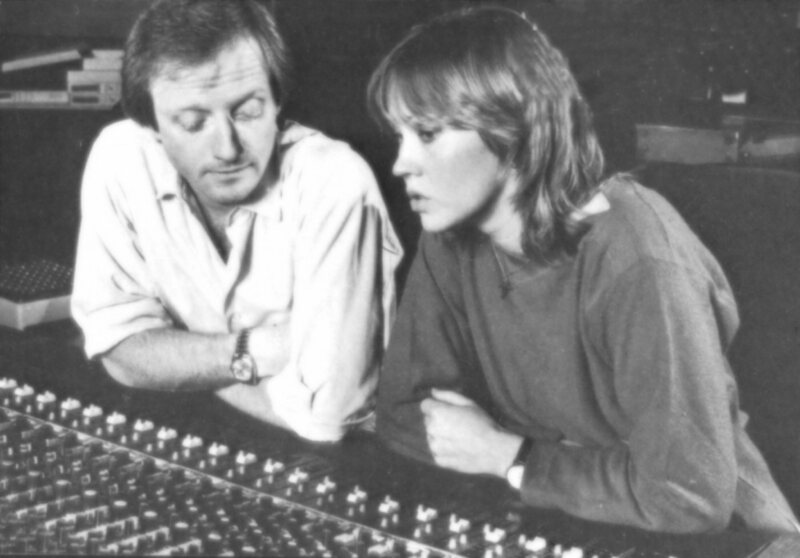 What music? 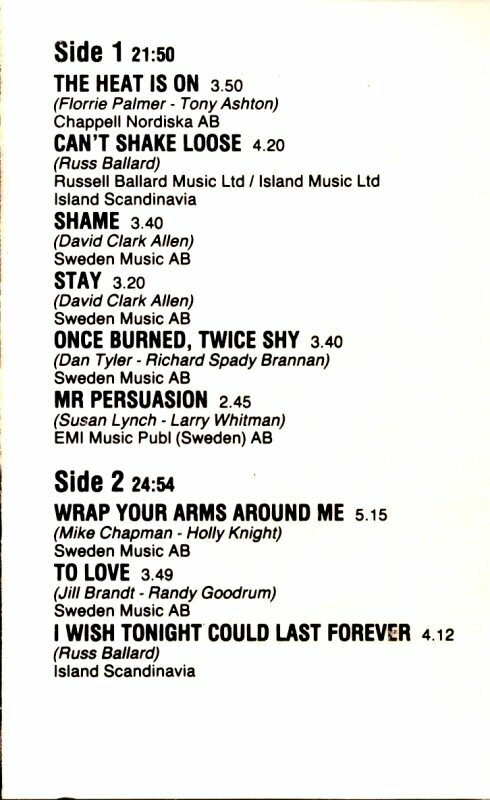 Hall & Oates, Michael Jackson, David Bowie, Donna Summer, Diana Ross, Barbra Streisand... Chicago are good. 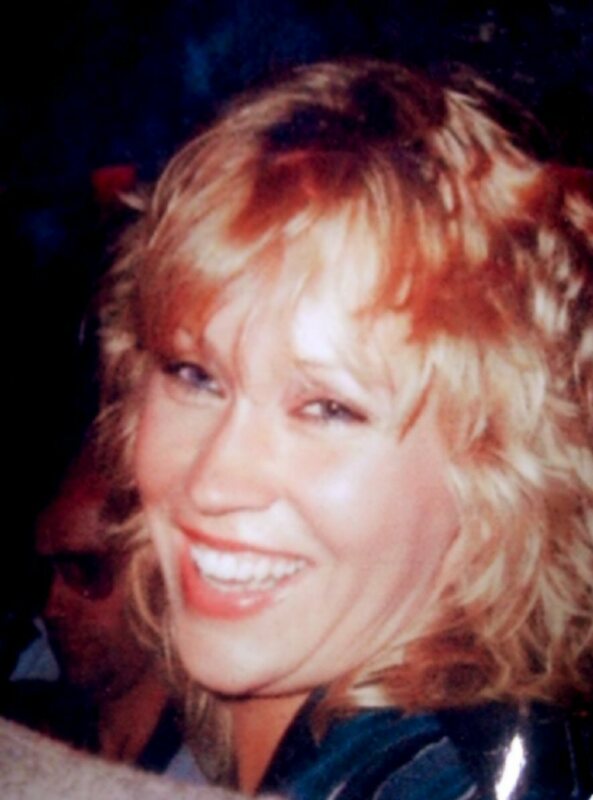 Any ideas for you life? 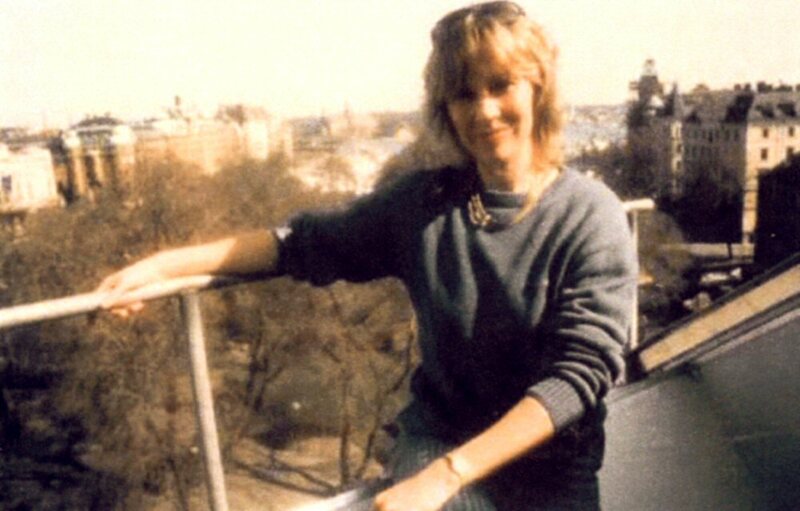 The main idea is to be on this level there I am now. 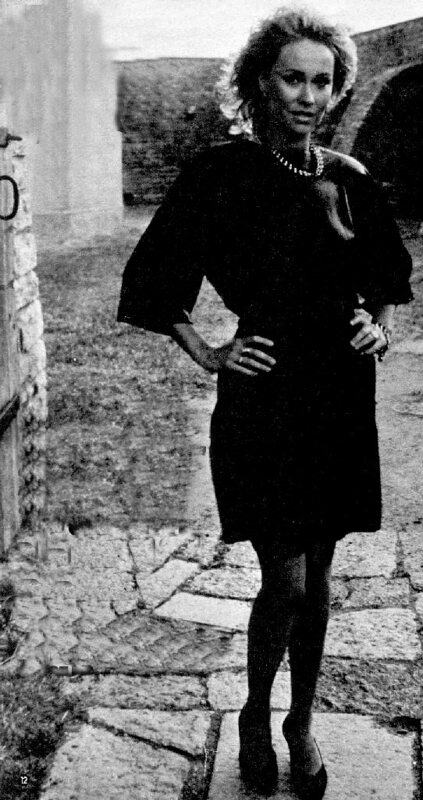 It is impossible for me to achieve more. 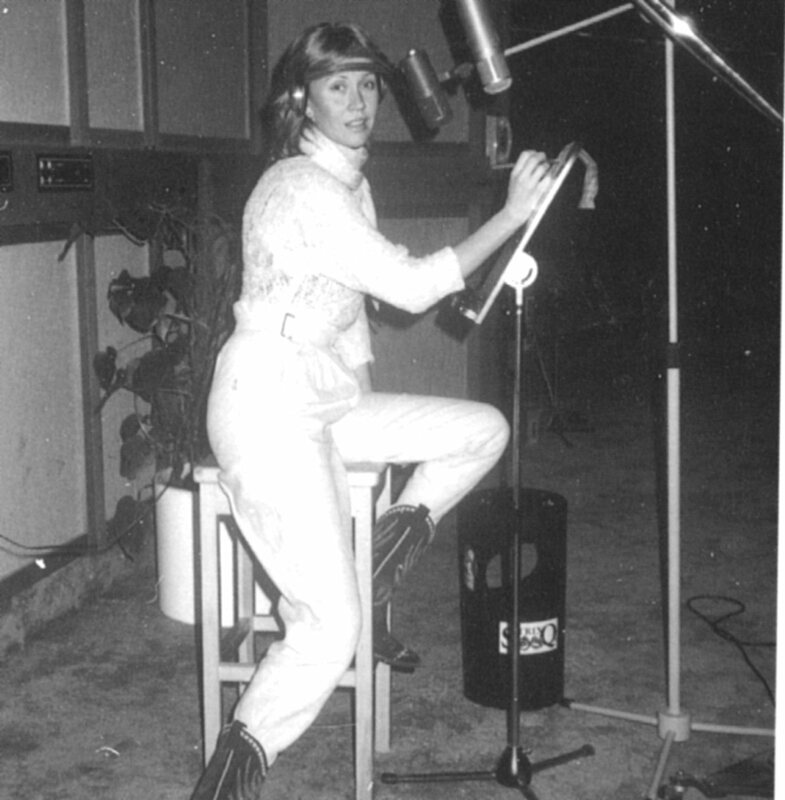 It is great fun to be a solo artist and actor but I don't wanna go to Hollywood. 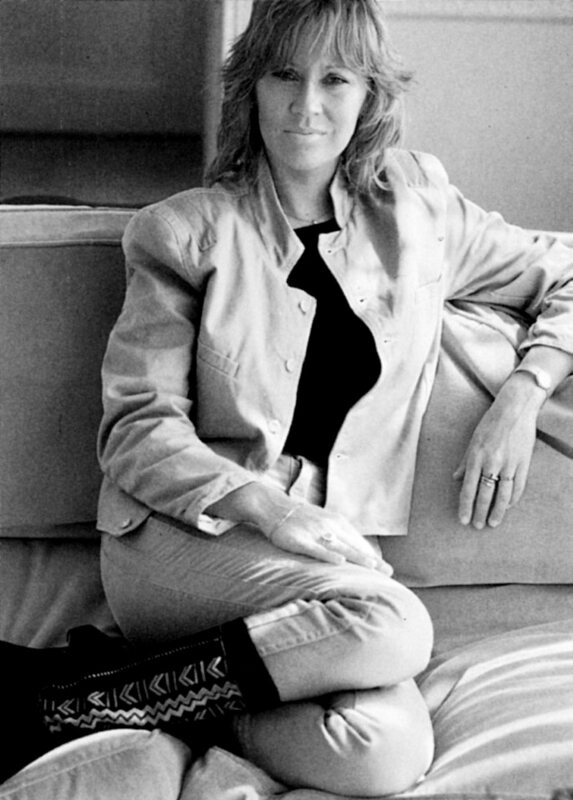 I want to work in my own speed. 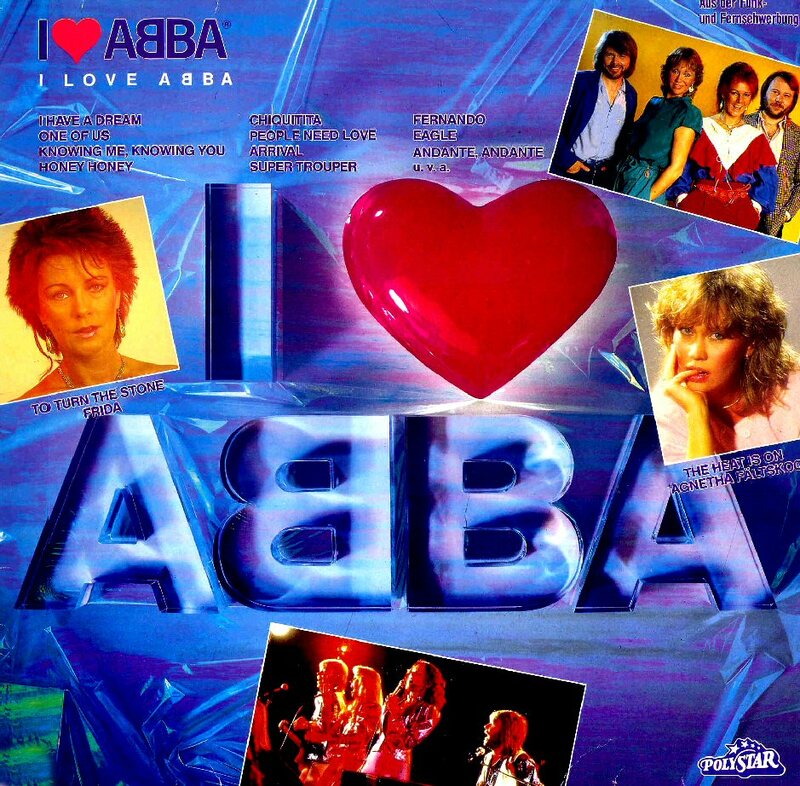 I don't want to be forced to do things as it was sometimes during the ABBA time. 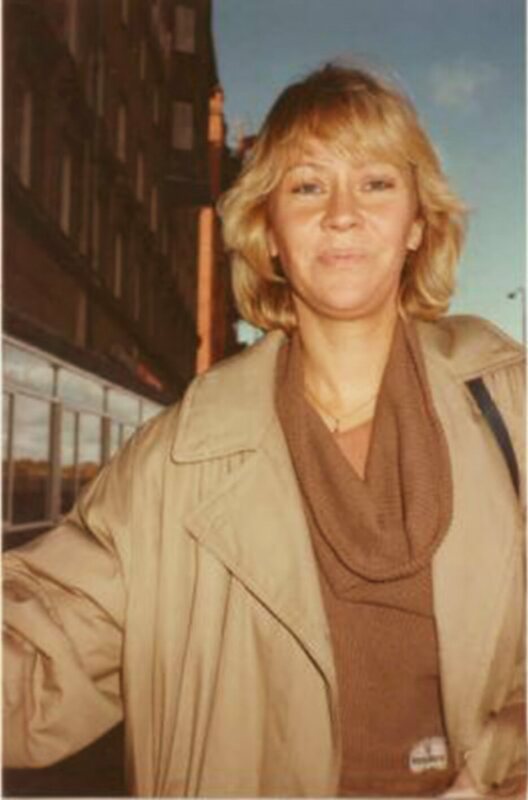 Agnetha gave several interviews and posed for photographers at the Polar Music office in Hamngatan in Stockholm. 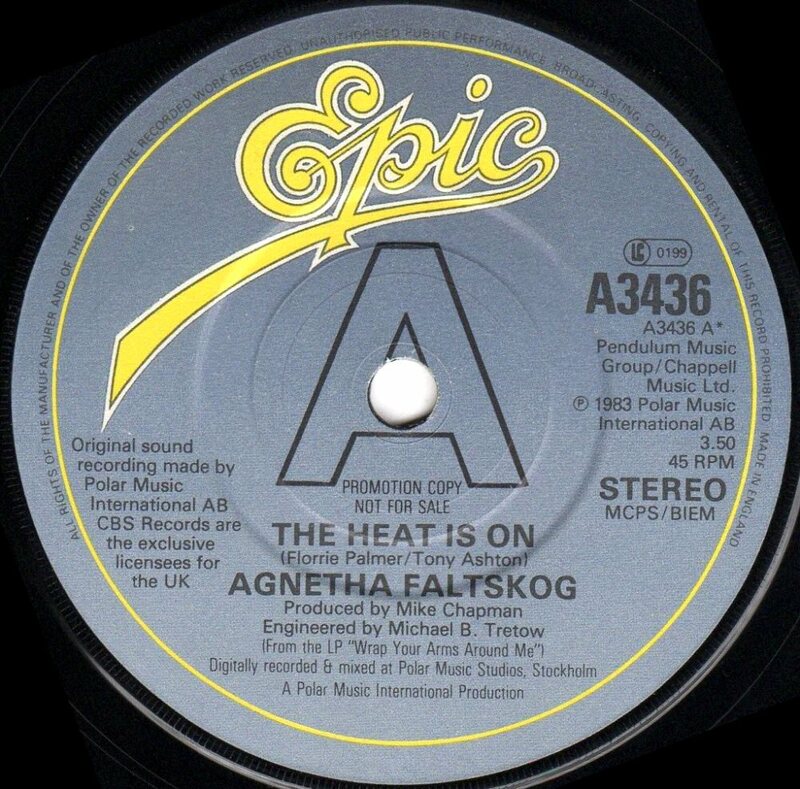 She even signed the new single "The Heat is On". 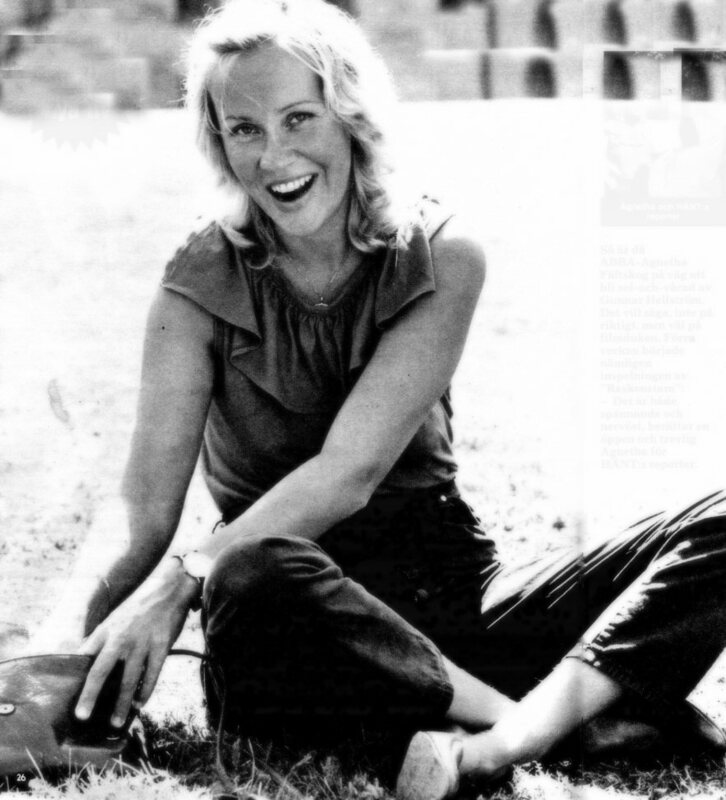 Another article with new photos was published by Swedish weekly "Min Värld" (My World). 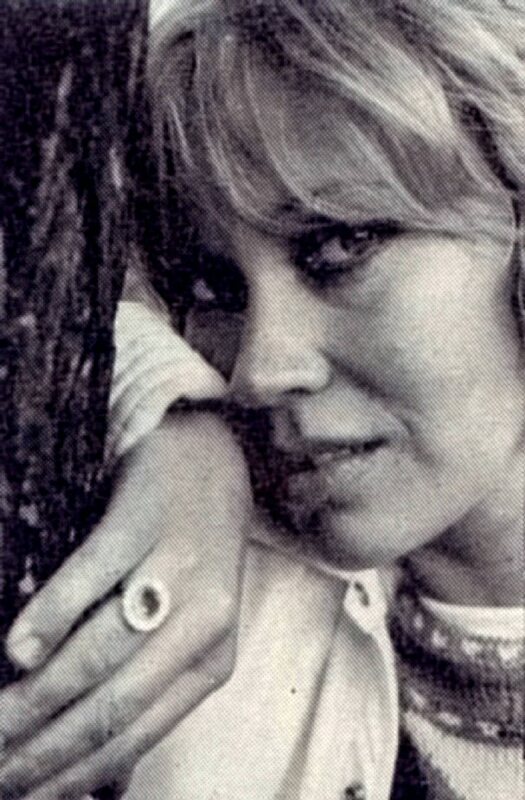 In the interview Agnetha mentioned that she would have an own show on Swedish TV. 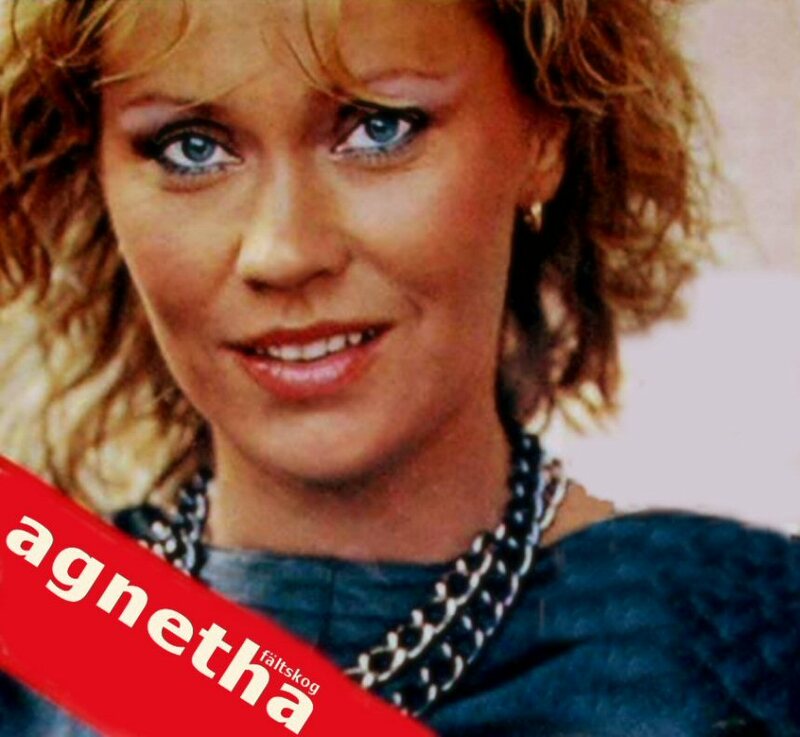 The show would be entitled "Agnetha Fältskog show" and it would be broadcasted around Christmas 1983. 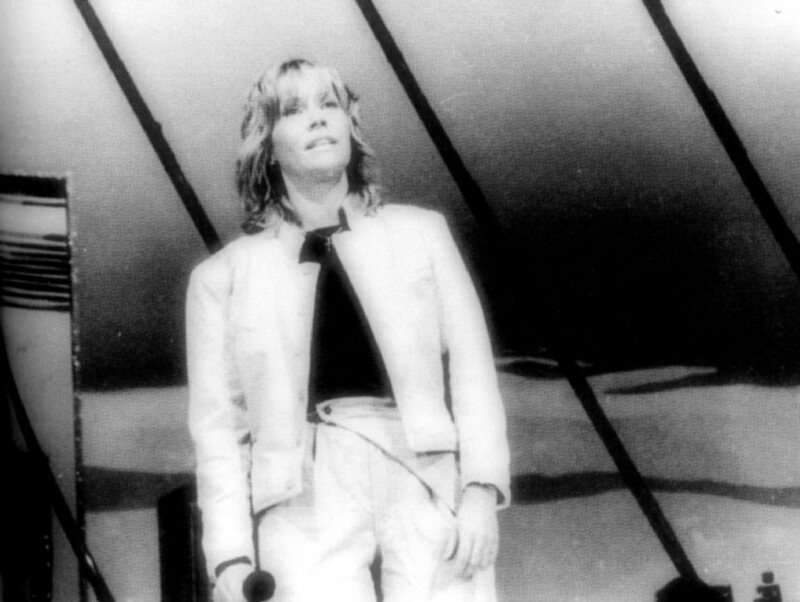 The show would feature Agnetha and two international stars - no names were given though in this interview. 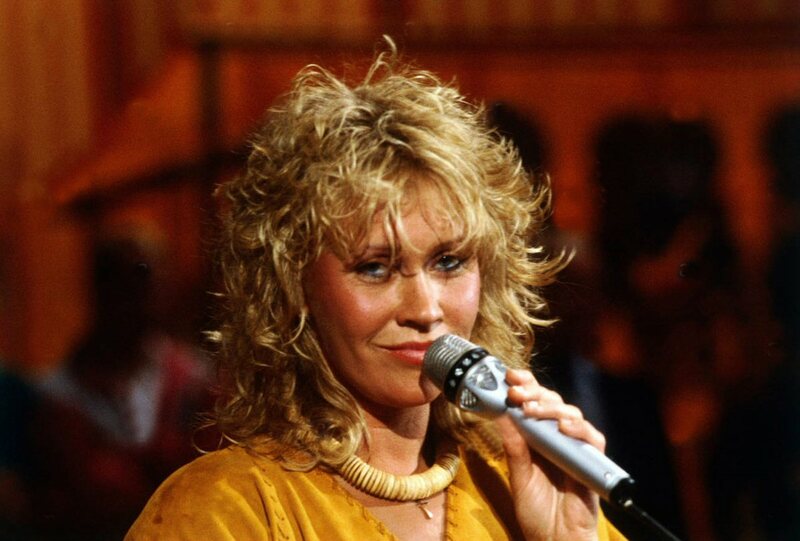 As far as we know the show has not been recorded and the only promotion for the album "Wrap Your Arms Around Me" was made with help of the TV special recorded in Stockholm in the middle of April (se below). 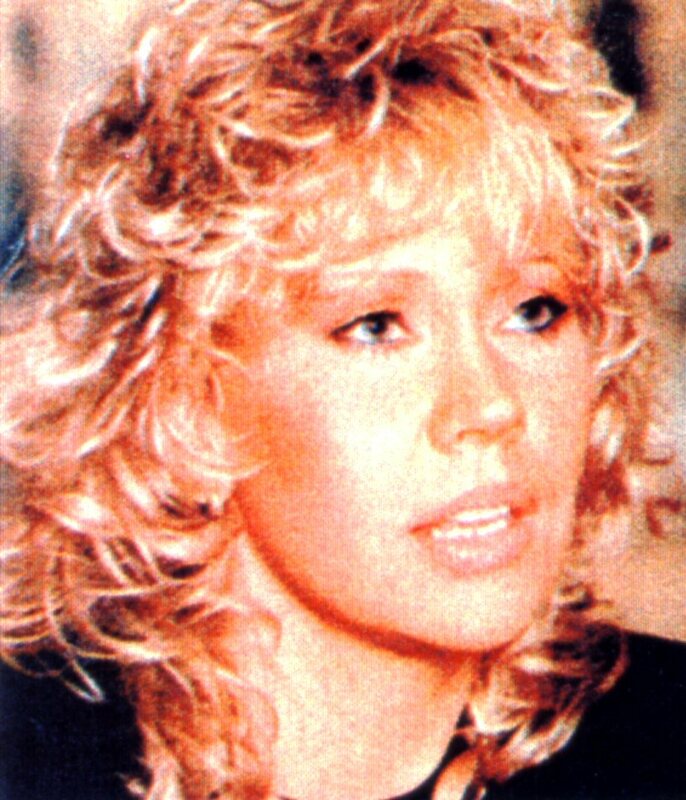 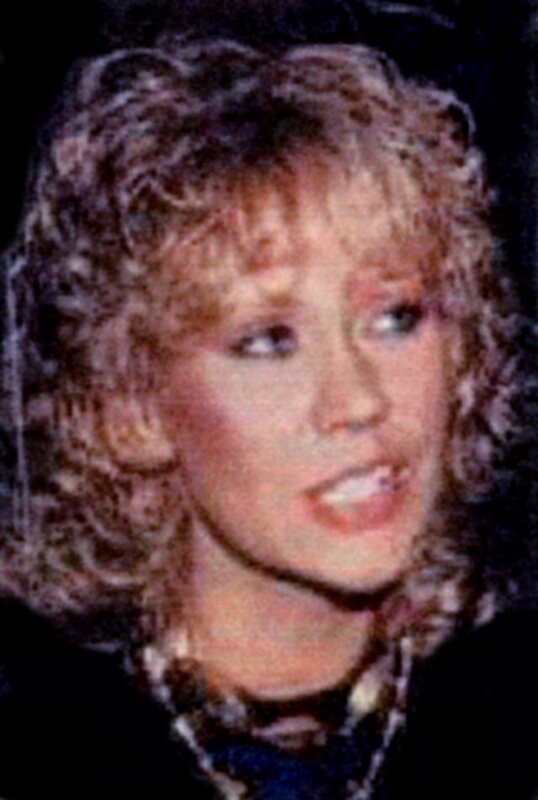 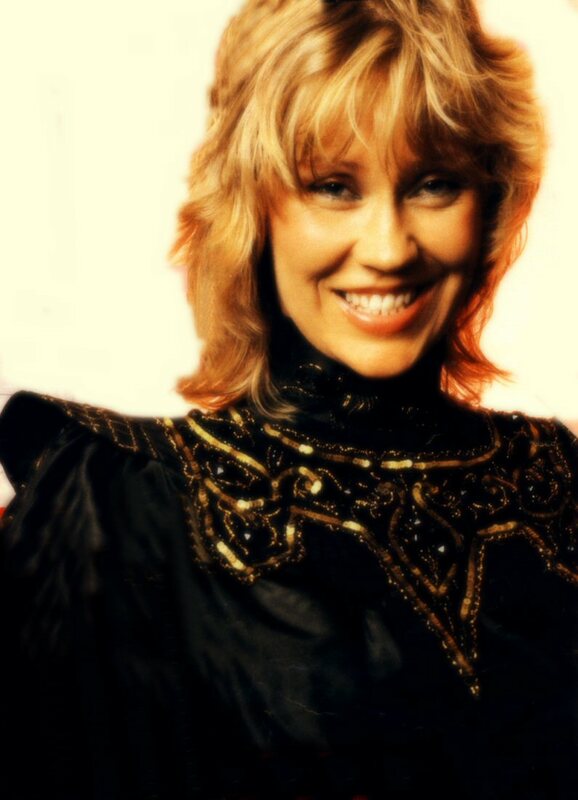 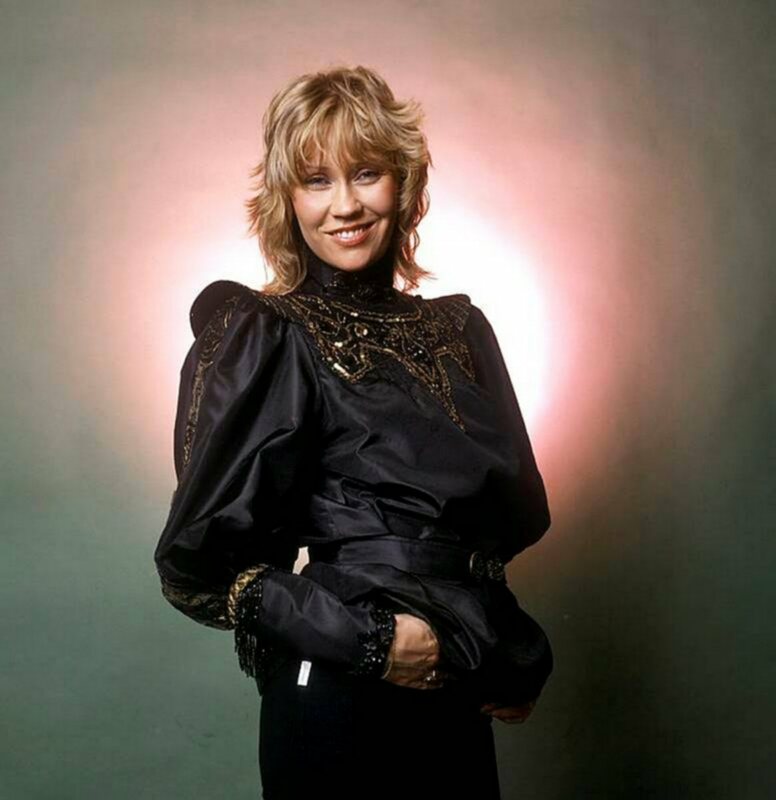 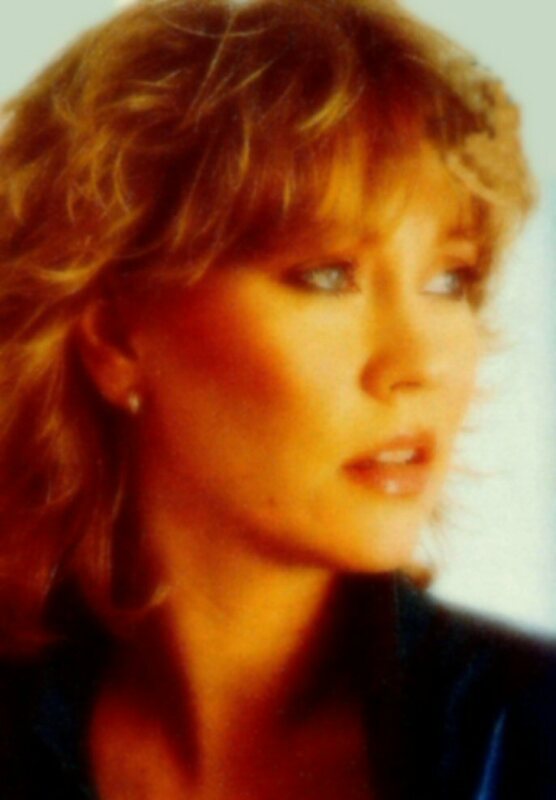 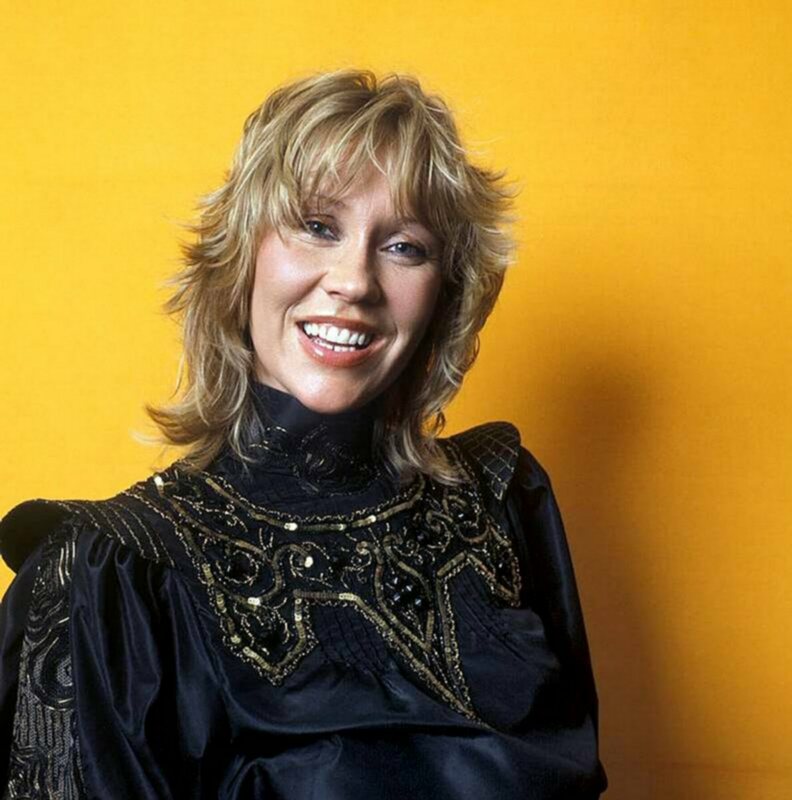 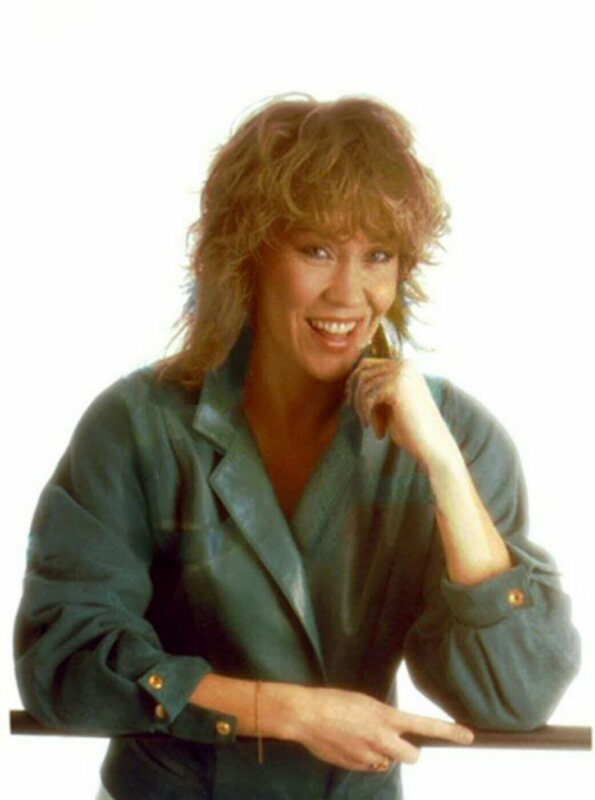 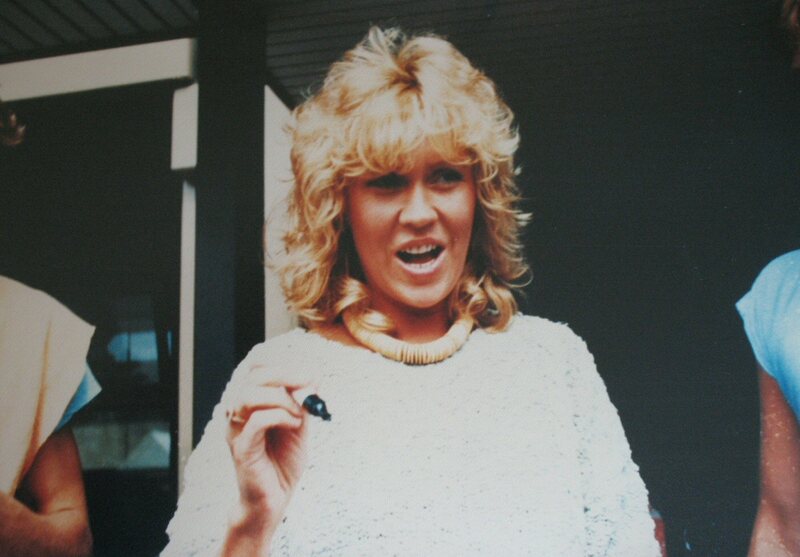 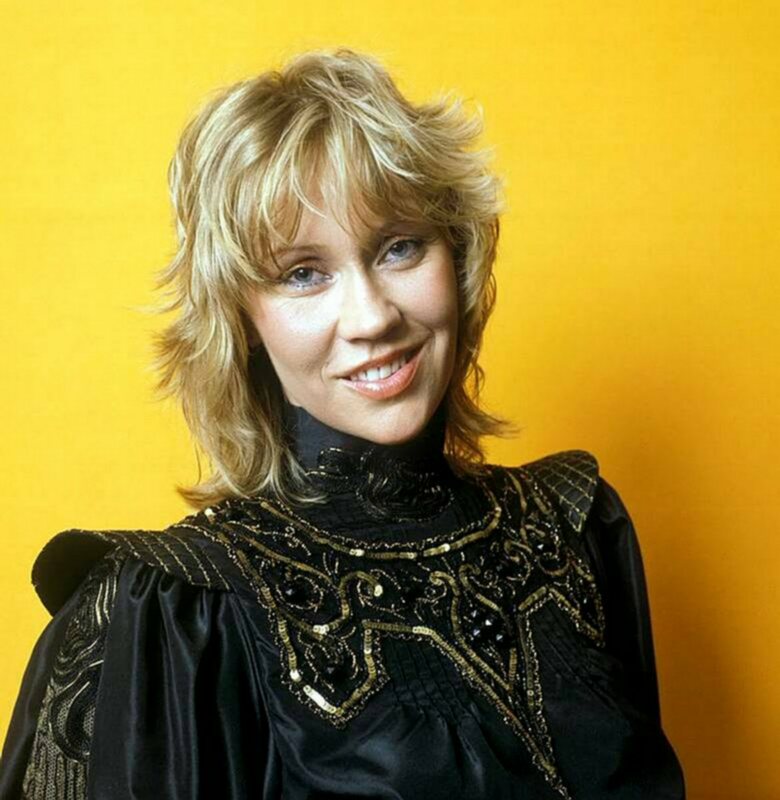 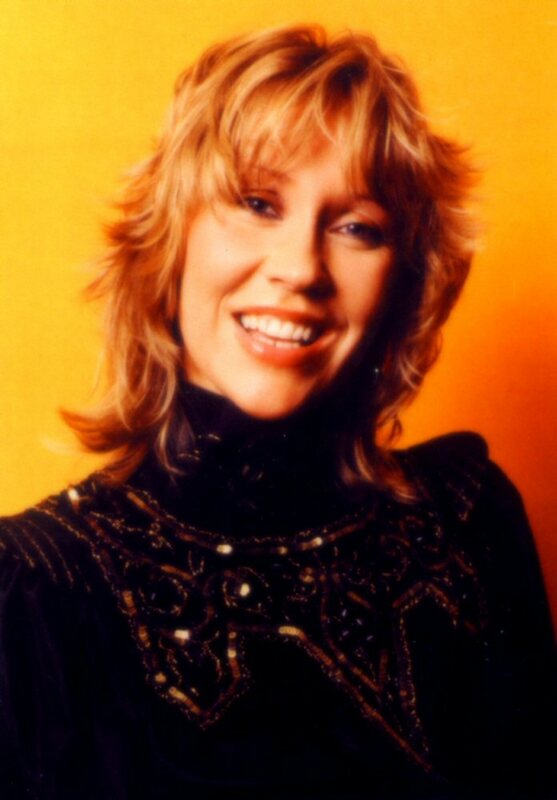 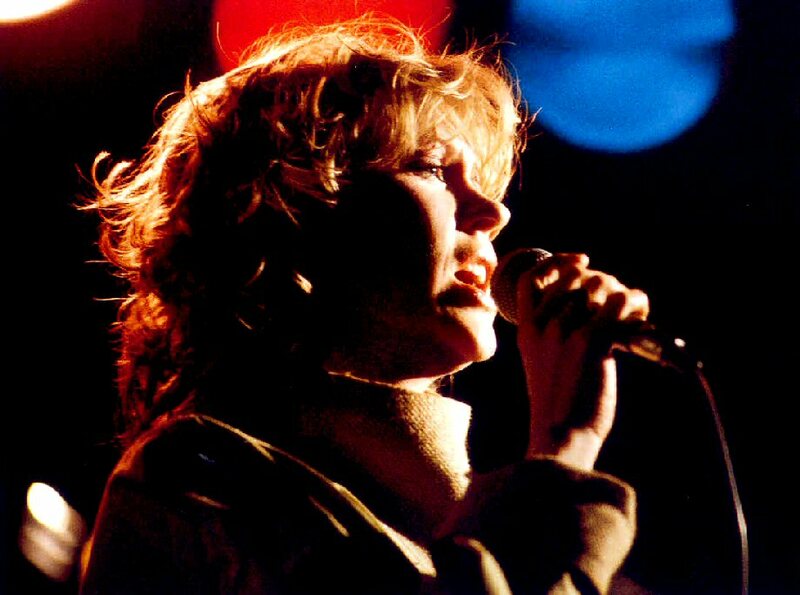 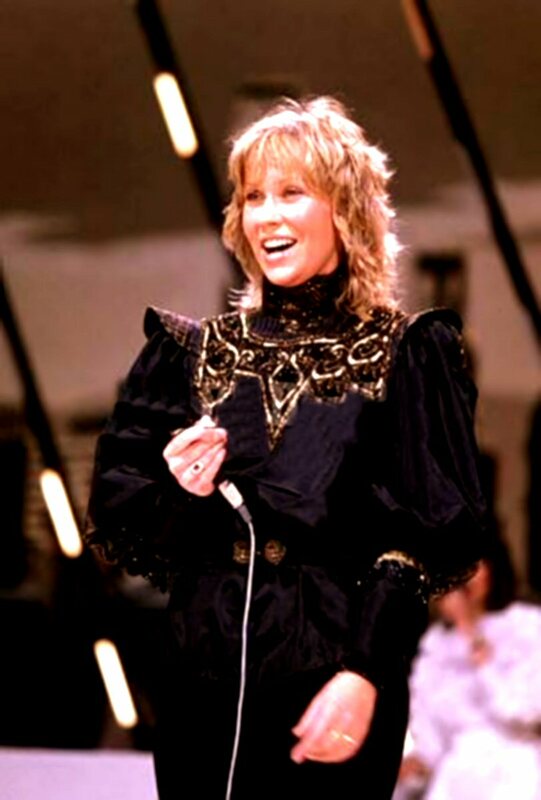 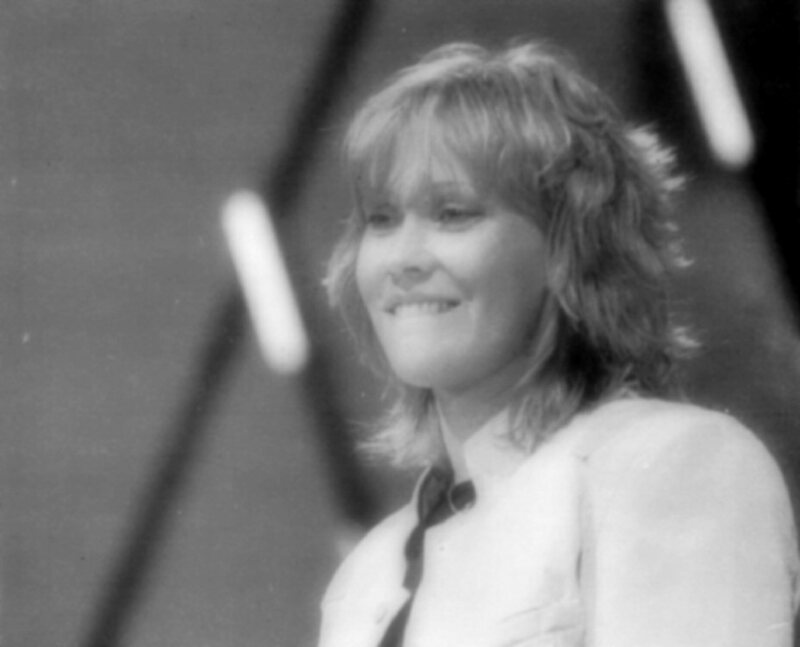 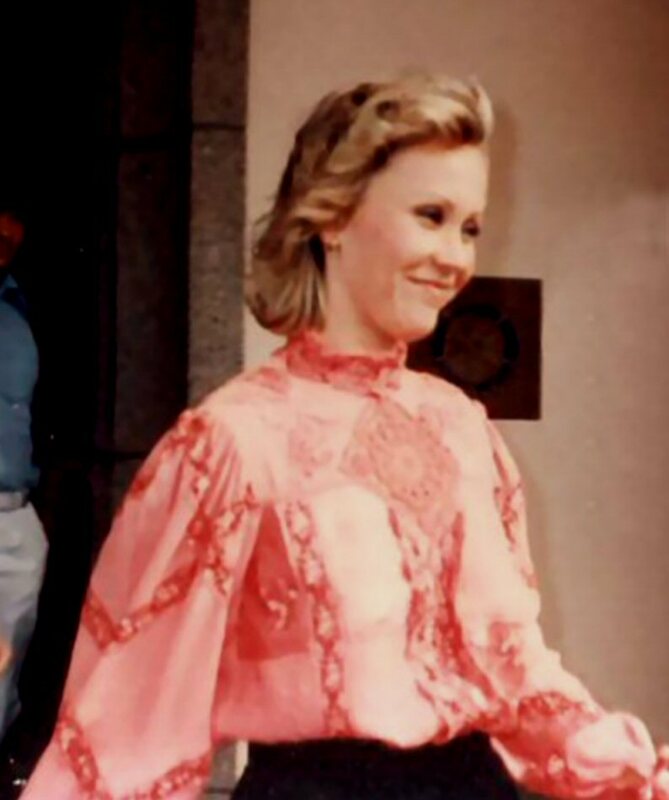 On April 17-18, 1983 Agnetha recorded a promotional show for TV. 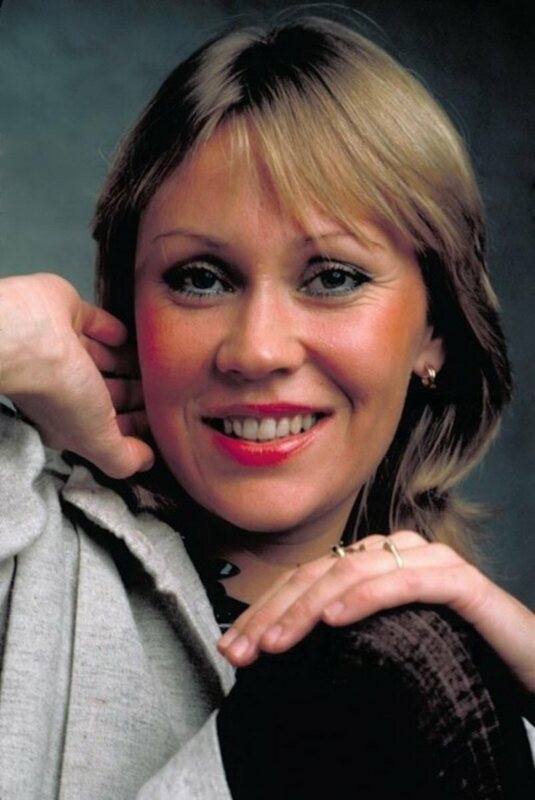 Agnetha presented 6 songs from her new album: The Heat Is On, Can't Shake Loose, Wrap Your Arms Around Me, I Wish Tonight Could Last Forever, Mr Persuasion & Shame. 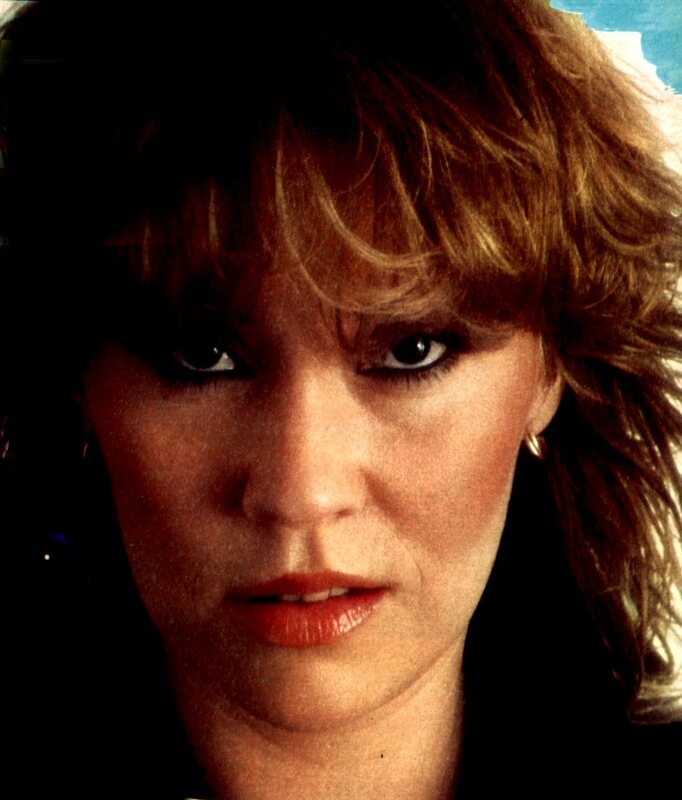 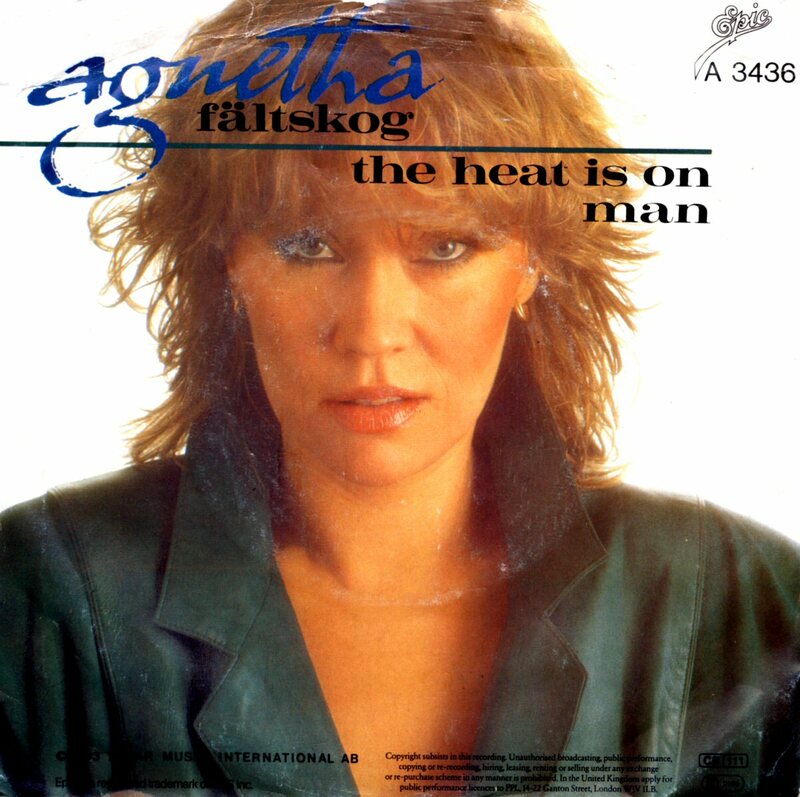 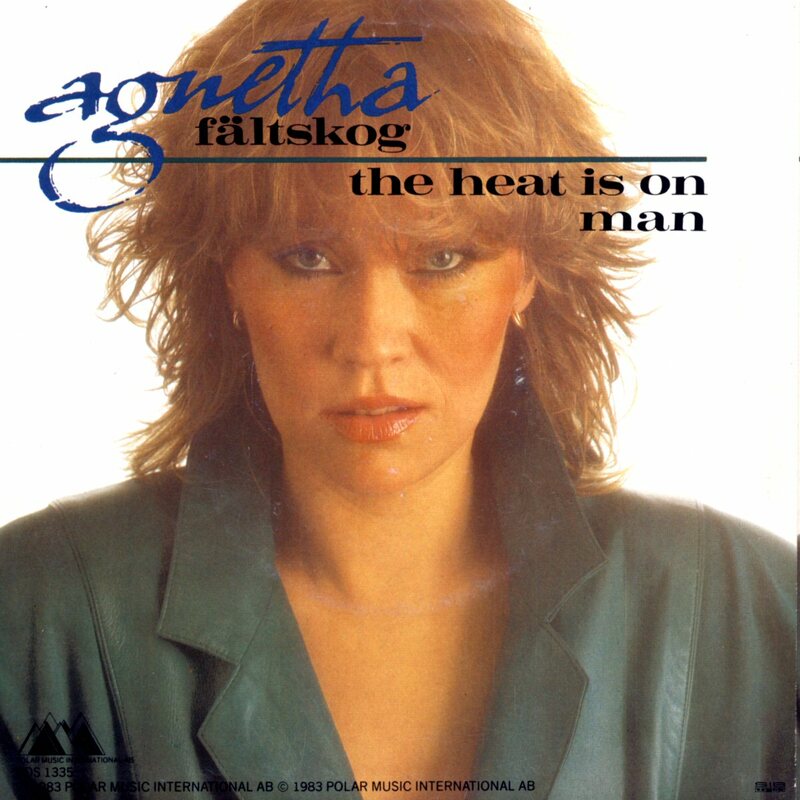 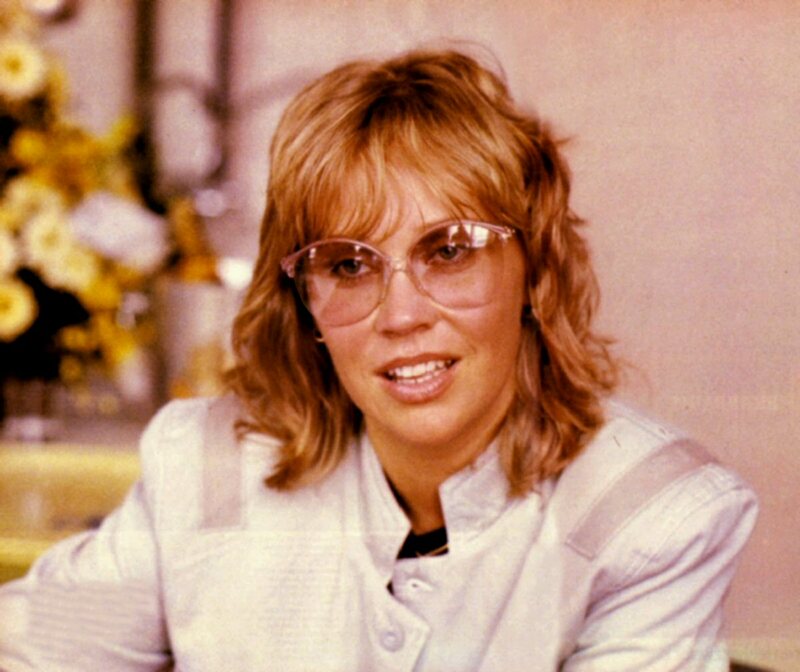 The show called "The Heat Is On" was broadcasted by Swedish TV on 14 May 1983 at 9.15 p.m.
At the end of April Agnetha appeared on "Nöjesmaskinen" on Swedish TV. 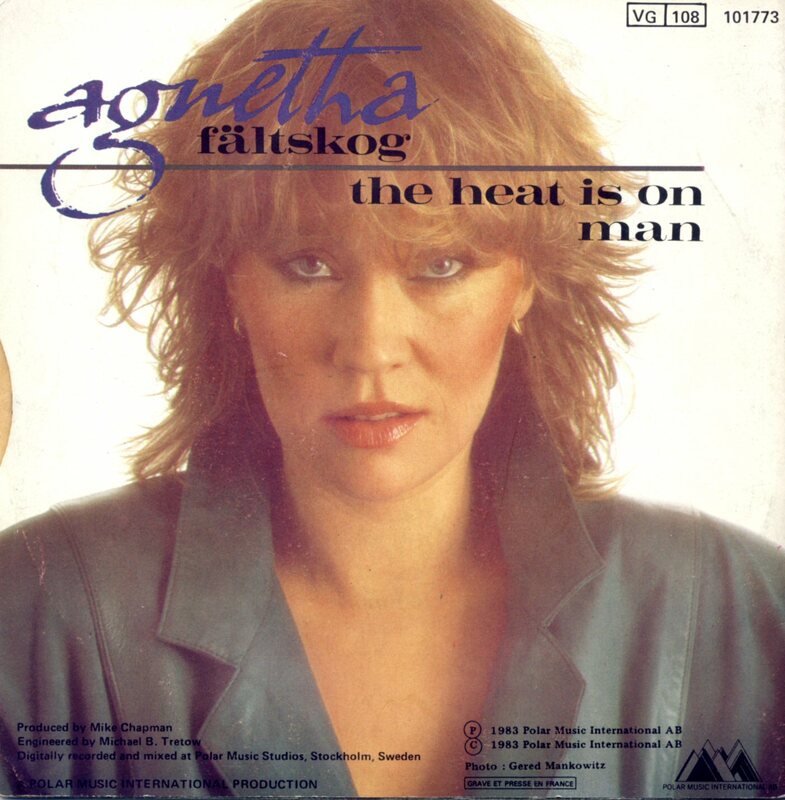 She gave a short interview and performed her new single hit "The Heat Is On". 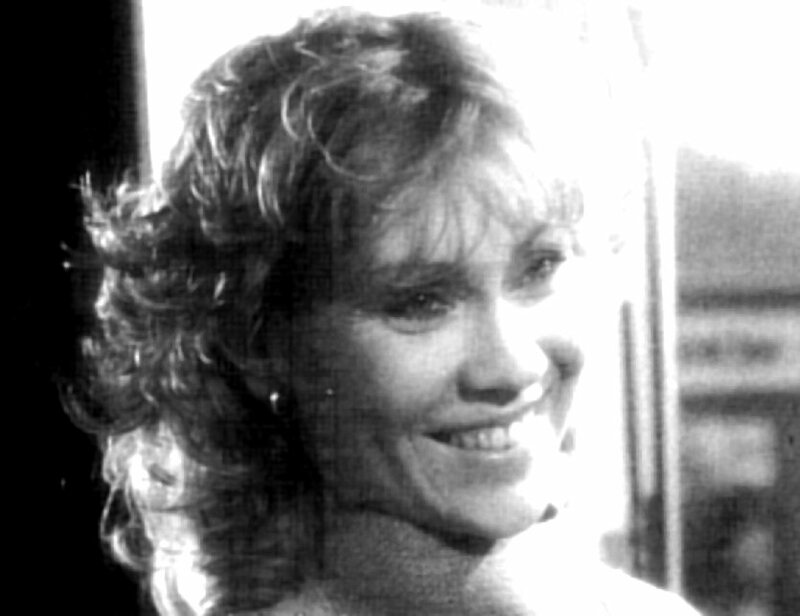 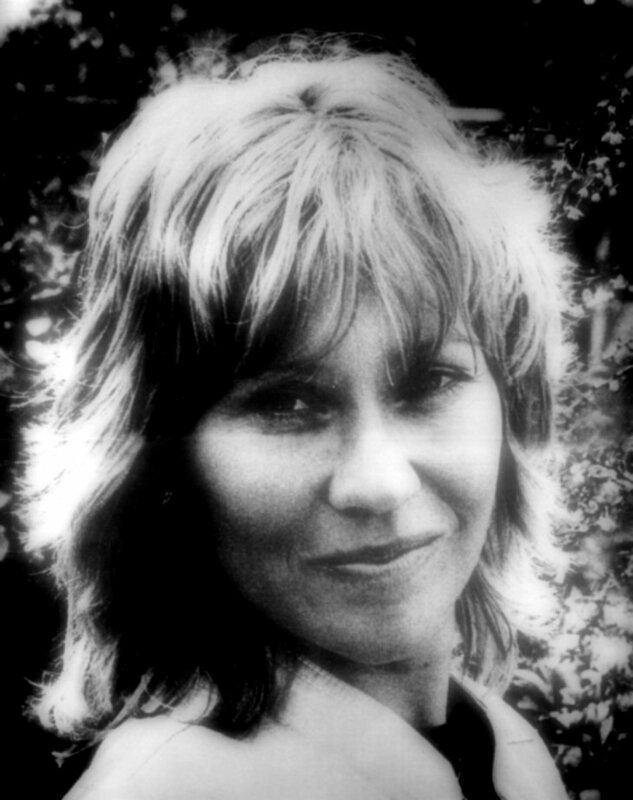 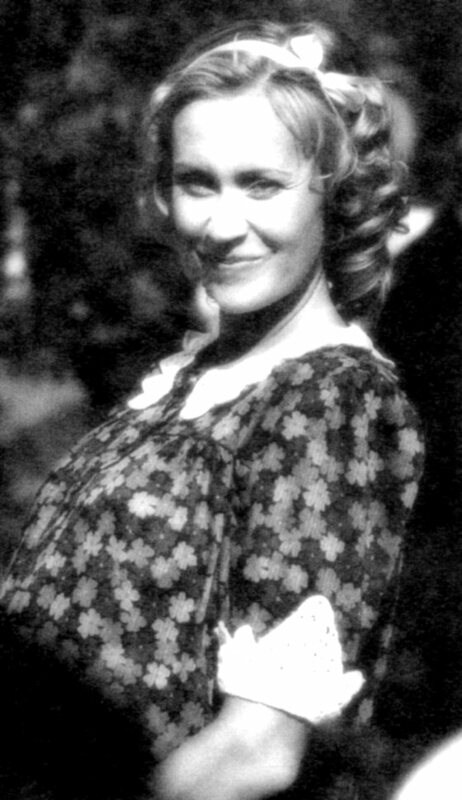 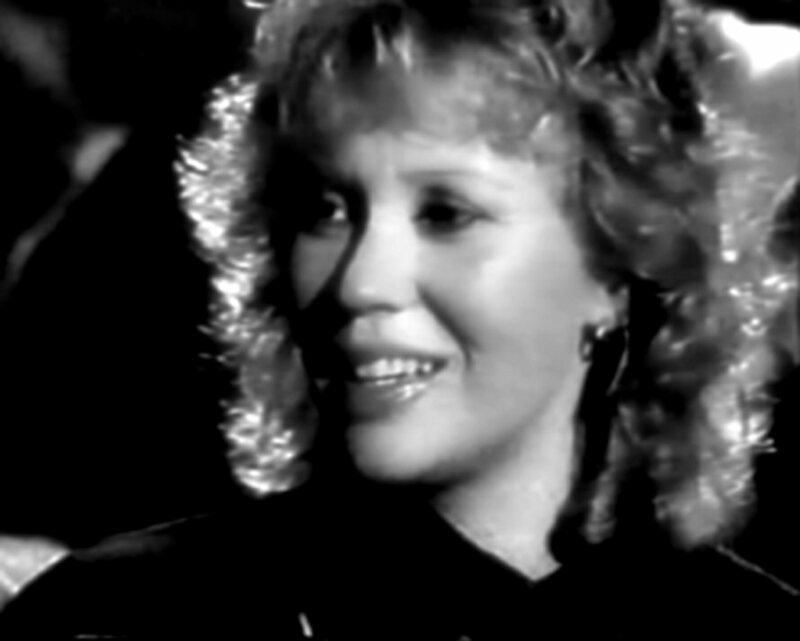 Agnetha acted in a promotional video filmed for "The Heat Is On". 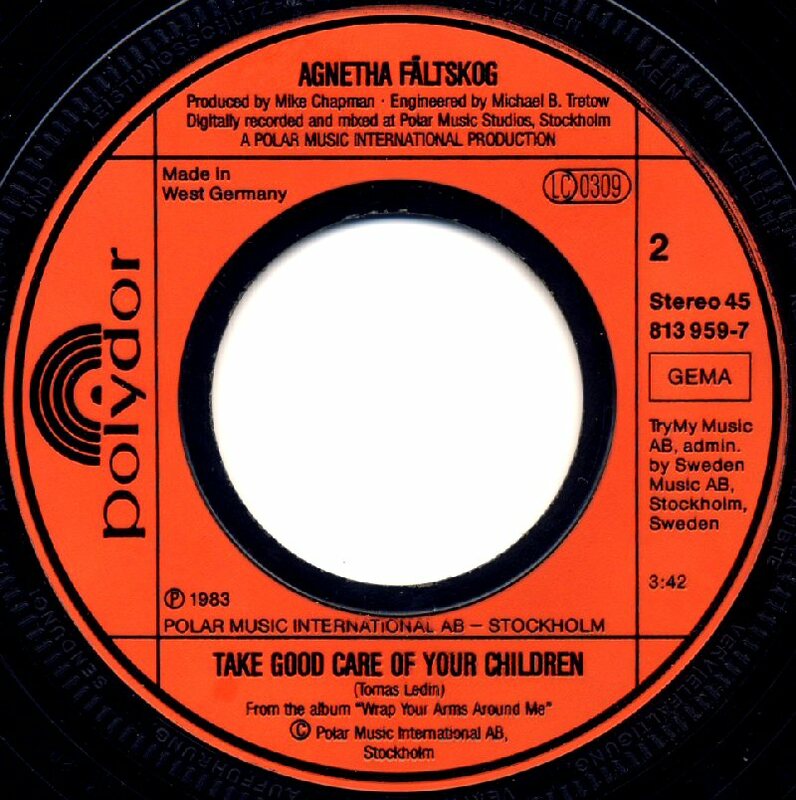 The video was a funny interpretation of the song lyrics and it was recorded in the bath house in Stockholm. 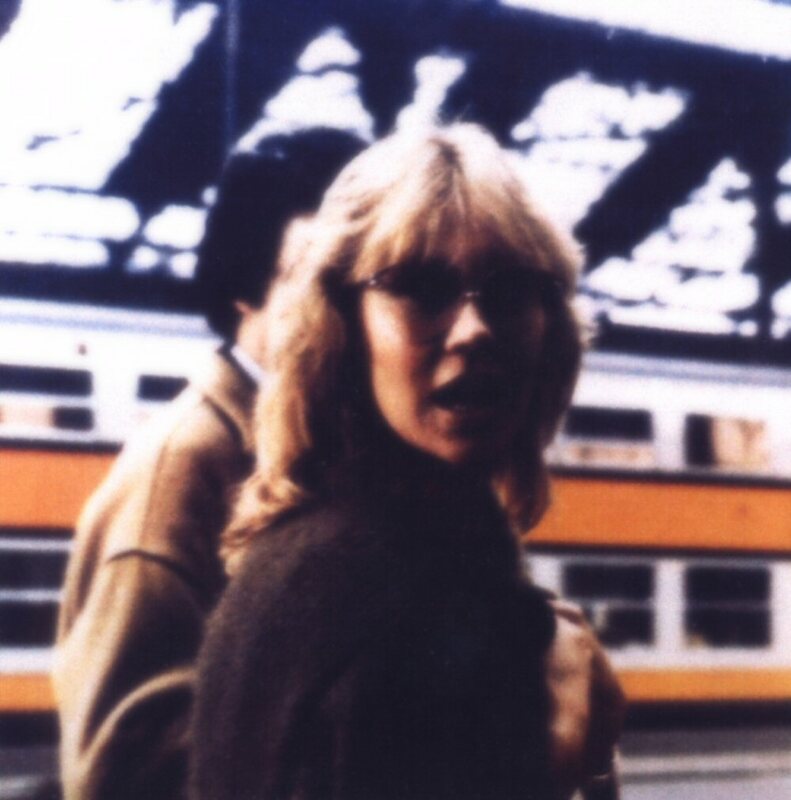 Agnetha went on her promotional trip in Europe by train. 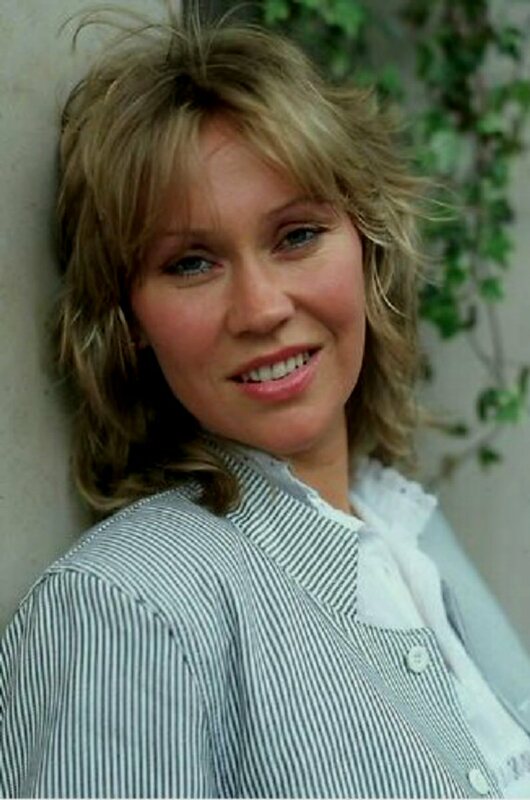 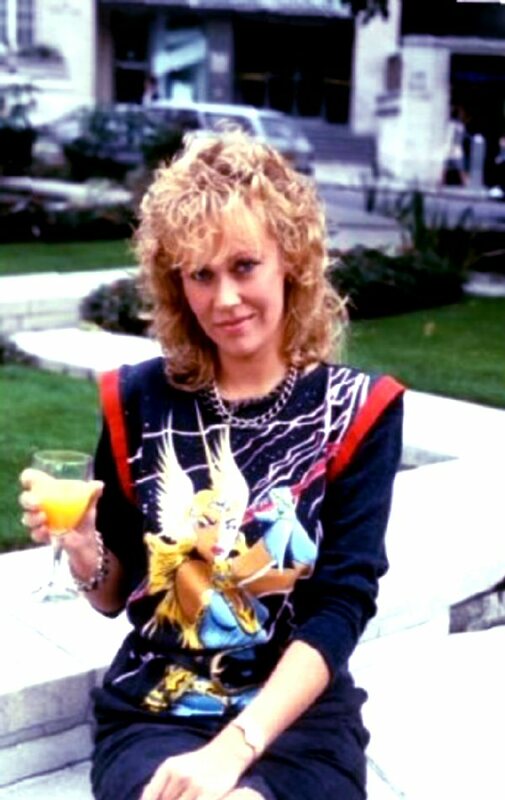 On Friday, May 13th, 1983 Agnetha was a special guest on the breakfast TV show in BBC in London. 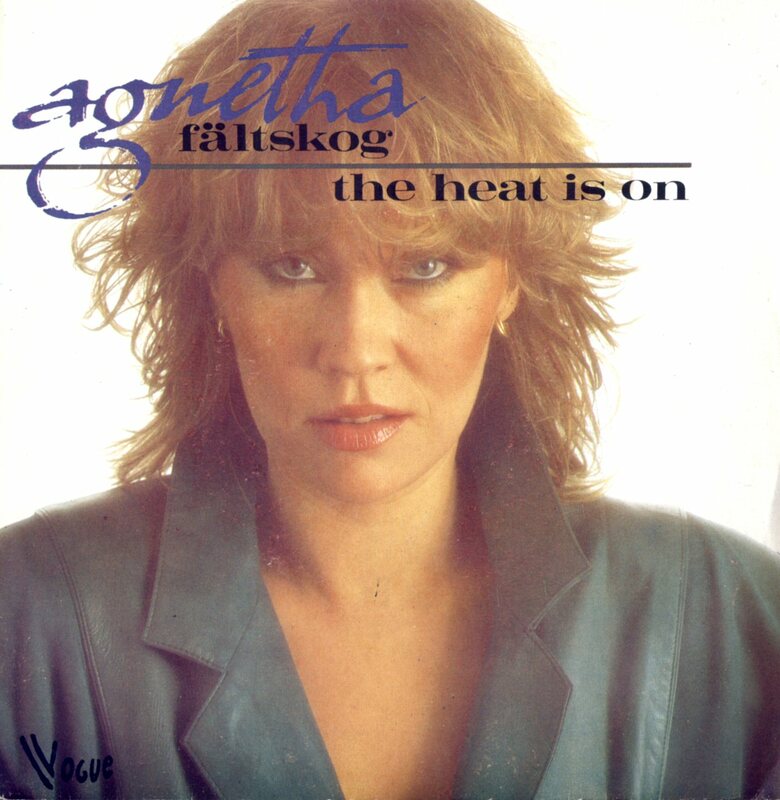 She gave two interviews and the video "The Heat Is On" taken from the Swedish TV special was shown. 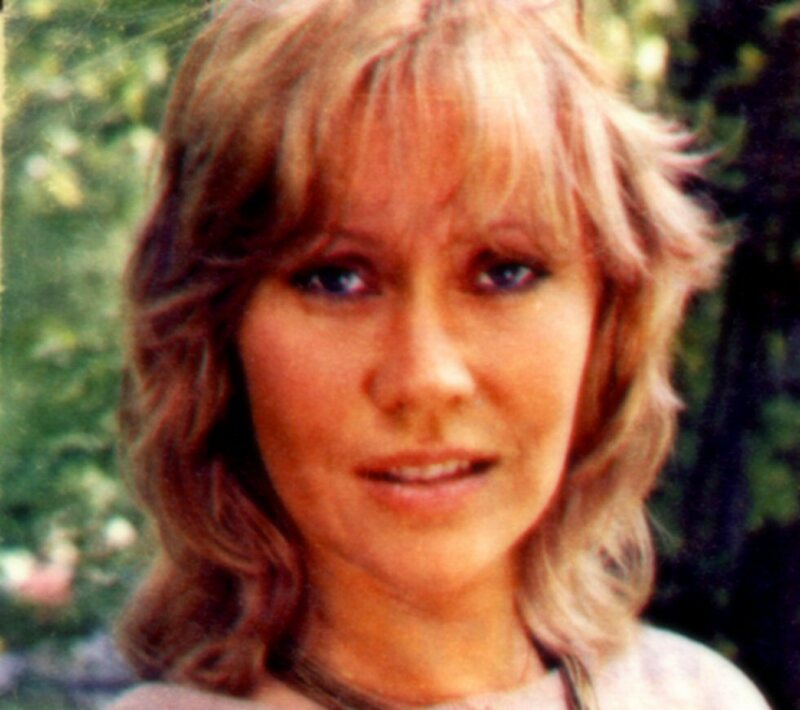 Agnetha appeared in "Top of the Pops" where she answered an absolutely stupid question in the absolutely most intelligent way. 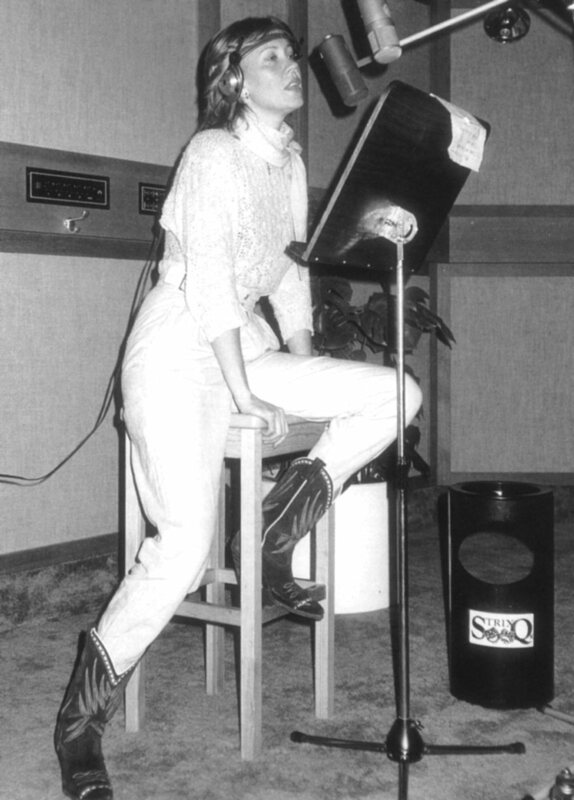 The question was why she sang in English - the answer was: "Why not?" 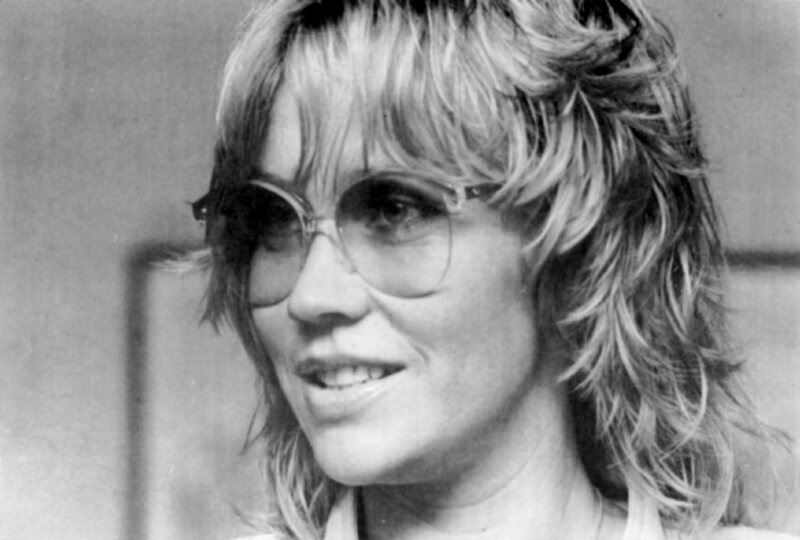 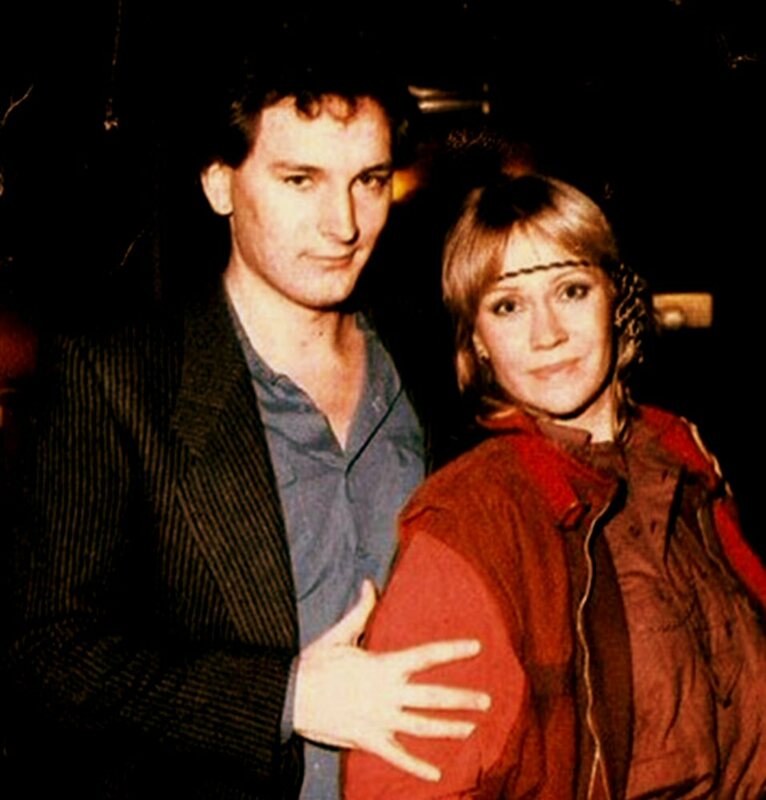 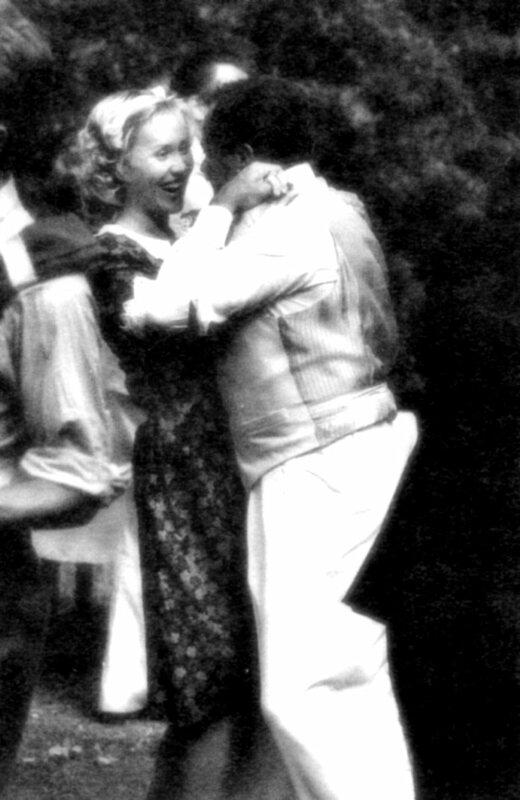 Agnetha even met David Clark Allen, who submitted songs for the album "Wrap Your Arms Around Me": "Stay" and "Shame". 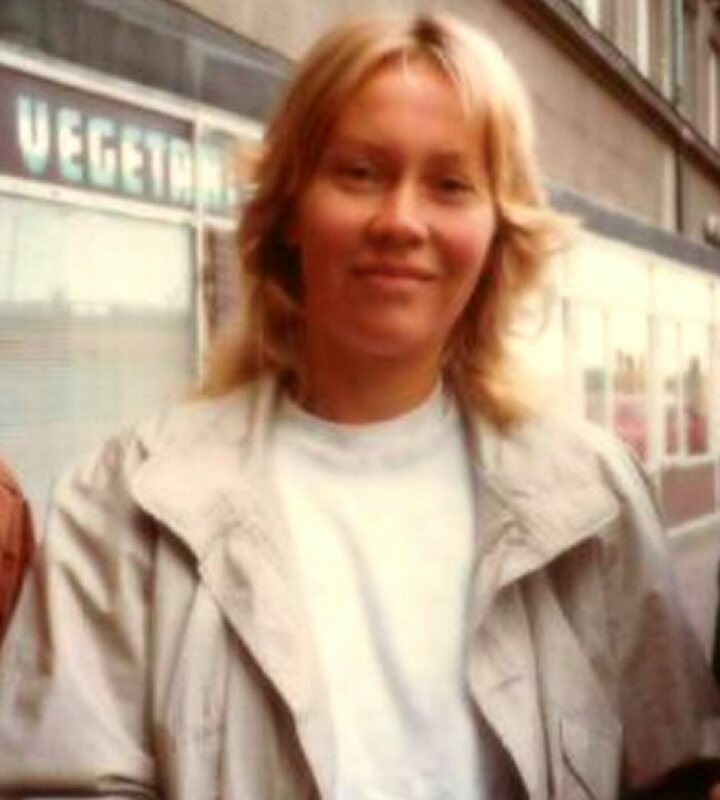 At the beginning of June Agnetha was in West Germany. 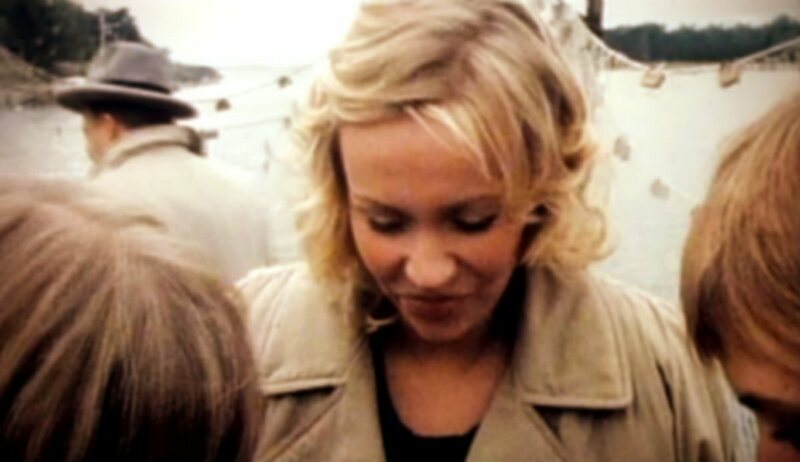 She appeared in "Musikladen" on June 9th. 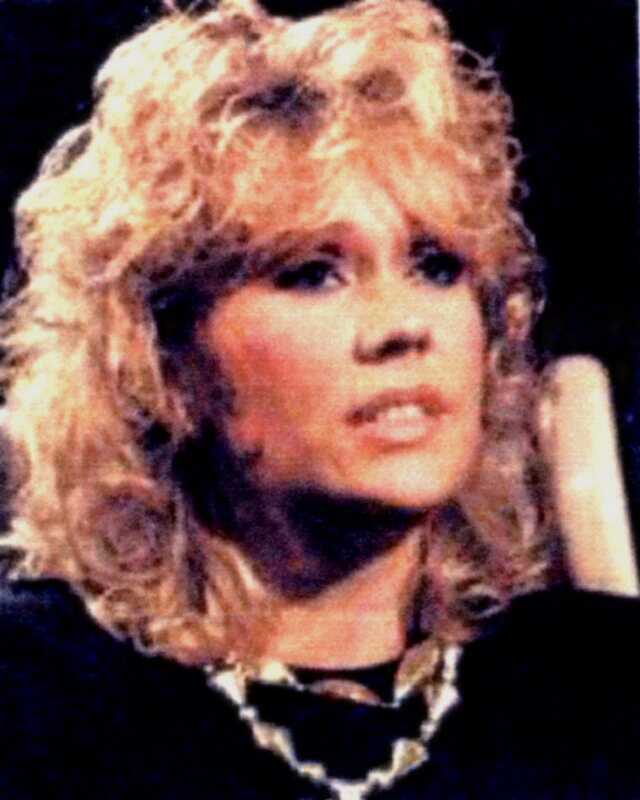 Promotion in press and on TV. 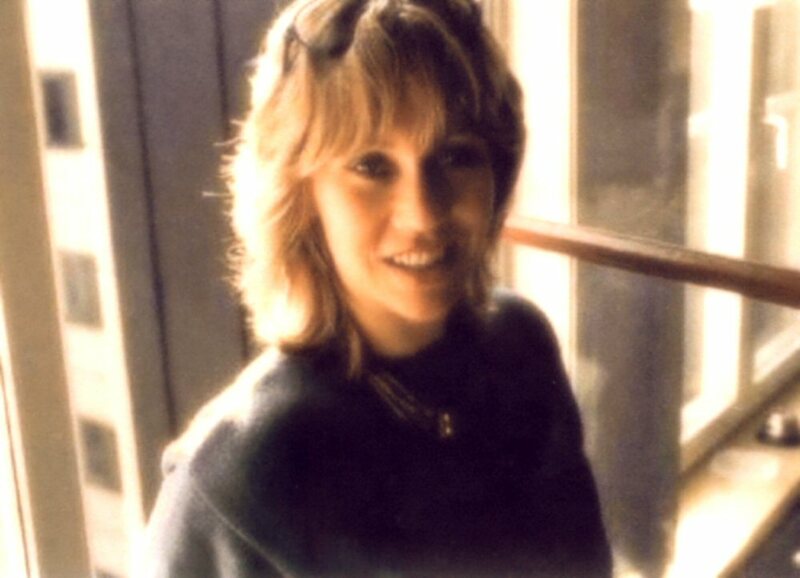 In Paris Agnetha performed "The Heat Is On" on "Cadence 3". 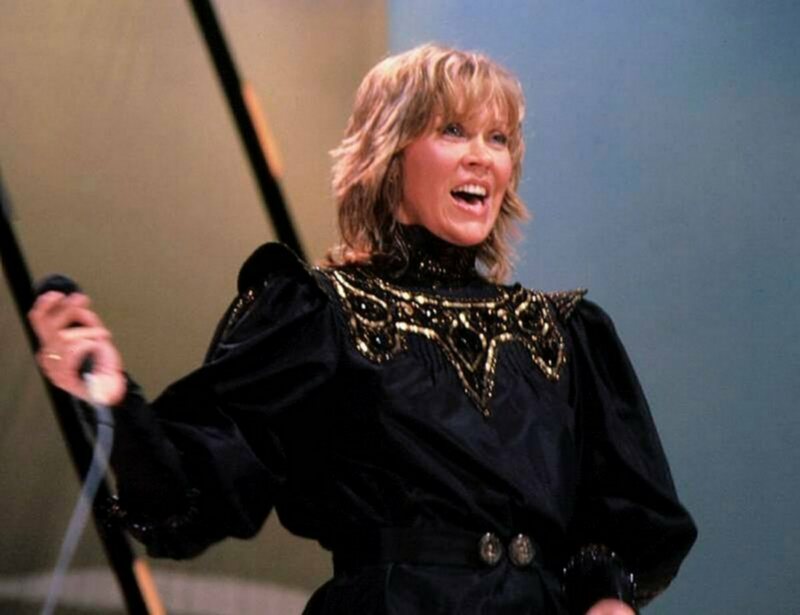 The audience was singing with her and the ovations did not want to end. 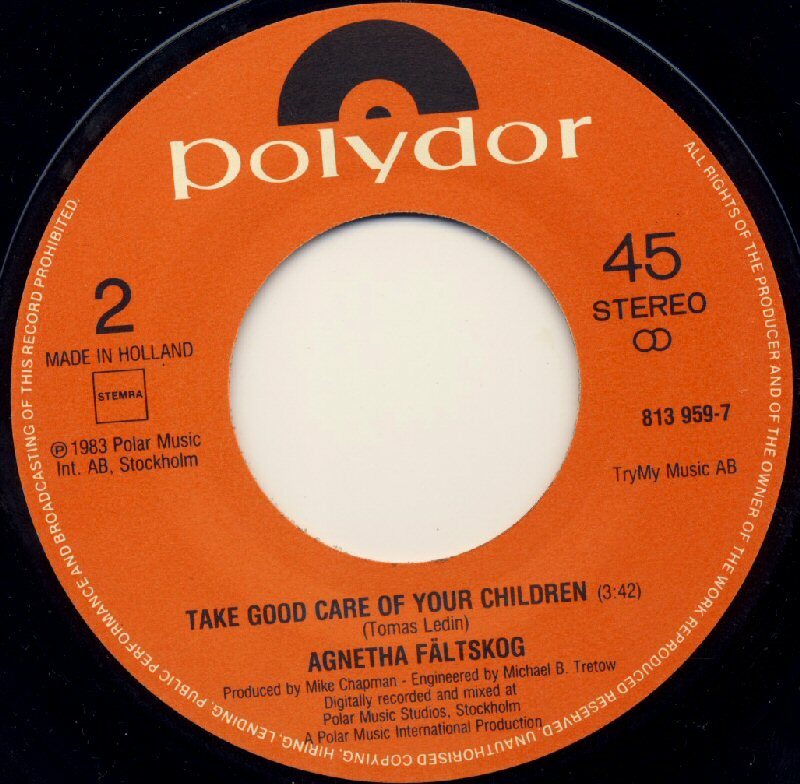 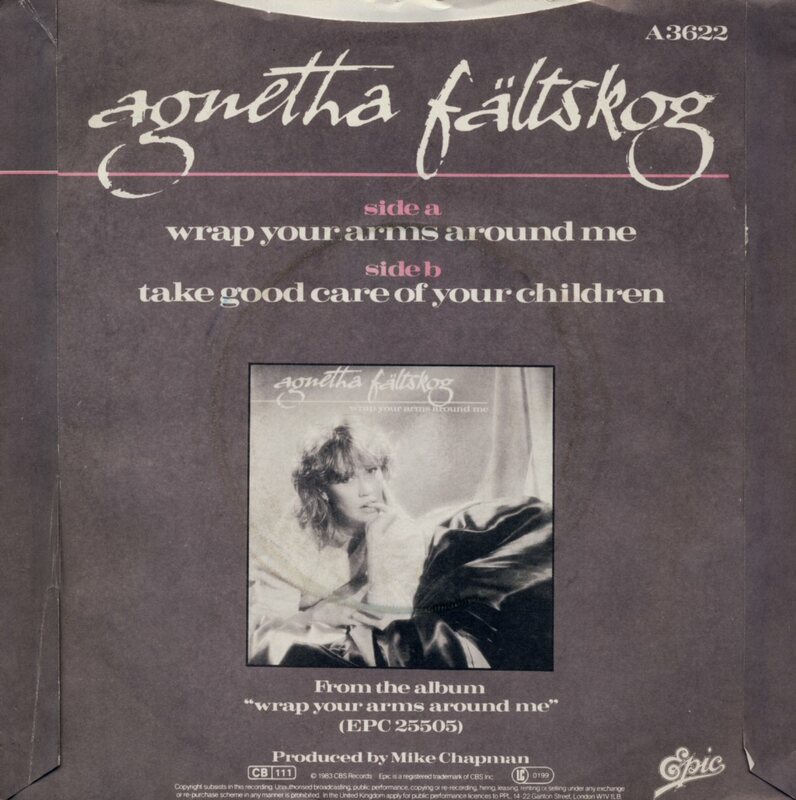 The second single from the album was the title track "Wrap Your Arms Around Me" (in edited version 3.56) b/w with Tomas Ledin's composition "Take Good Care of Your Children". 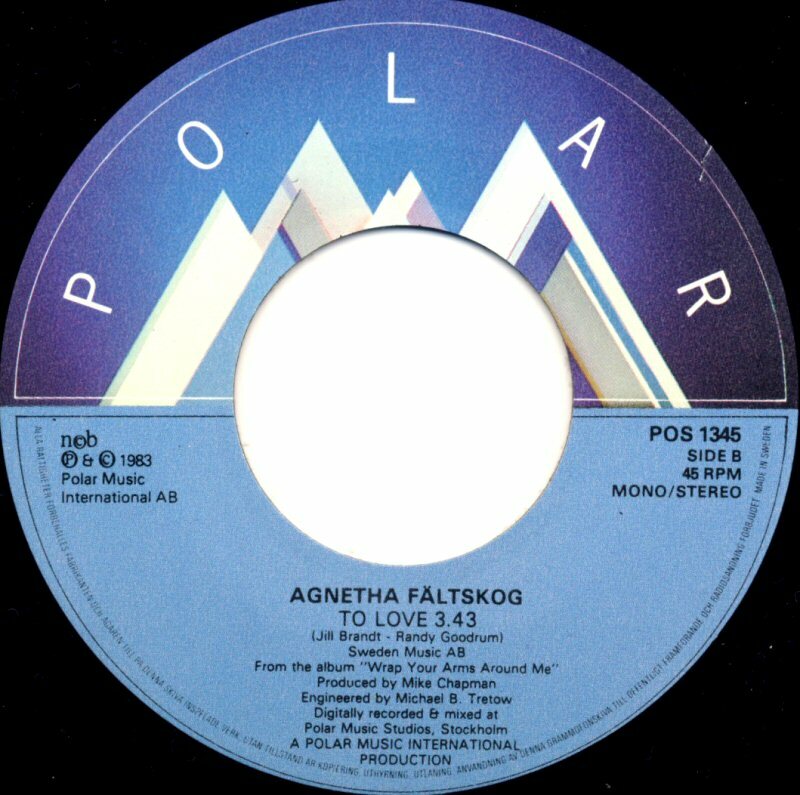 It entered the UK chart on August 13th, 1983 and stayed there for 5 weeks reaching #44. 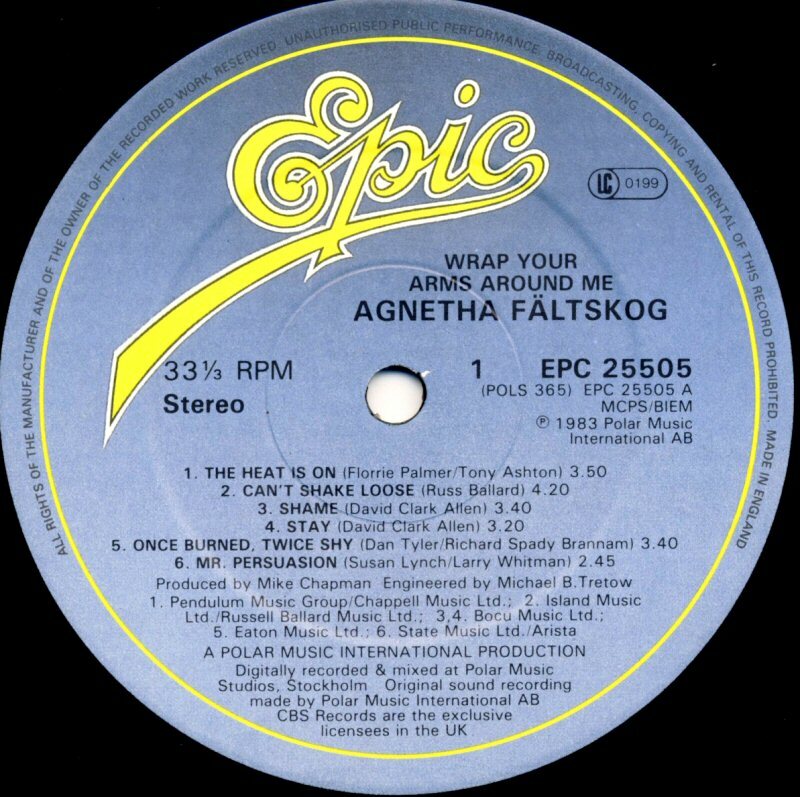 Probably one of the rarest releases was the British 12" with "Wrap Your Arms Around Me" (full length version) on the side A and two tracks on the side B: "Take Good Care of Your Children" and the extended 7.56 version of "The Heat Is On". In West Germany the single was released first in October and it peaked at #30. 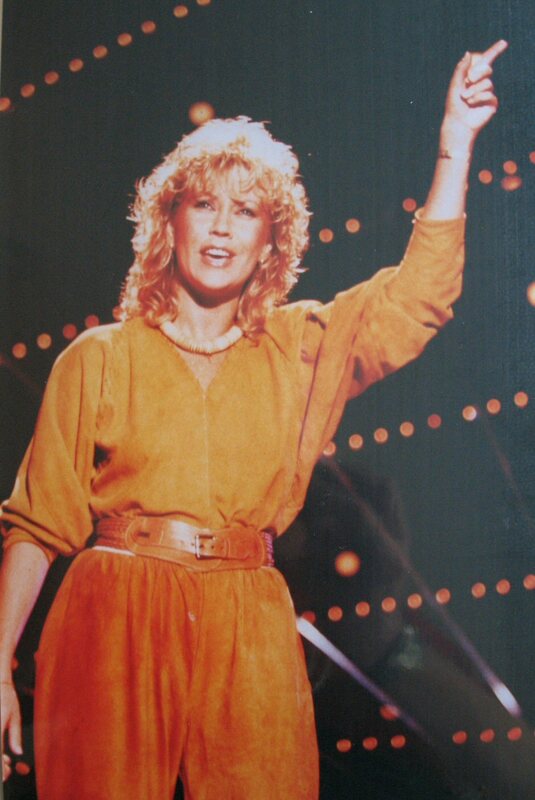 In South Africa "Wrap Your Arms Around Me" was much more successful and climbed up to the position no 2 in November 83. 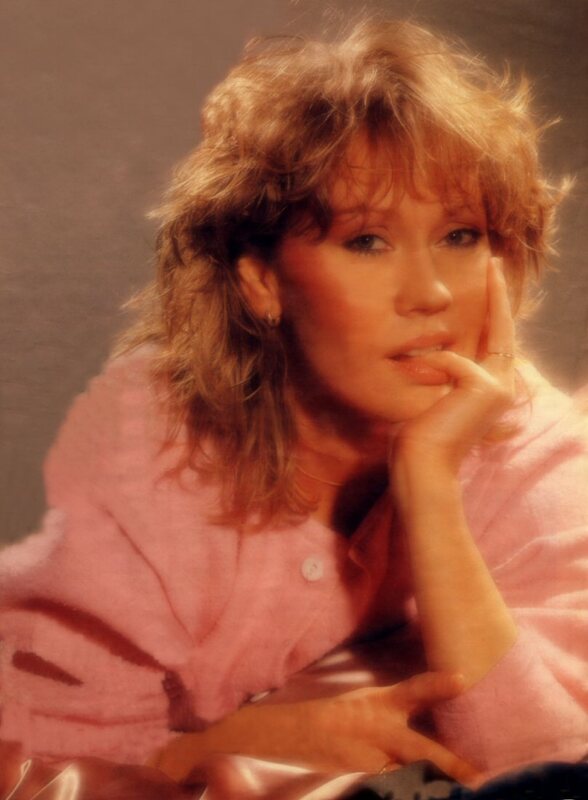 The single reached #5 in Holland, #15 in Ireland, #20 in Austria. 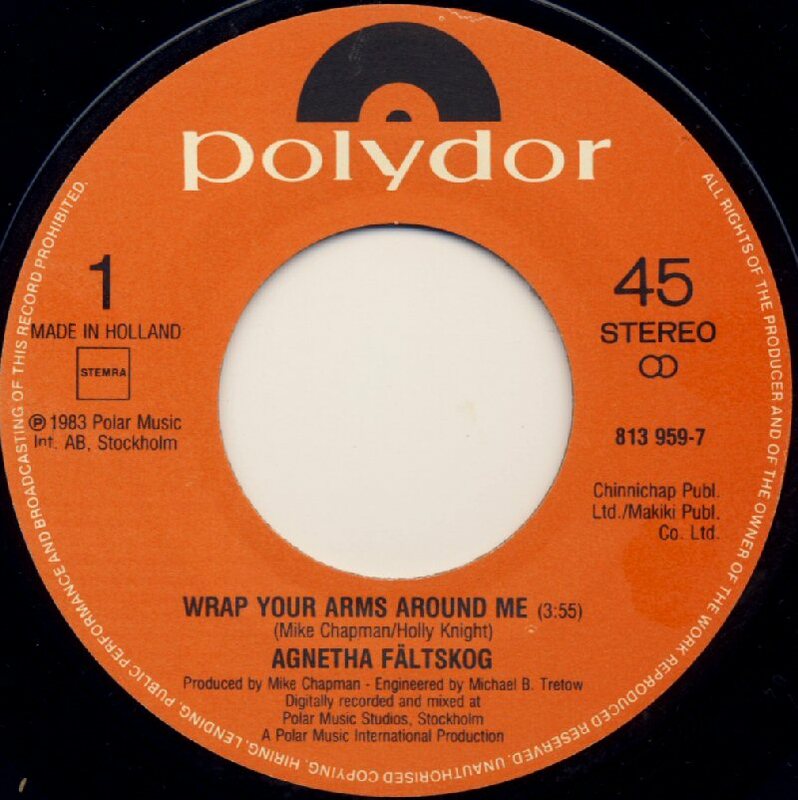 The only country where "Wrap Your Arms Around Me" reached the top was Belgium. 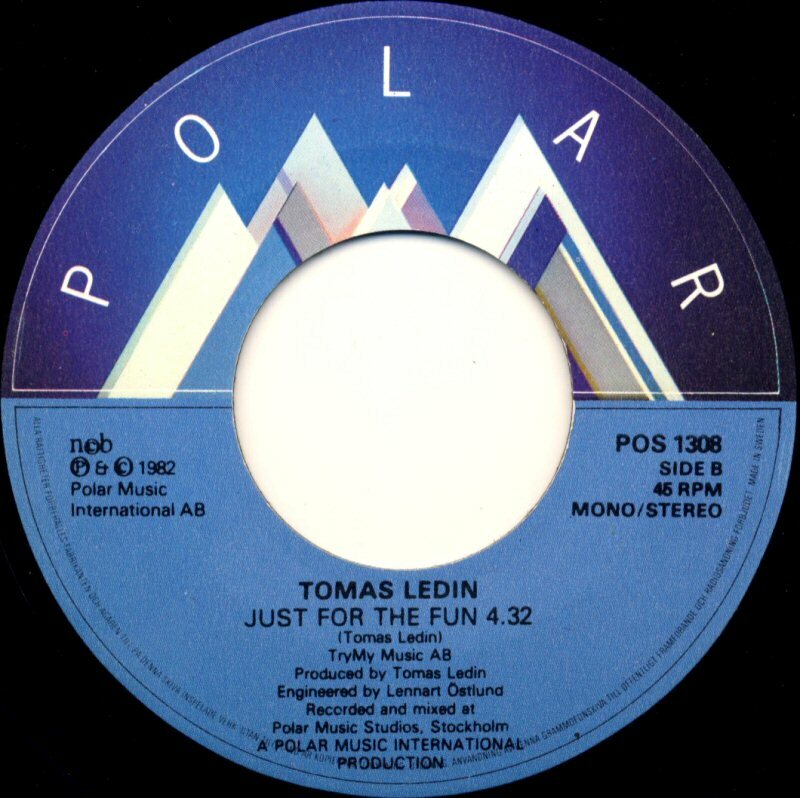 The single entered the French chart in December 1983 - it peaked at #47. 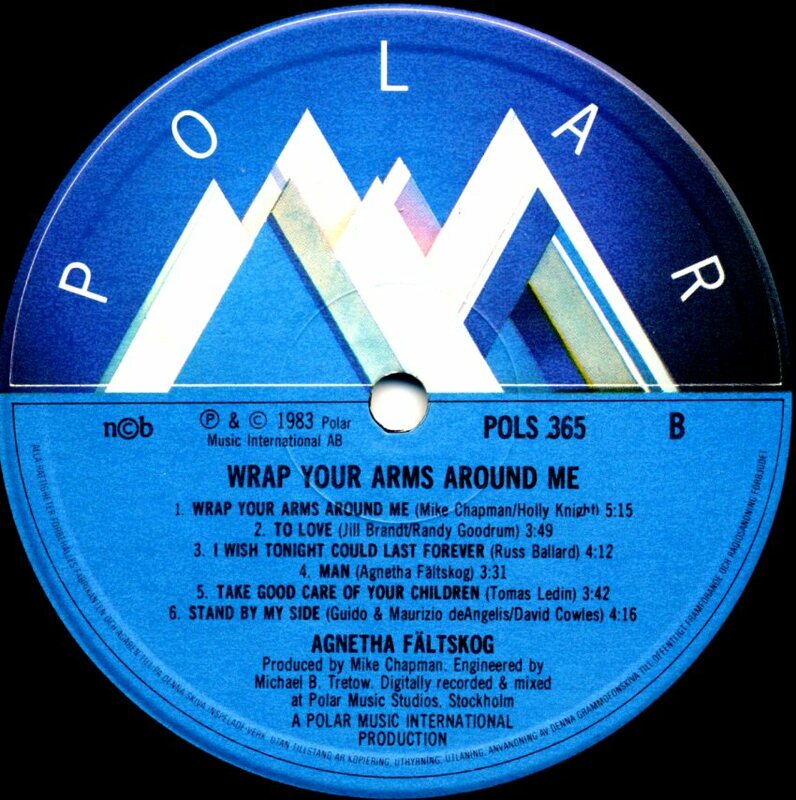 The second single selection in Italy featured the 3.50 version of "Wrap Your Arms Around Me" b/w "Can't Shake Loose". 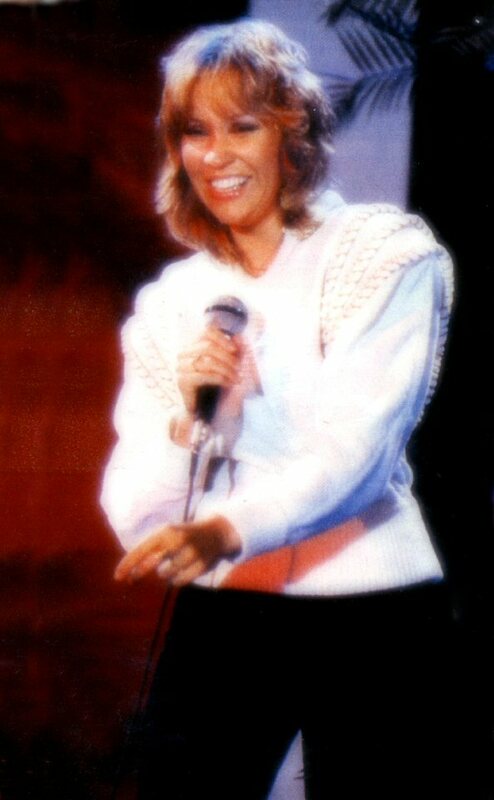 Agnetha appeared on Italian TV in the show "Riva Garda" where she performed "Can't Shake Loose" and twice "Wrap Your Arms Around Me". 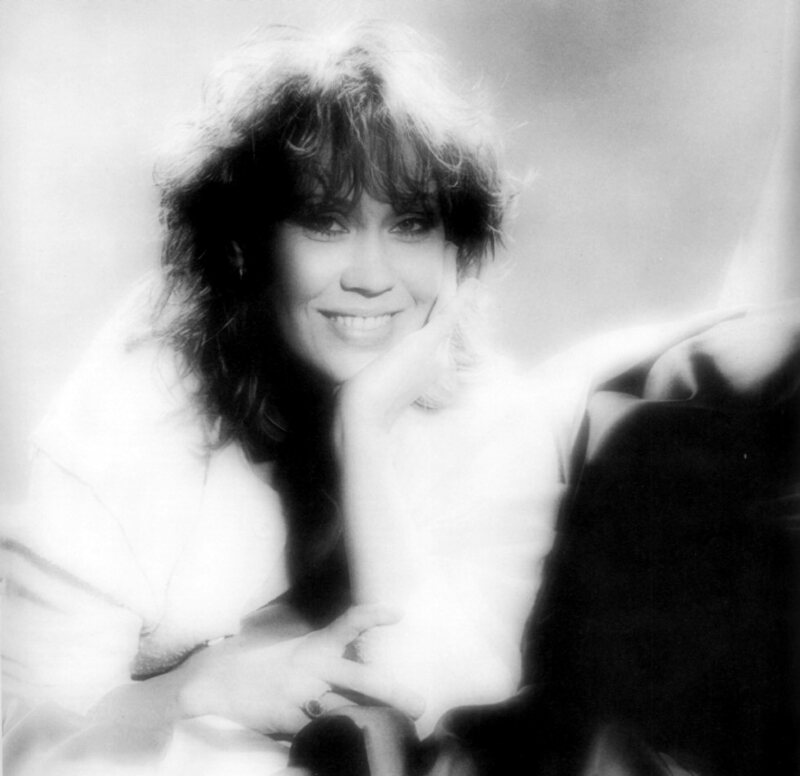 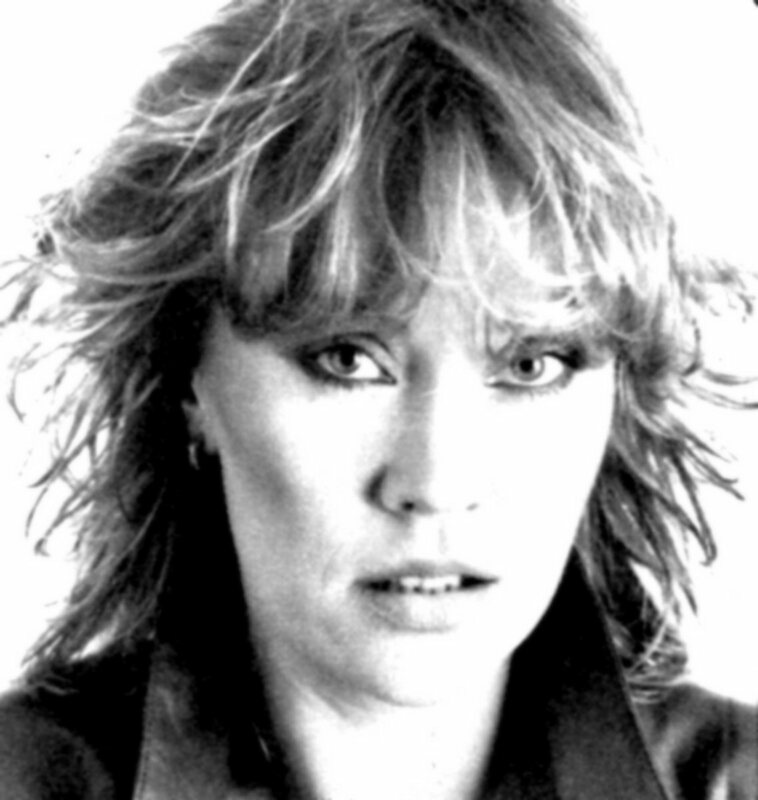 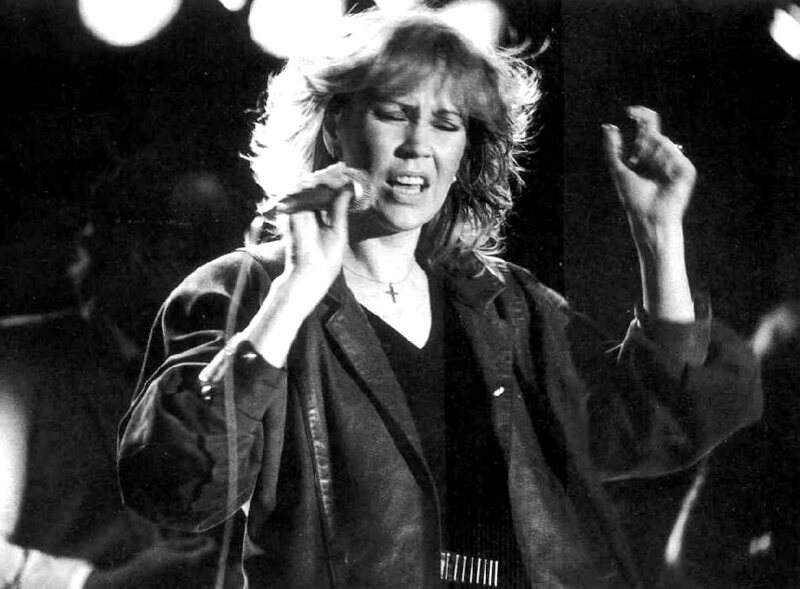 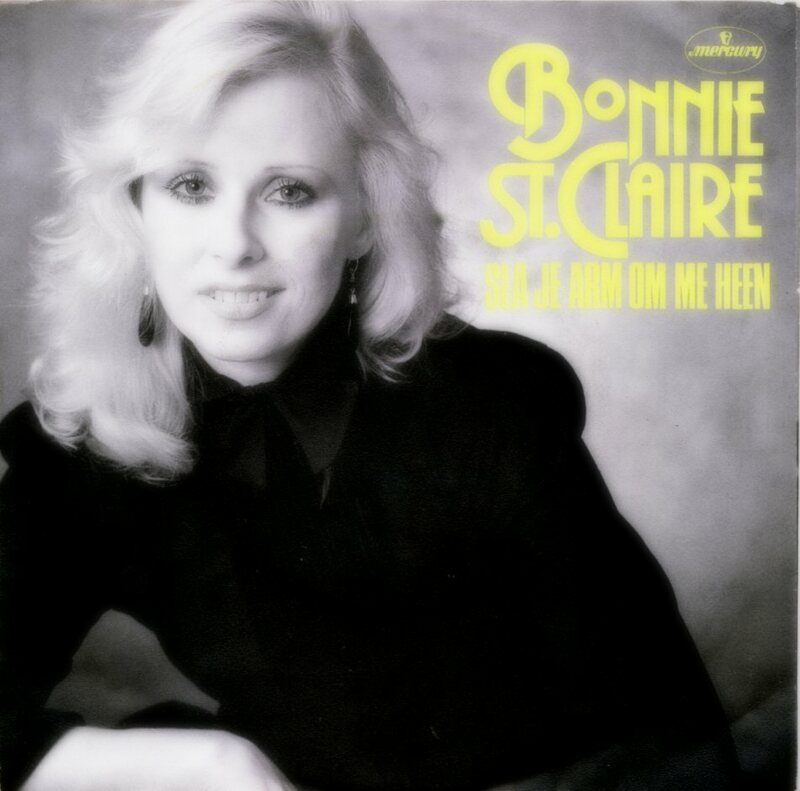 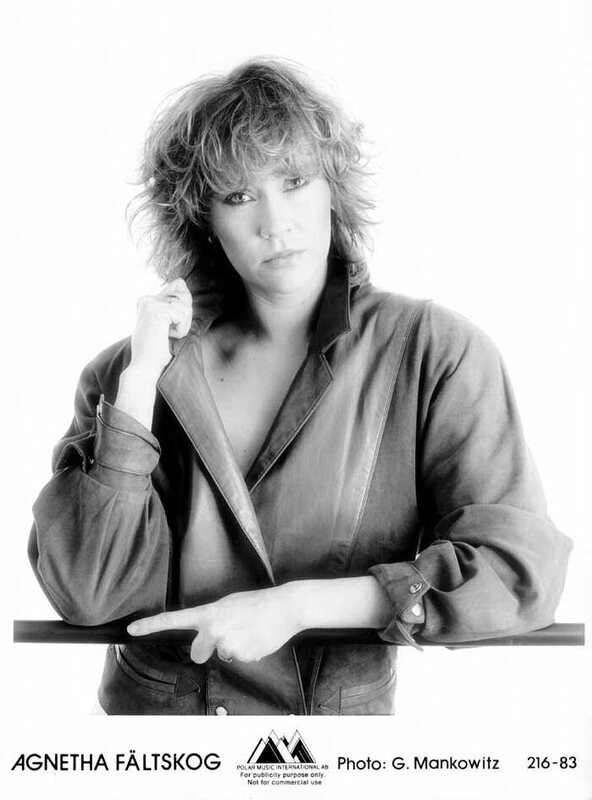 The Dutch pop singer Bonnie St. Claire made a cover on "Wrap Your Arms Around Me" and released as a single in Holland in 1983. 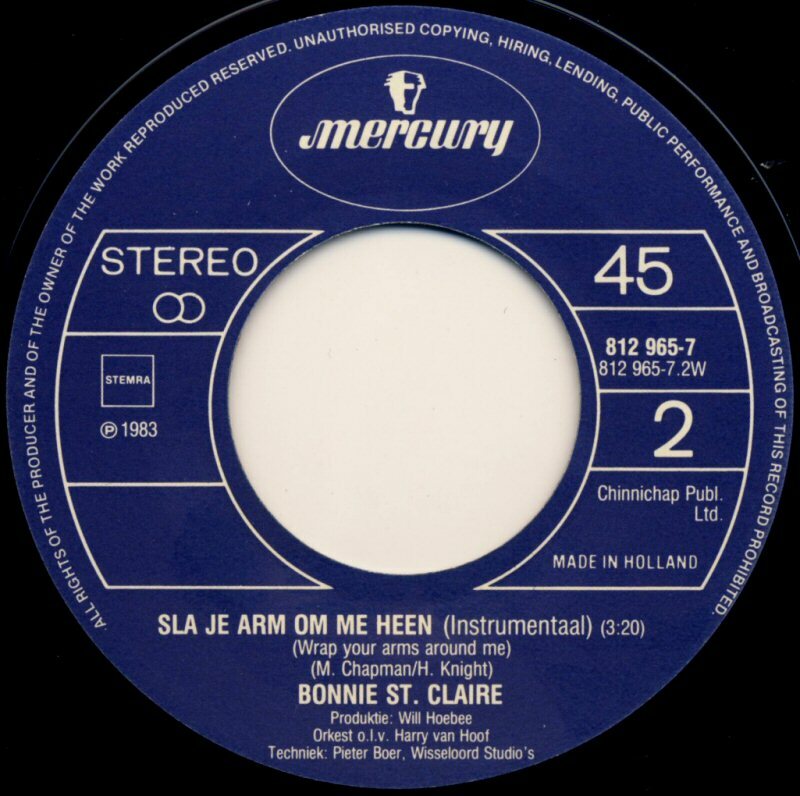 The A-side contained a vocal version and the B-side featured an instrumental version of the song entitled in Dutch "Sla je arm om me heen". 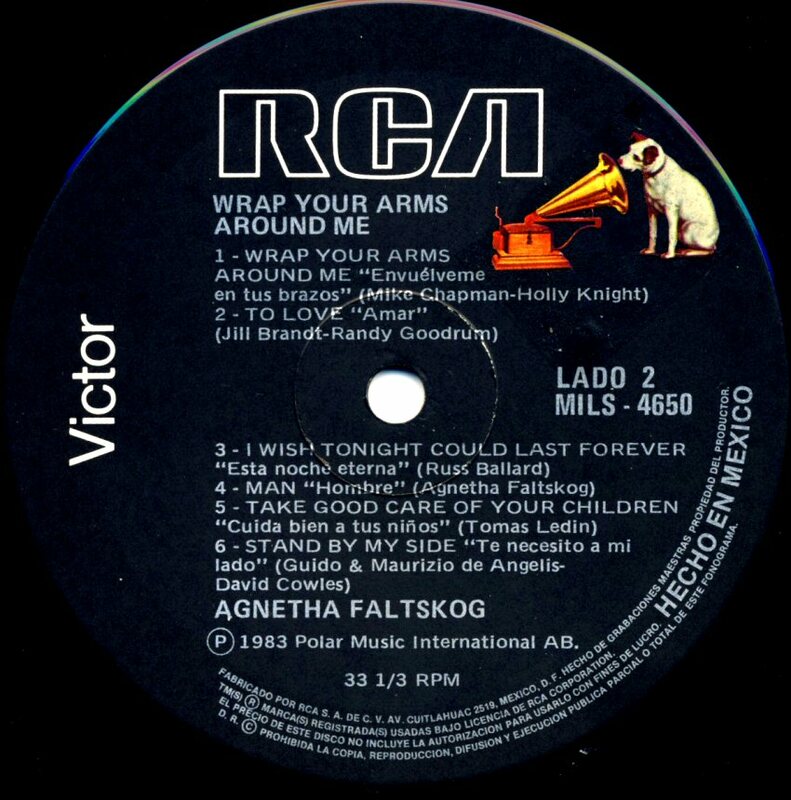 The single entered the Dutch chart on July 16th, 1983 where it stayed for 10 weeks peaking at #11. 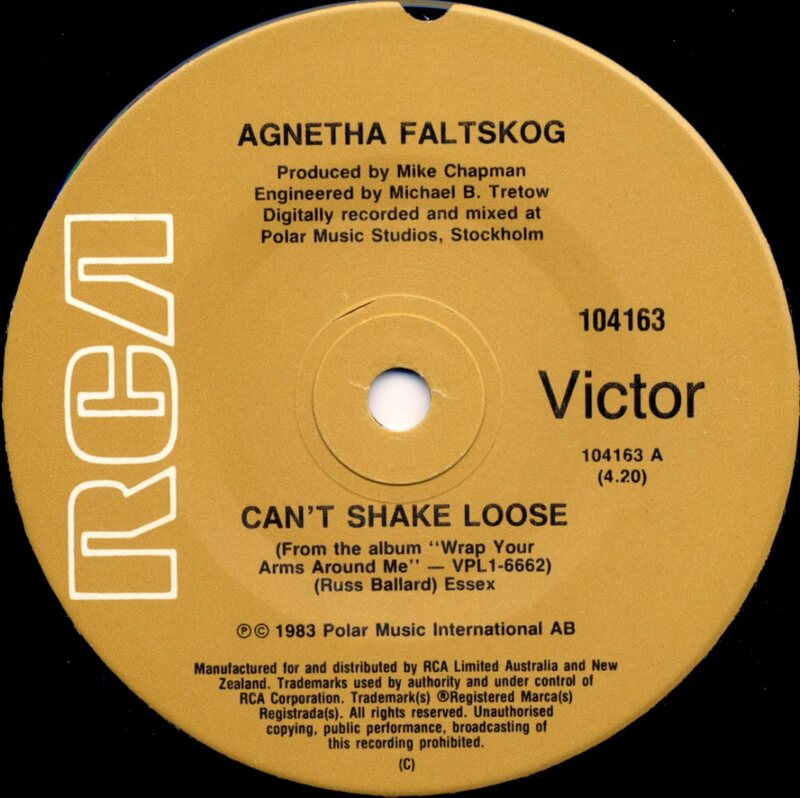 "Can´t Shake Loose" was chosen for the third single release from the album "Wrap Your Arms Around Me" and it featured the beautiful ballad "To Love" on the side B. 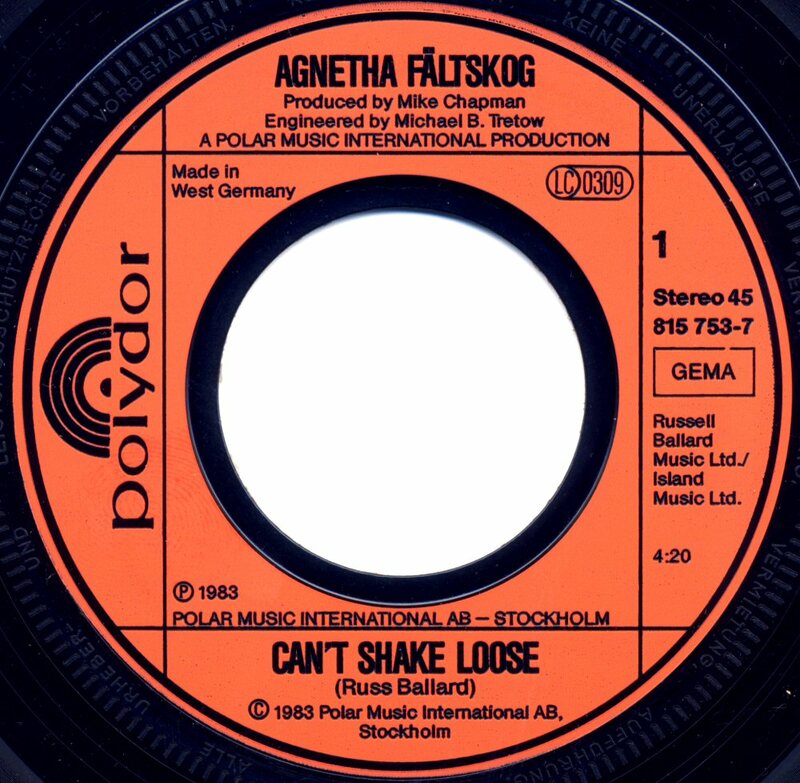 It didn't appear on German and Swedish charts. 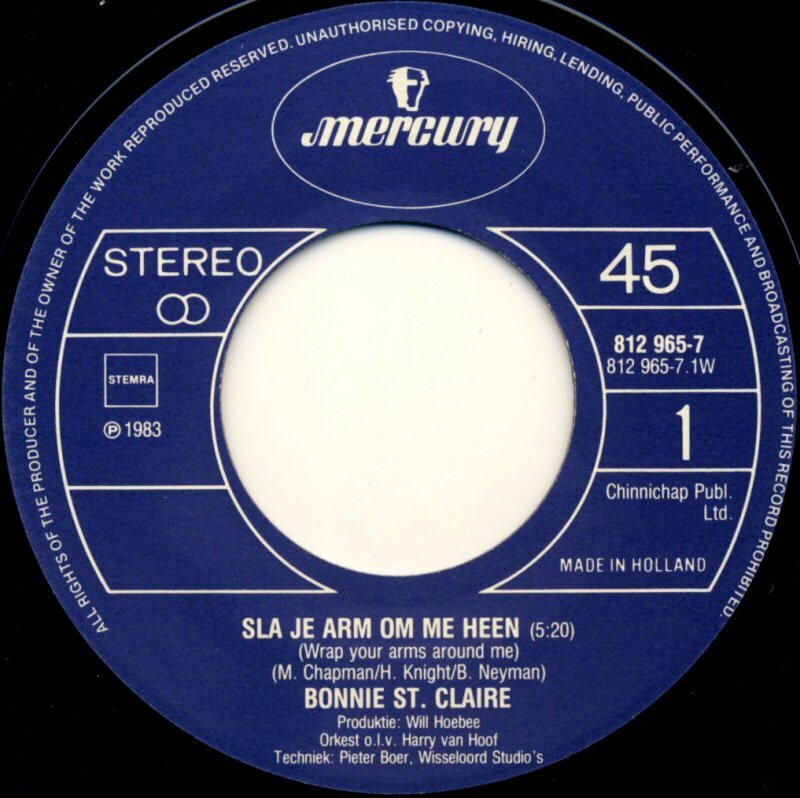 In Europe the single was most popular in Belgium (#22) and France (#42). 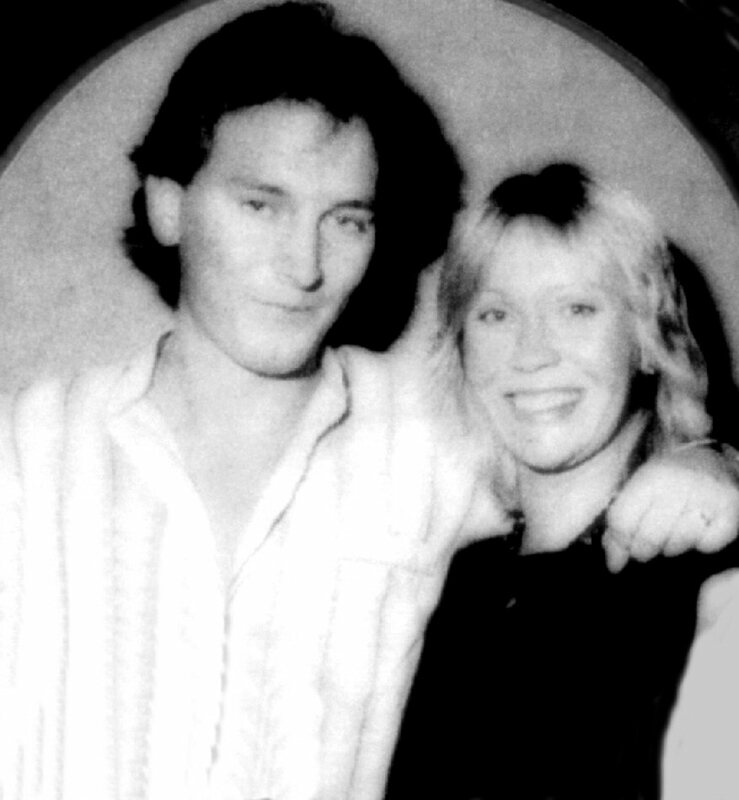 In the UK the single entered the chart on October 15th, 1983 where it stayed for 3 weeks peaking at #63. "Can't Shake Loose" was even released in the UK as a picture disc. 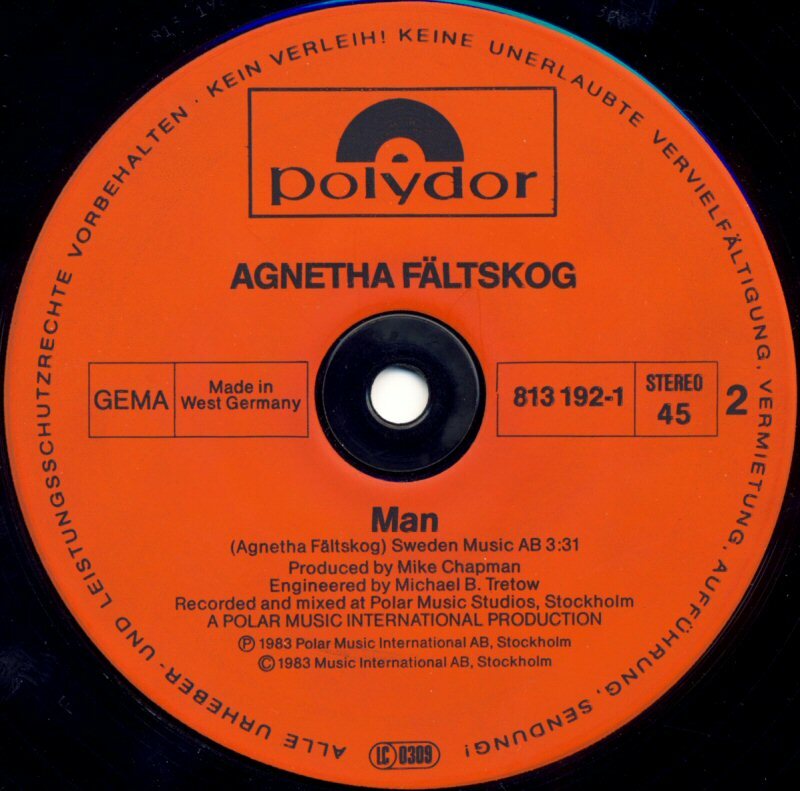 The single became not successful in West Germany where it did not enter the single chart. 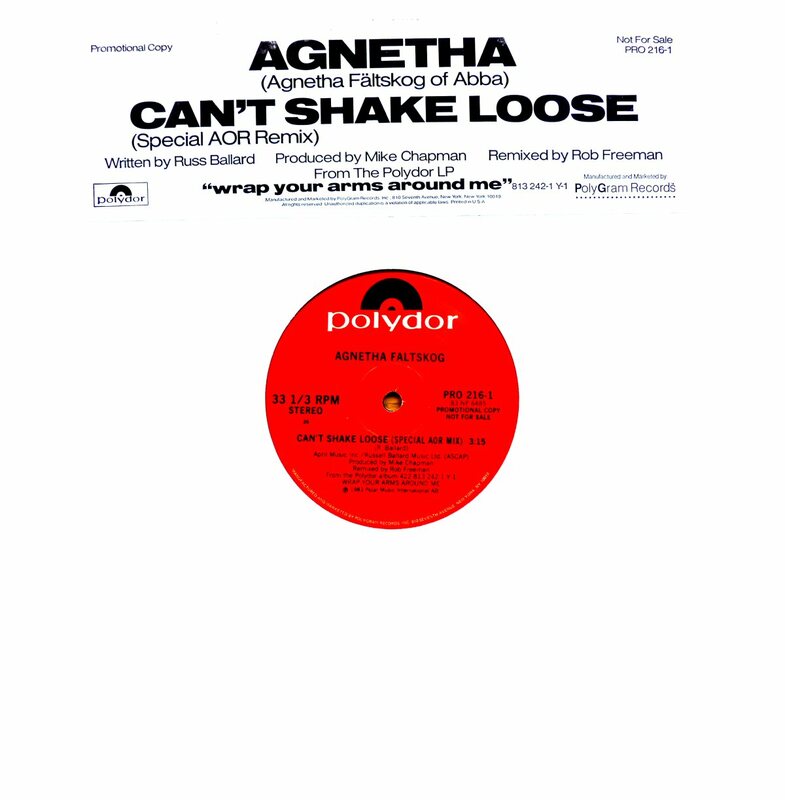 The single "Can't Shake Loose" (edit 3.15) and "Man" was released in USA in the summer 1983. The single entered the US chart on August 27th, where it stayed for 15 weeks peaking at #29 which meant quite big success for Agnetha as a solo artist. 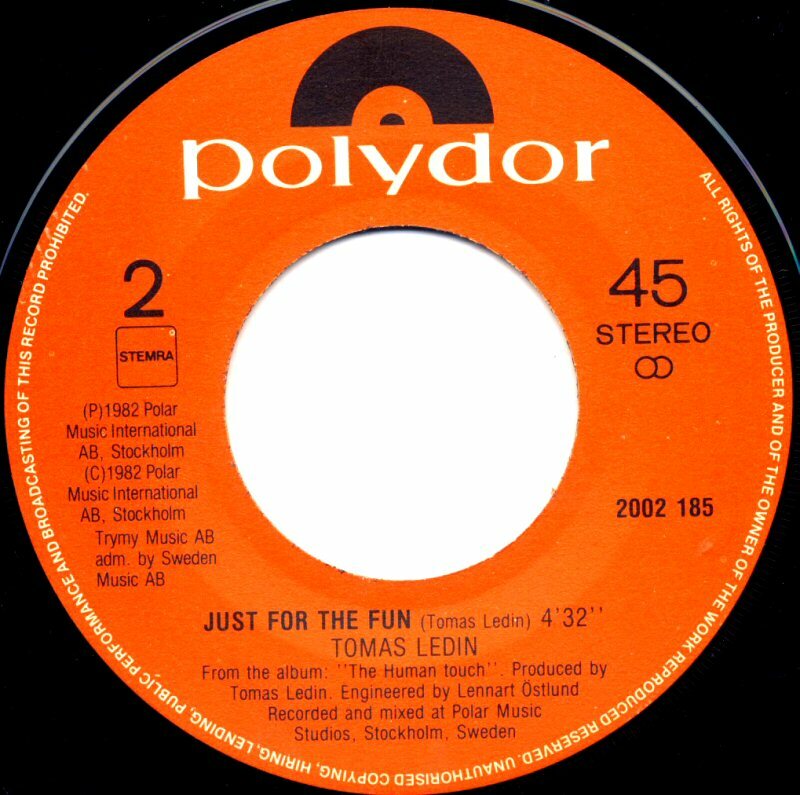 A special AOR mix of the song was released in a limited edition. 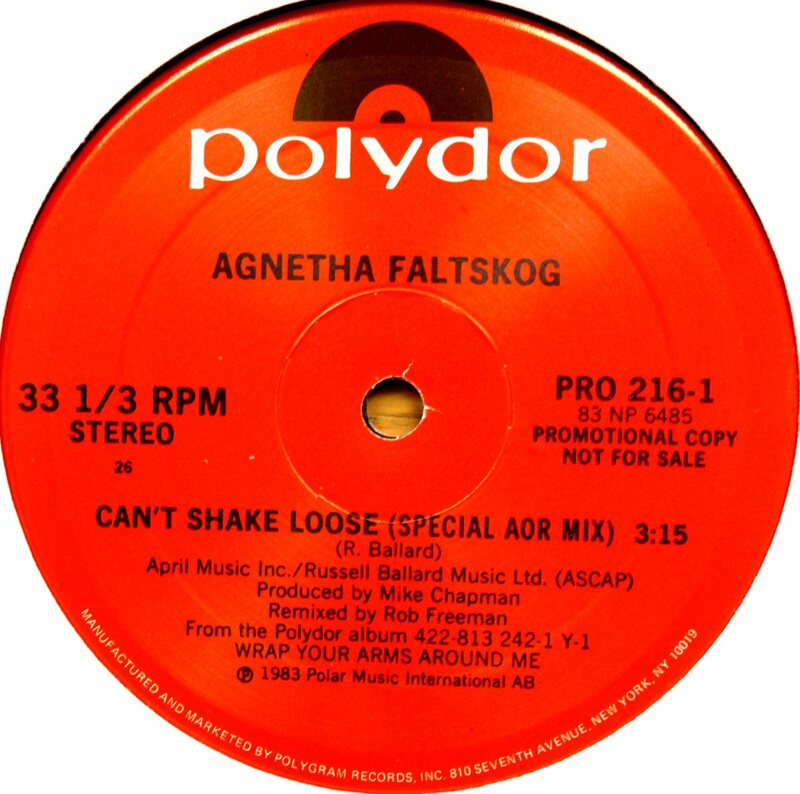 The promotional maxi single contained the song shortened from 4.20 to 3.15 and additionally remixed. 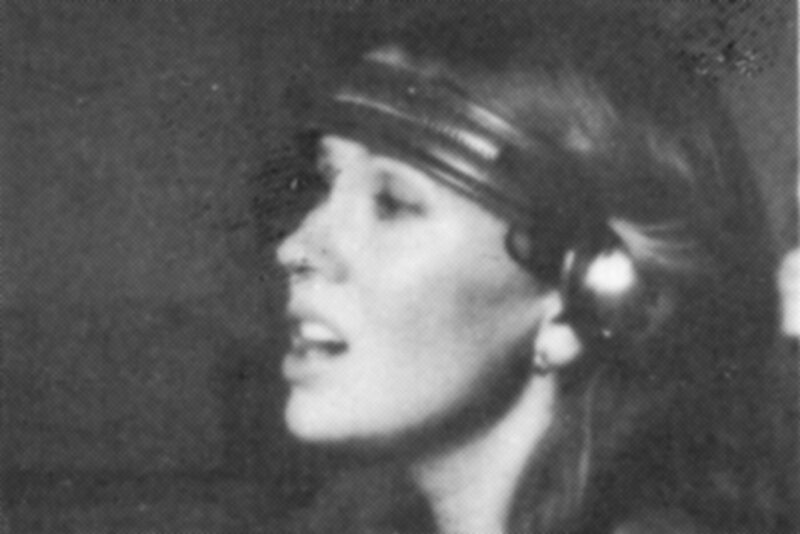 This version sounded a bit lighter and more rocky. 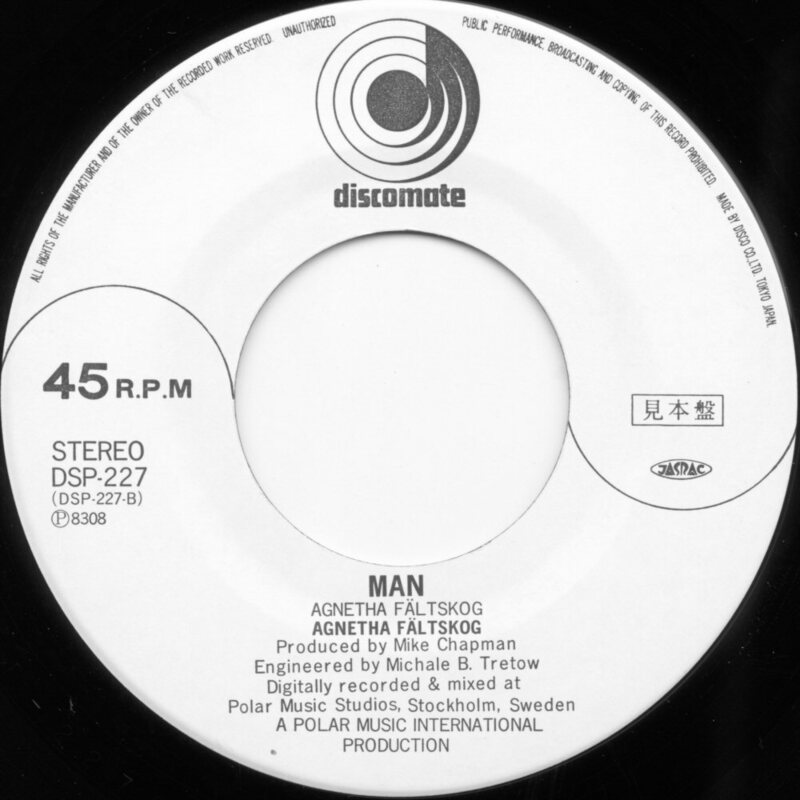 The Canadian edition of the single was released in August 1983 and it contained the 3.15 edit on side A and the LP version of "Man" on side B. 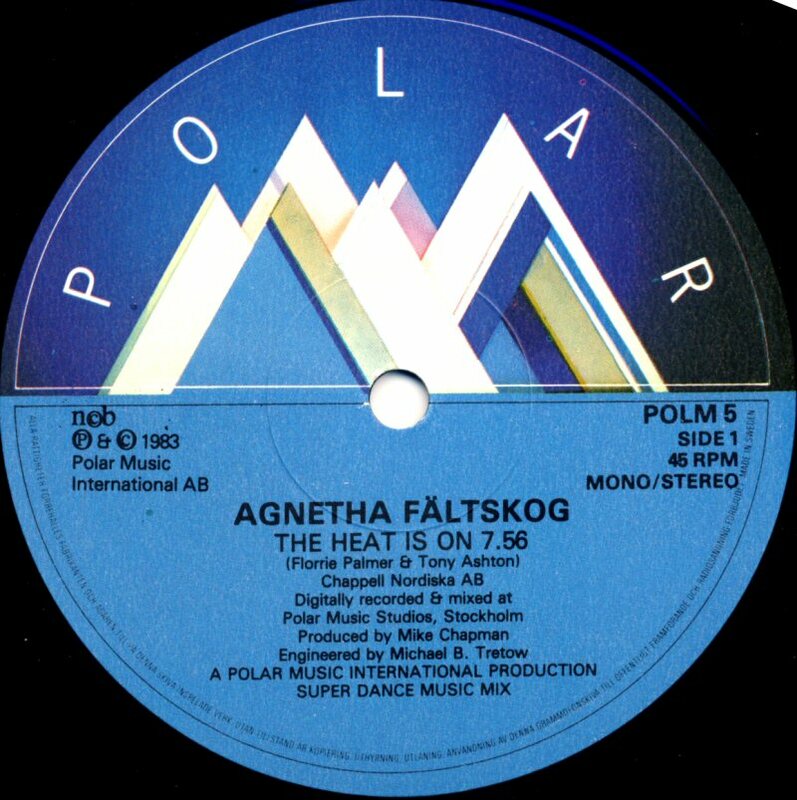 The label was completely different to the US edition of the single. 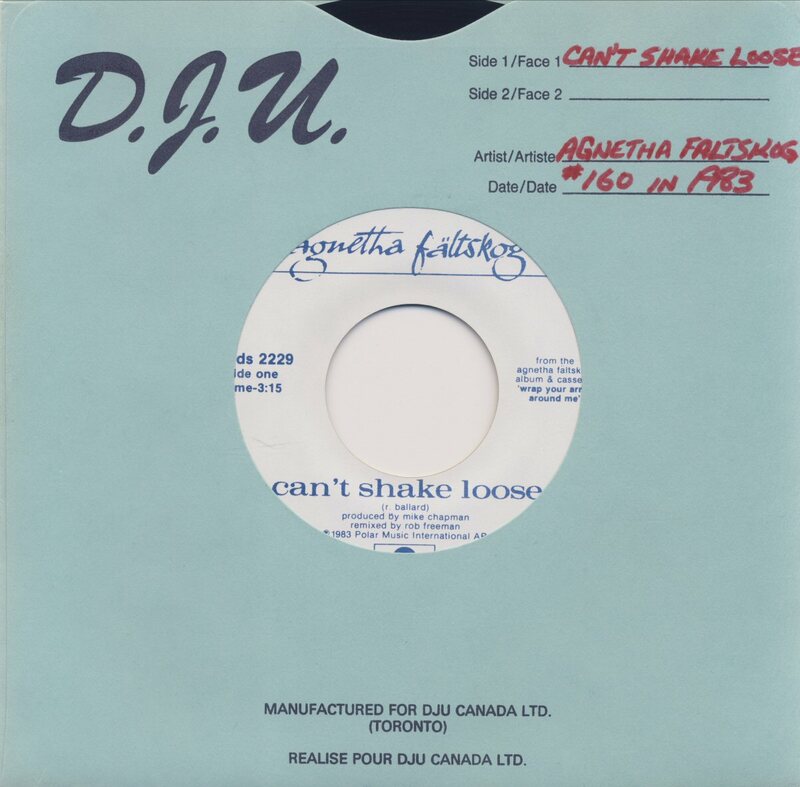 "Can't Shake Loose" reached #26 on the Canadian chart. 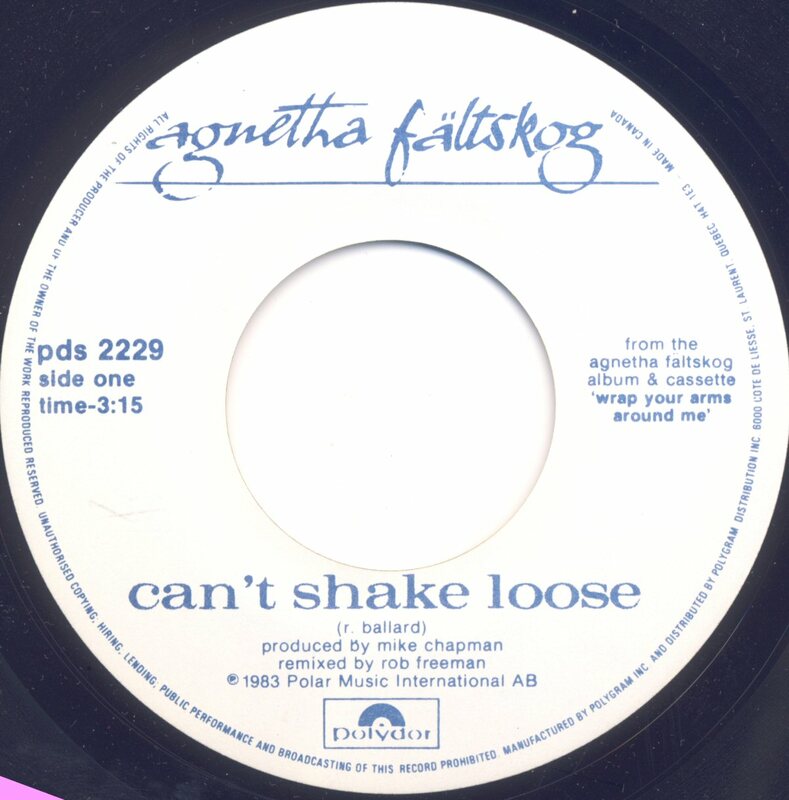 On July 21st, 1983 the single "Can't Shake Loose" b/w "Man" saw its release in Japan. 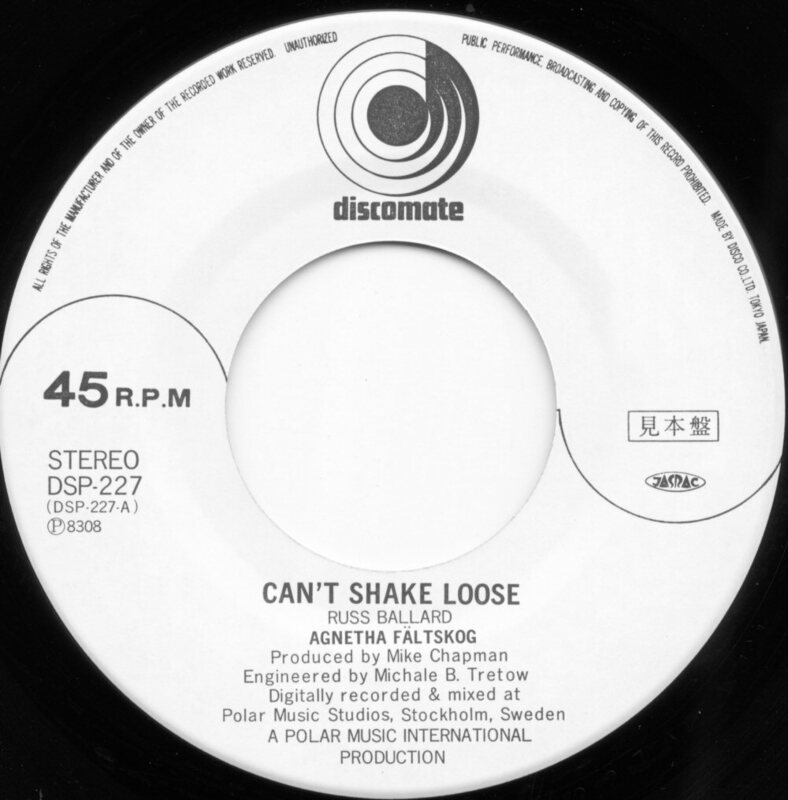 The single "Can't Shake Loose"/"Man" entered the Australian chart on September 19th, 1983 where it stayed for 4 weeks peaking at #76. 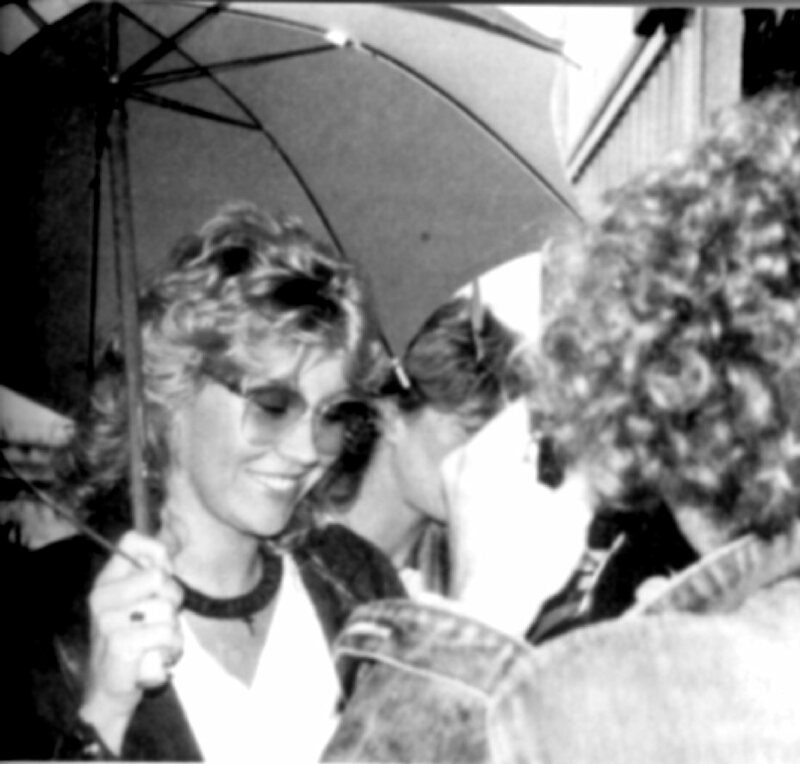 Other scenes were filmed in the city of Kalmar: outside the city theatre and at the Kalmar castle. 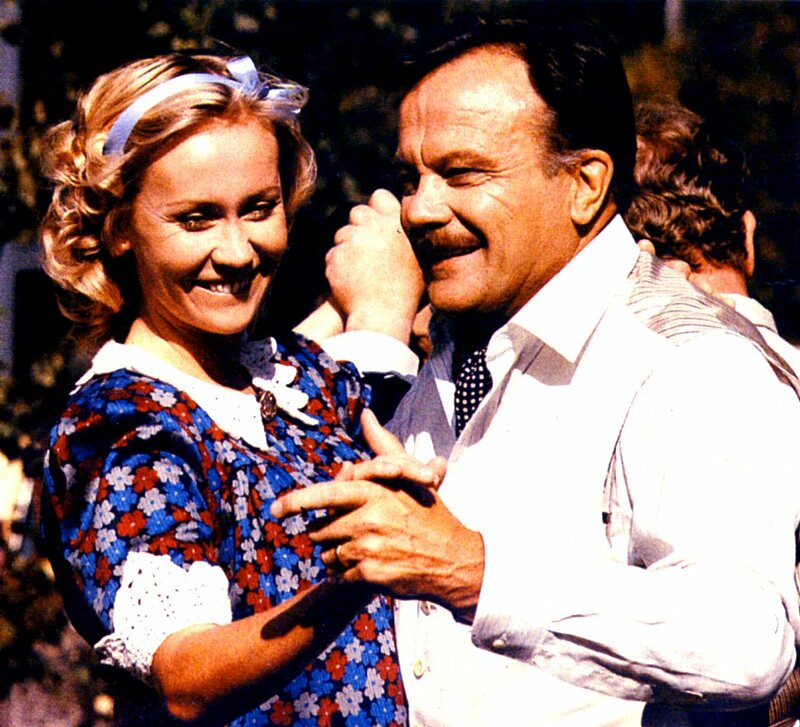 The interiors were though not filmed at the Kalmar castle but in the TV studio. 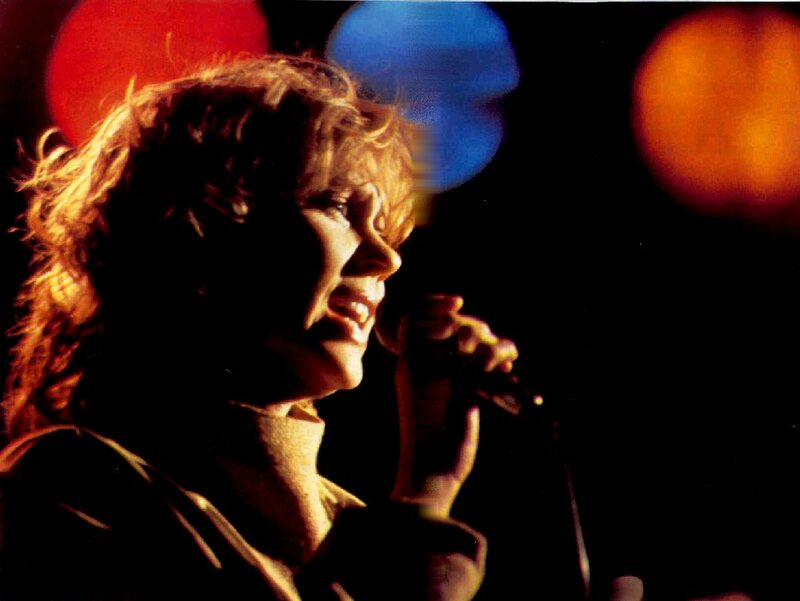 The man playing in the video is Swedish singer Mikael Rickfors. 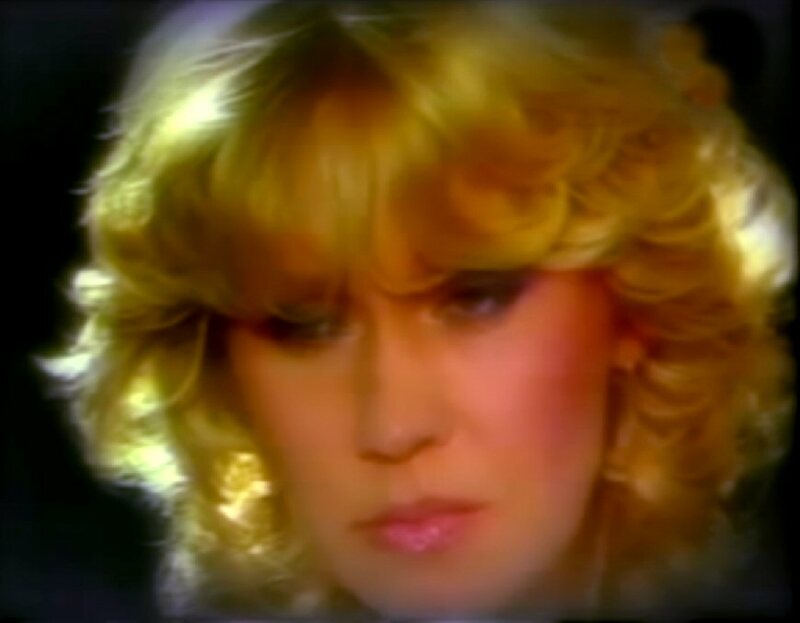 It took 4 days to complete this video. 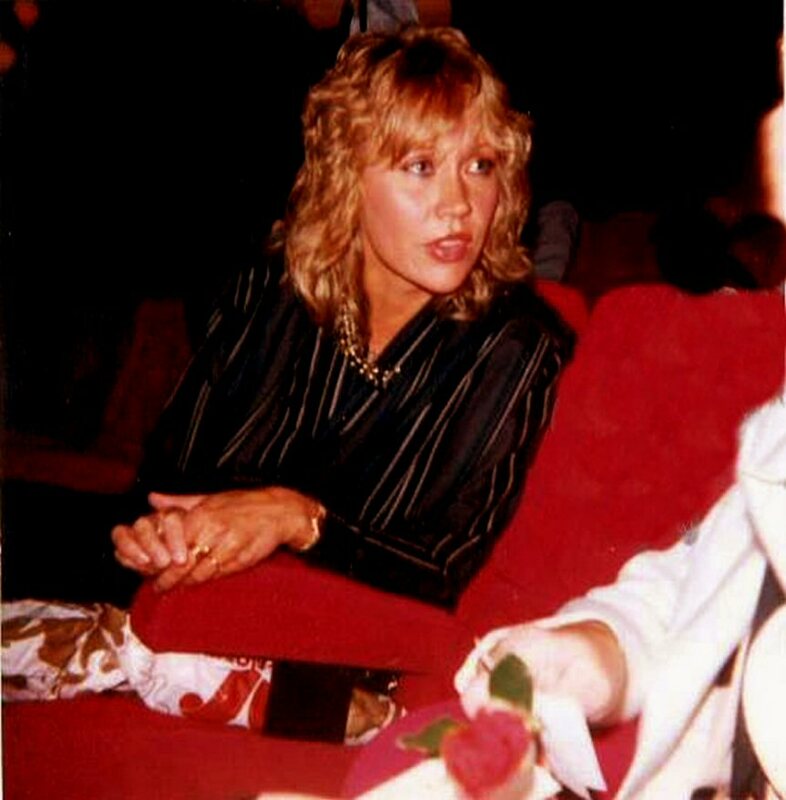 On August 7th, 1983 Agnetha was a special guest in a show hosted by Kjell Dabrowski on Swedish radio P1. 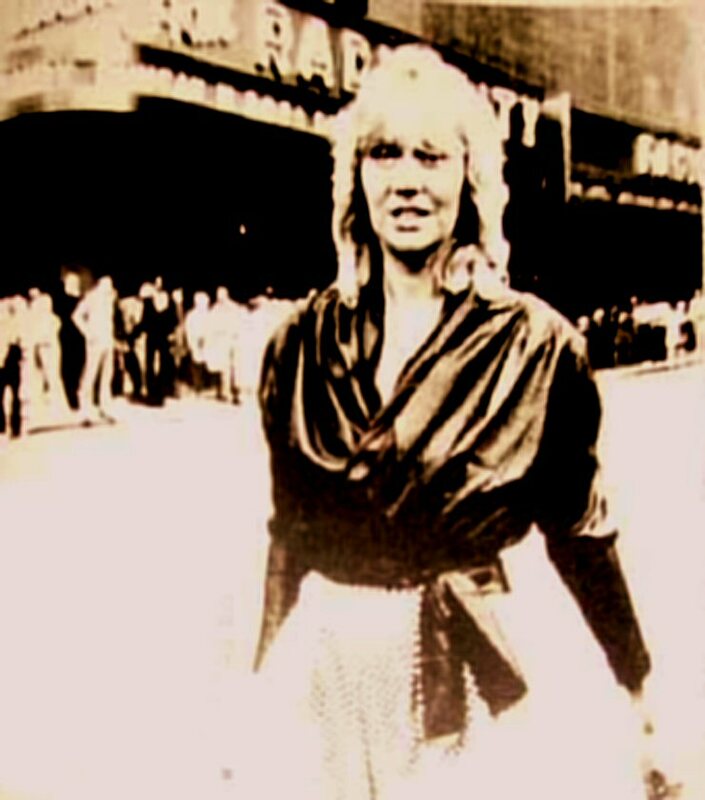 At the end of the summer ´83 Agnetha took "the big step" and went to USA to make some promotional work for the album and the latest single. 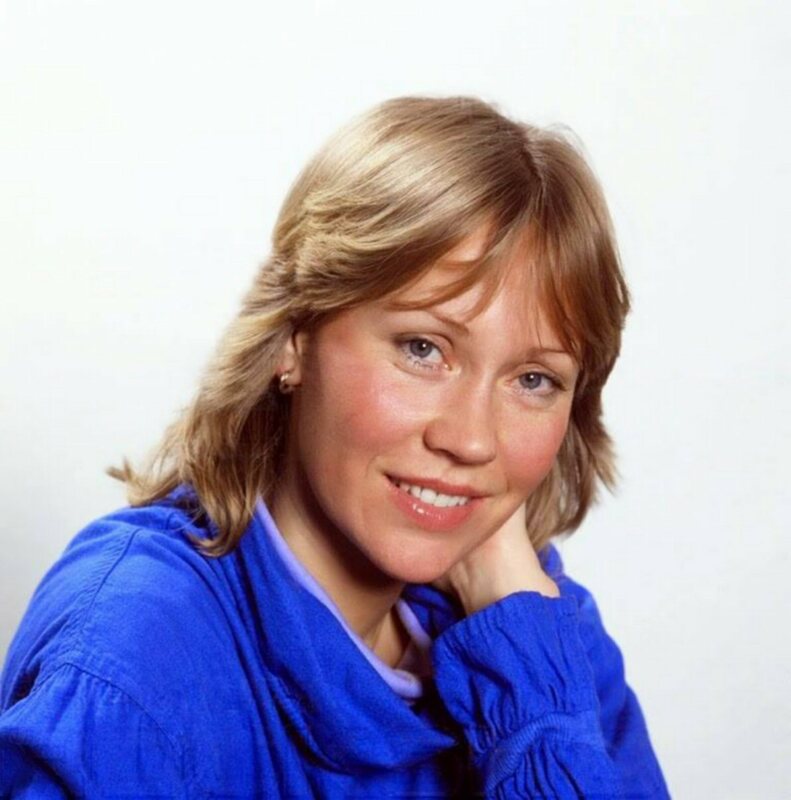 Agnetha appeared in one of the biggest TV shows in West Germany "Wetten, dass...?" on September 3rd, 1983 where she performed "The Heat Is On" and "Wrap Your Arms Around Me" as well as she gave a short interview. 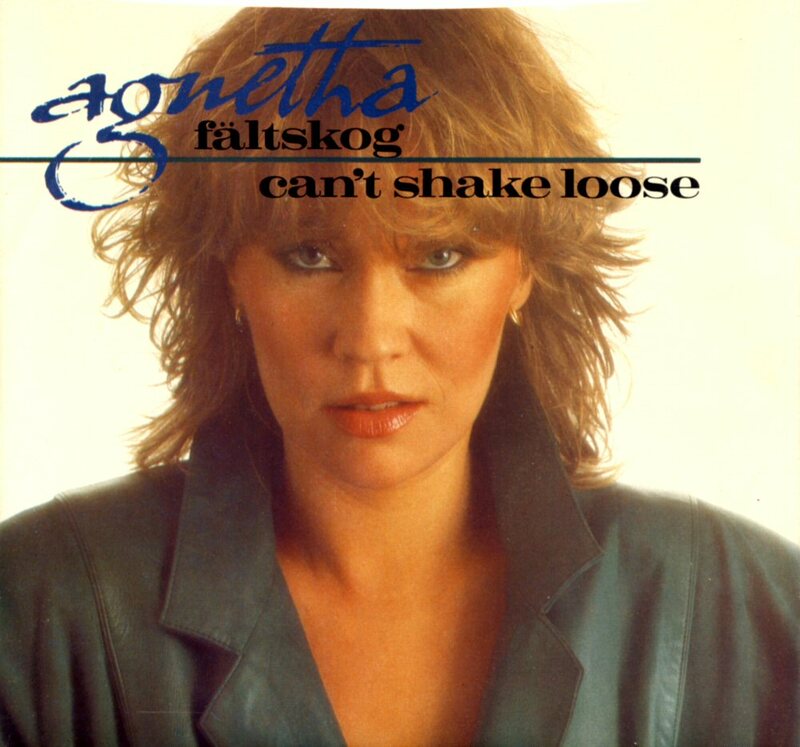 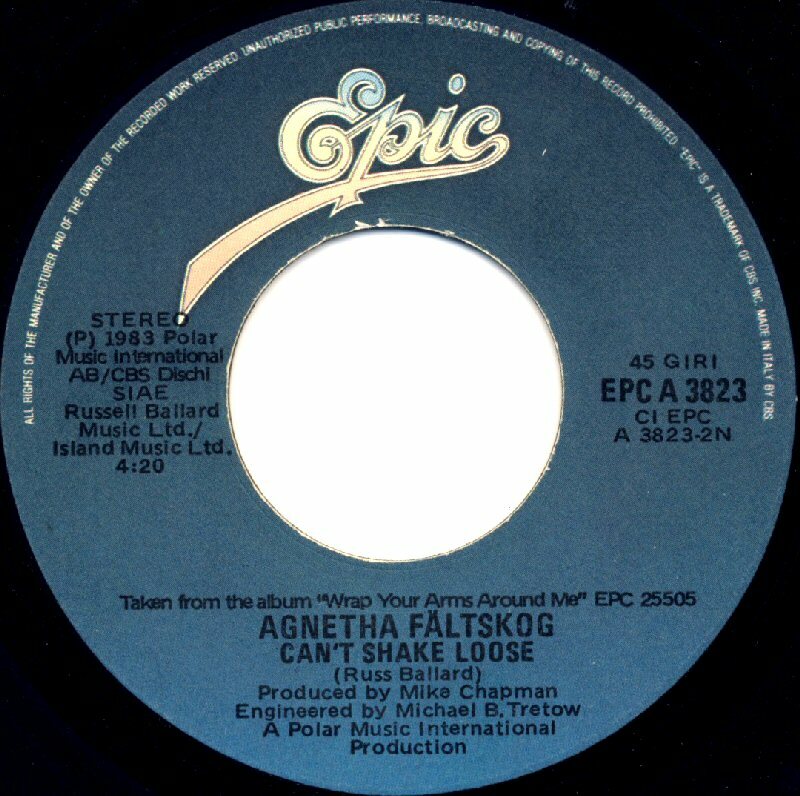 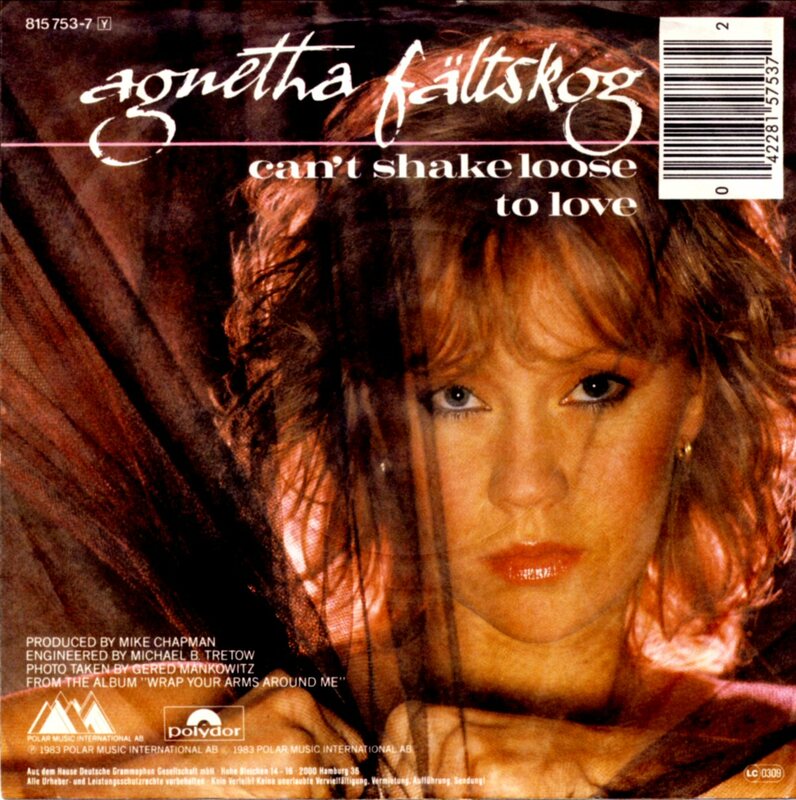 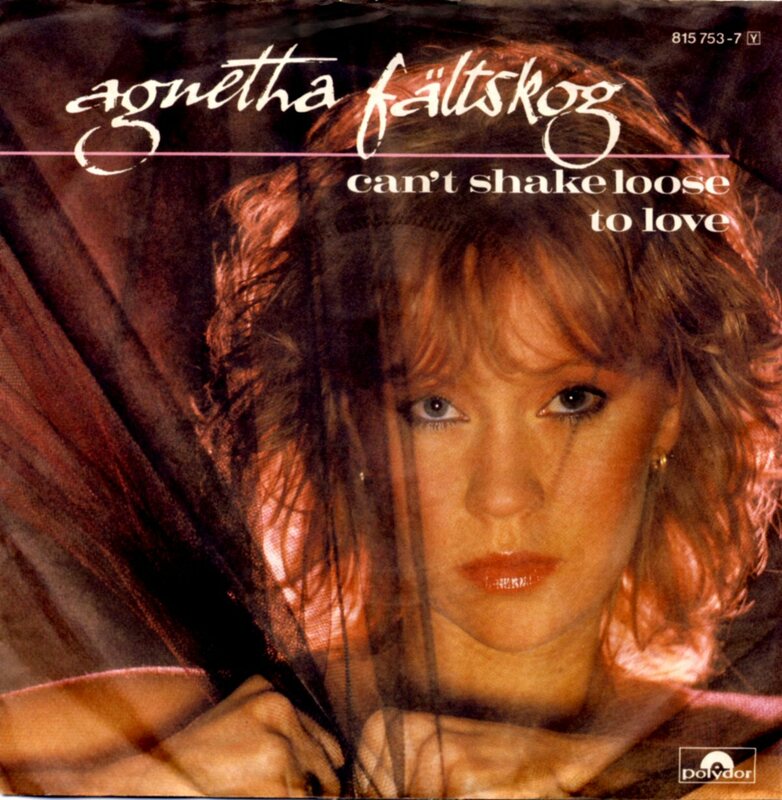 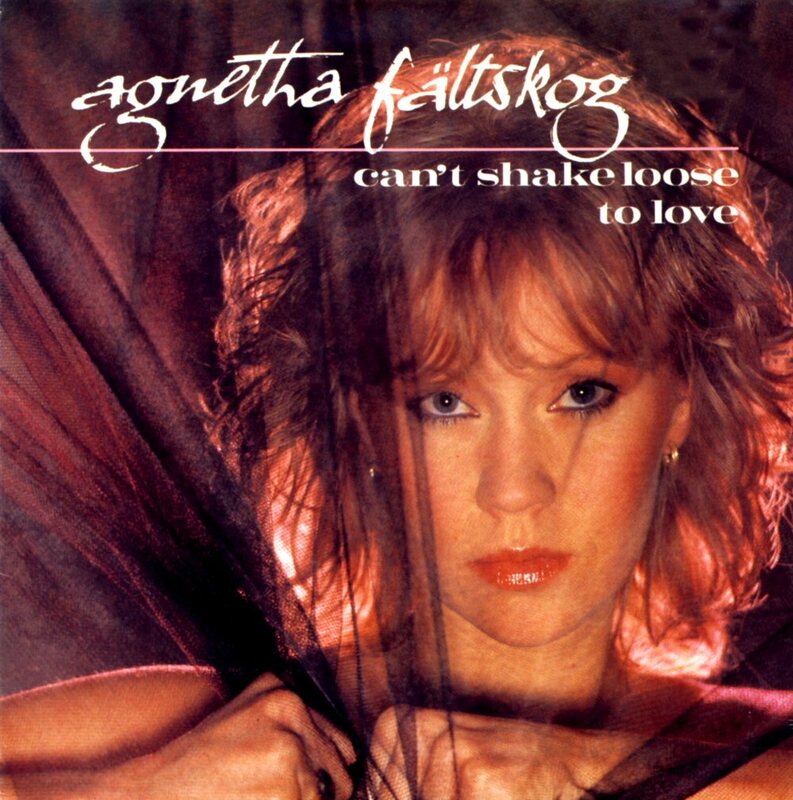 On September 30, 1983 Agnetha was back in England for promotion of her new single "Can't Shake Loose". 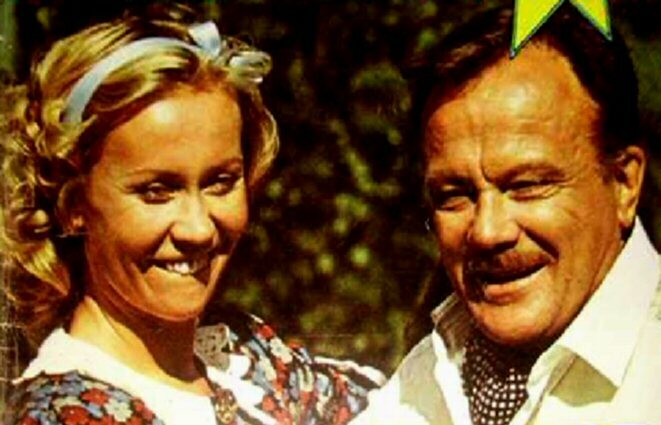 Almost everything went wrong... 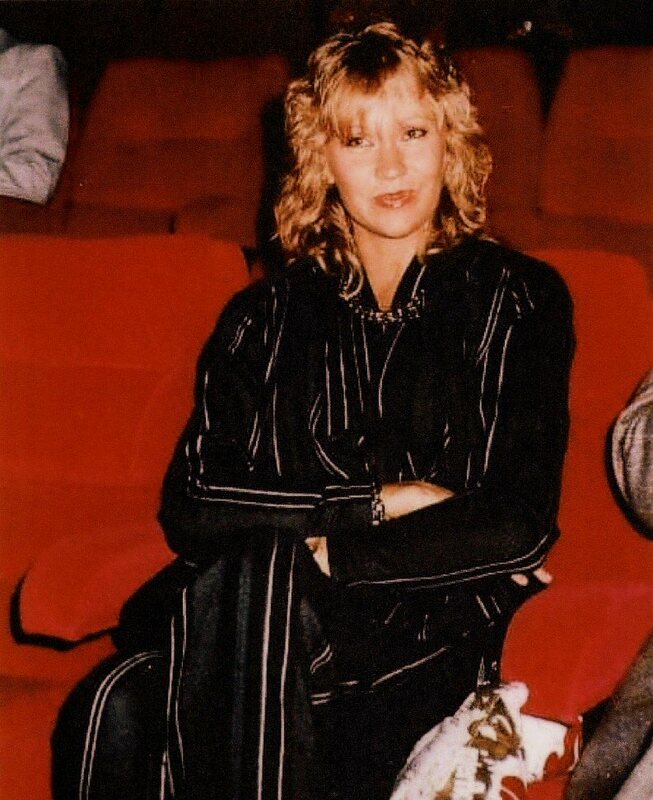 It started with the participation in the TV special "Late Late Breakfast Show" where Agnetha fell down some steps on stage and cut her elbow. 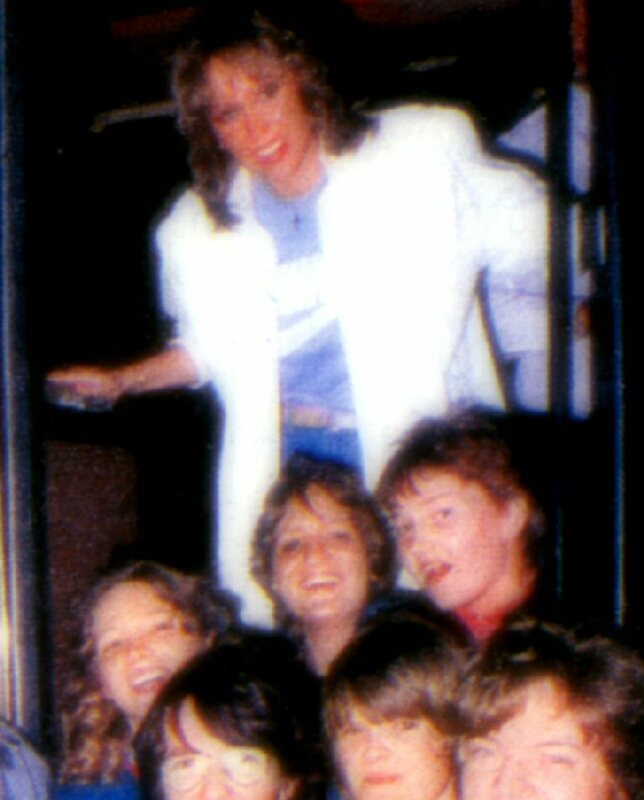 "When the floor manager missed my cue I stressed out going up the stairs and got there too soon. 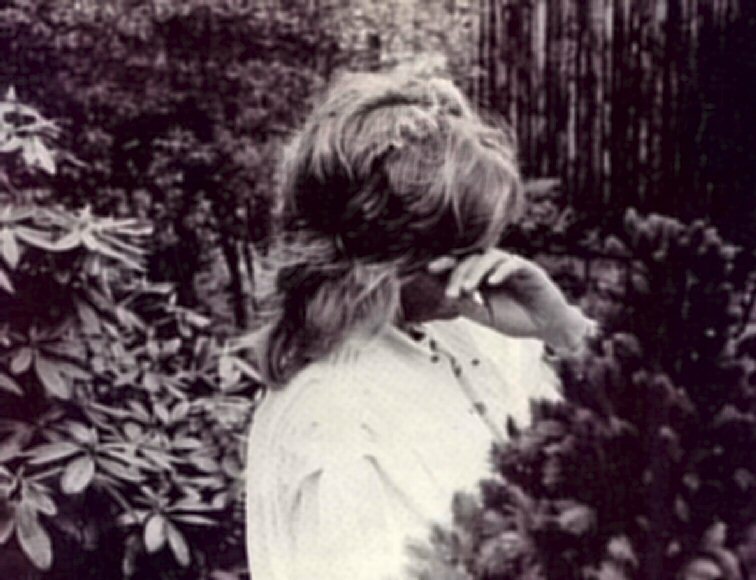 Quickly I took a step back so as not to be seen. 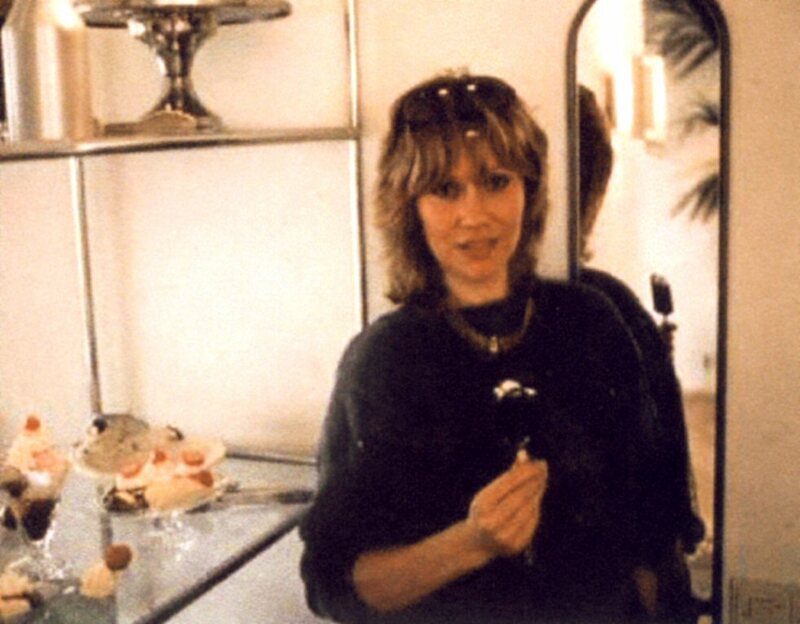 But there was nothing there! 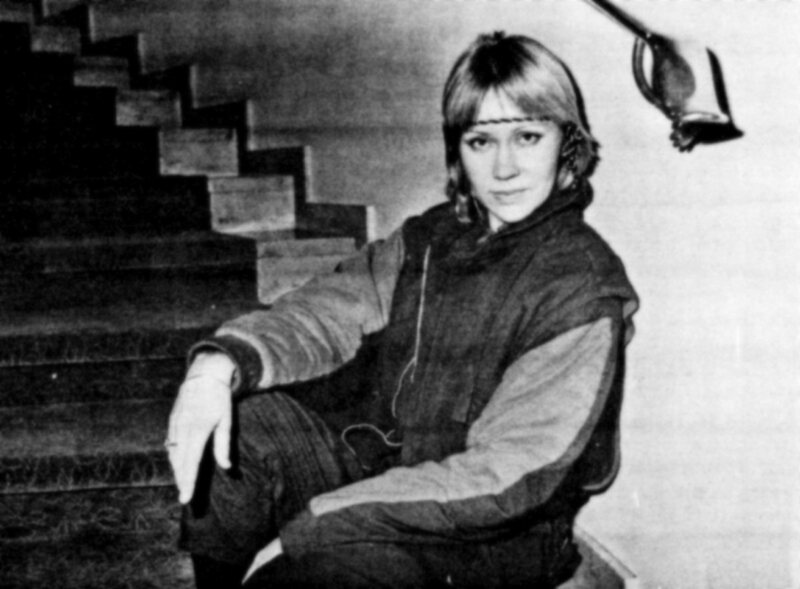 I fell backwards headlong into a hole in the specially built stairs. 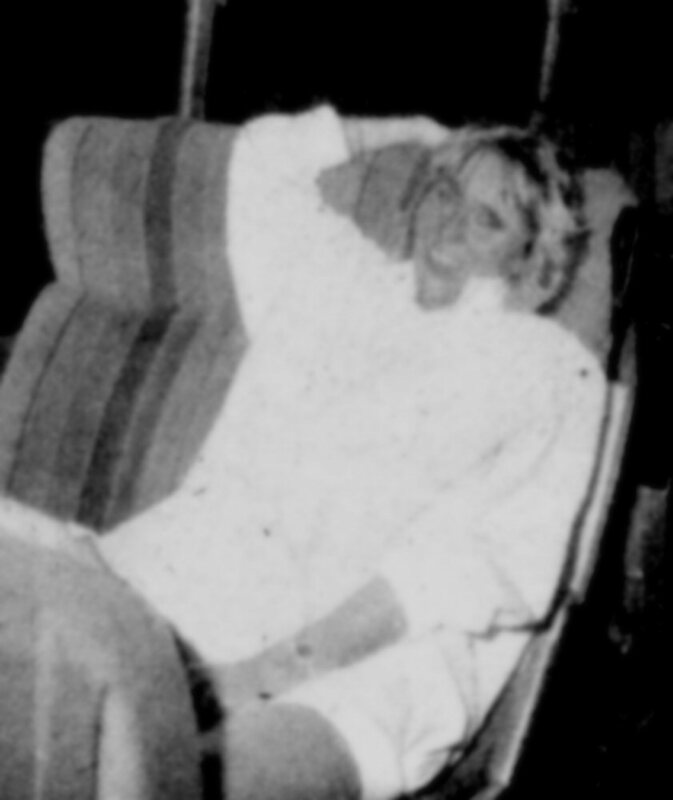 I lay there, unable to get up while I listened to the live announcement". 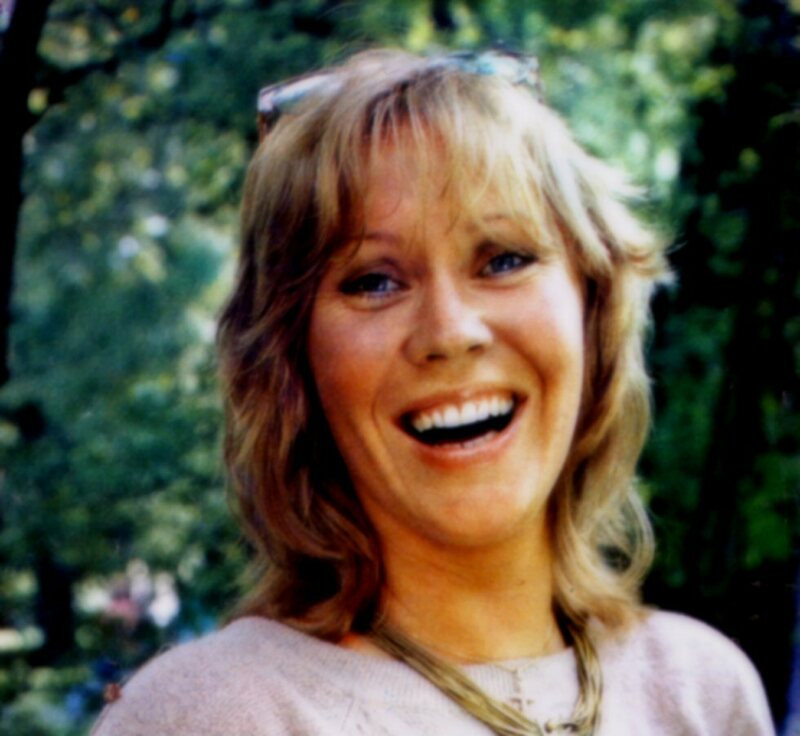 Agnetha did a good entrance though laughing and joking. 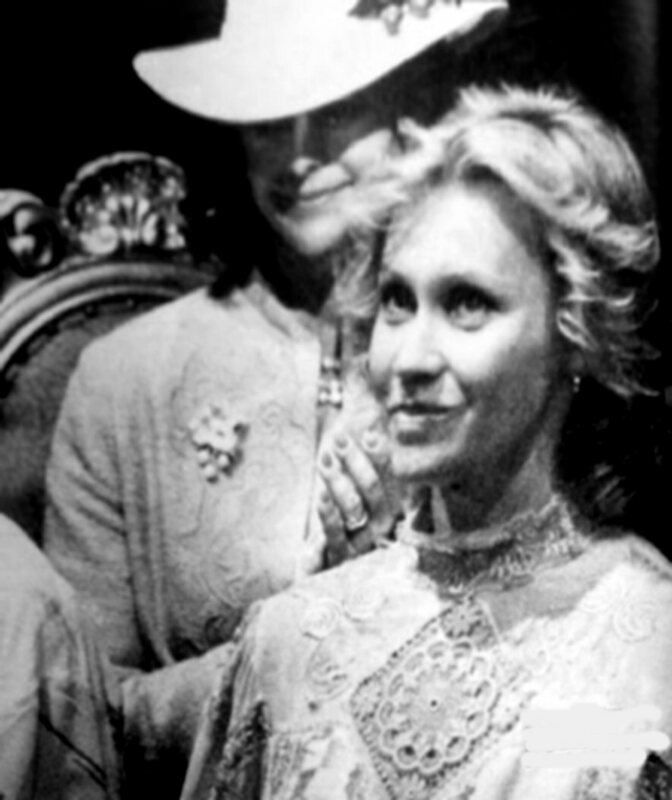 The audience did not notice that it was an accident. 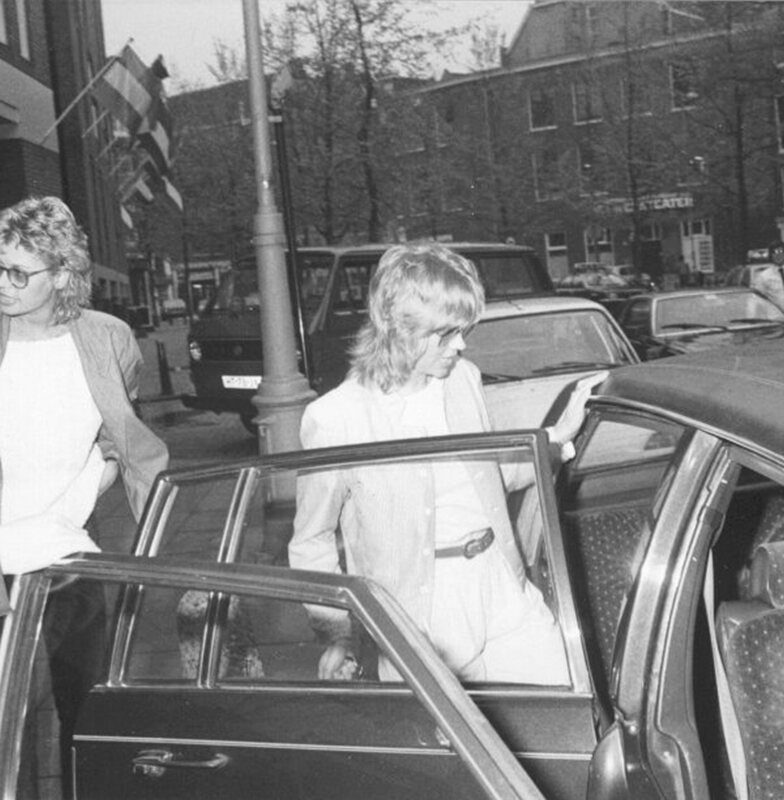 Everybody thought that such an entrance had been planned. 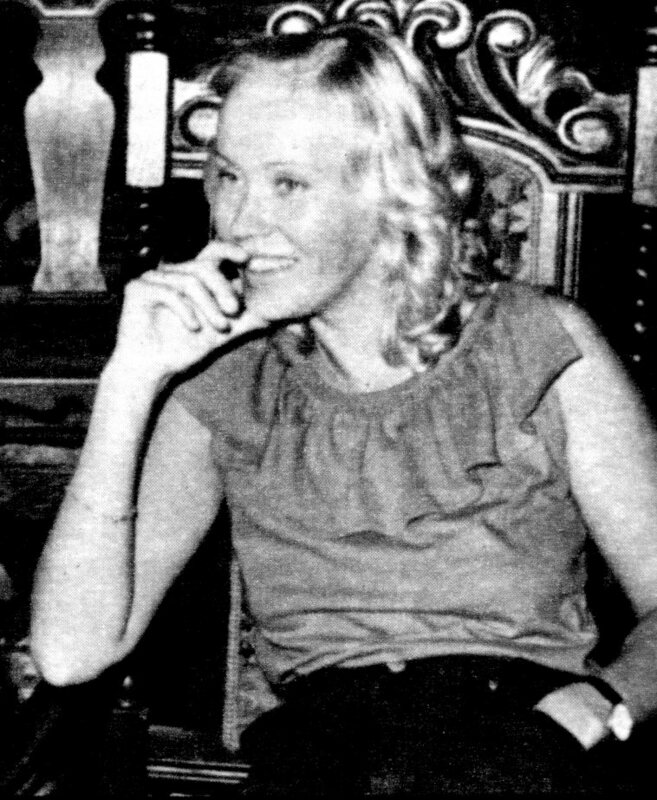 Agnetha injured her arm but nobody noticed that. 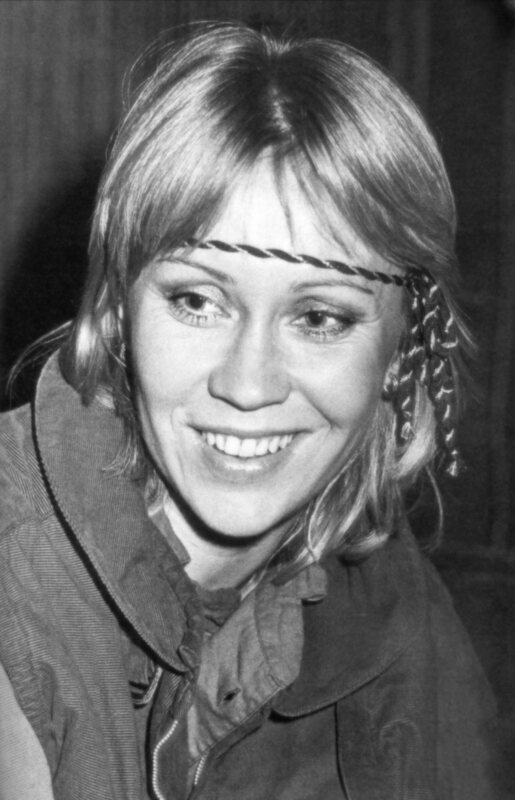 Agnetha said in many interviews that she did not like flying and she preferred travelling by train or bus. 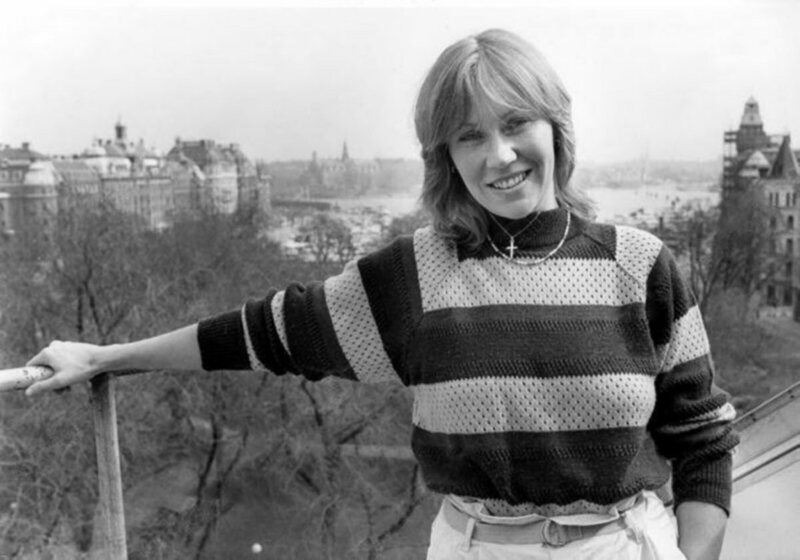 On 2 October 1983, whilst on the way from England she was involved in an accident in Sweden. 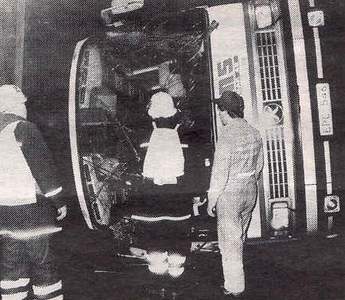 The driver of the bus lost control over the coach which led to overturn. 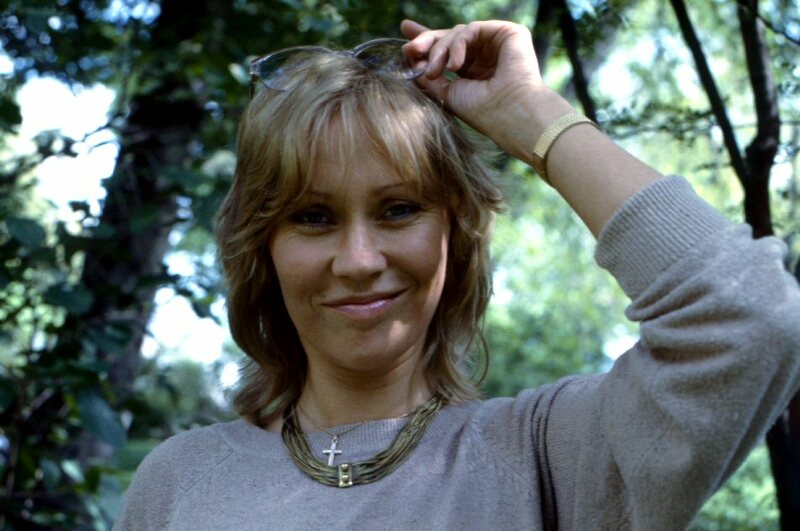 Nobody was injured seriously but Agnetha stayed that night at the hospital. 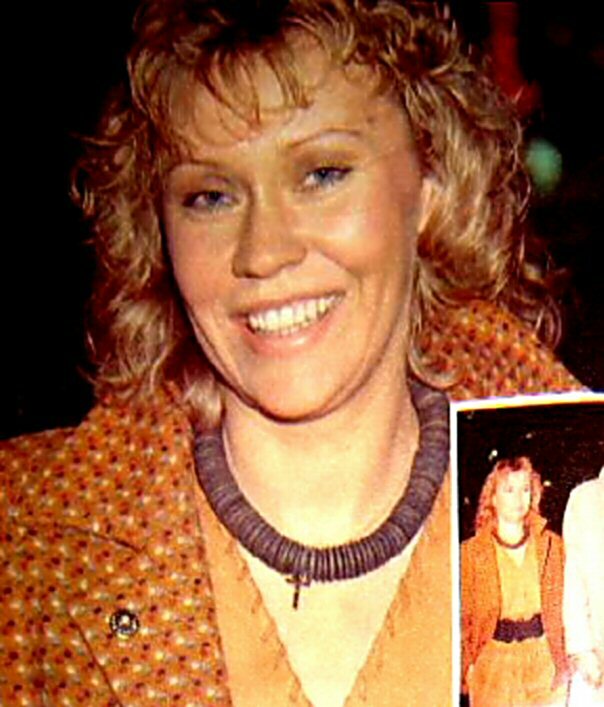 Two weeks after the accident Agnetha participated in the TV show "Mondagsbörsen" in October where she was interviewed by Jonas Hallgren. 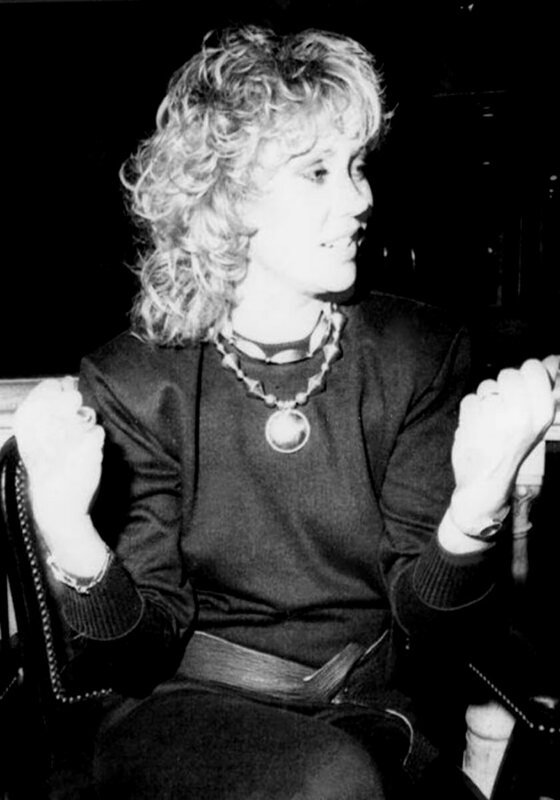 She was talking about gossip press and the accident. 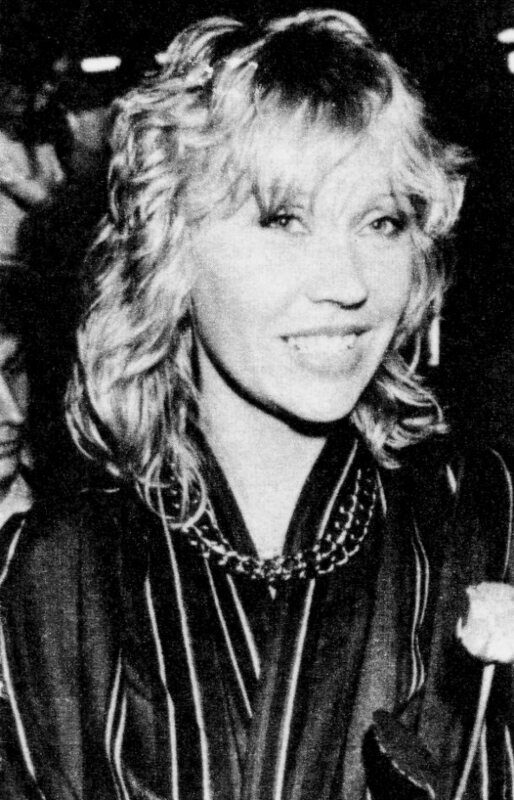 She did not feel good but she looked stunning. 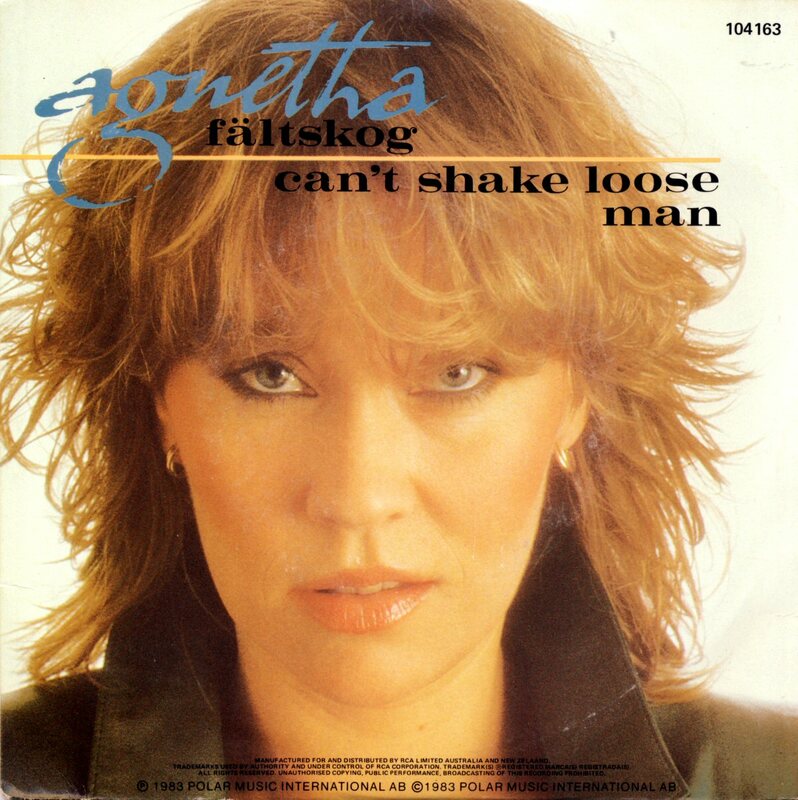 A new video "Can't Shake Loose" was presented for the first time in the Swedish TV. 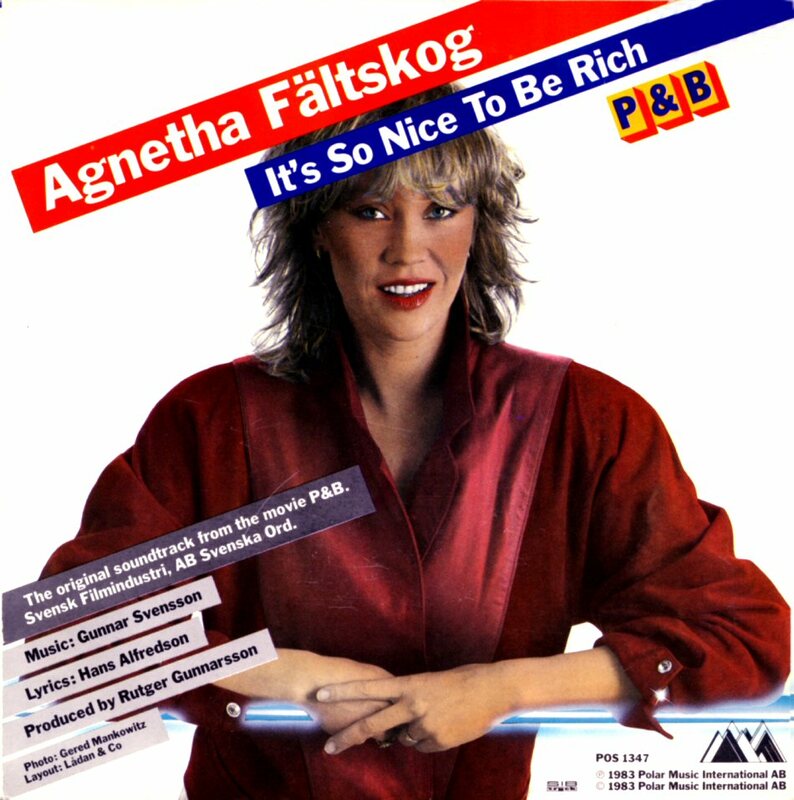 Agnetha recorded two songs for the Swedish movie "P & B": It's so nice to be rich" and the title track which were released on the single the same year. 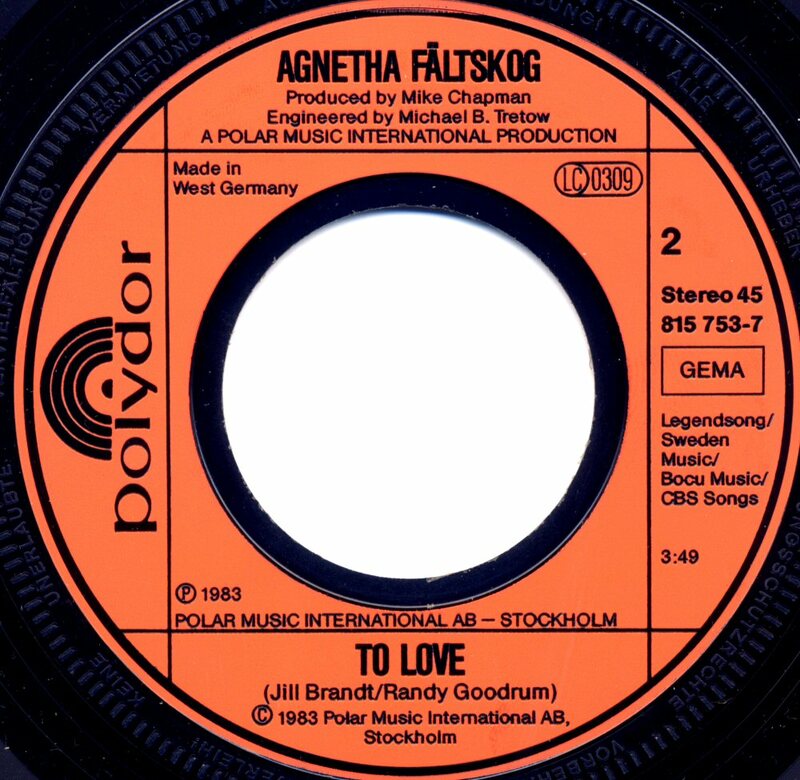 The single entered the Swedish chart in January 1984 and reached no 8. 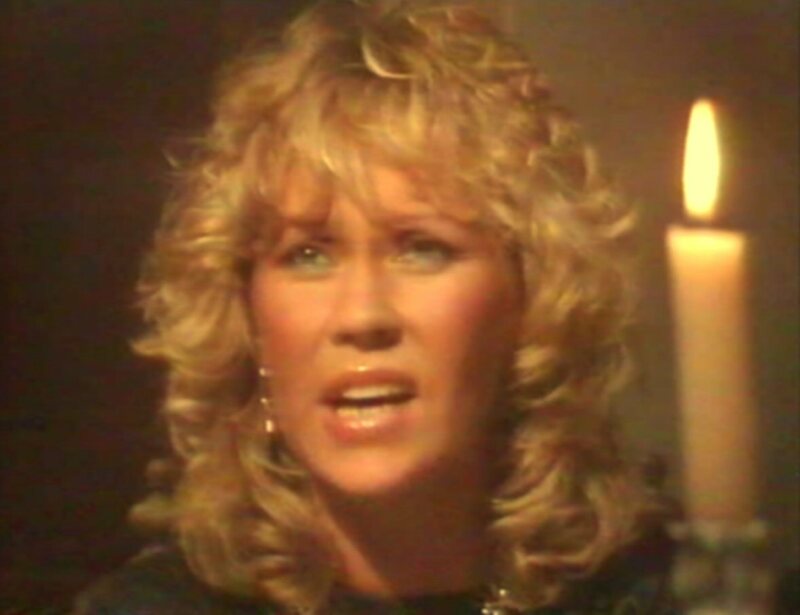 It was the only Agnetha chart appearance in Sweden in 1984. 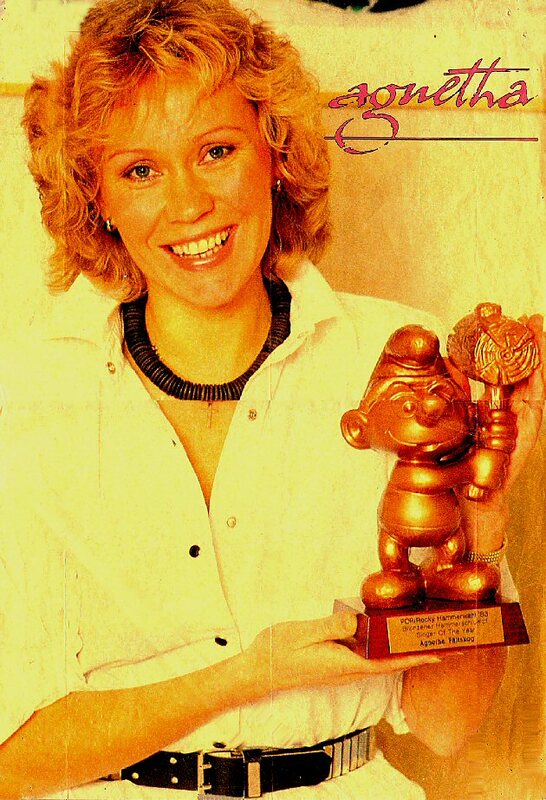 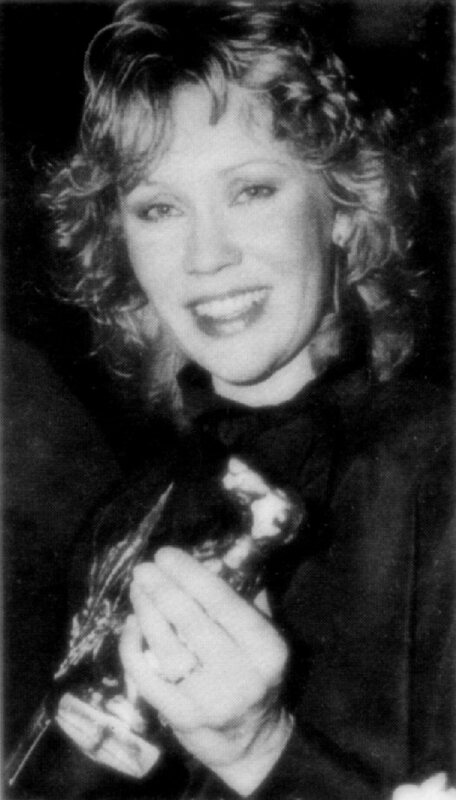 Agnetha was awarded with "Pop/Rocky/Hammerwahl" prize as the third female singer of the year 1983 in West Germany. 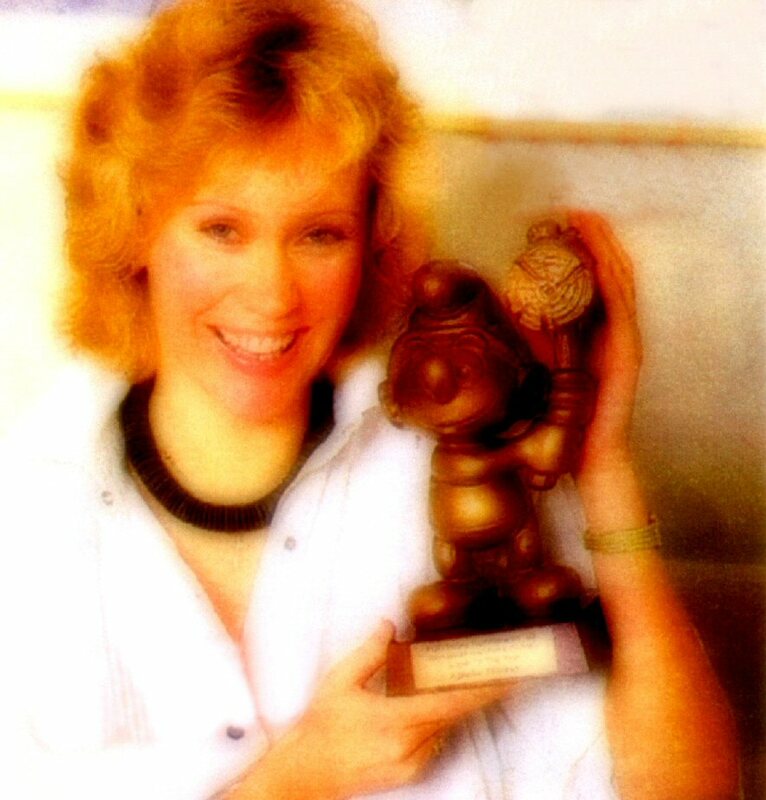 She received the bronze statue "Bronzener Hammerschlupf" at the end of the year in Stockholm and Anders Hanser took photos. 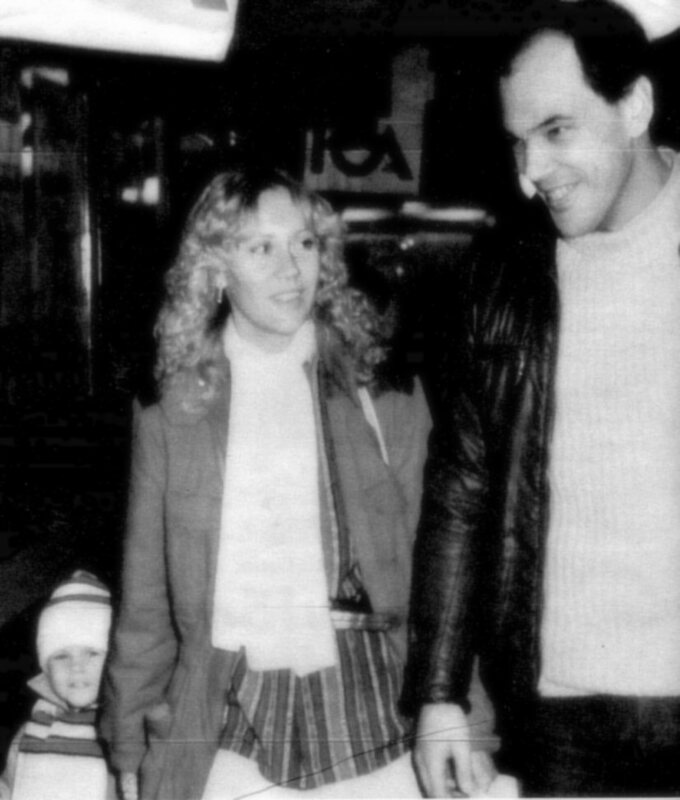 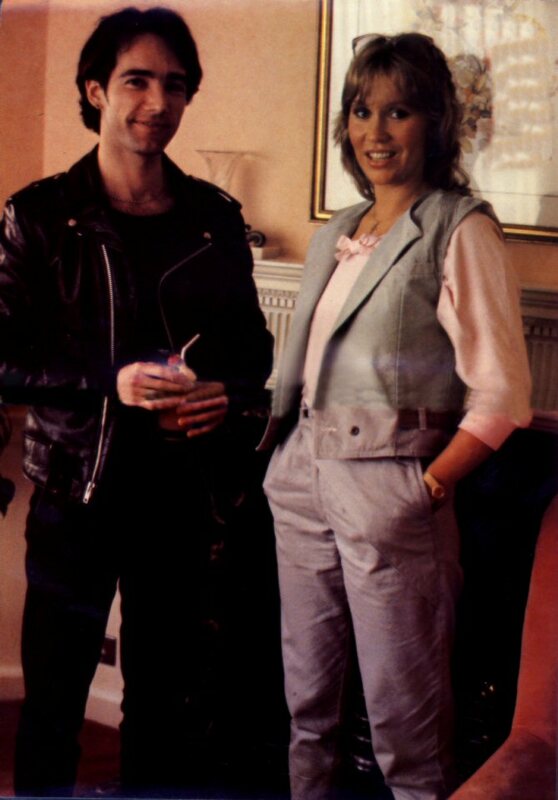 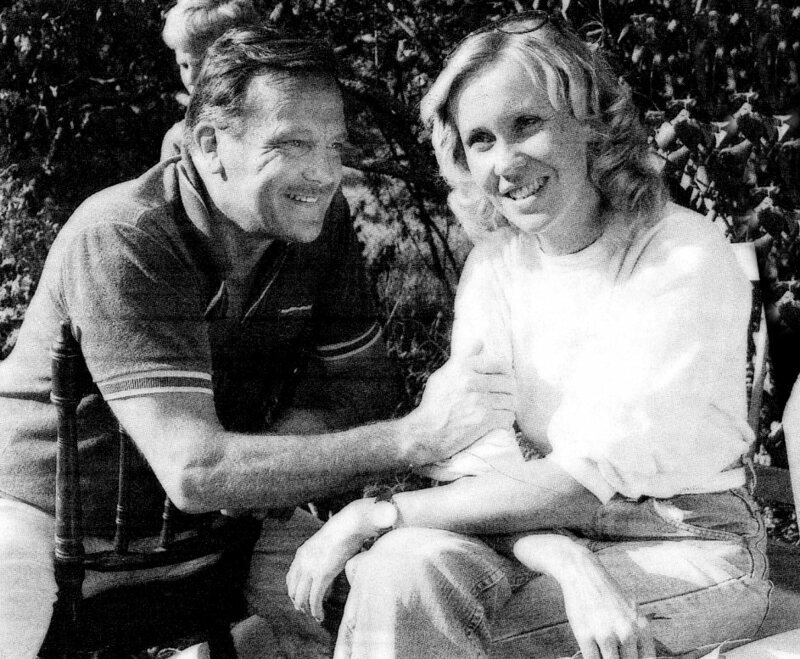 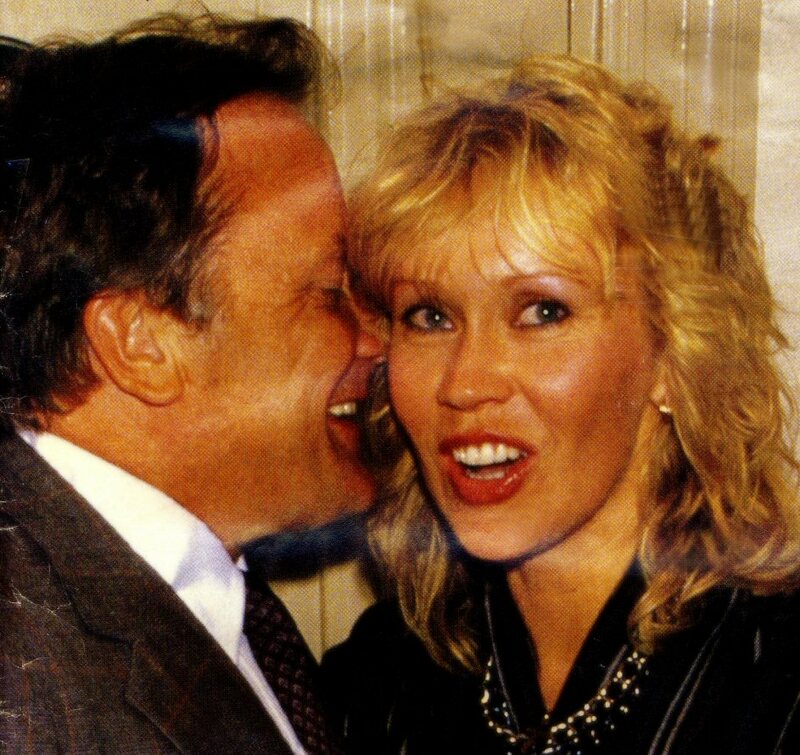 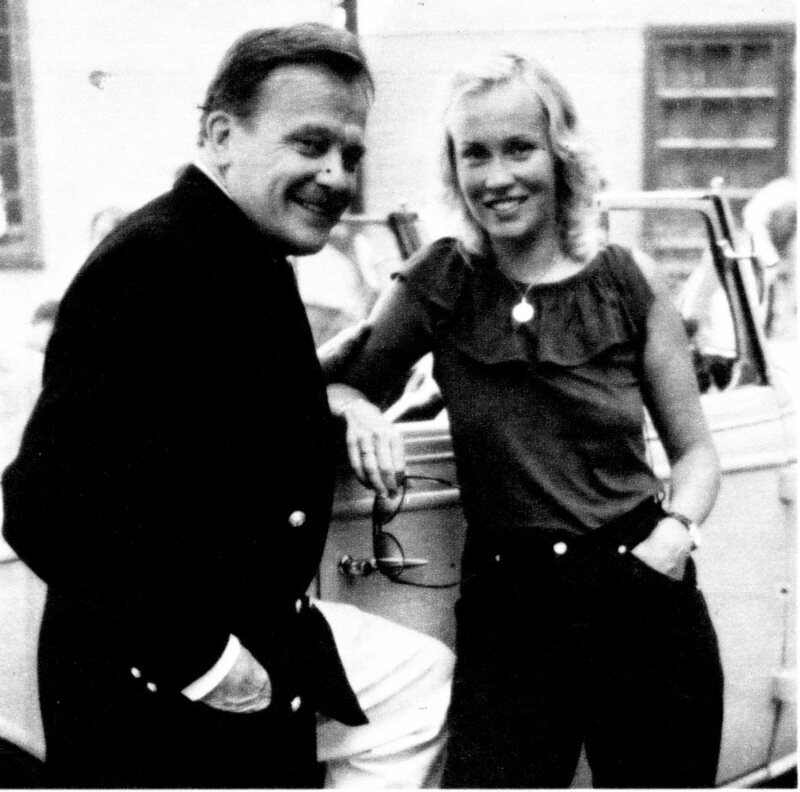 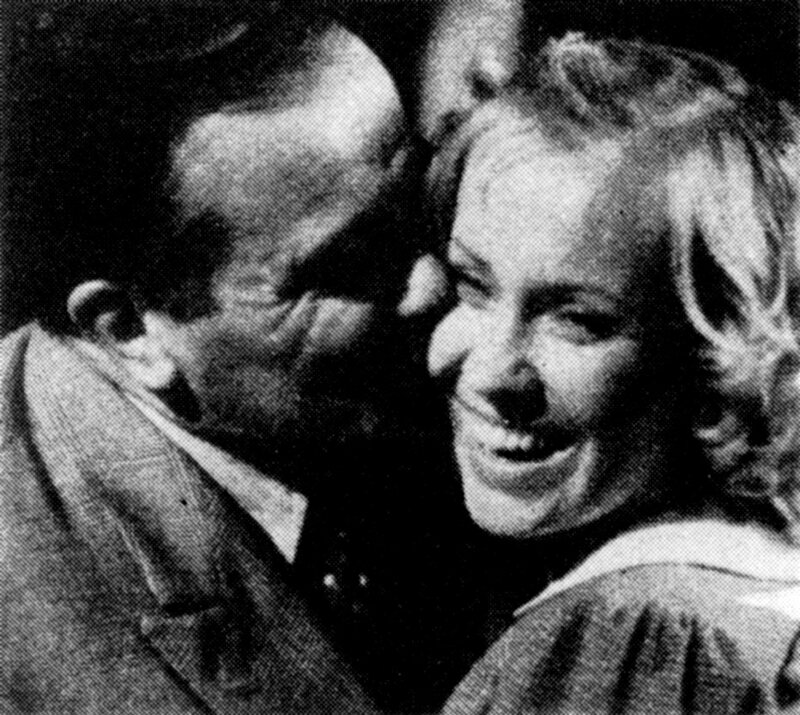 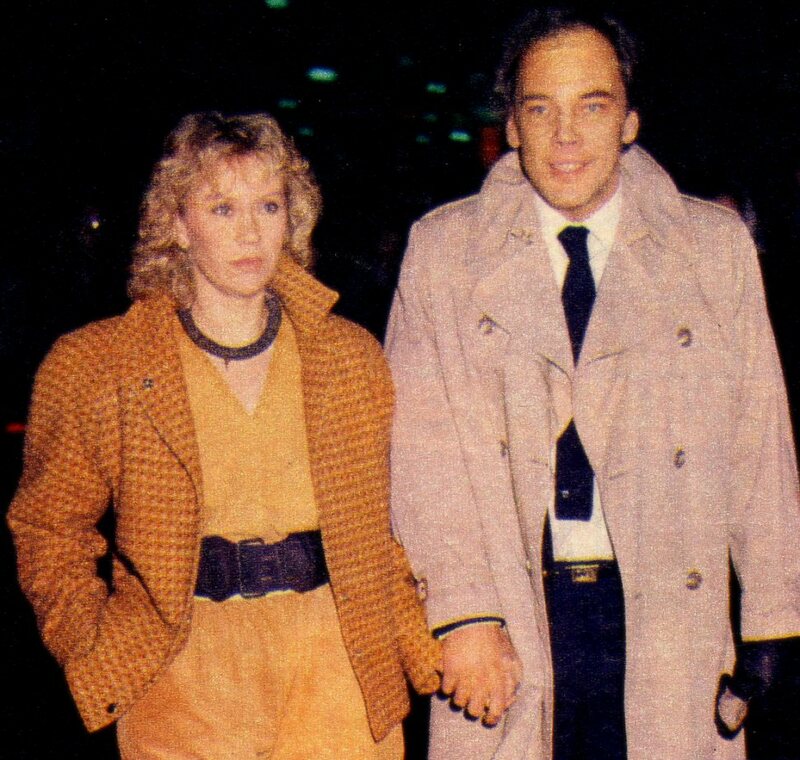 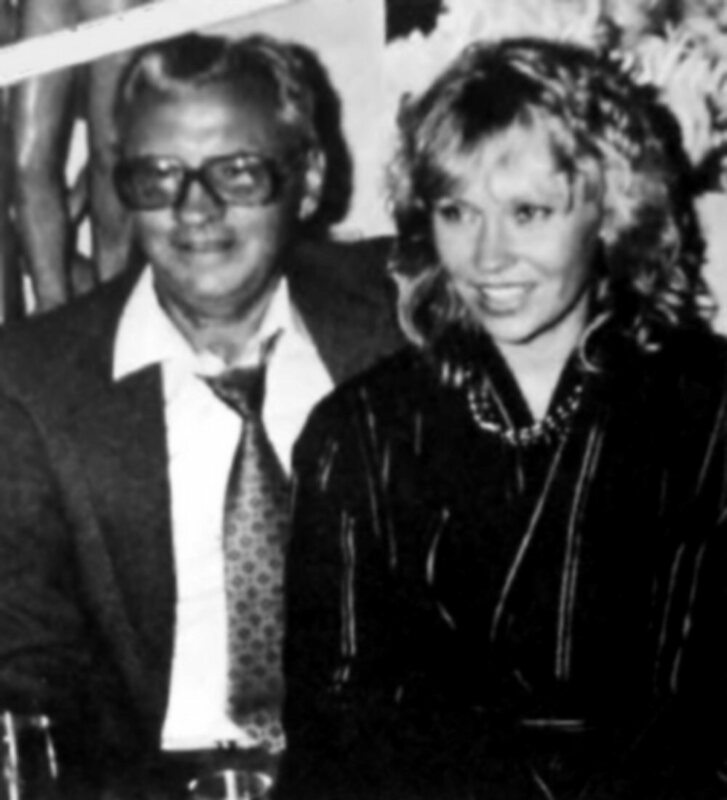 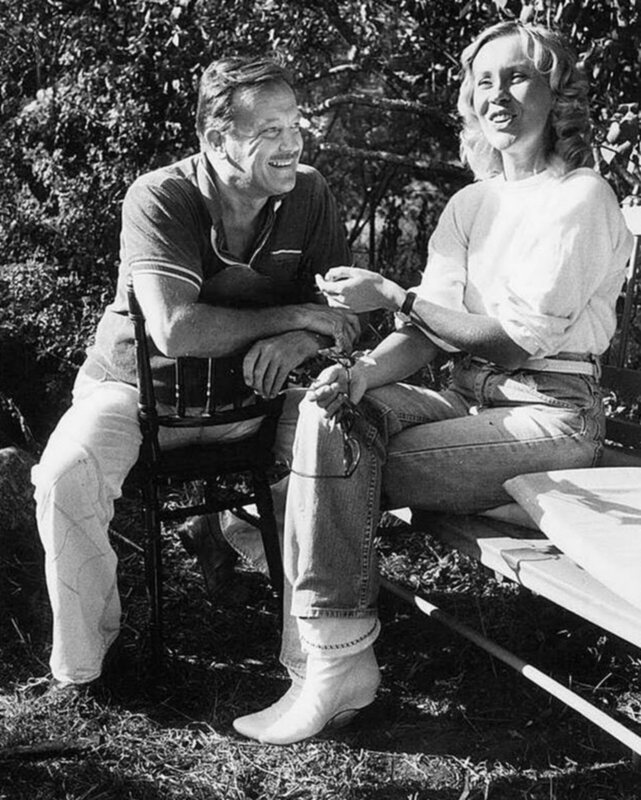 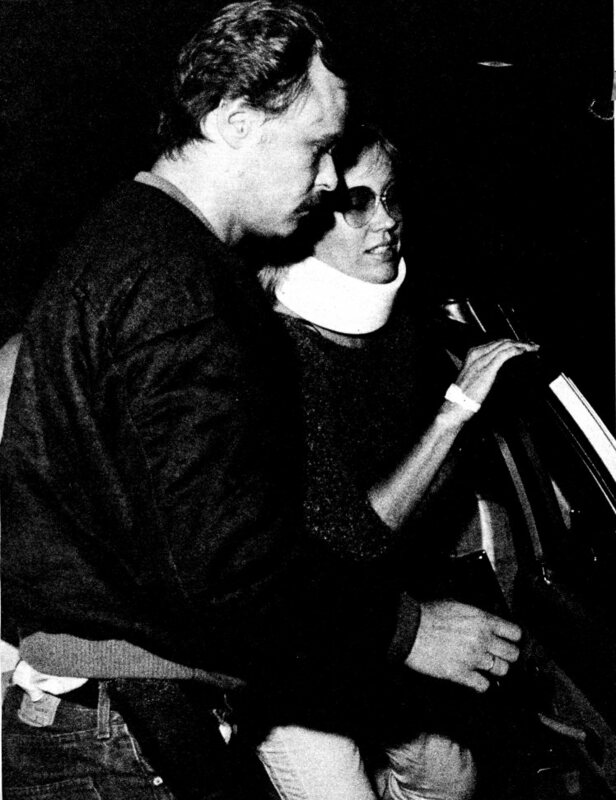 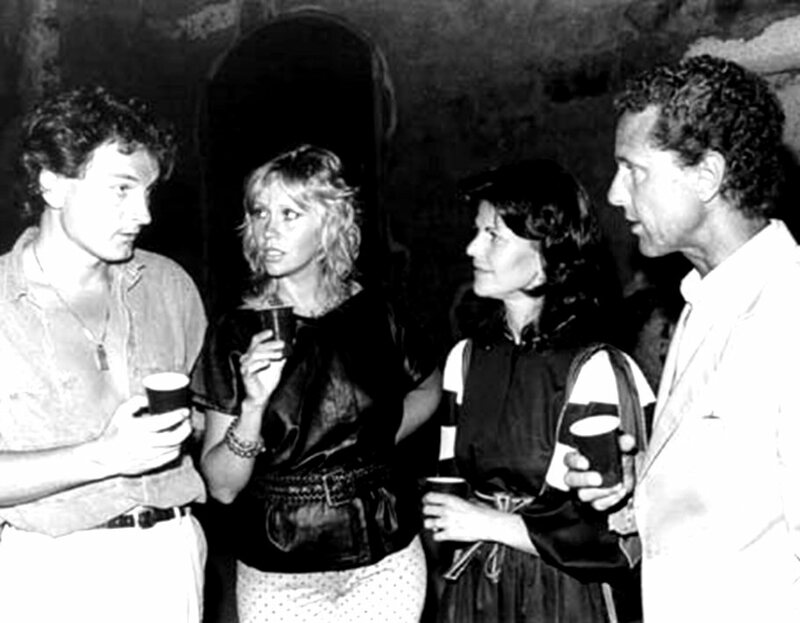 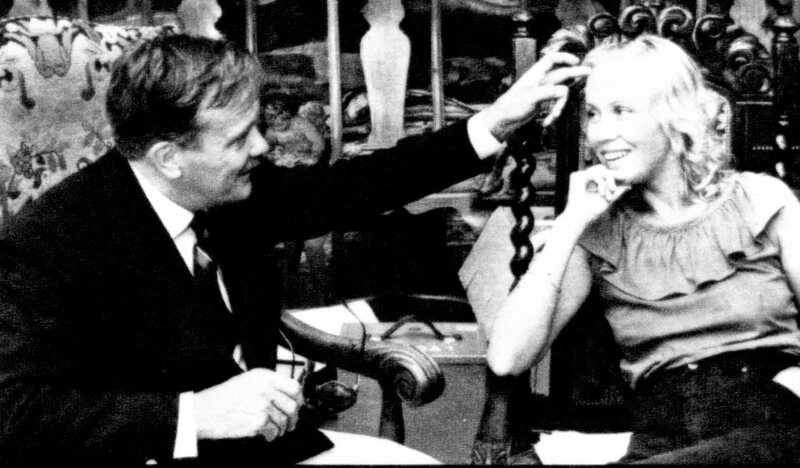 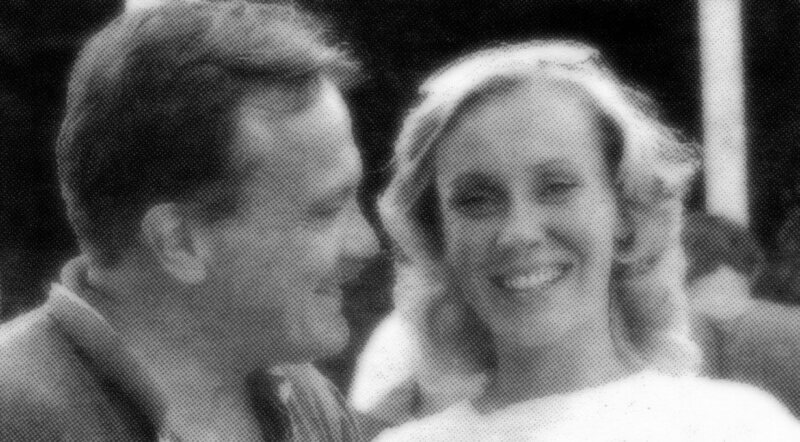 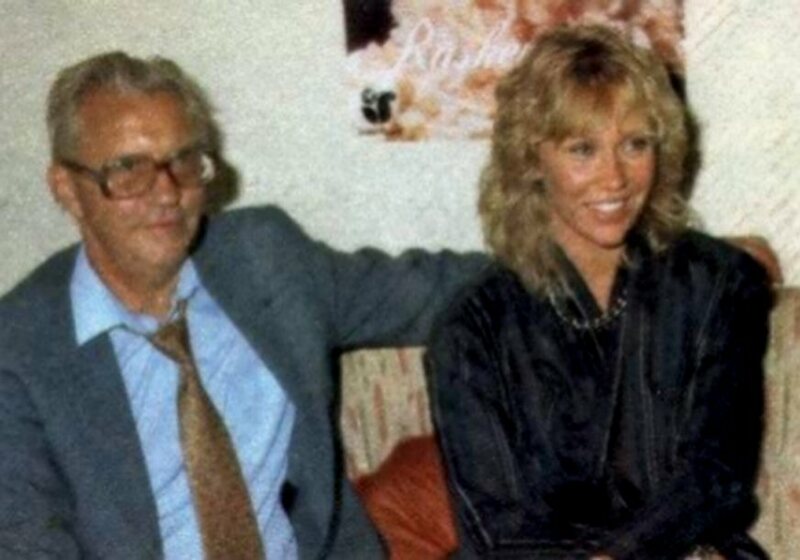 The crisis in the relationship between Agnetha and Torbjörn Brander seemed to be over in the autumn of 1983 and the couple could be seen together again followed by all Swedish newspapers. 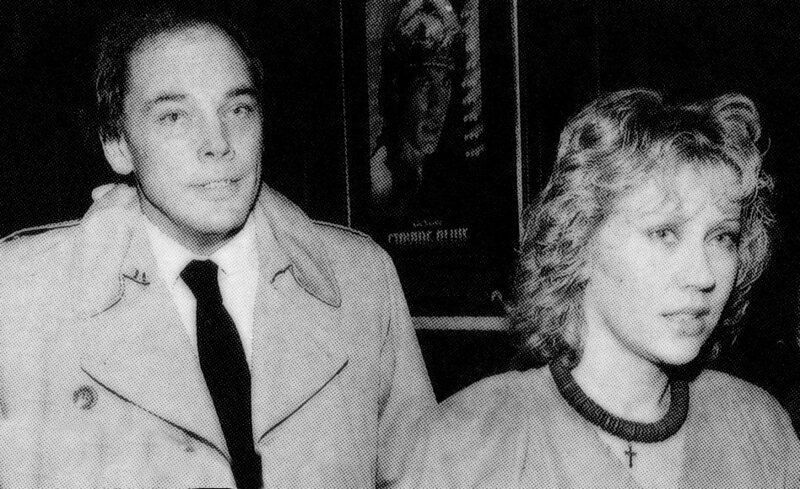 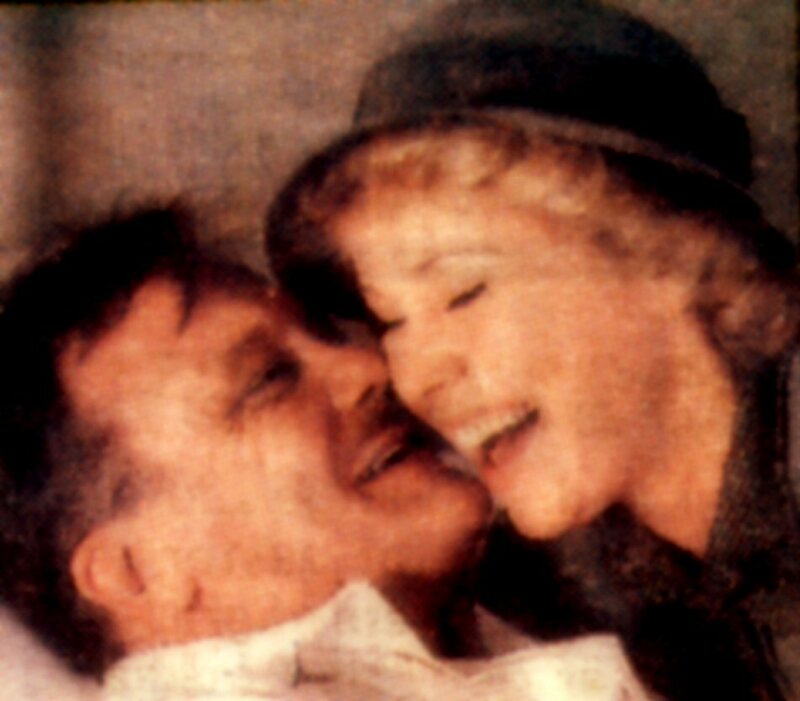 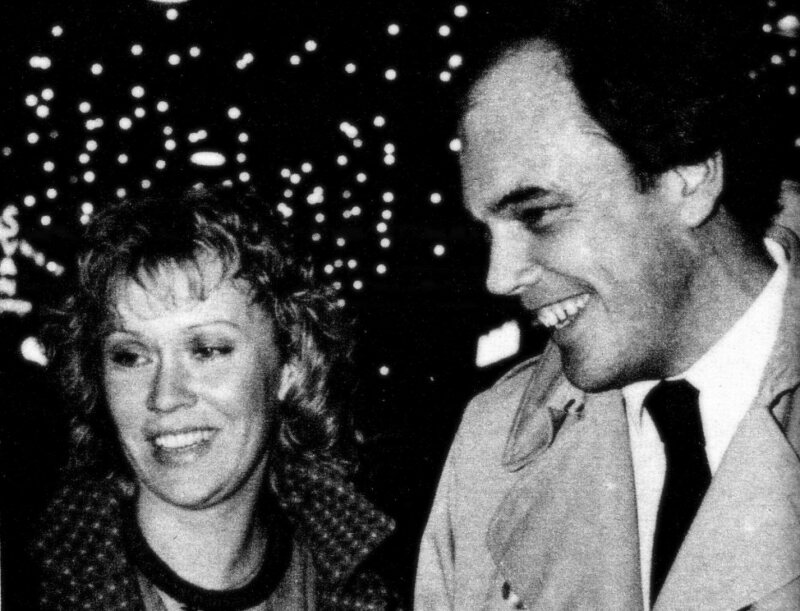 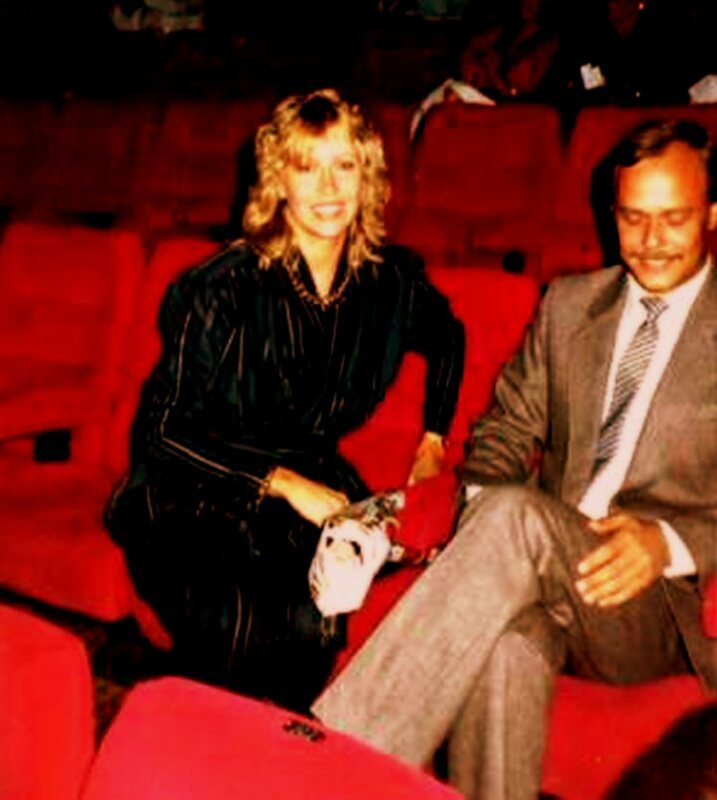 Agnetha and Torbjörn Brander attended the premiere of the Swedish movie "P & B" at the cinema "Röda kvarn" in Stockholm on 17 December 1983. 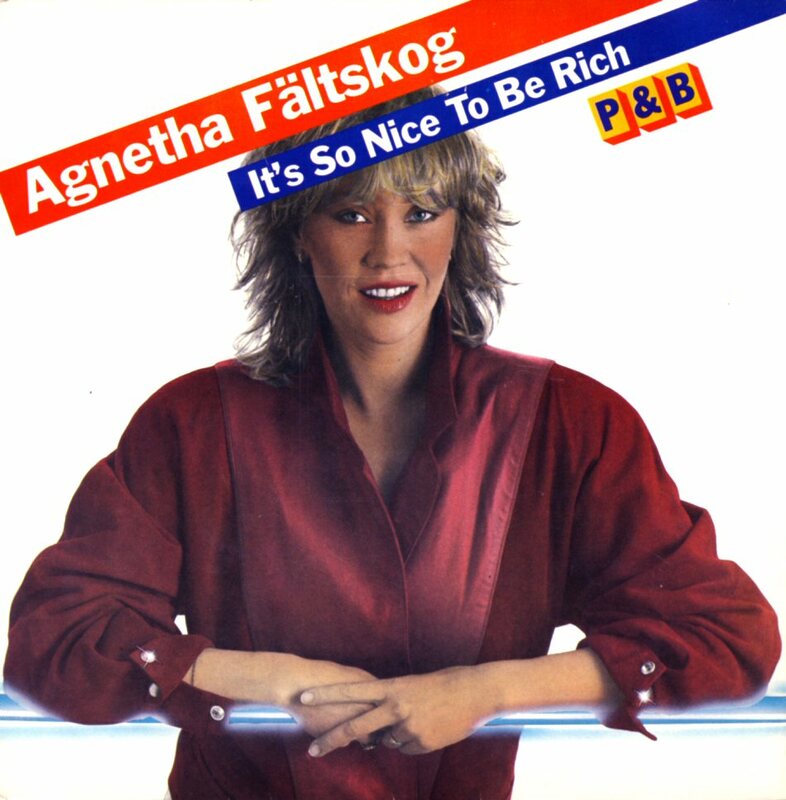 Agnetha performed two songs in the movie - the title track and "It's so Nice To Be Rich". 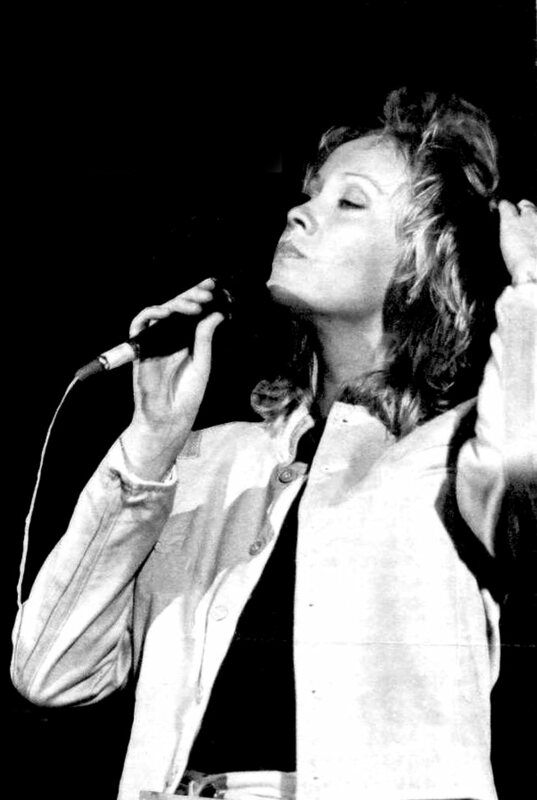 The single with both songs had been released earlier the same year. 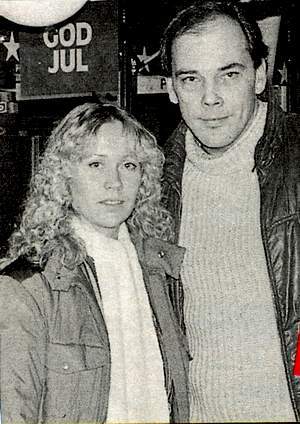 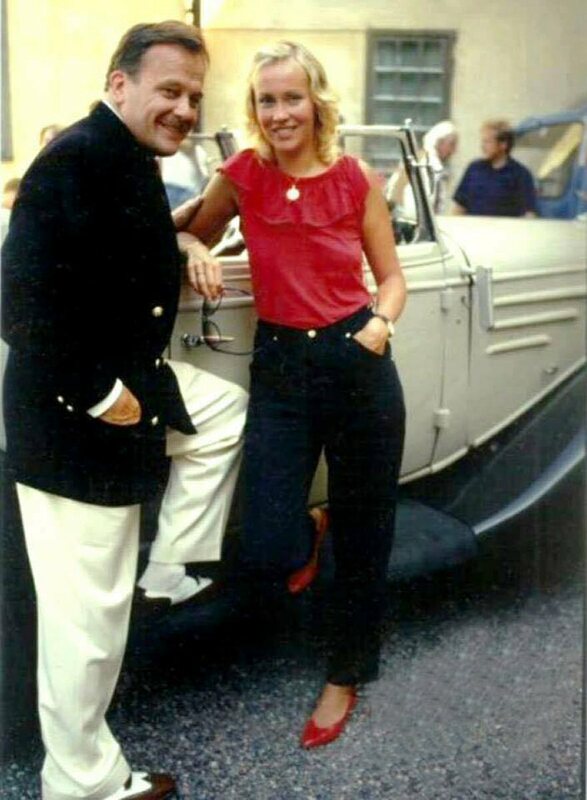 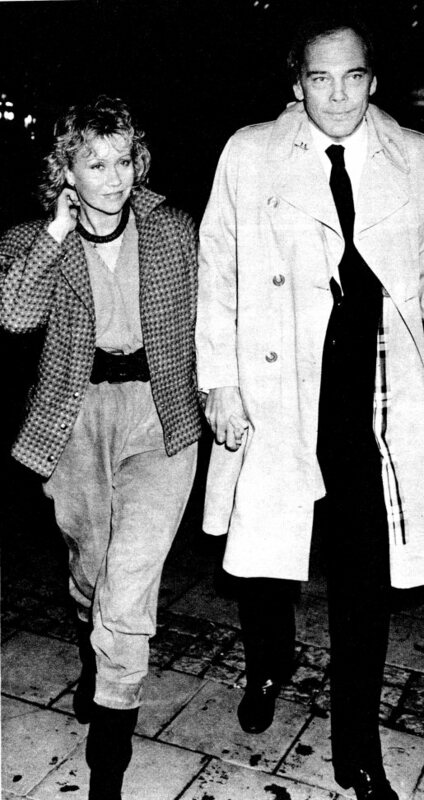 Photographers caught Agnetha and Torbjörn during Christmas shopping in December 1983. 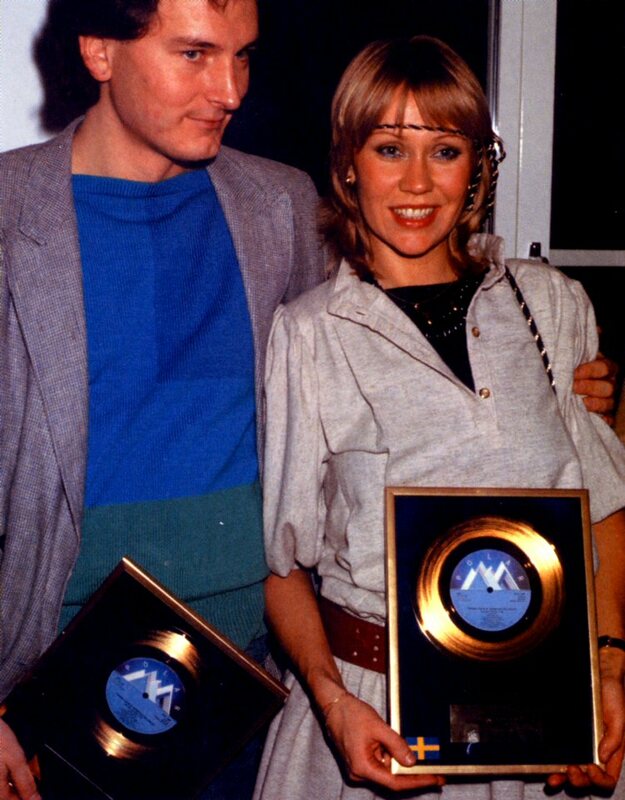 At the beginning of 1984 Agnetha was awarded Rockbjörn as the best Swedish female artist in 1983. 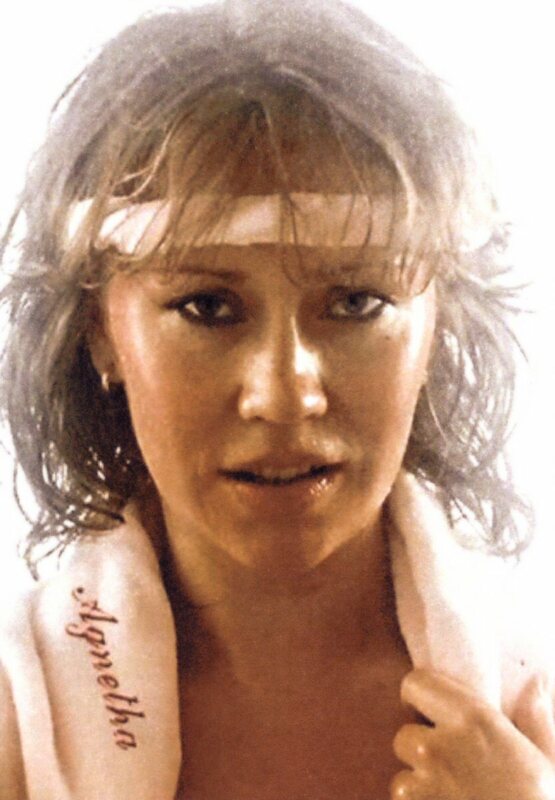 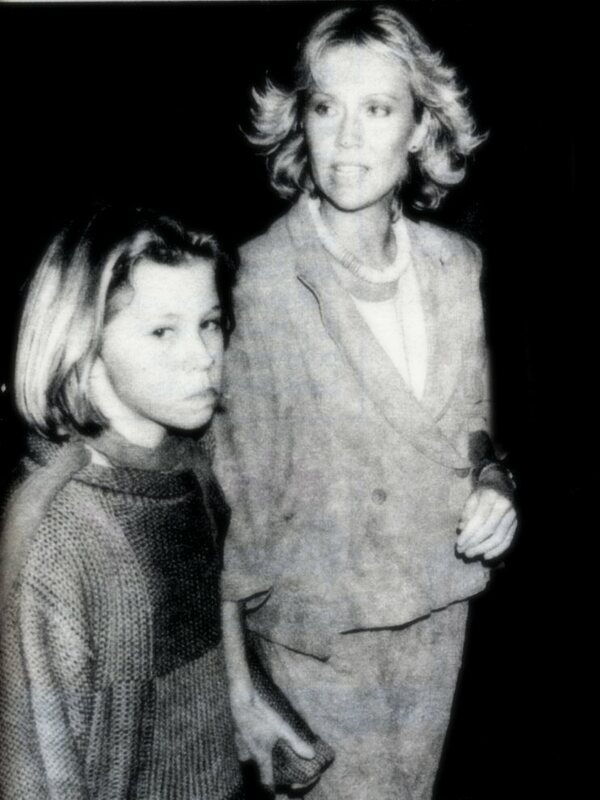 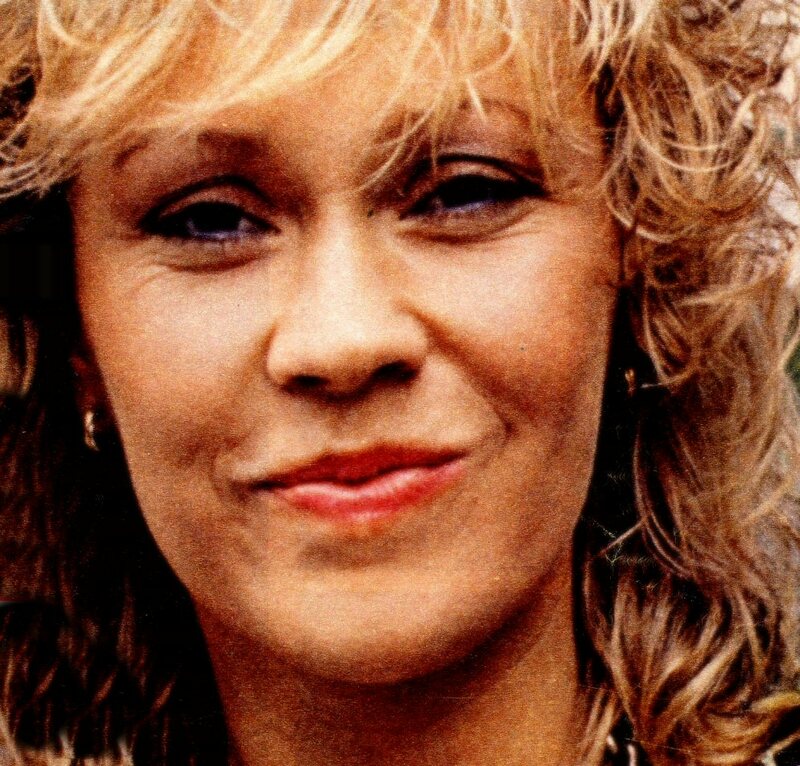 After the busy year of 1983 Agnetha disappeared from the public eye during the first months of 1984. 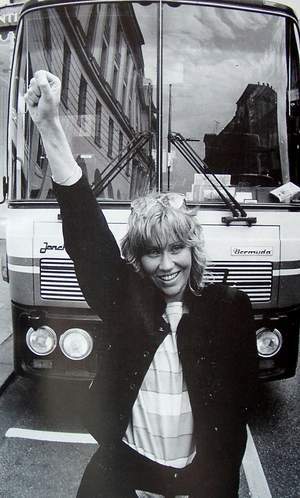 But in May she was back in business when her hometown Jönköping celebrated the 700th anniversary. 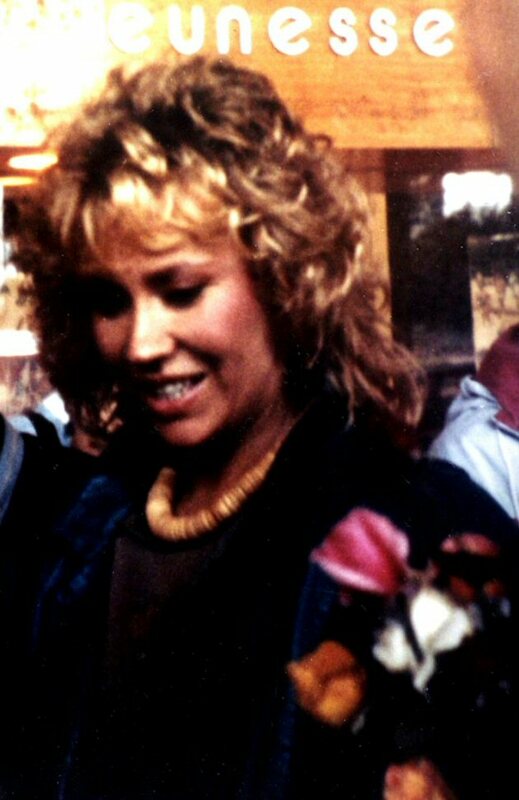 She participated in the big gala "Jönköpingsyra 84". 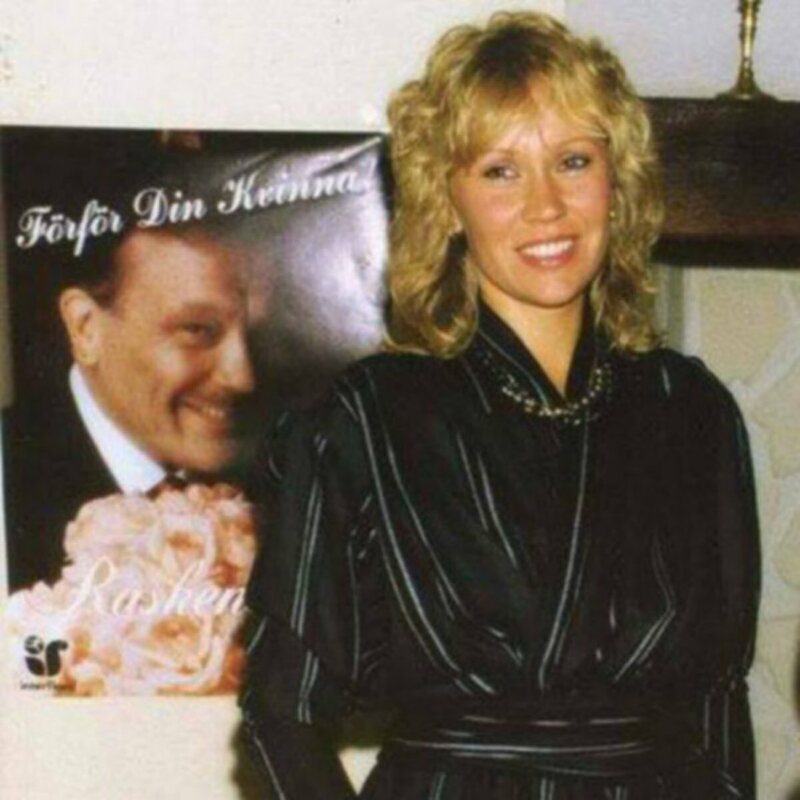 She even recorded a new song for this purpose: "Följ med i min ballong" and a video. 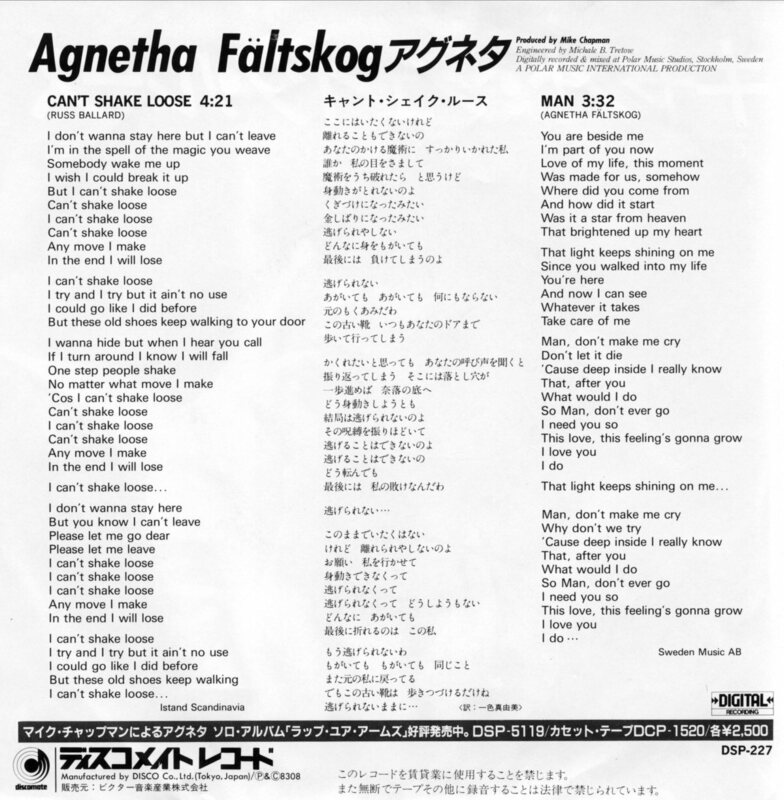 The song still remains unreleased on any Agnetha album or single. 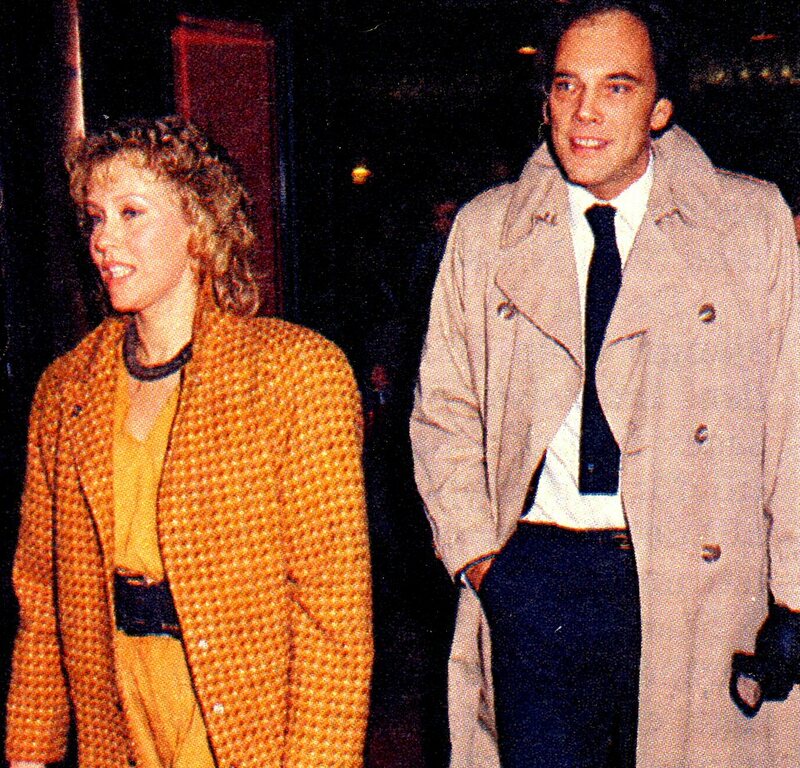 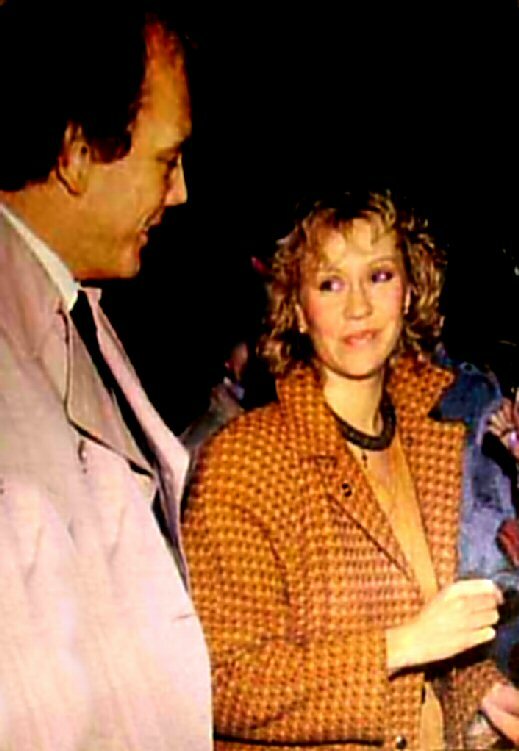 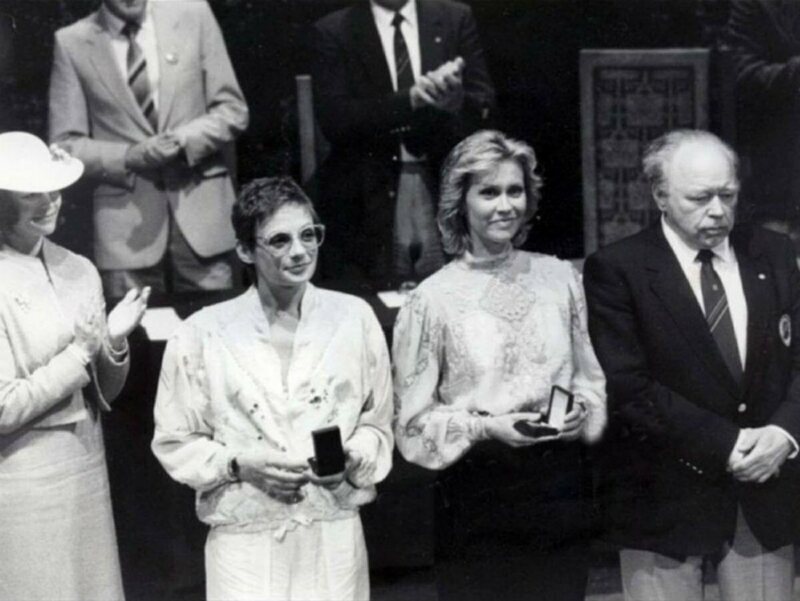 Agnetha together with Linda and Christian attended the Swedish premiere of "Chess in concert" in Stockholm on 1 November 1984.